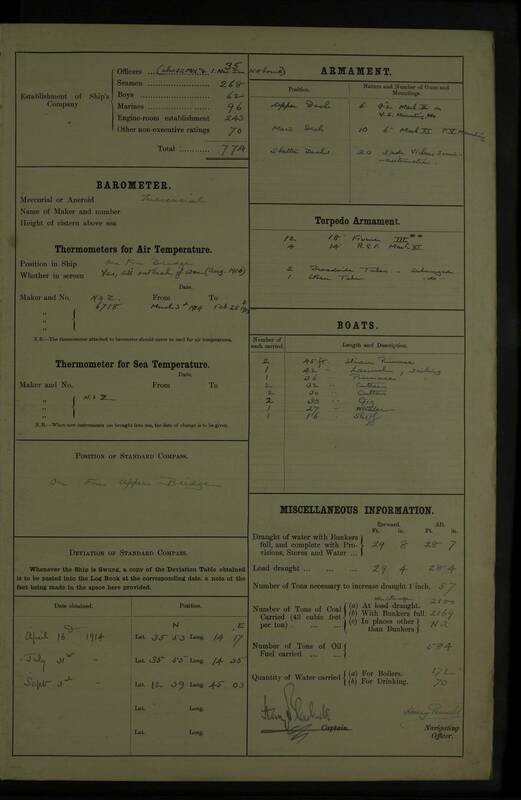 Thermometers for sea temperature: N. & Z. 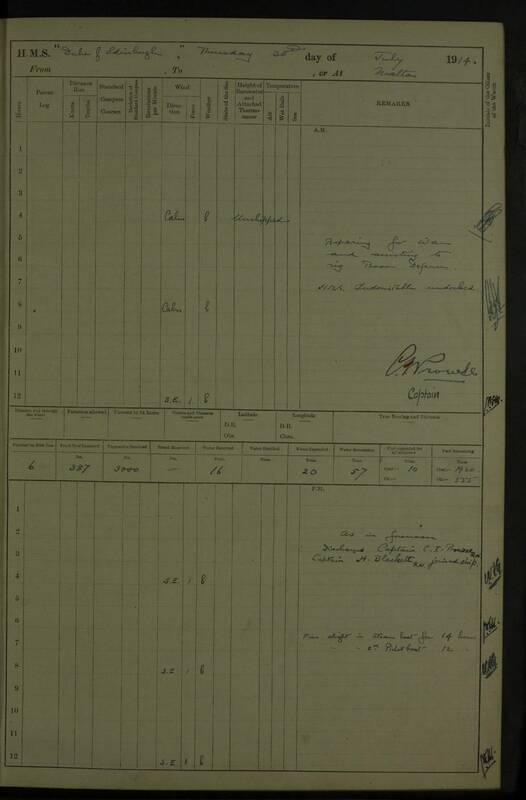 9.00 am: Captain Cecil I. Prowse R.N commissioned DUKE OF EDINBURGH. 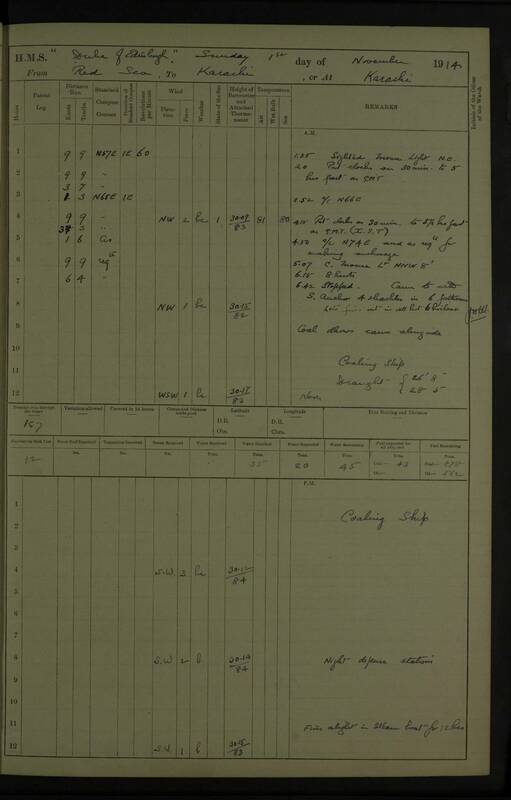 10.00 am: Commander in Chief inspected ship. 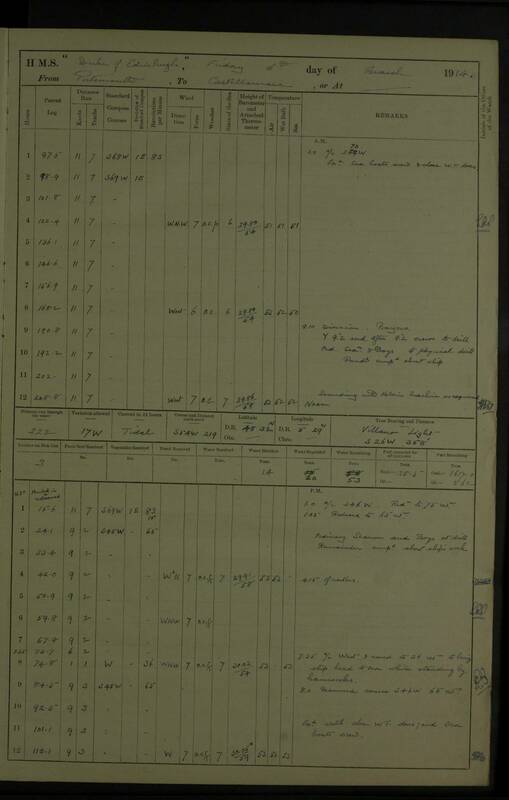 4.00 pm: Pilot embarked; Slipped and proceeded out of harbour; 4.55 pm: Stopped. 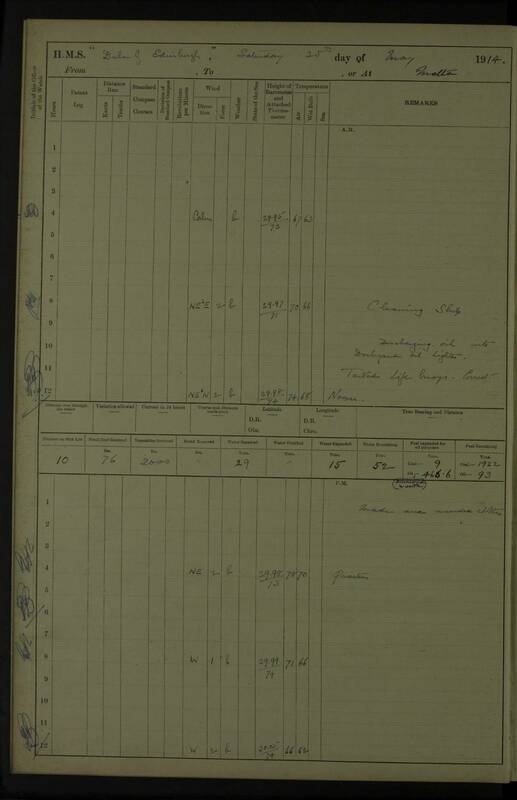 Dropped Pilot; 4.57 pm: proceeding to Nab Light Ship. 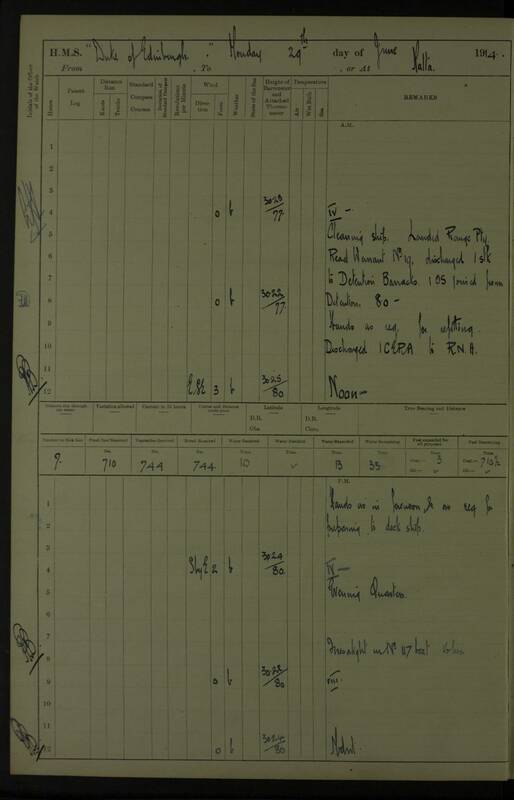 7.14 am: Secured alongside South mole abreast No 4 shed. 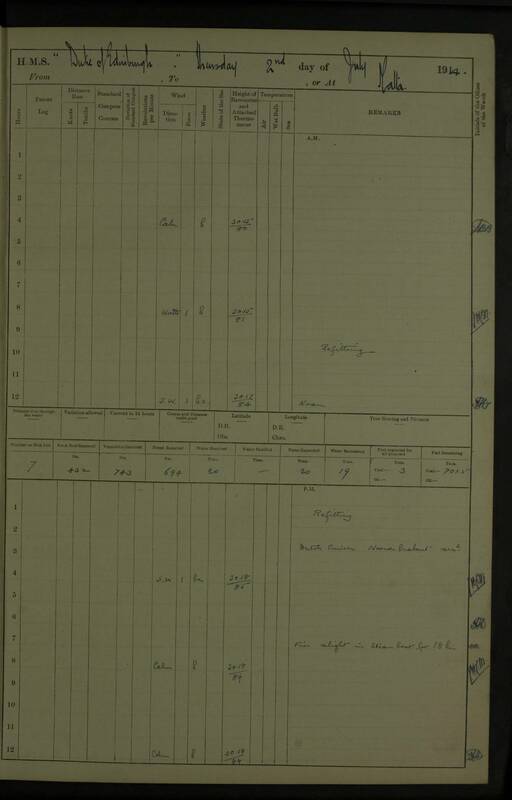 8.45 am: S.S. BOSCASTLE, collier, came alongside. 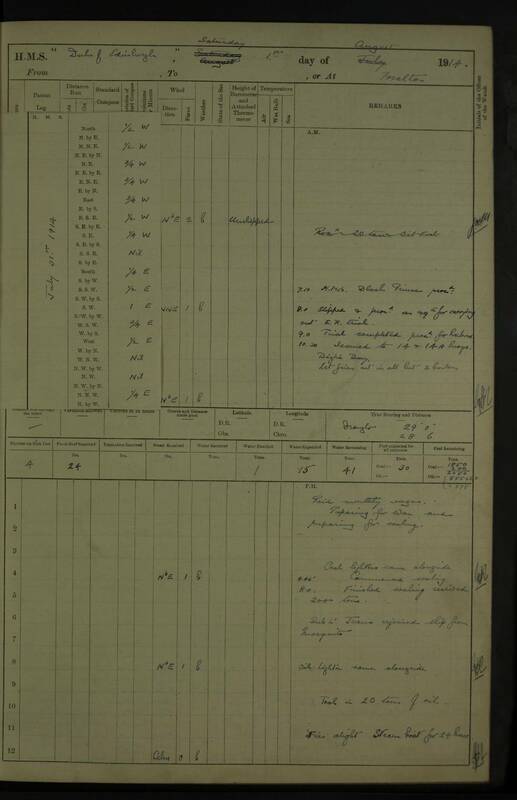 am: Discharged ratings for LORD NELSON, AGAMEMNON, CORMORANT, AJAX, and CONQUEROR. 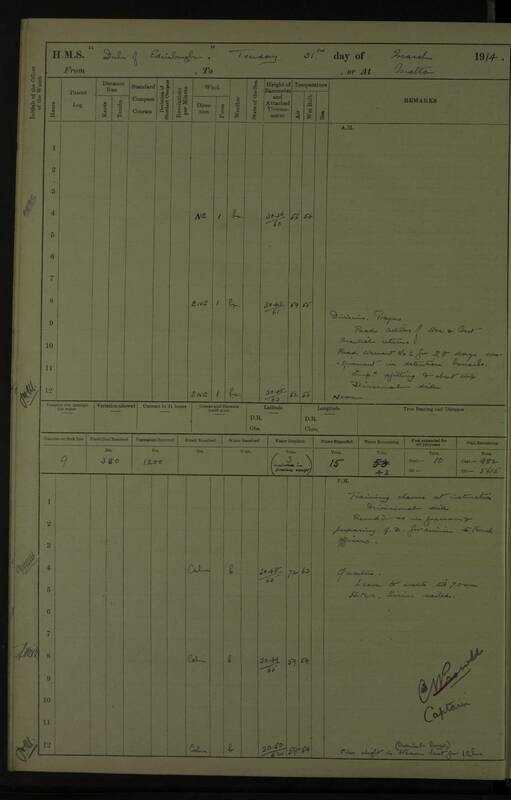 6.15 pm: Completed with coal and received 850 gallons, lubricating oil. 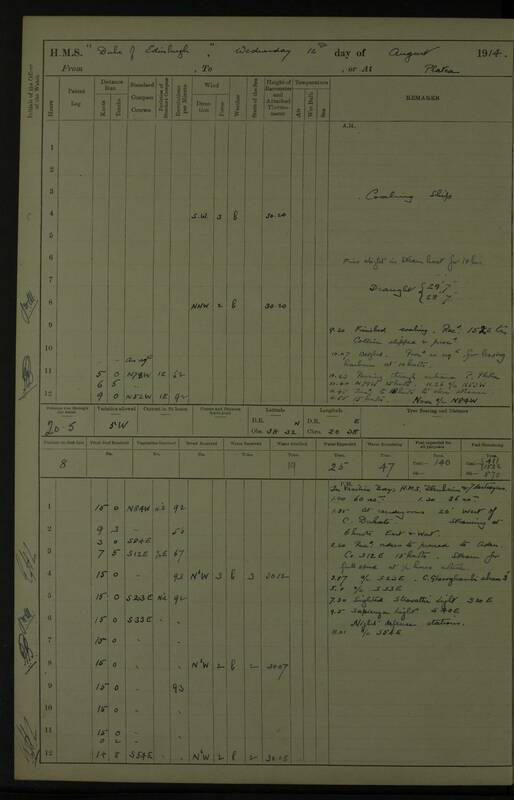 6.30 pm: Collier shipped & proceeded. 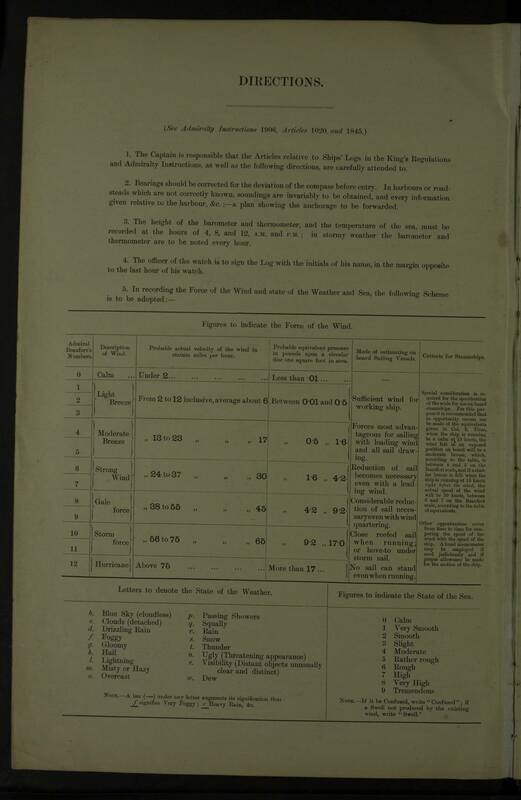 10.15 am: Proceeded for rounding Europa Point and proceeding to Castellamare. 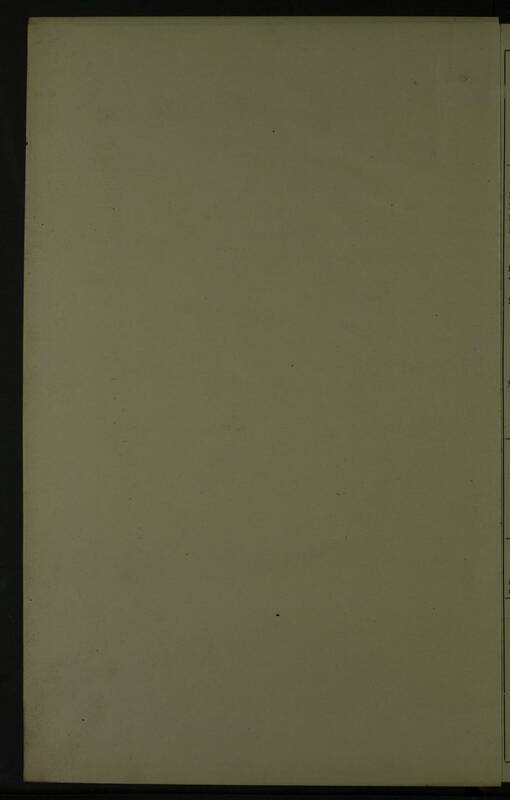 11.45 am: Connected up fore bridge steering gear. 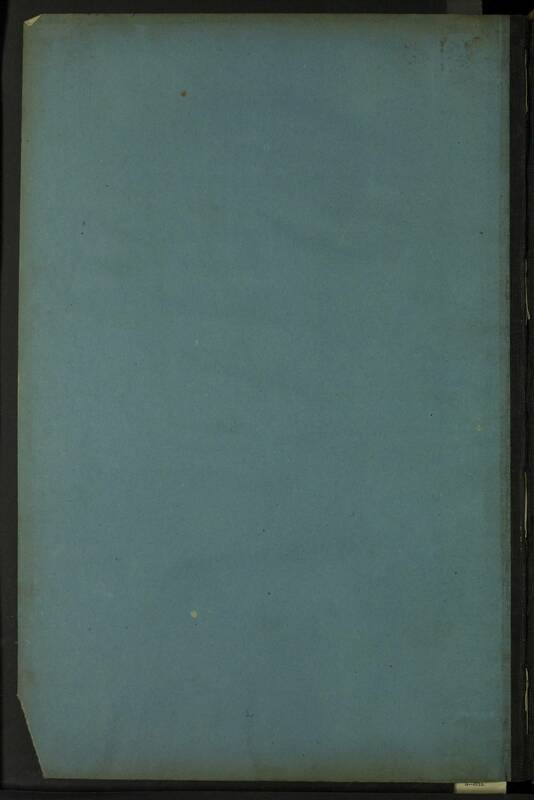 Steering from fore bridge position. 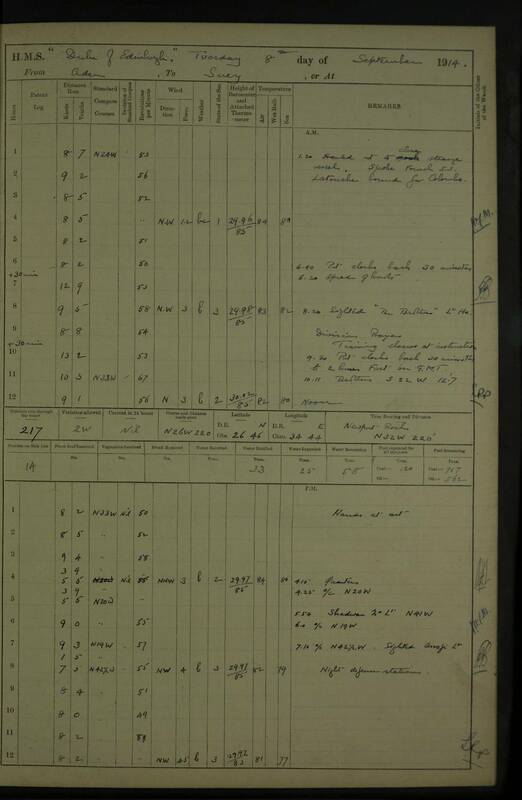 pm: Discharged ratings for ships of the 1st Cruiser Squadron. 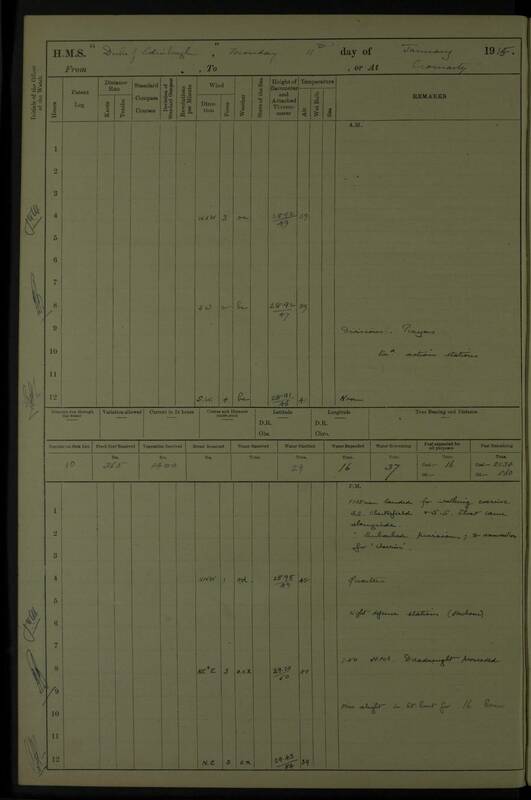 10.20 am H.M. T.B.D SCOURGE arrived from Naples. 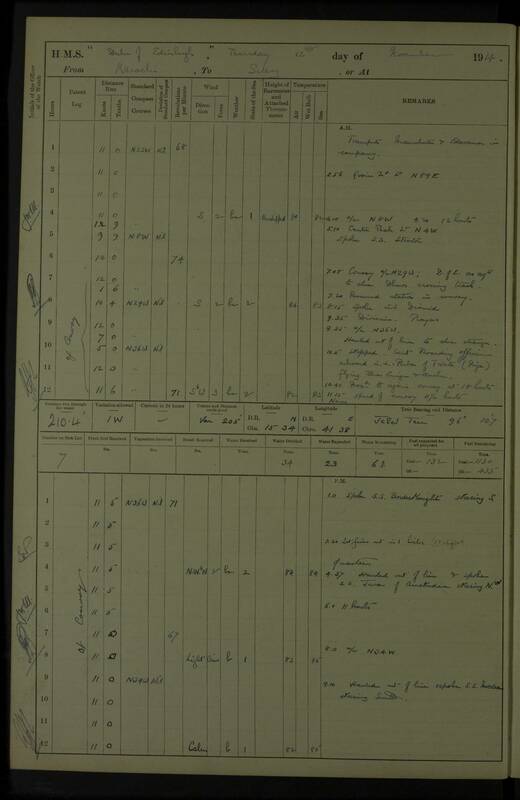 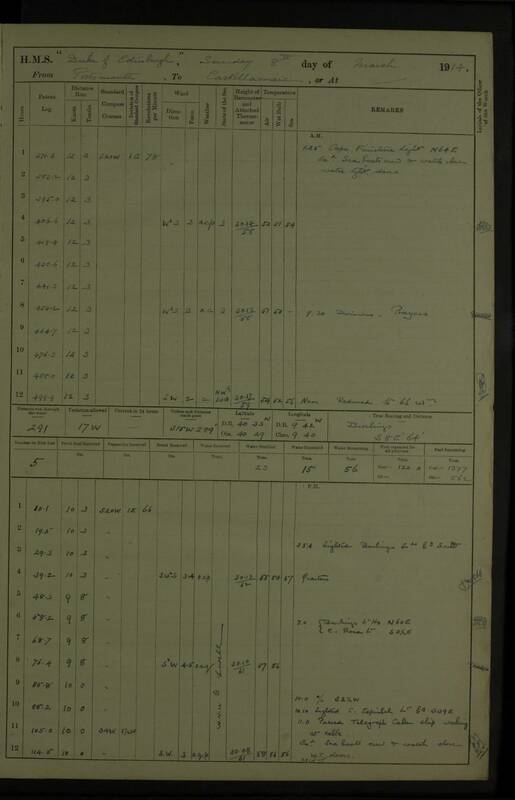 Discharged personnel (Messr’s Bullen, Privett, Barnes, Bullimore, Branden, (Presume these are Artificer Engineers Frank Bullen to INFLEXIBLE, George Privett to GLOUCESTER, William Barnes to INFLEXIBLE, Harold Bullimore to INDEFATIGABLE, and Branden (not identified in NAVY LIST) and 47 ratings) for the Fleet to SCOURGE for passage to ships at Naples. 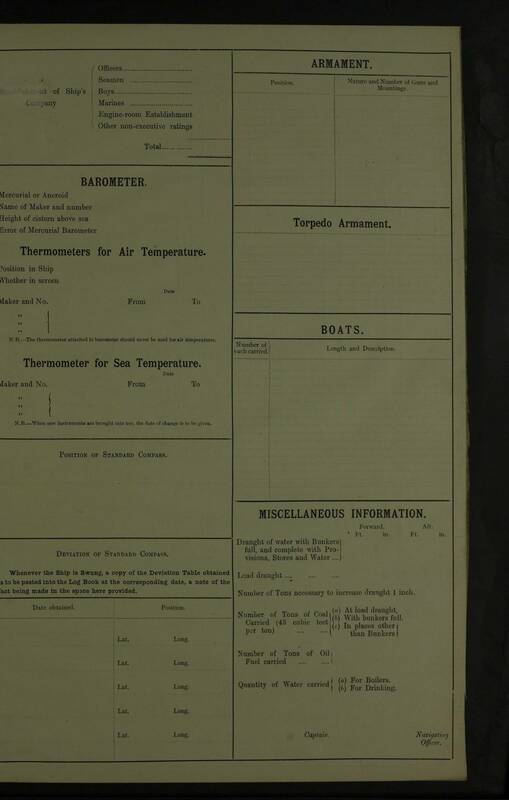 Other: Fires alight in steam boat for 19 hrs. 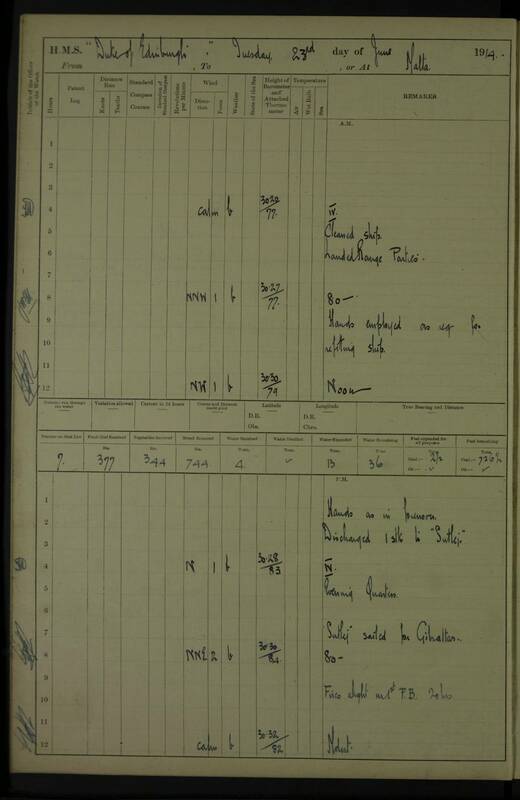 5.00 am: DUKE OF EDINBURGH remained in offing; remainder of squadron closed harbour to pick up their steam boats. 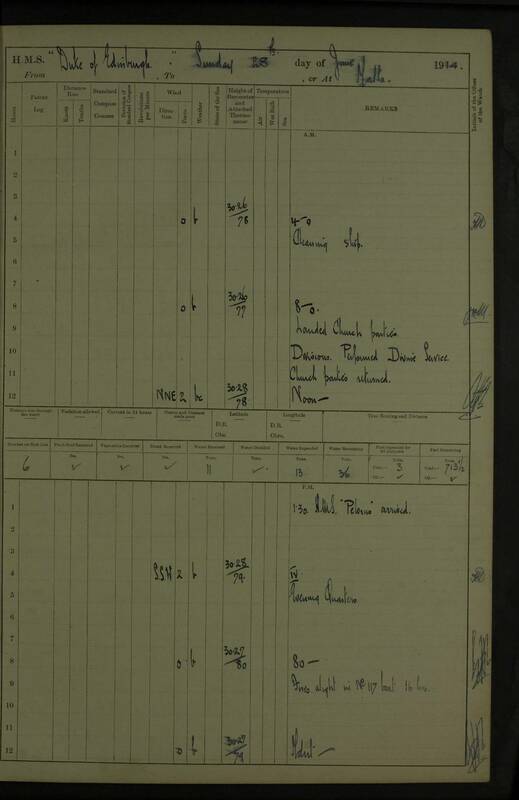 6.50 am: squadron proceeding closing DEFENCE and taking station in line. 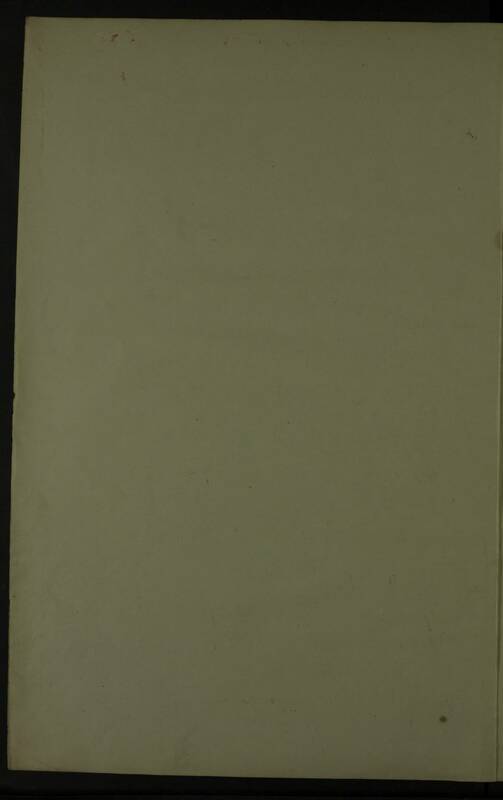 7.20 am: Single line ahead in close order. 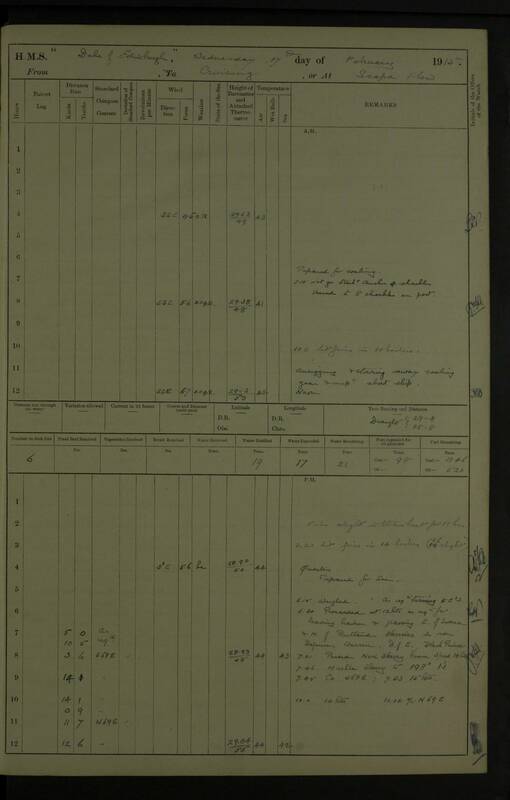 Closing Battle Cruisers coming out of Naples. 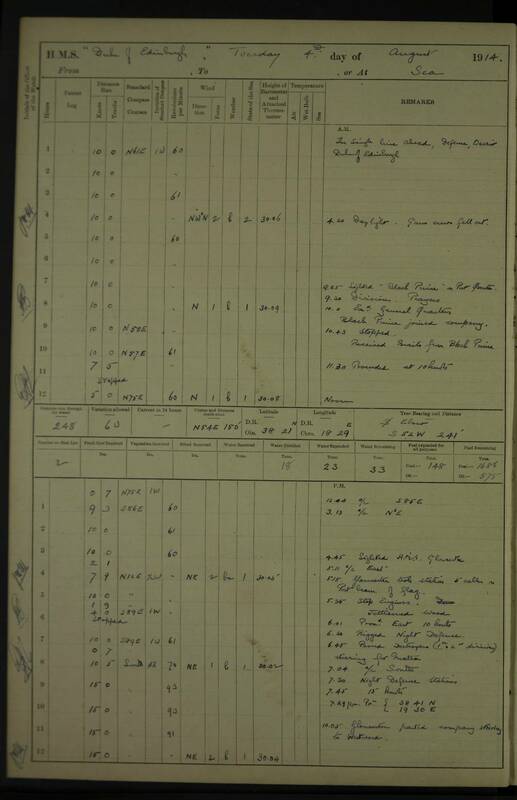 8.00 am 1st Cruiser Squadron took station on starboard beam of Battle Cruisers distant 6 cables. 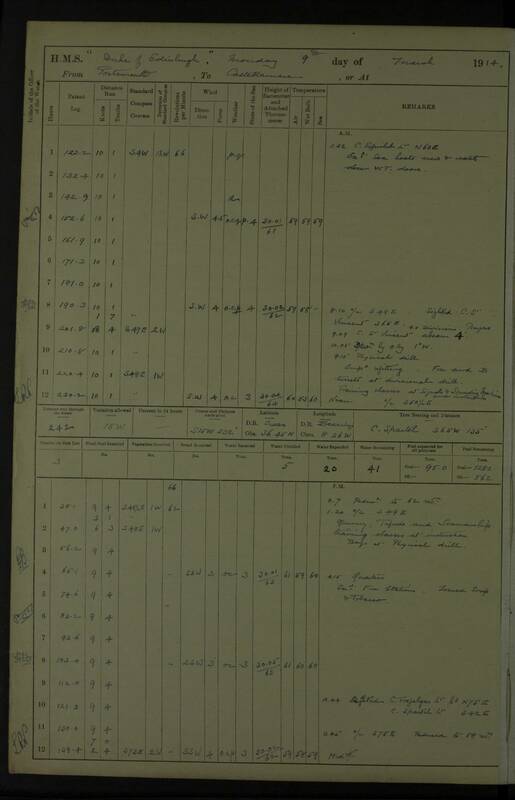 5.58 am: DUKE OF EDINBURGH took station 4 cables ahead of INFLEXIBLE. 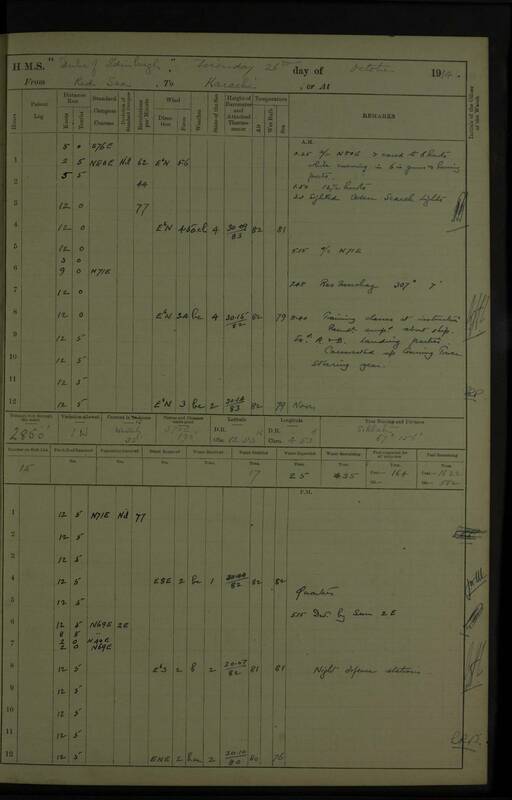 6.25 am: Formed single line ahead, disposition for entering harbour. 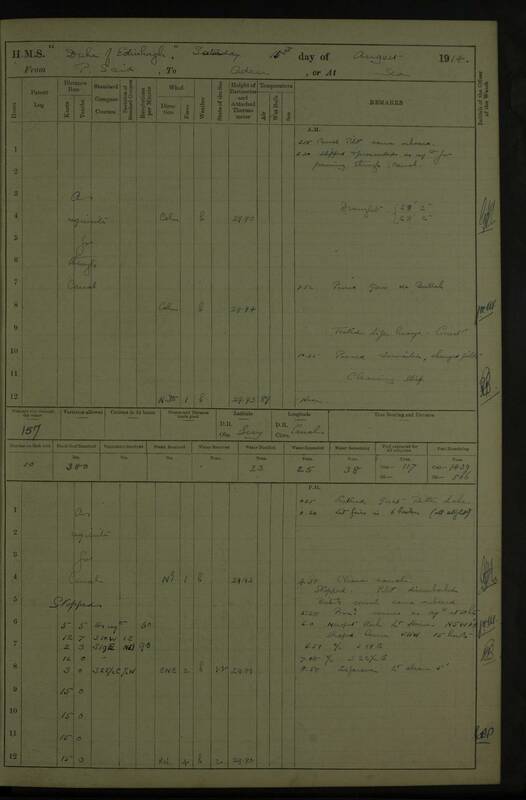 8.00 am: Hoisted Flag of Rear Admiral Ernest Troubridge, C.B., C.M.G., M.V.O. 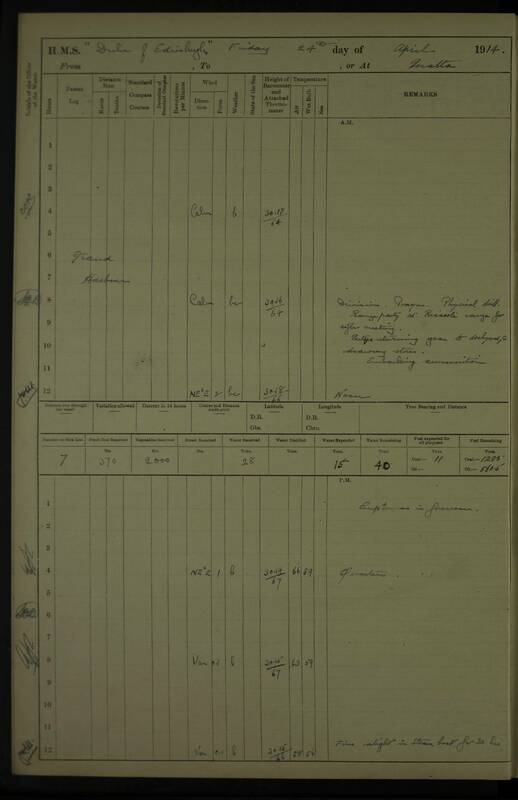 pm: French Contre-Amiral visited Rear Admiral. Saluted with 13 guns. pm: French Vice Amiral visited Rear Admiral. 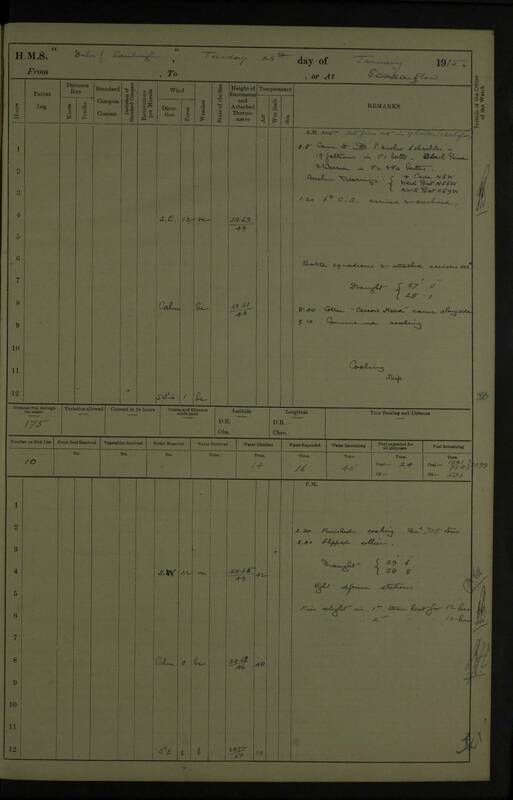 Saluted with 15 guns. 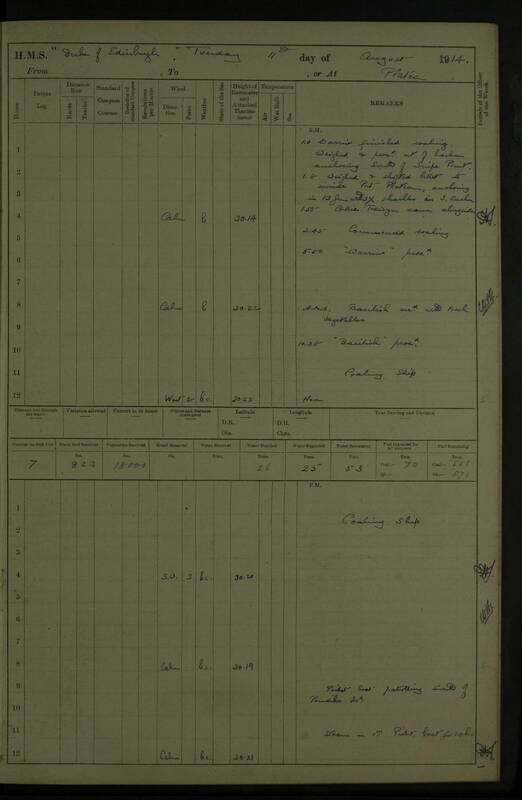 pm: Preparing quarter deck for dinner to French officers. 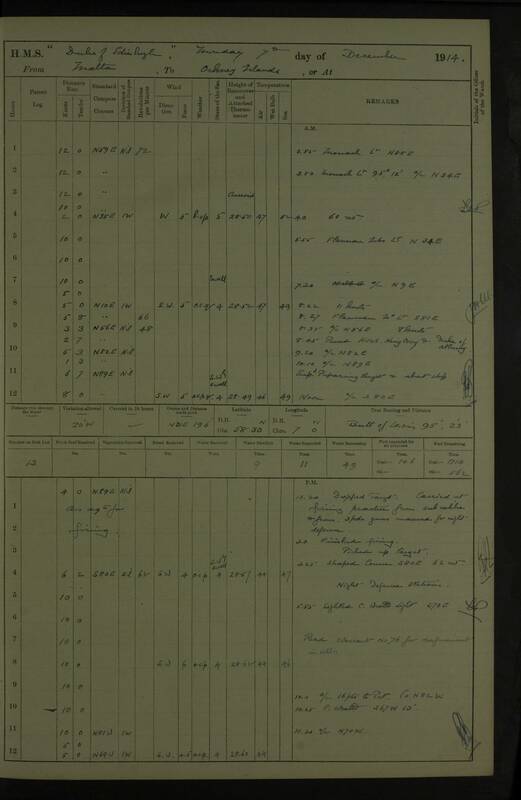 pm: Lieutenant J.W. 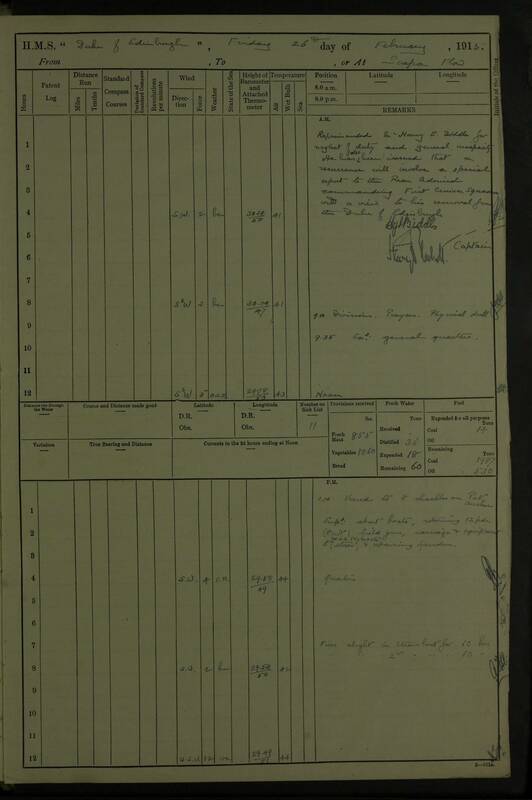 Hooper discharged to BLACK PRINCE for passage home. 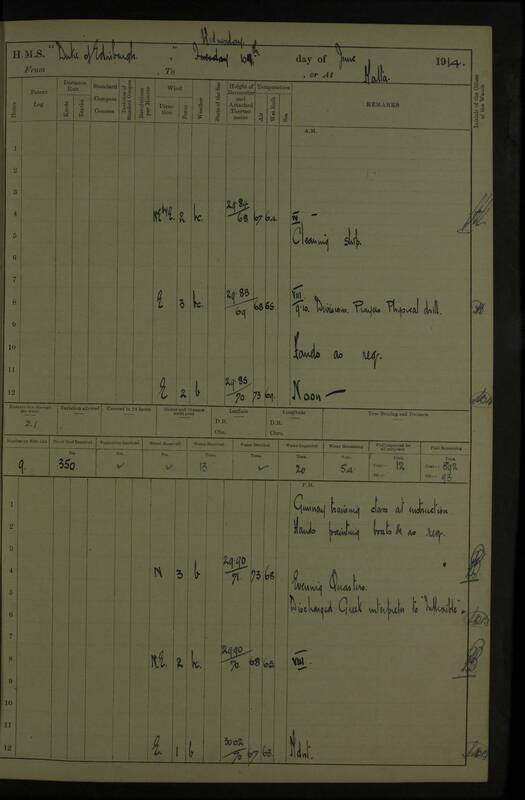 am: 1st and 2nd steam boats practising rapid sweeping; Lost by accident during sweeping exercises, 130 fathoms of 1" steel flexible wire & 1 megaphone 10"
5.20 am: Proceeded towing target; INDOMITABLE carrying out sub calibre firings; 6.40 am: Stopped and hauled in target. 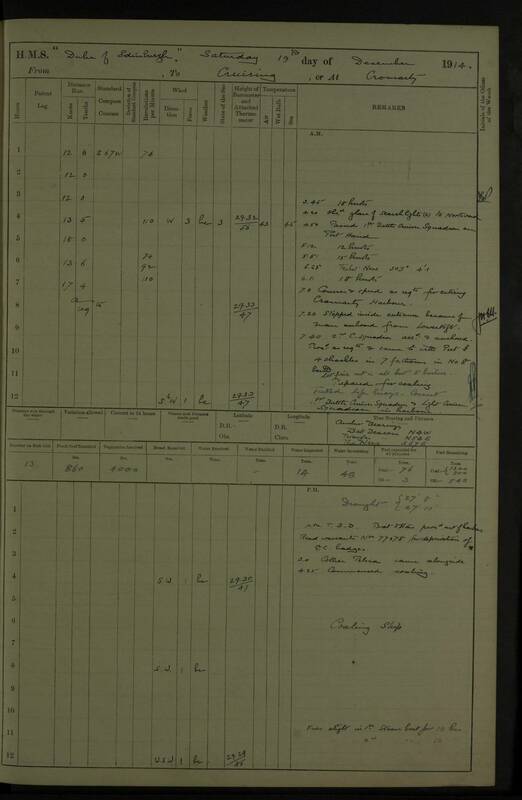 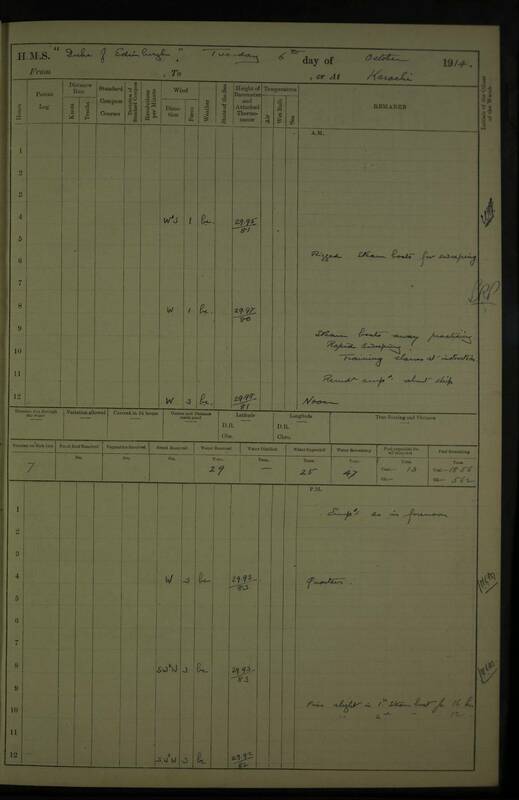 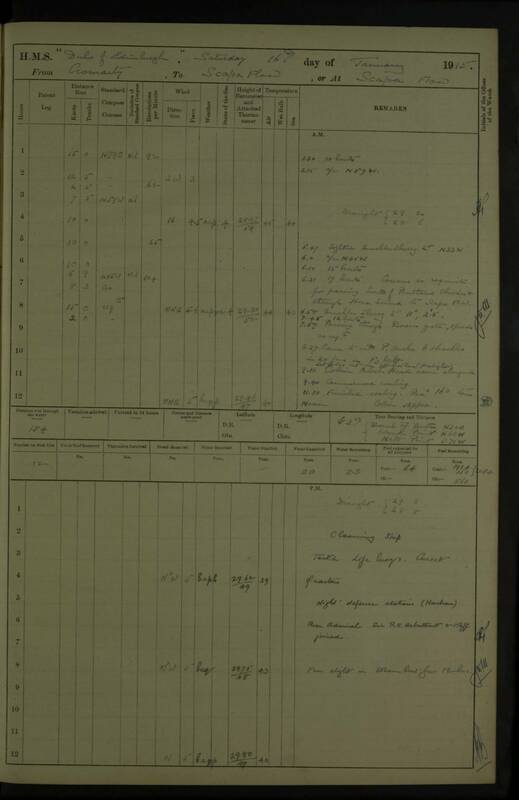 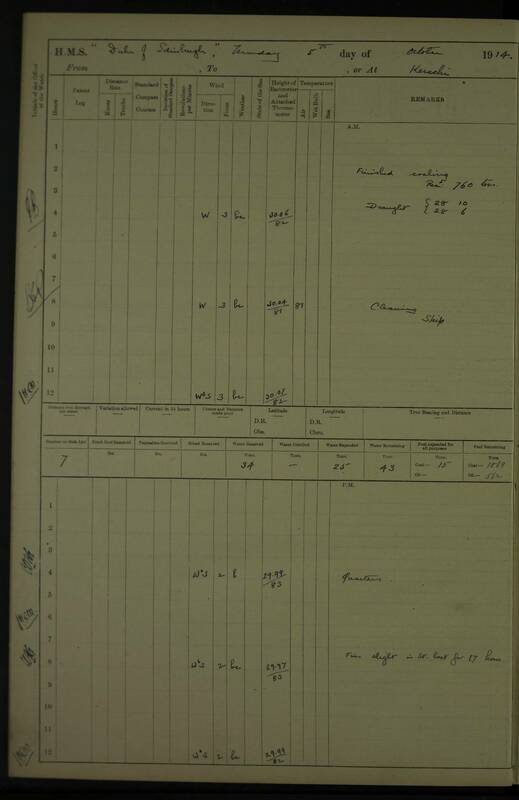 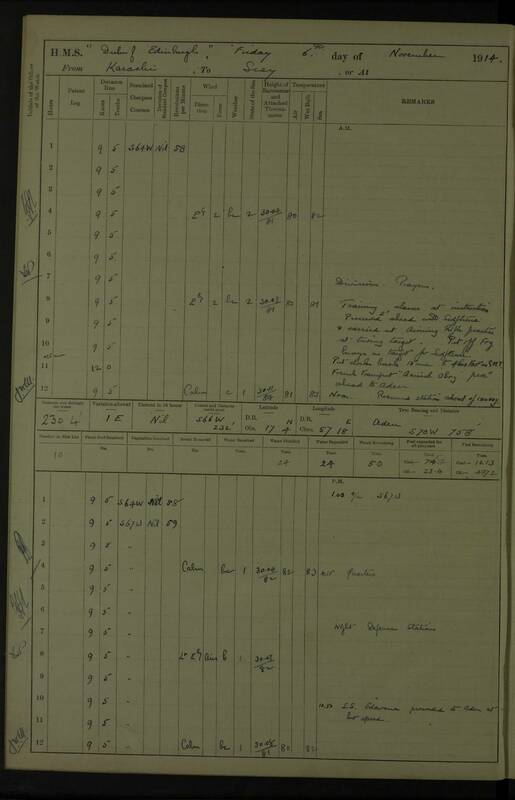 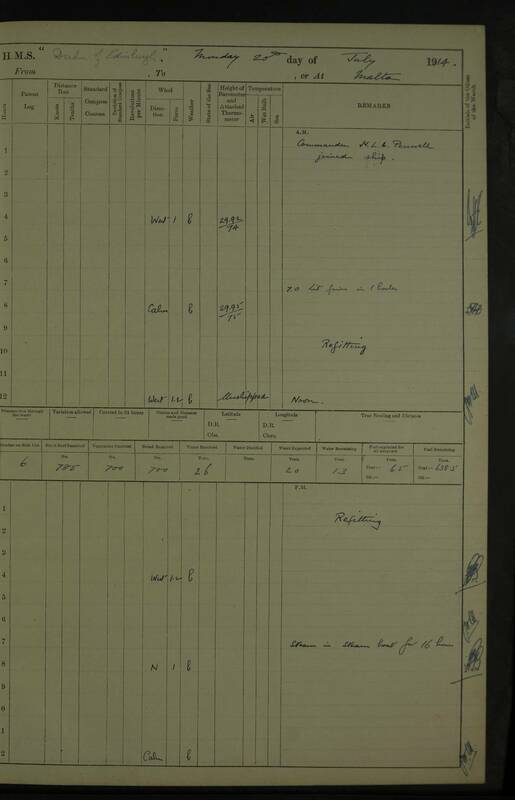 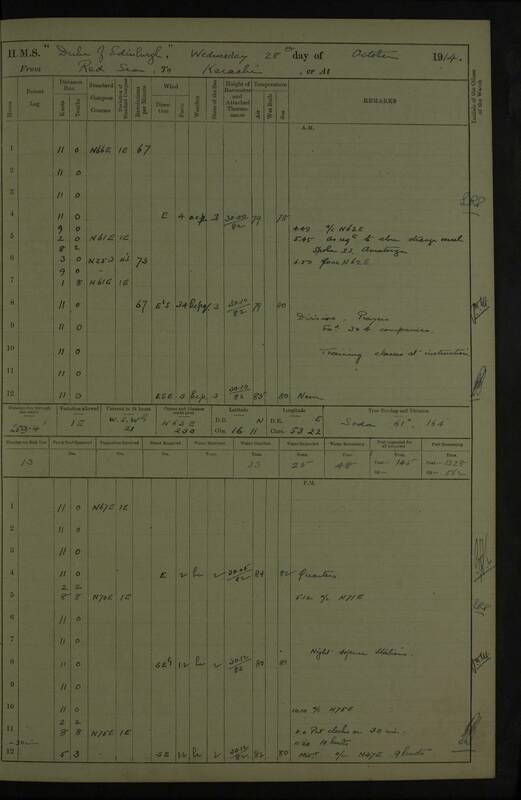 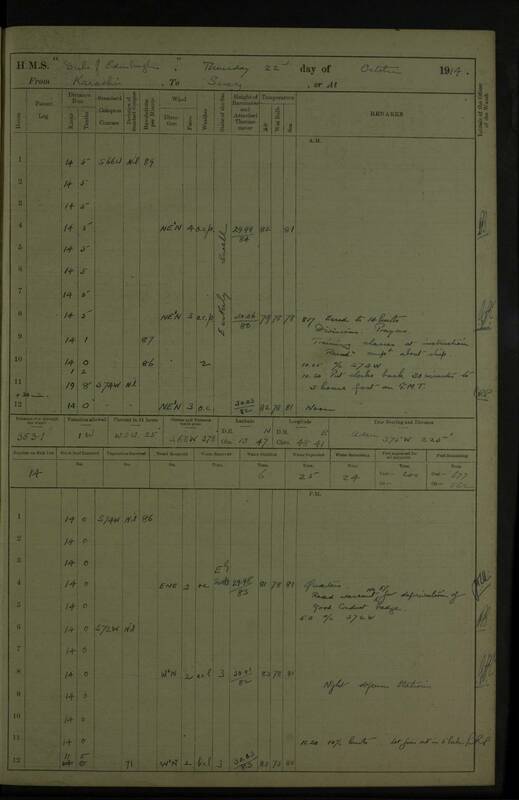 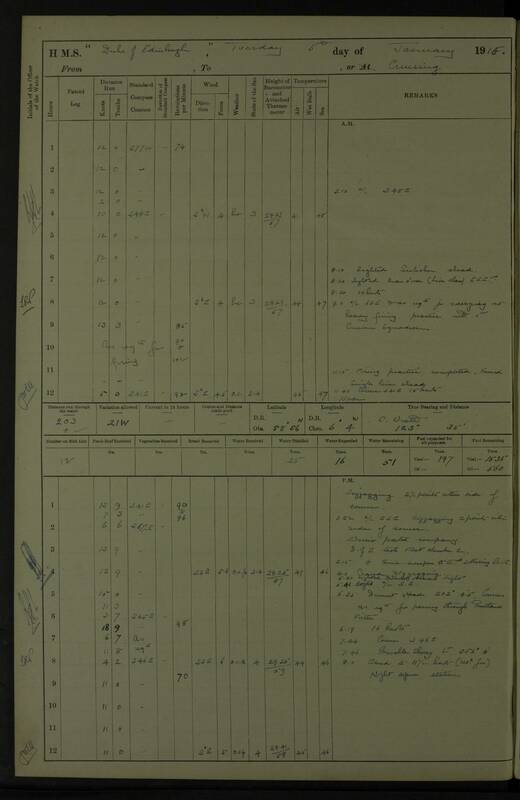 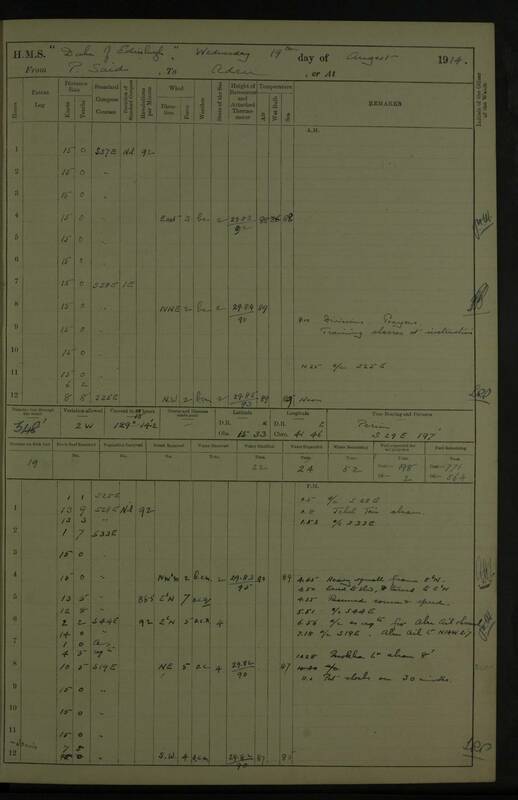 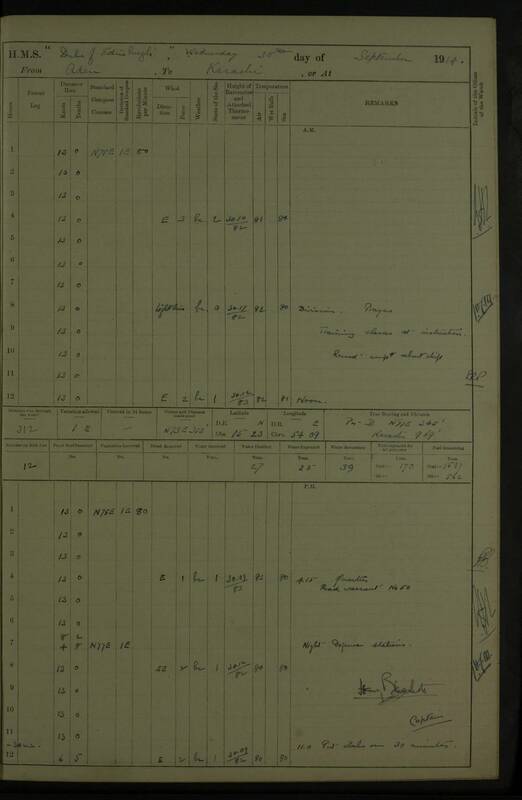 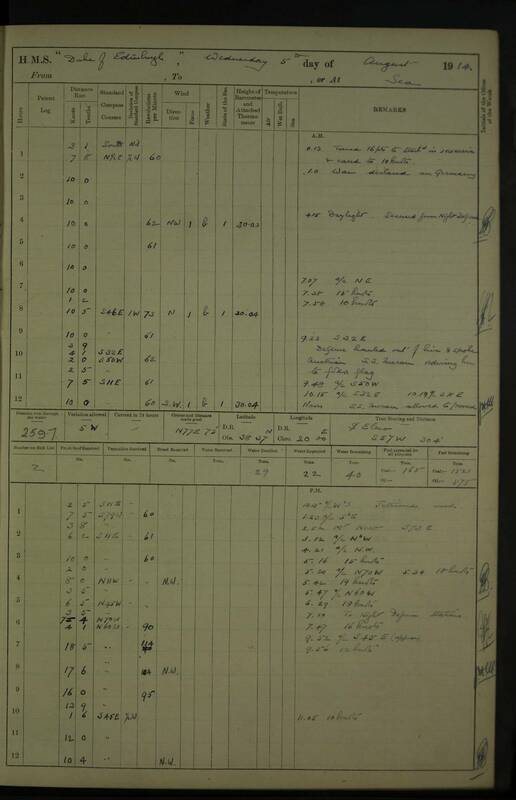 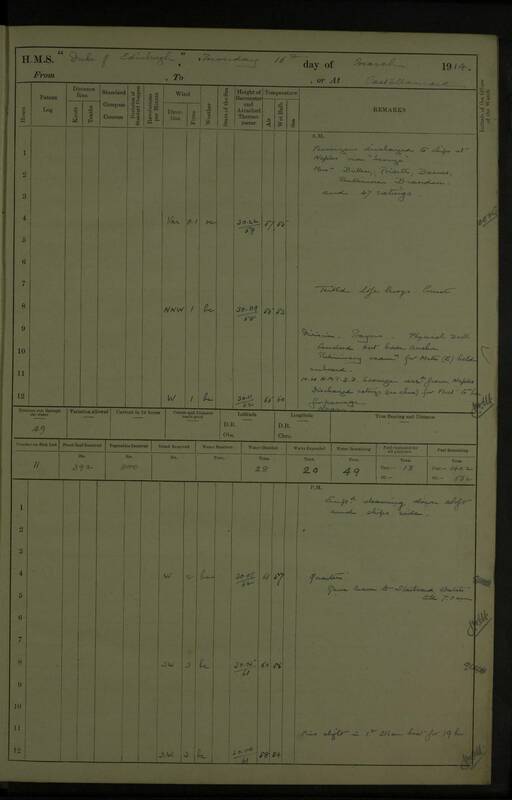 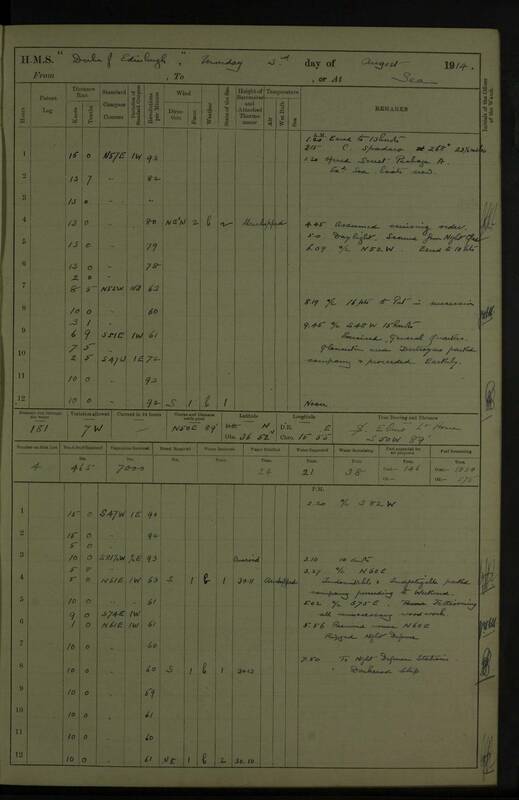 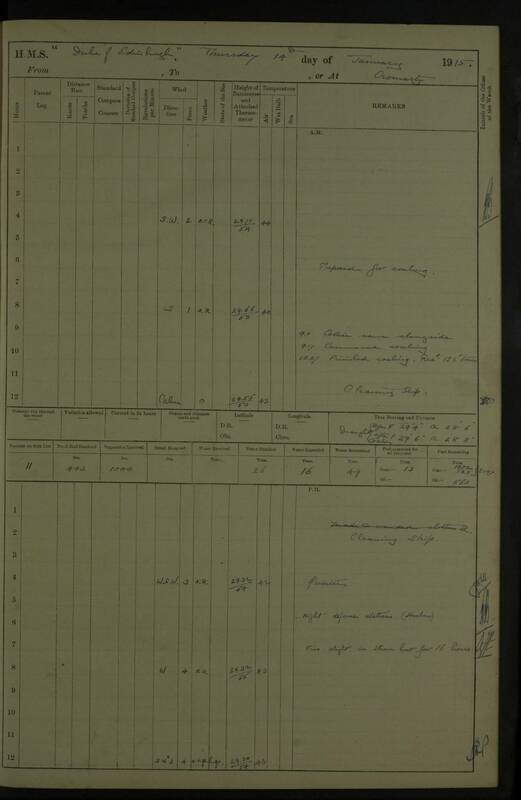 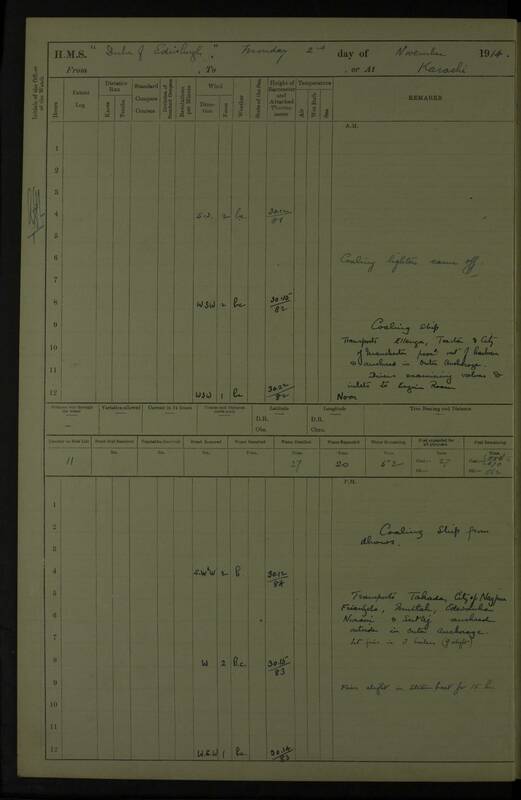 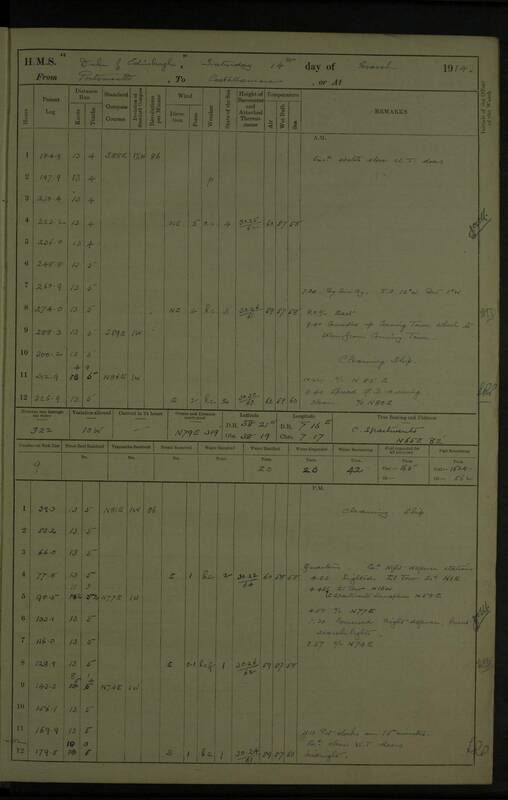 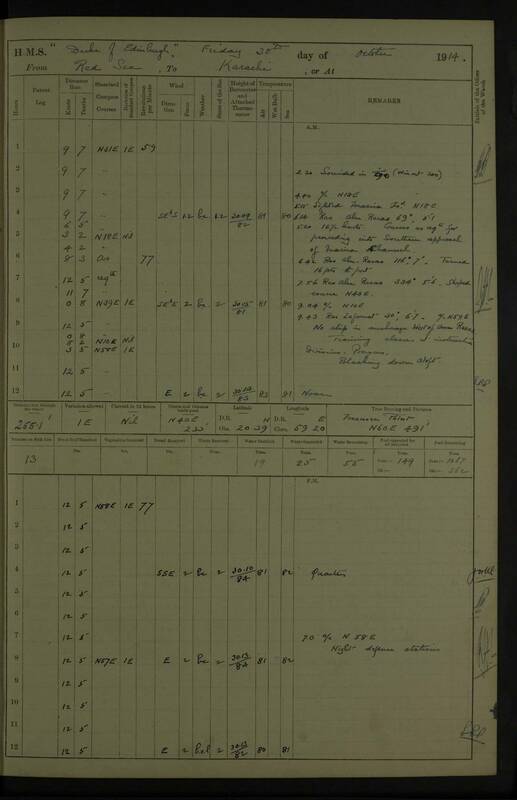 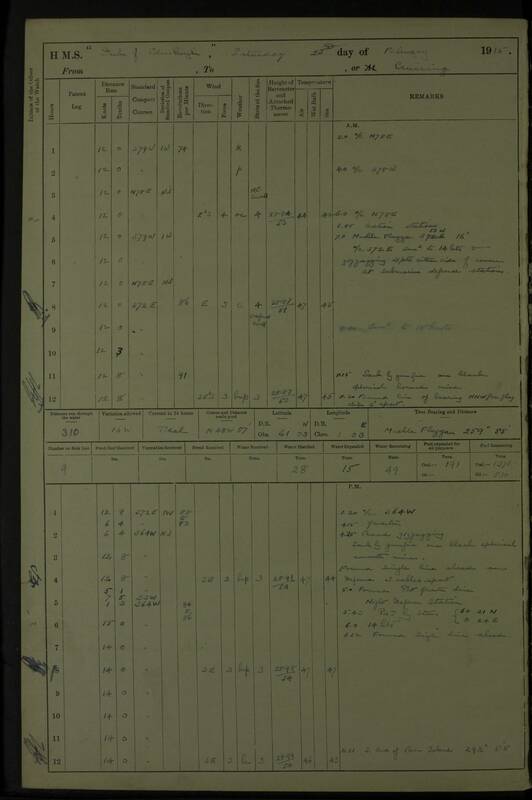 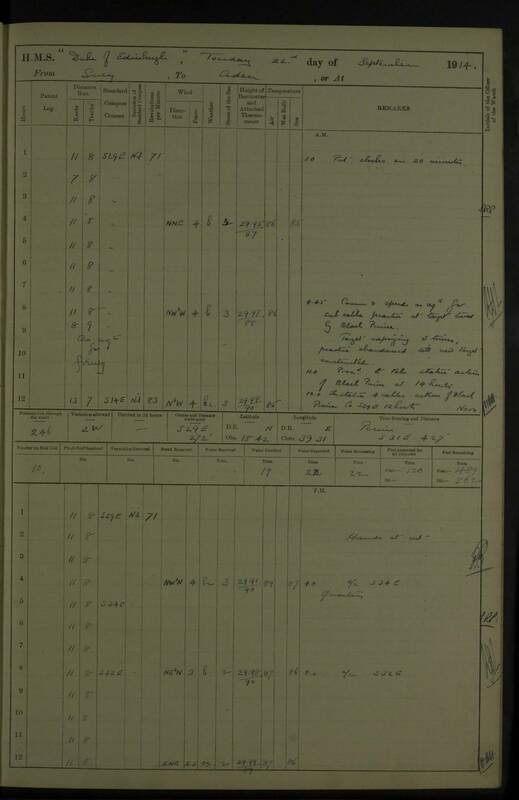 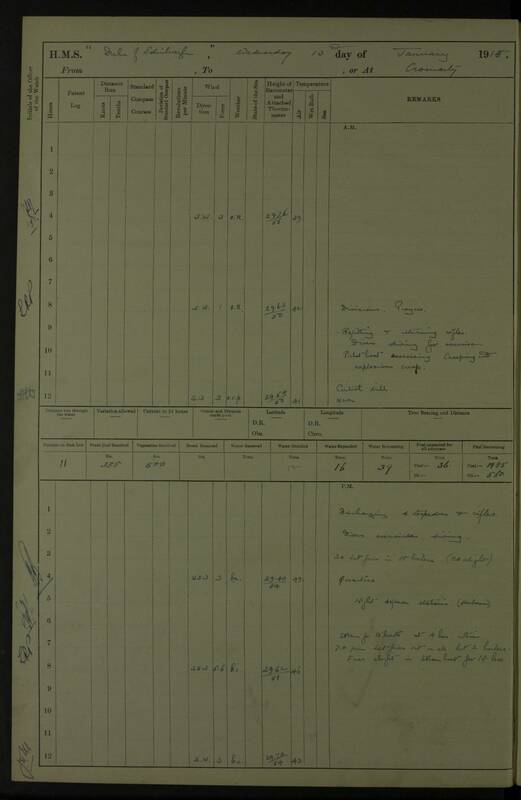 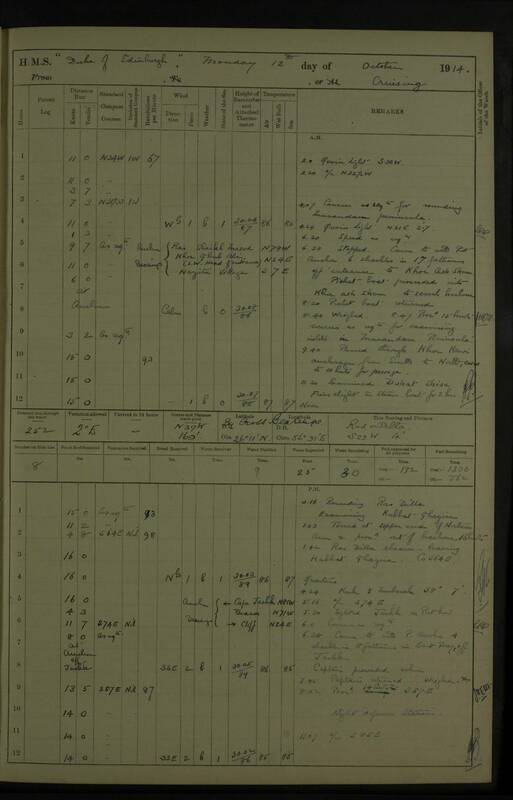 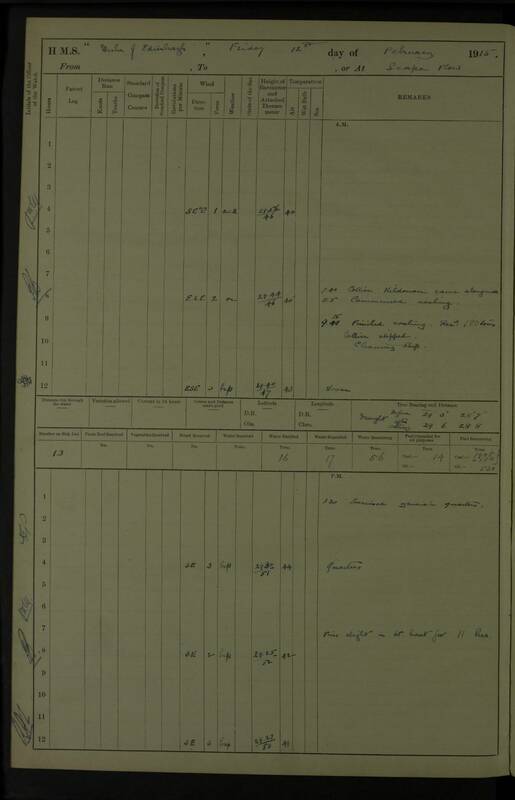 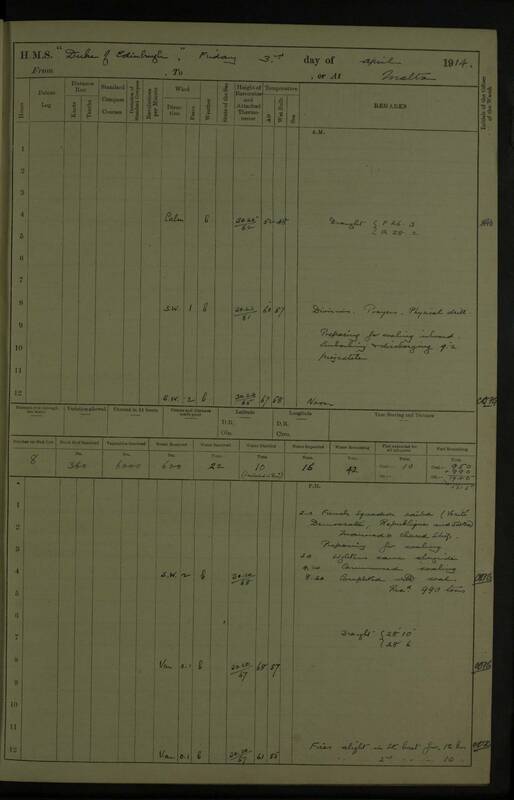 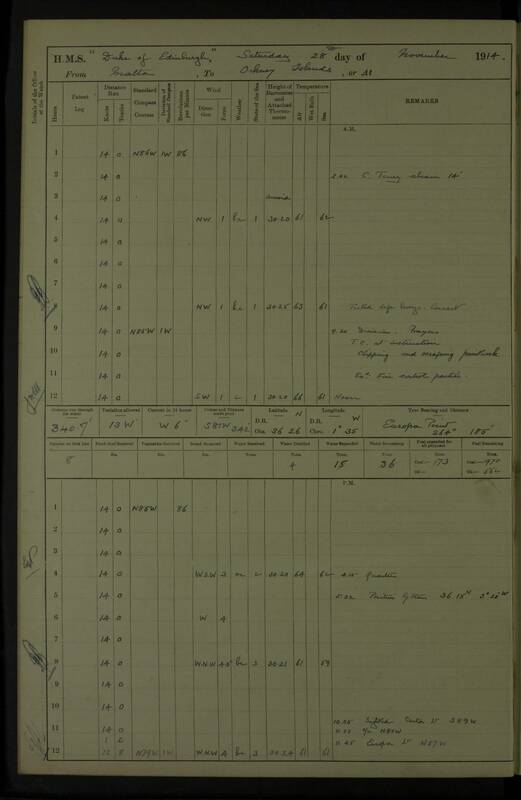 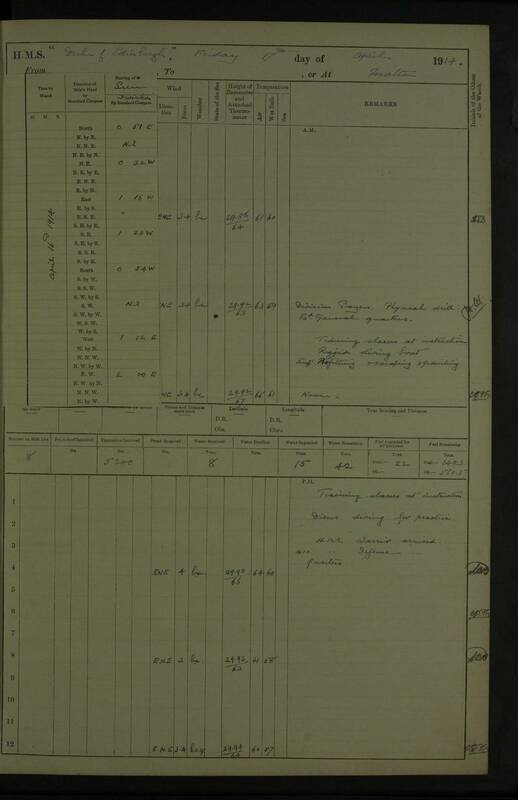 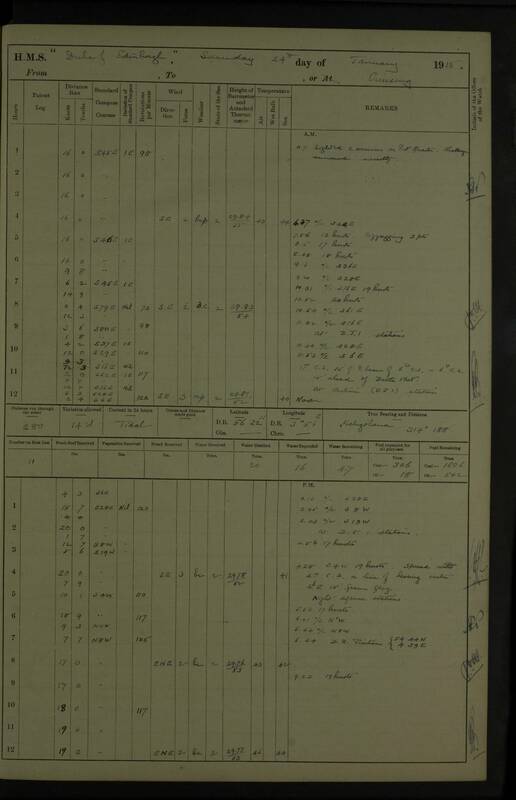 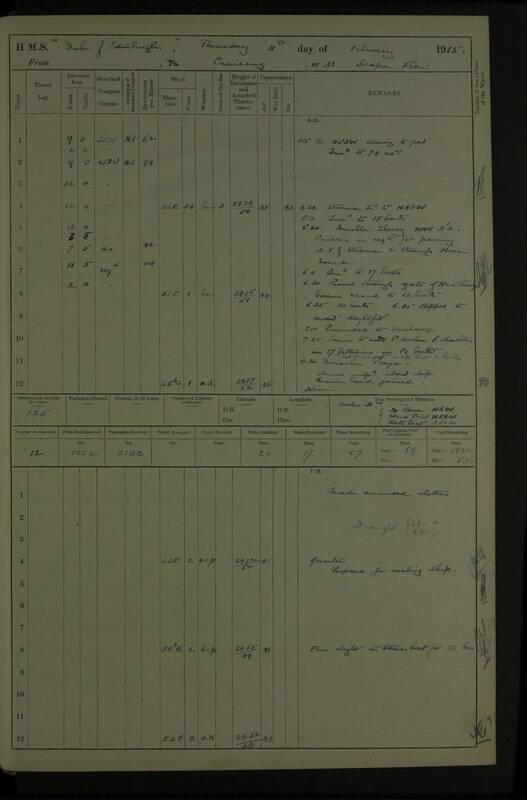 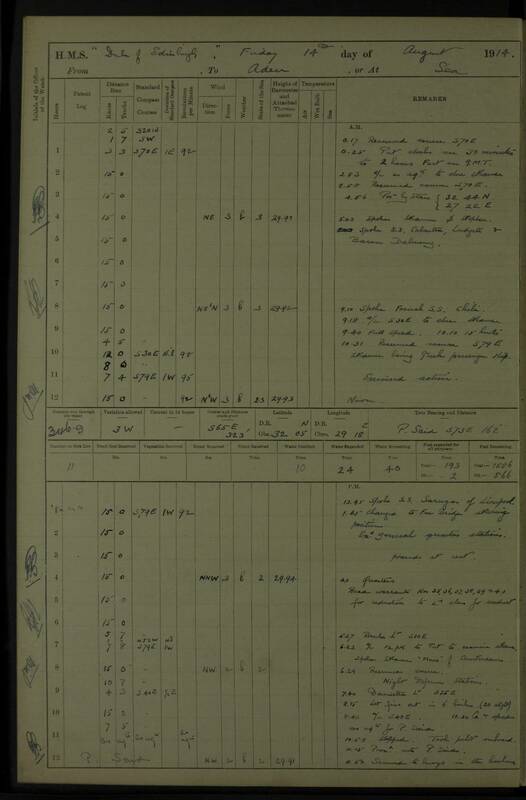 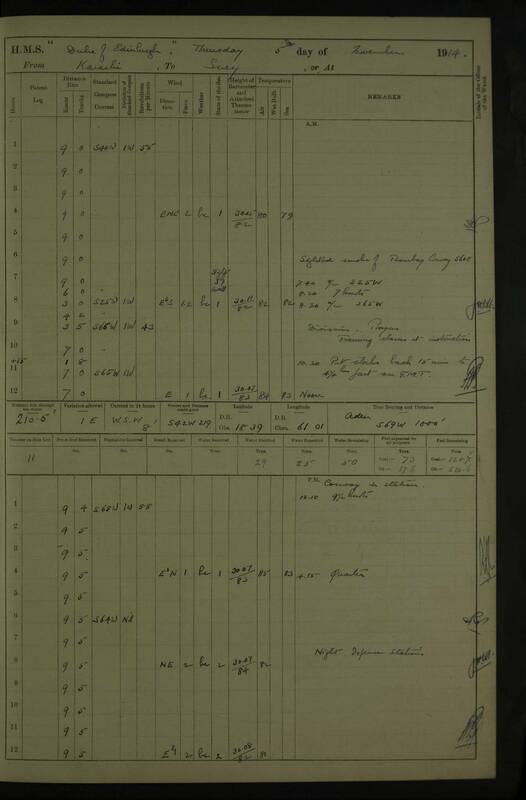 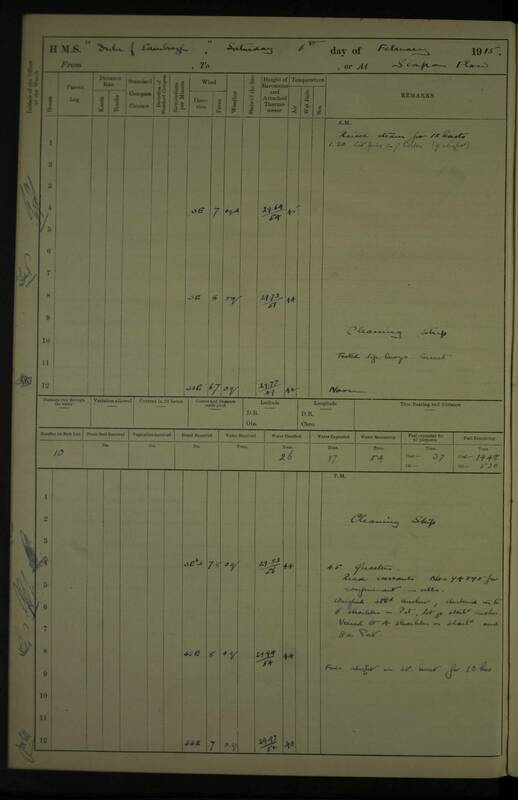 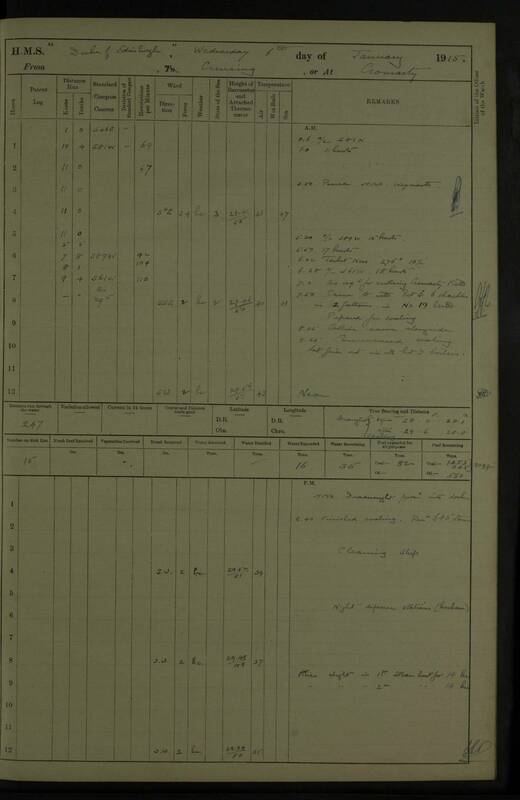 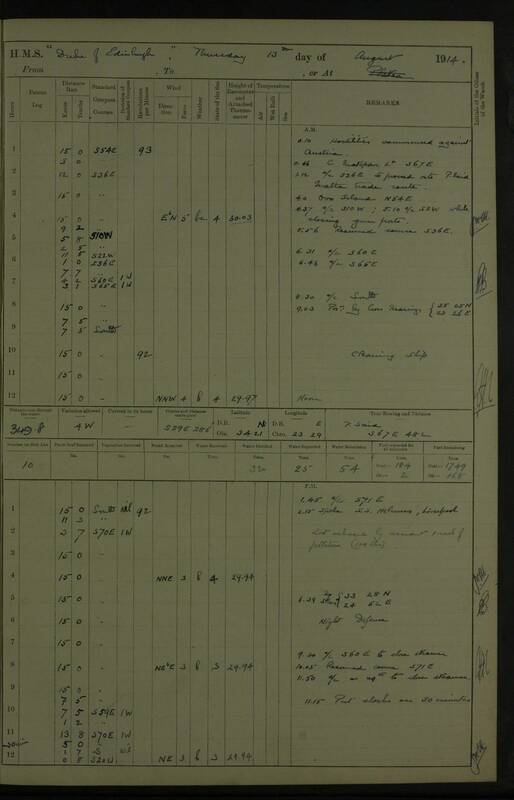 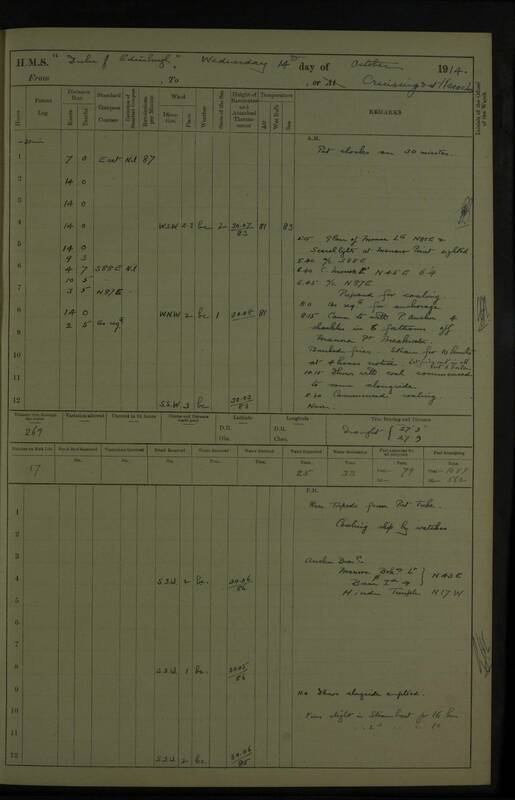 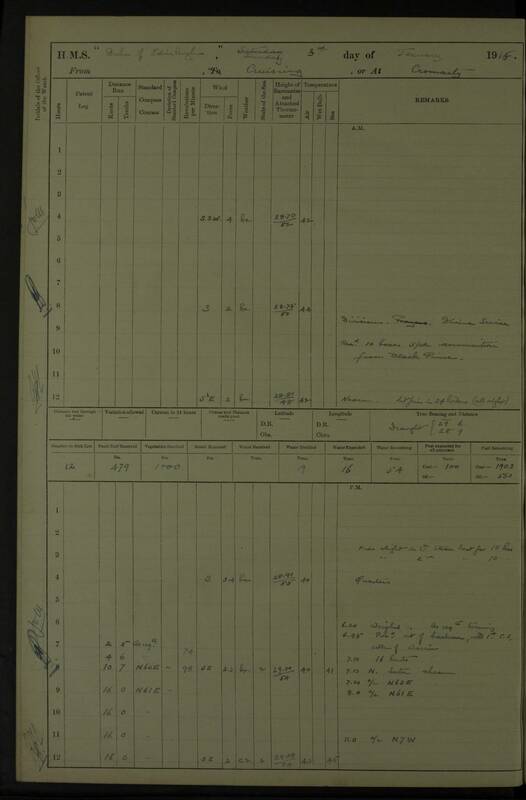 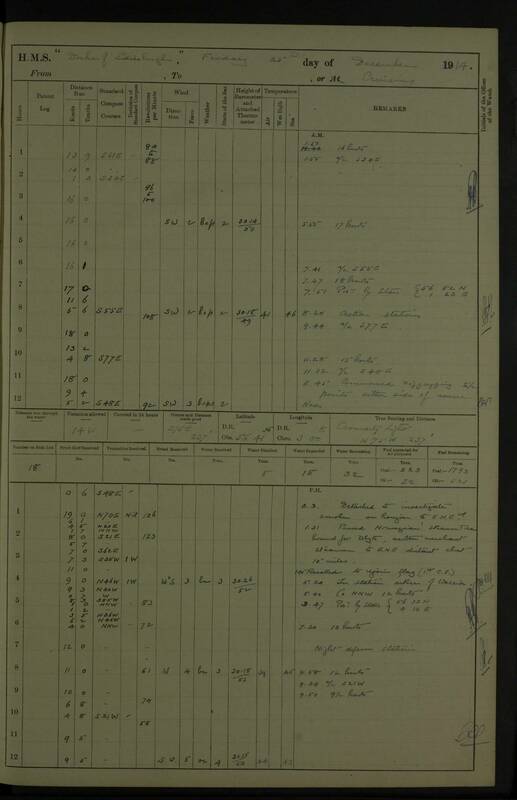 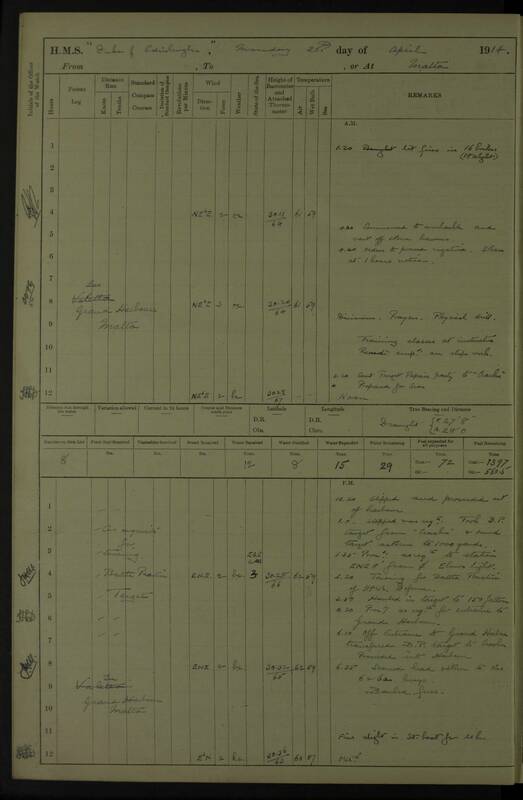 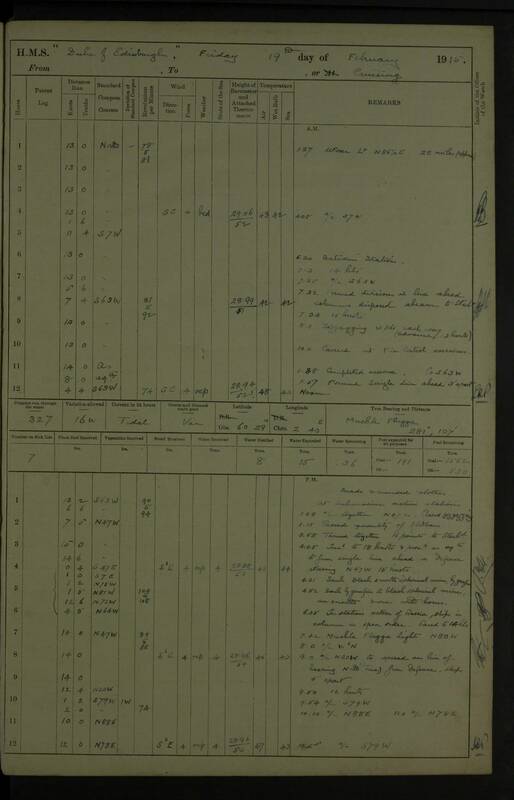 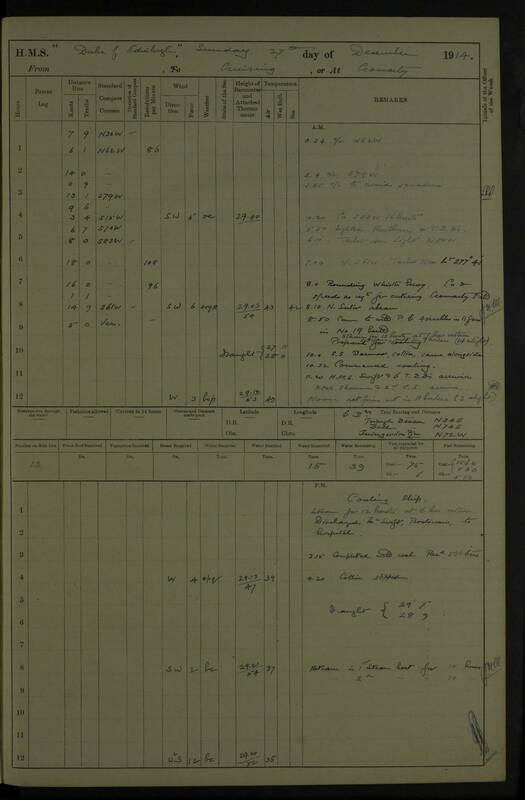 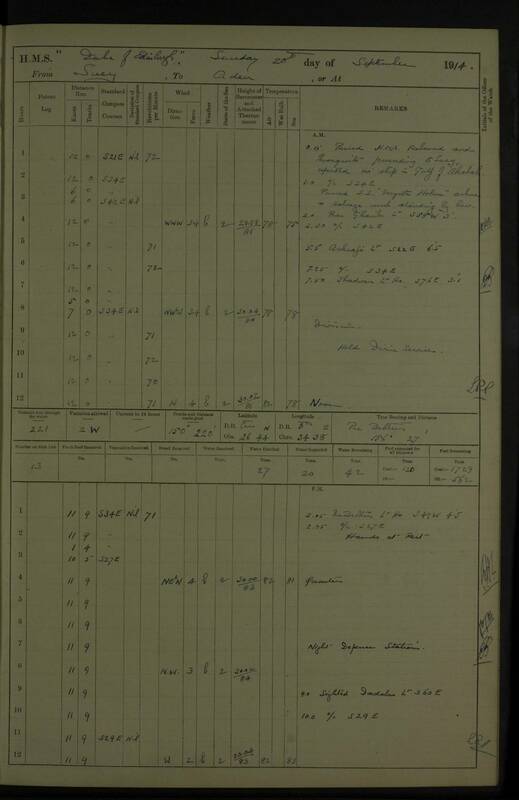 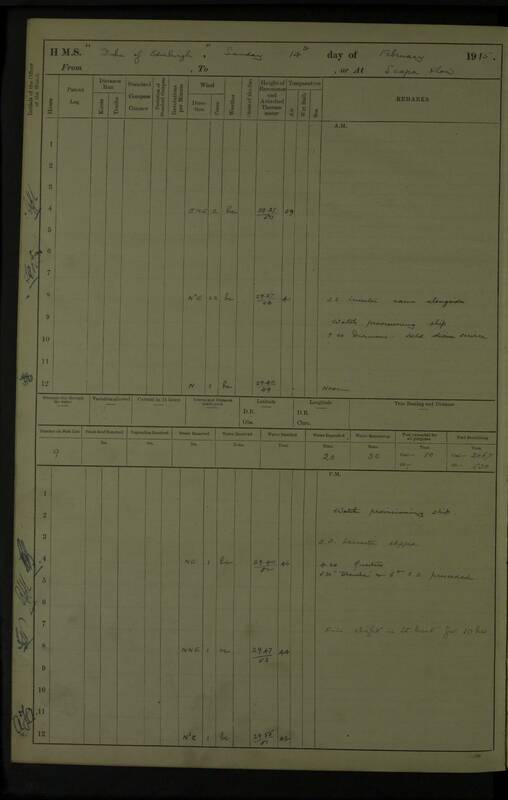 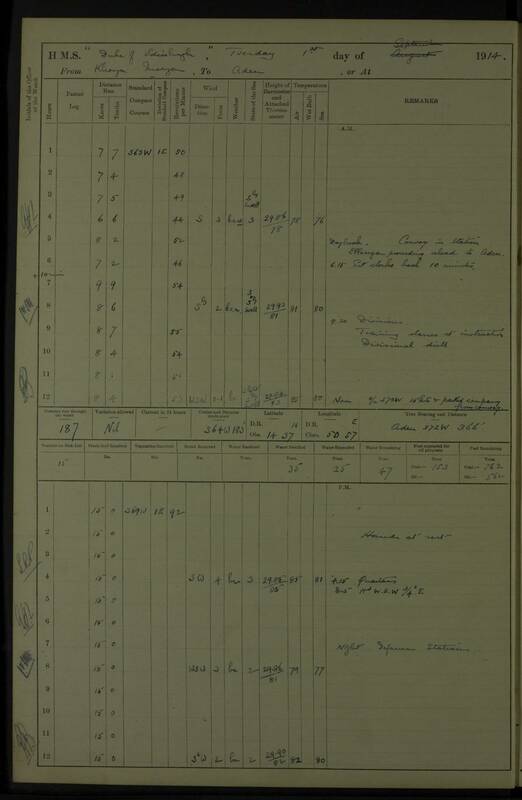 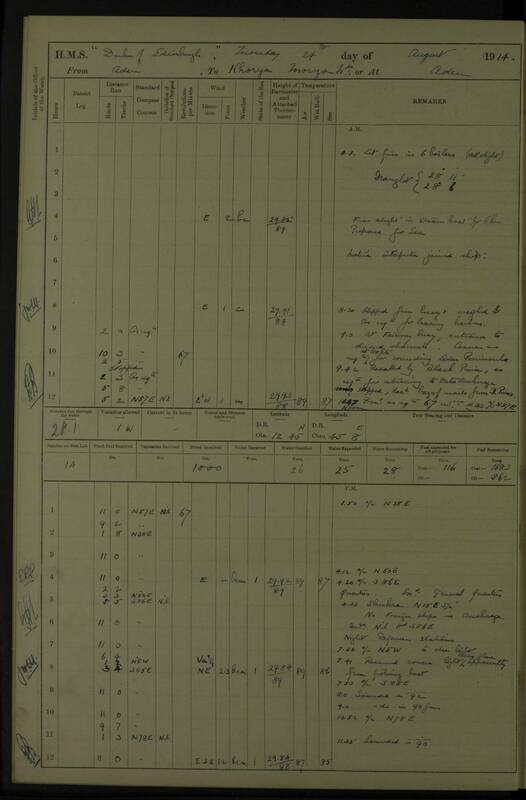 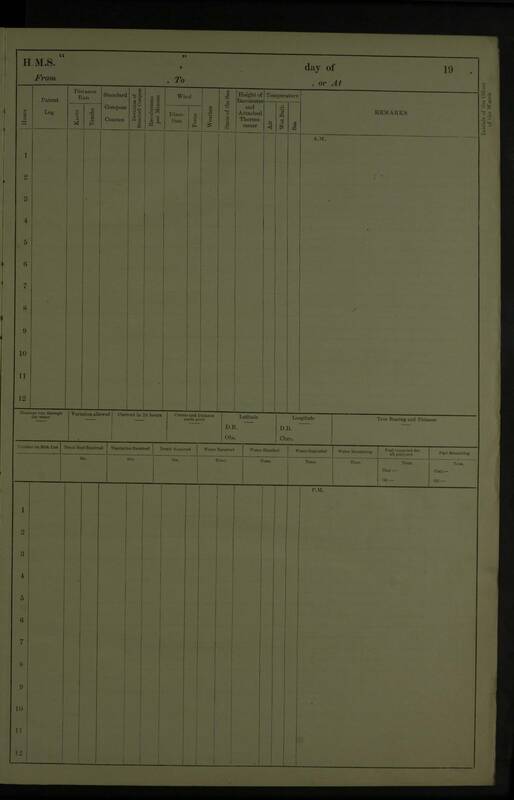 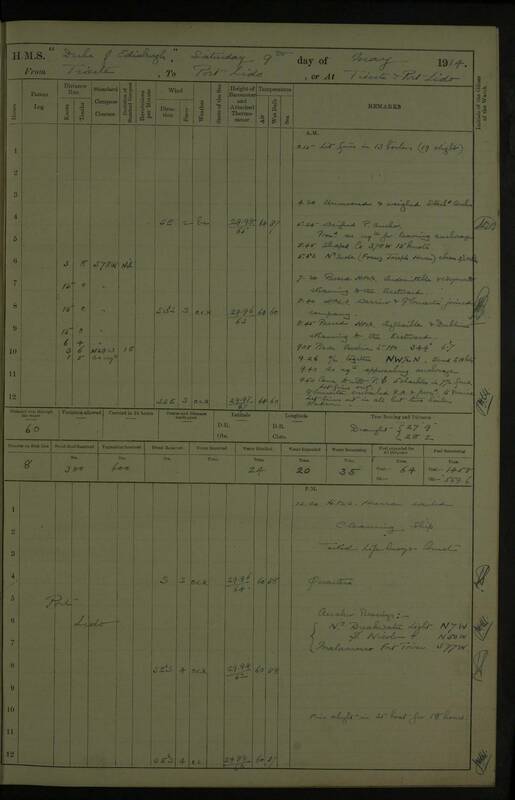 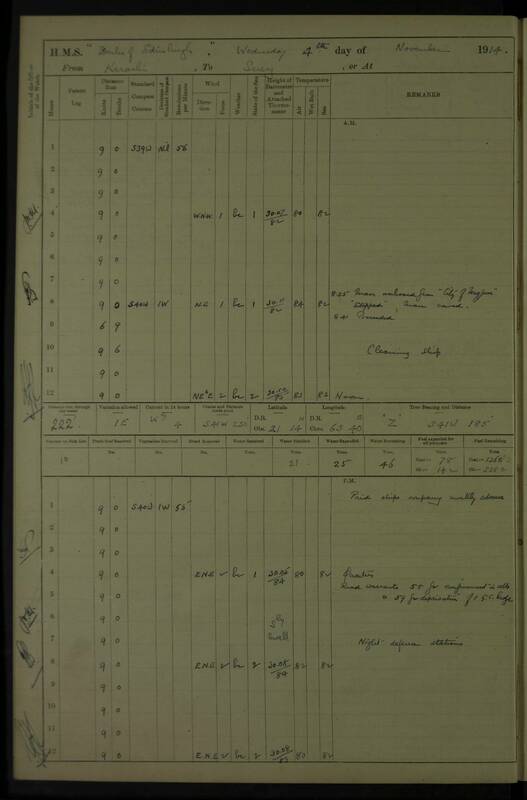 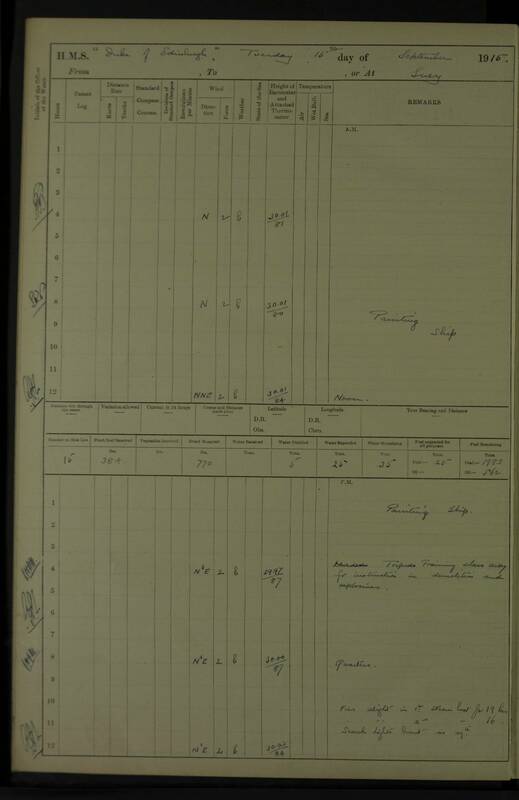 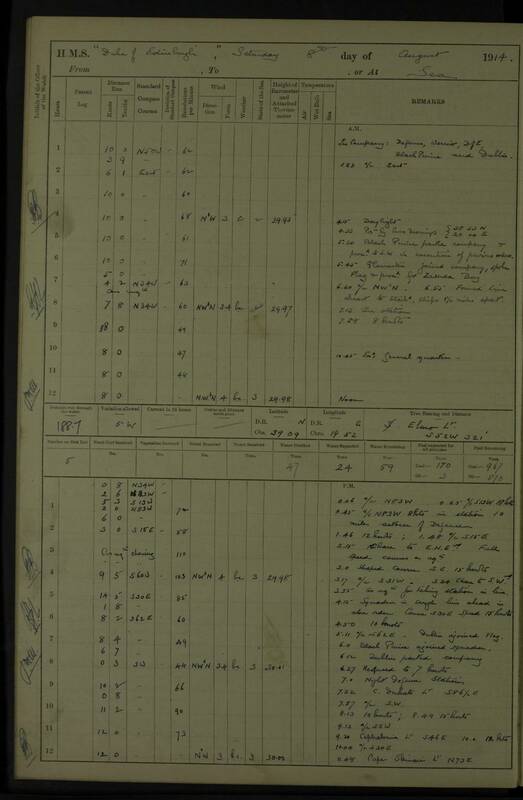 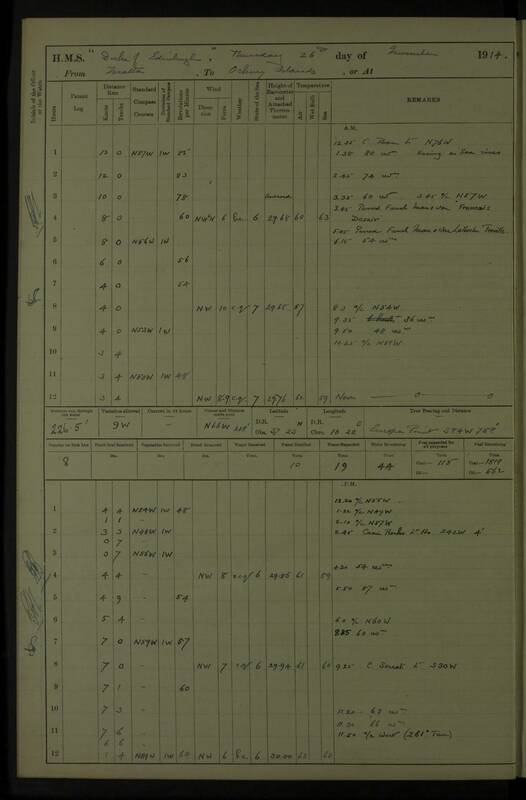 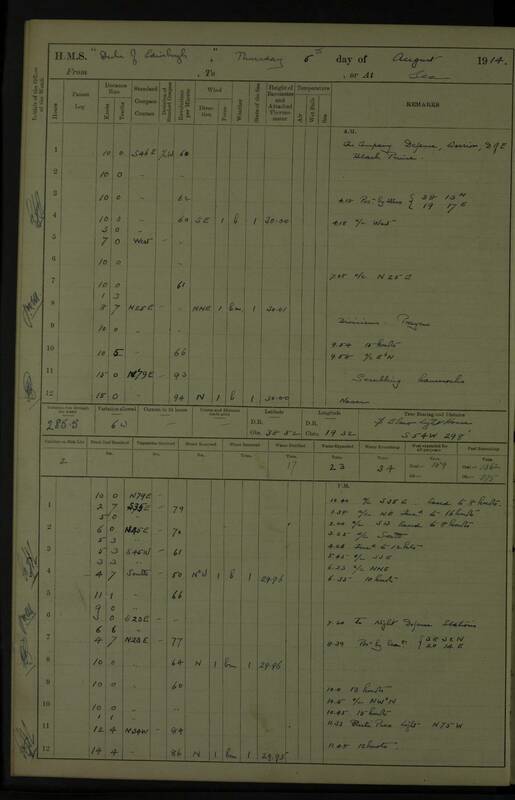 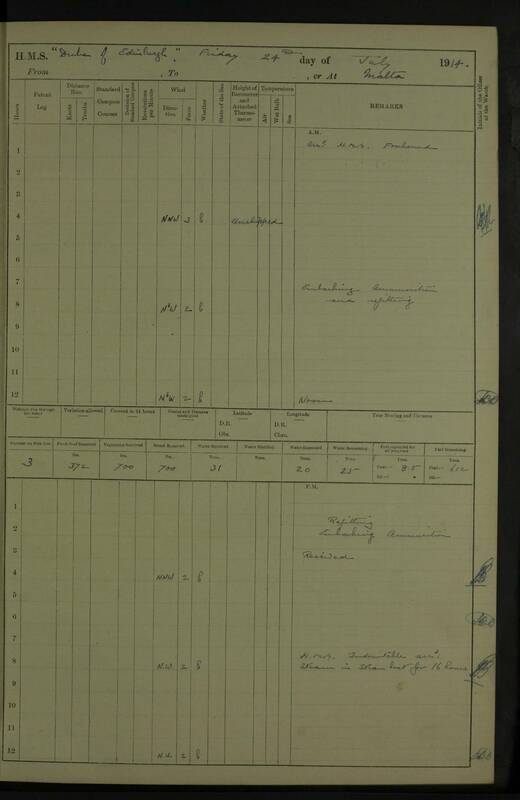 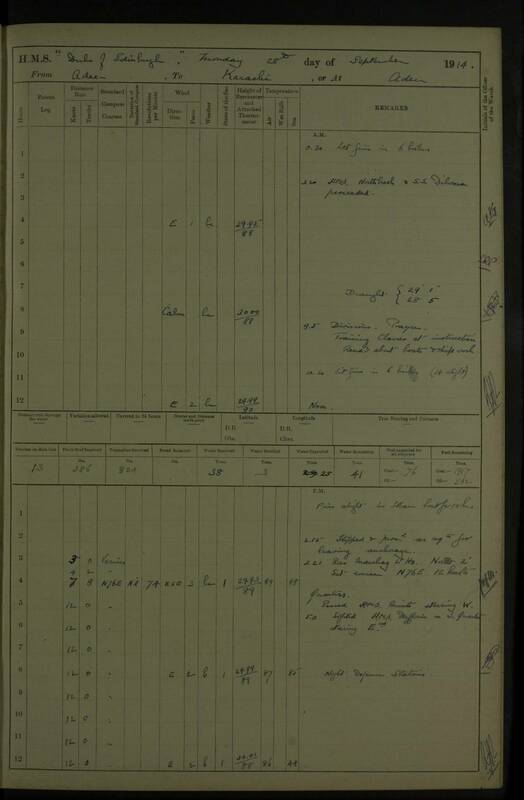 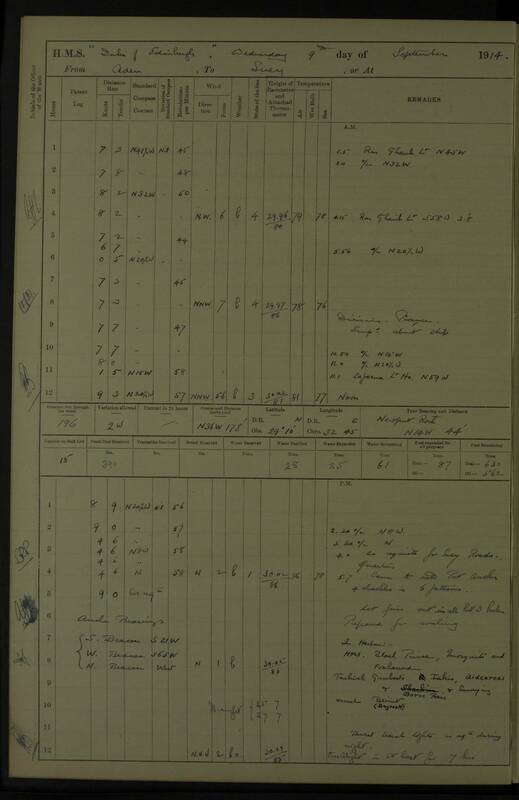 Compass deviation table overlain on log page for 17 April, 1914. 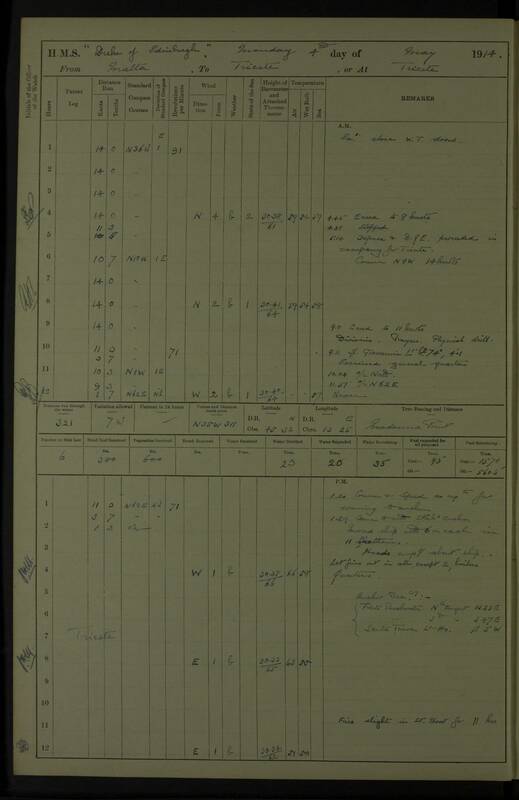 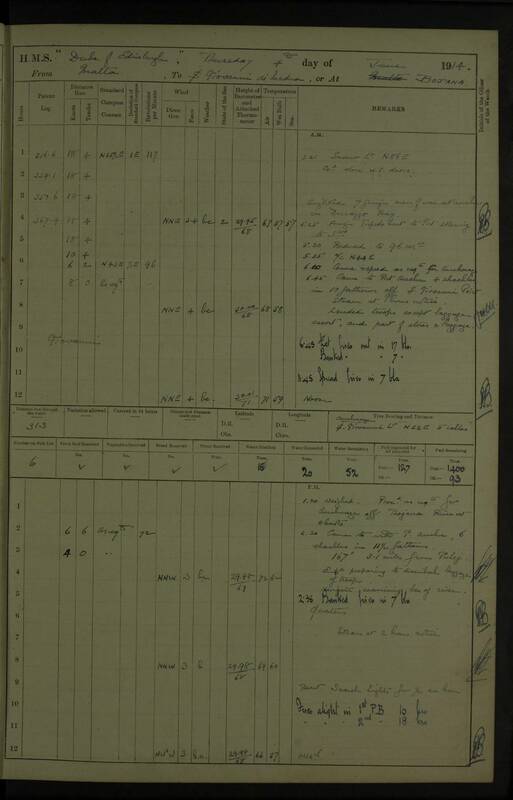 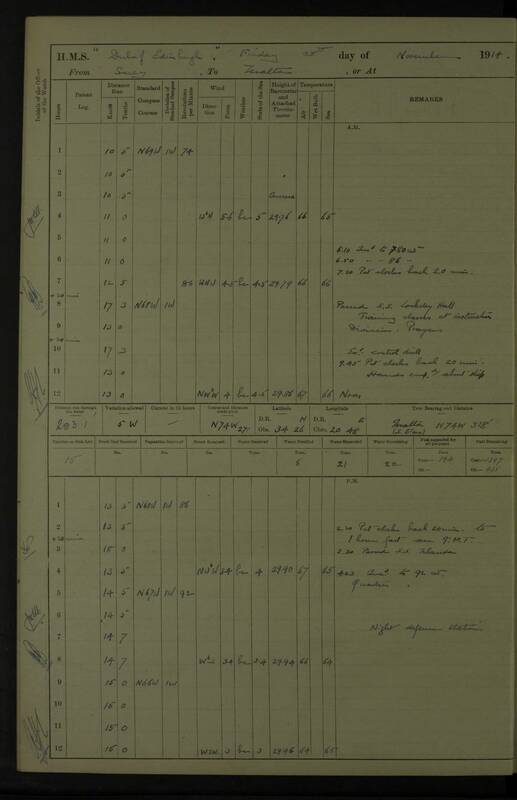 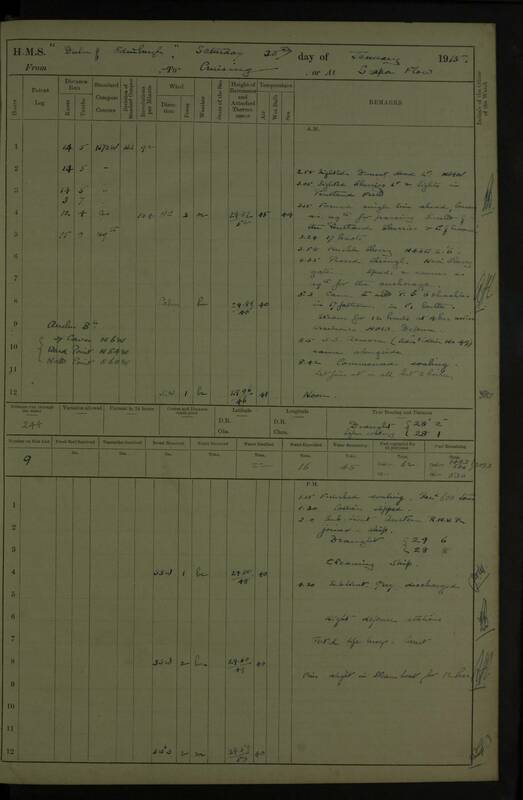 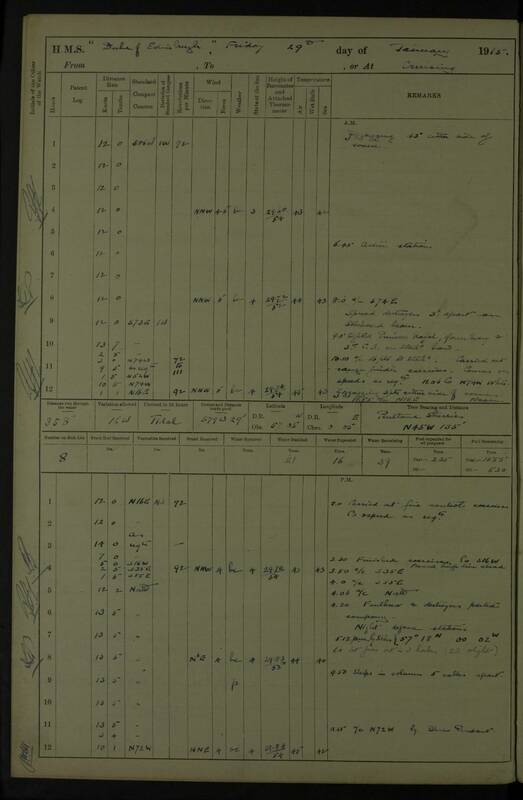 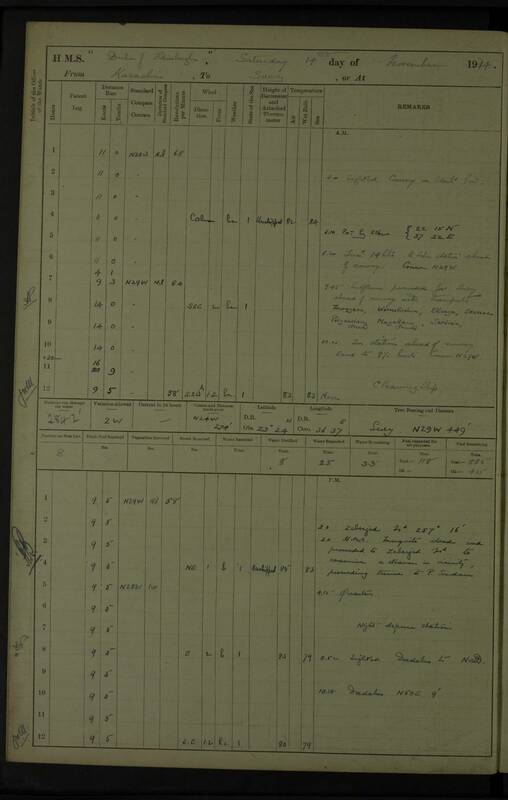 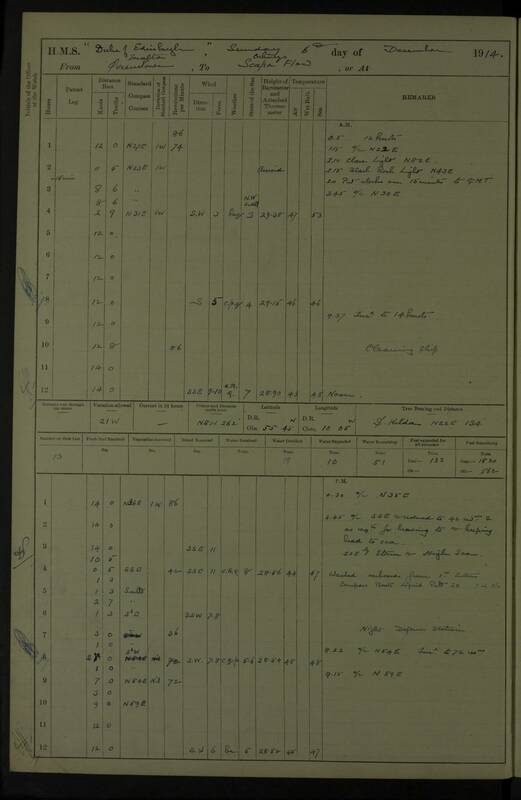 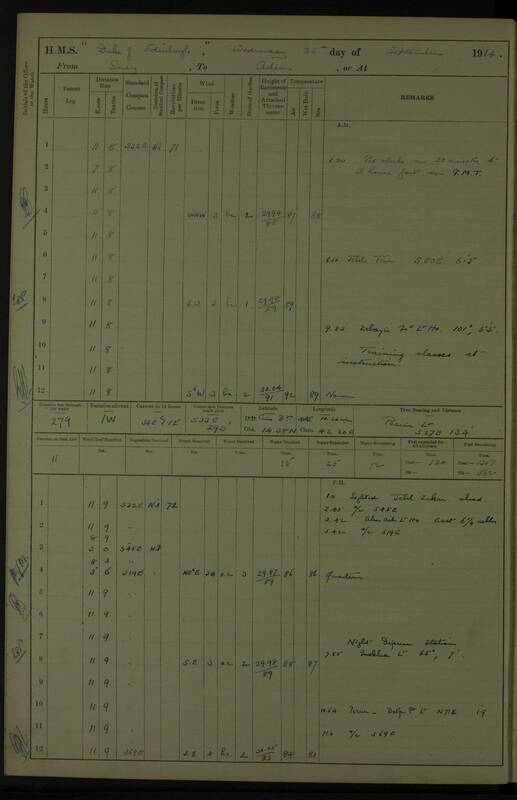 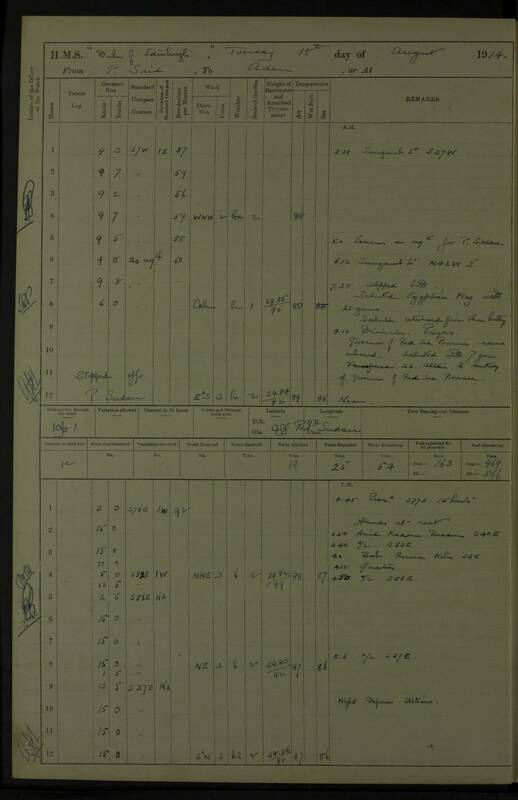 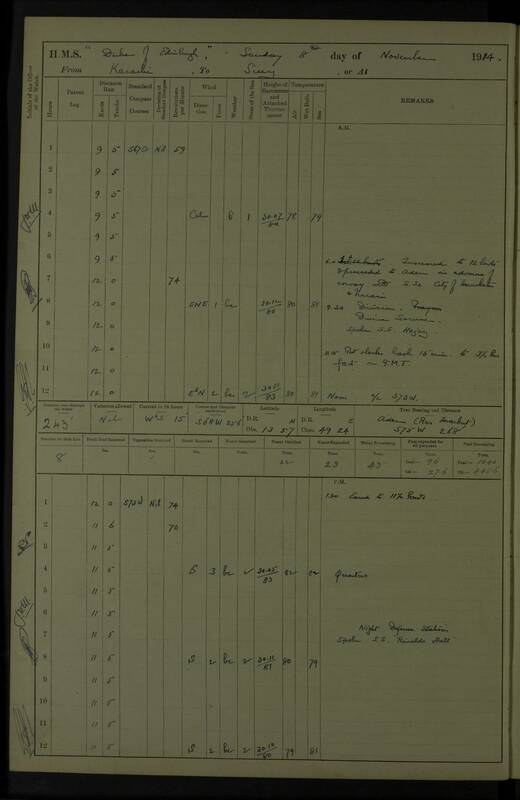 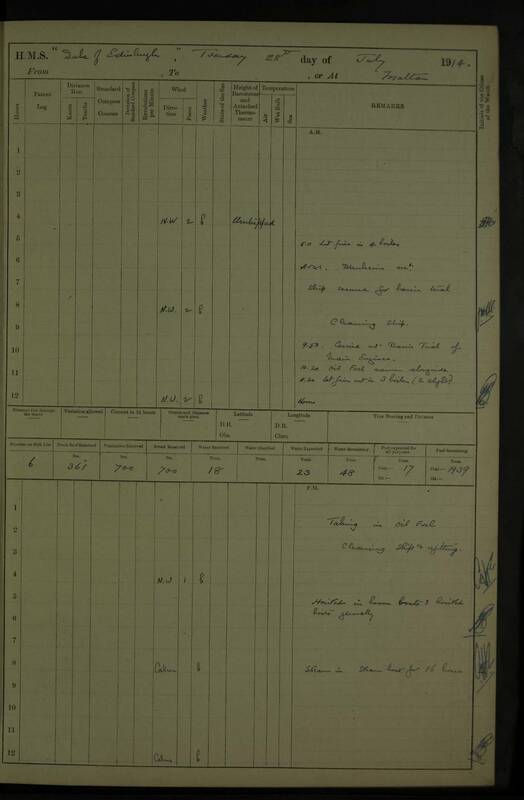 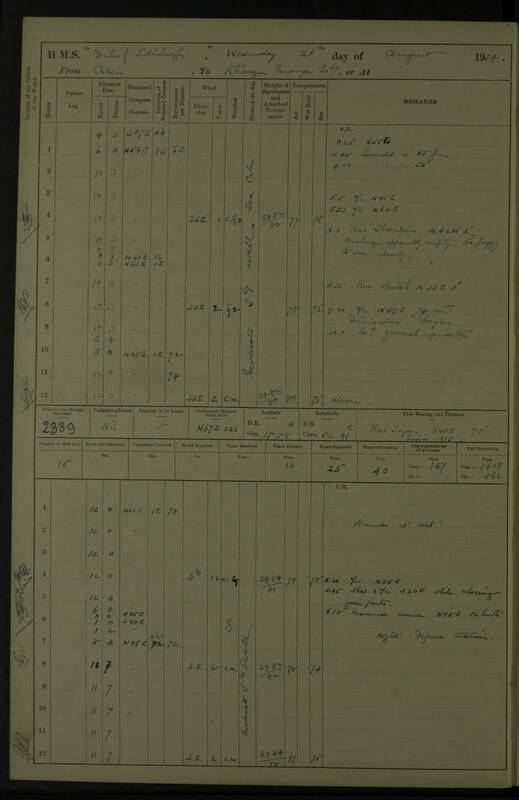 Scans for L and R halves of log page for 17 April, 1914. 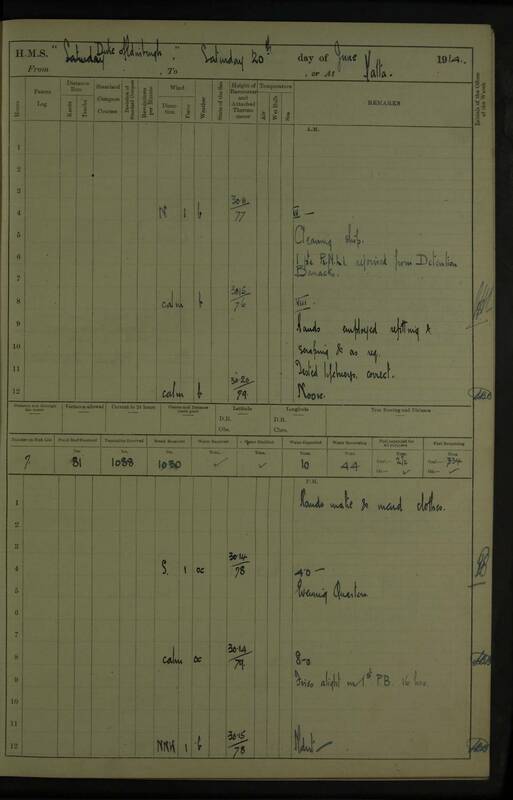 10.30 am: Discharged one L/Stoker to R.N.H. 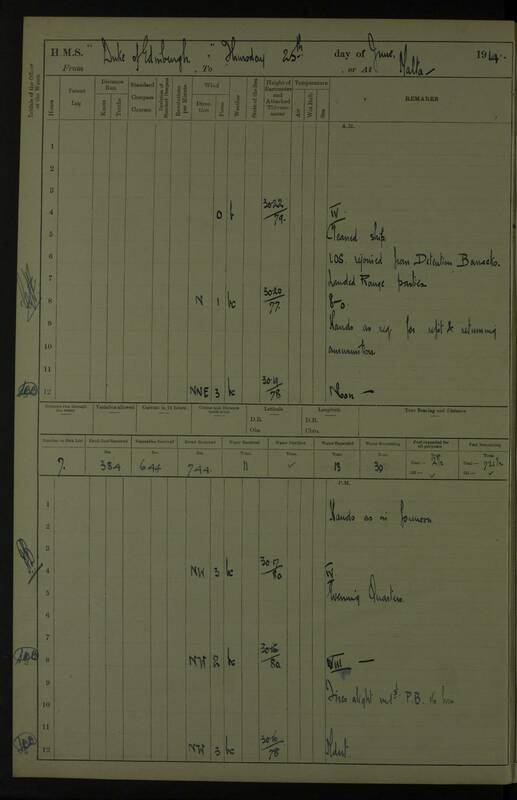 12.30 pm: 6 Privates, R.M.L.I., returned from R.R. 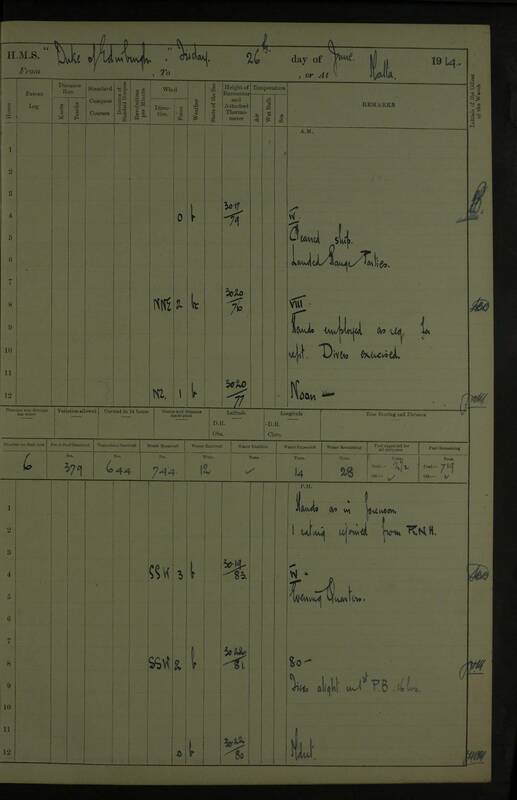 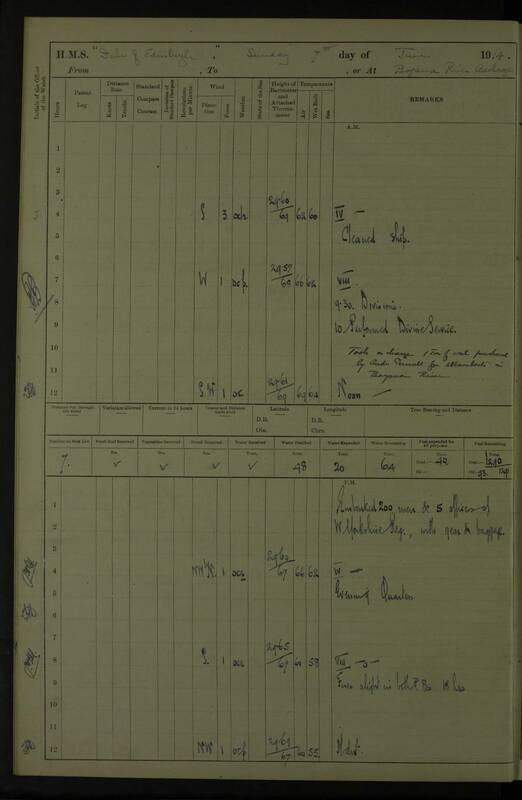 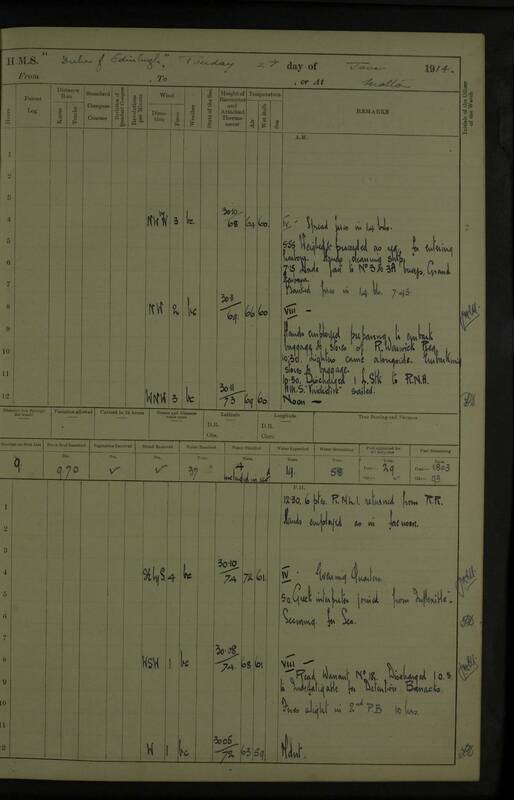 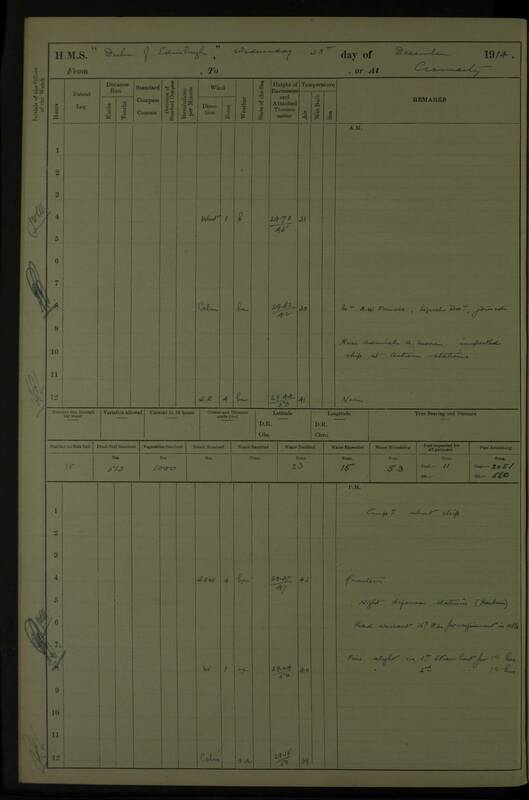 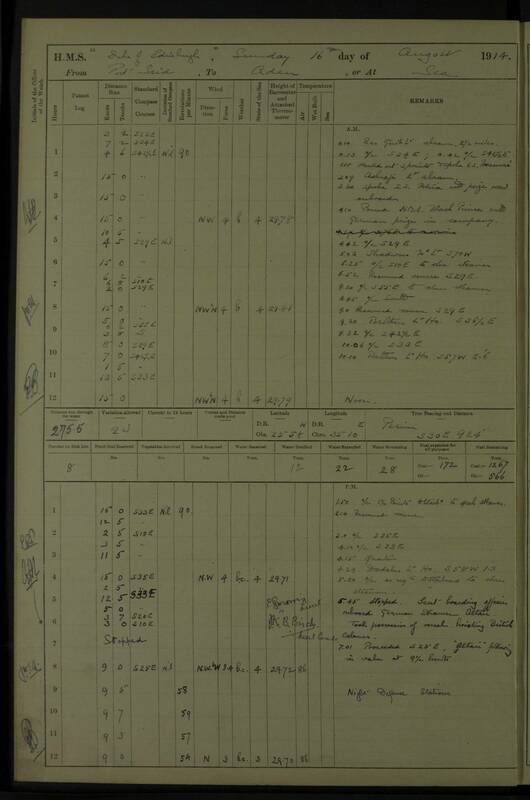 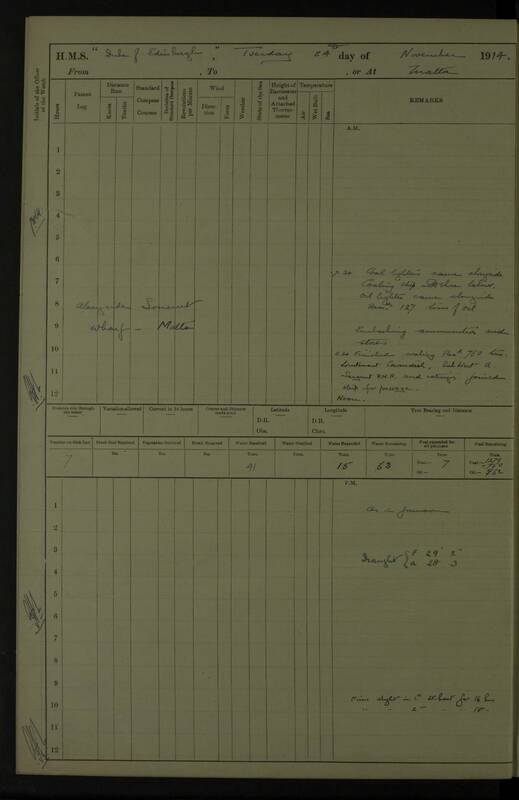 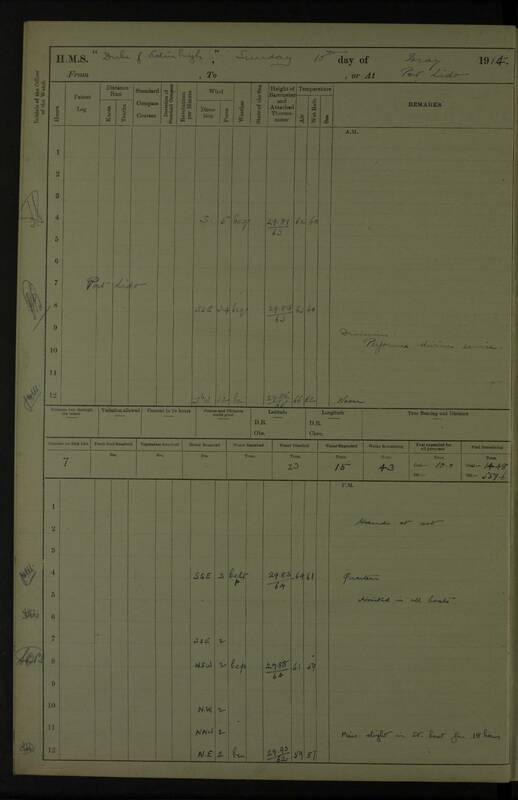 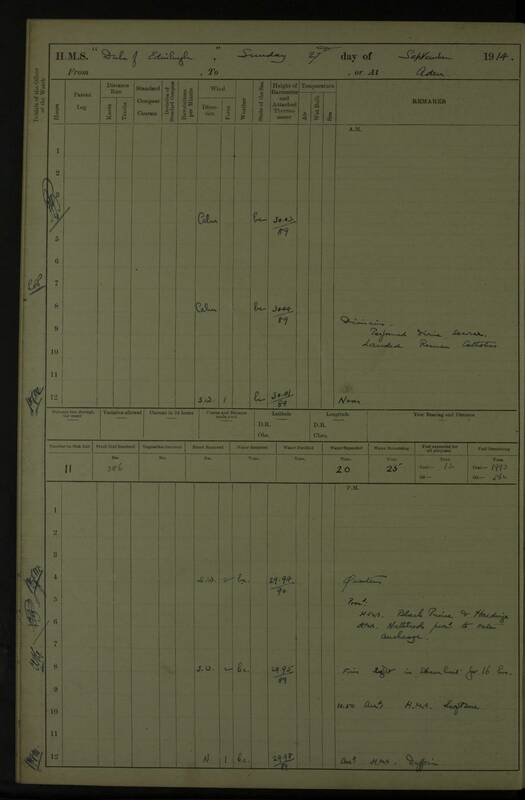 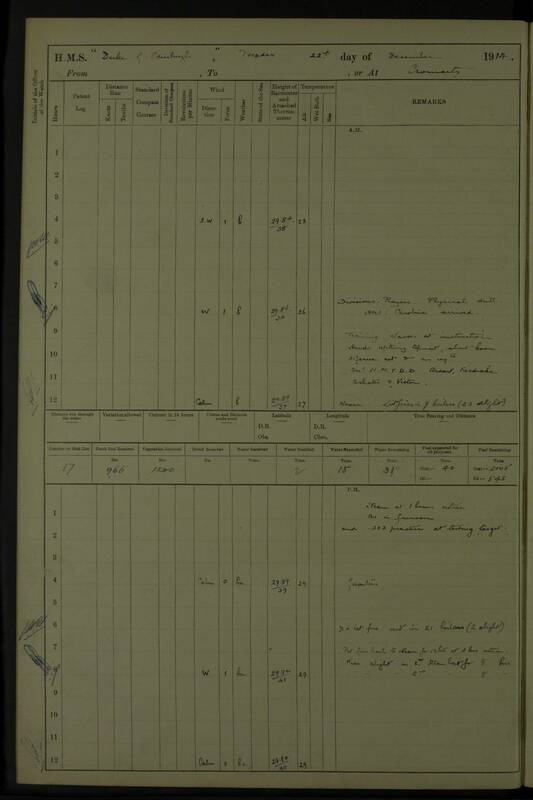 10.40 am: discharged one Stoker to R.N.H. 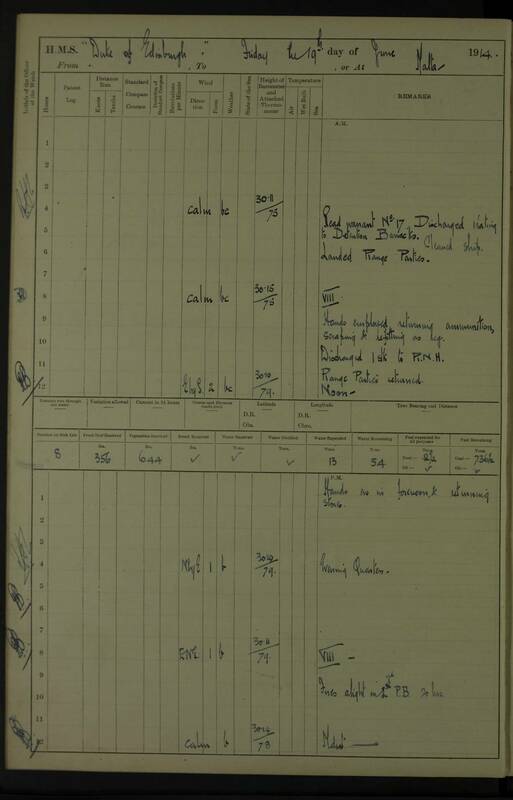 pm: 1 band sergeant joined from R.N.H. 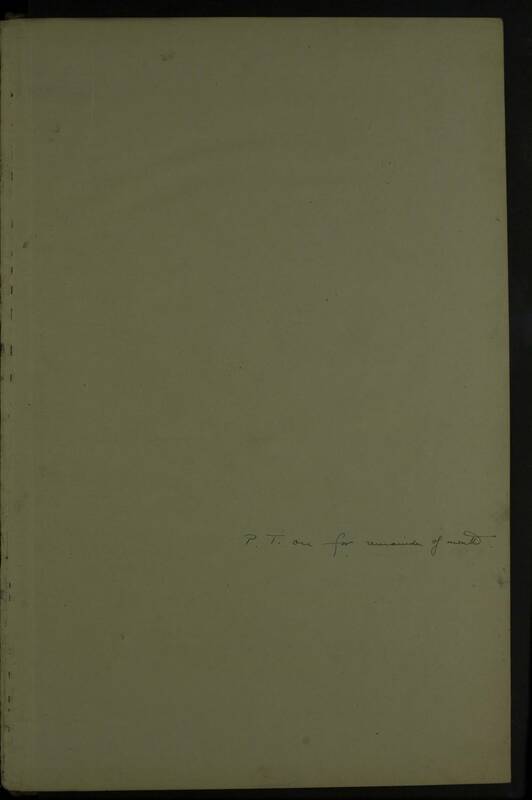 pm: 1 O.S. 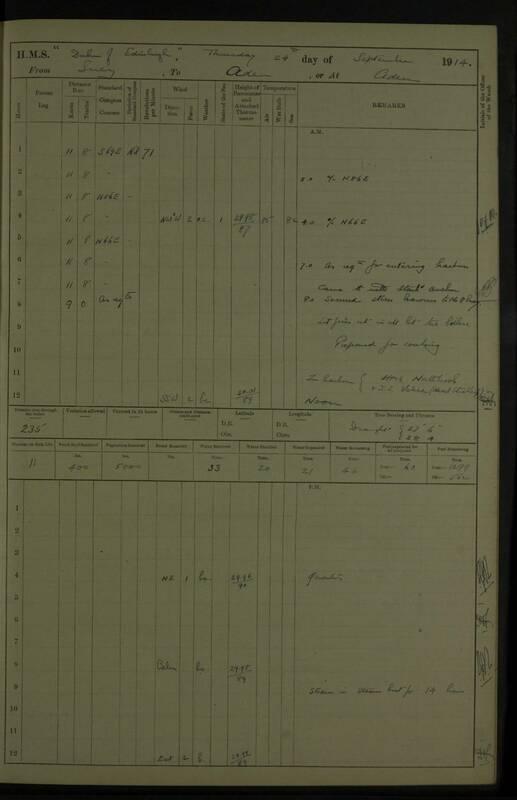 rejoined from R.N.H. 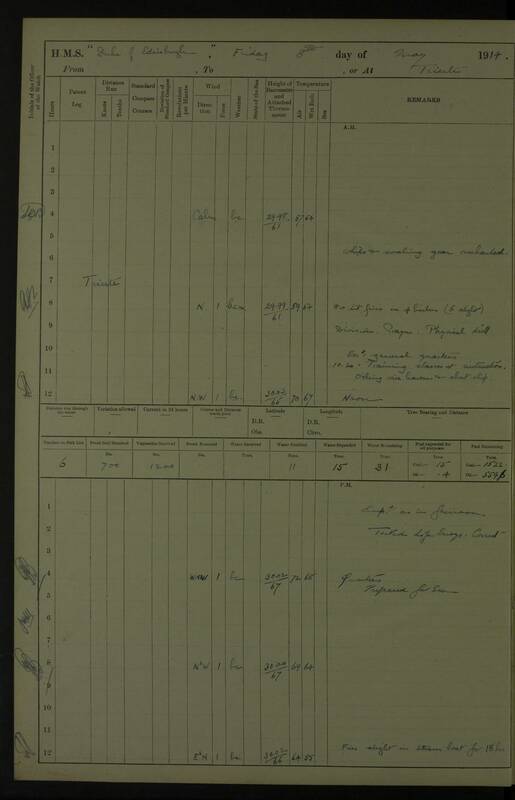 am: Discharged 1 Stoker to R.N.H. 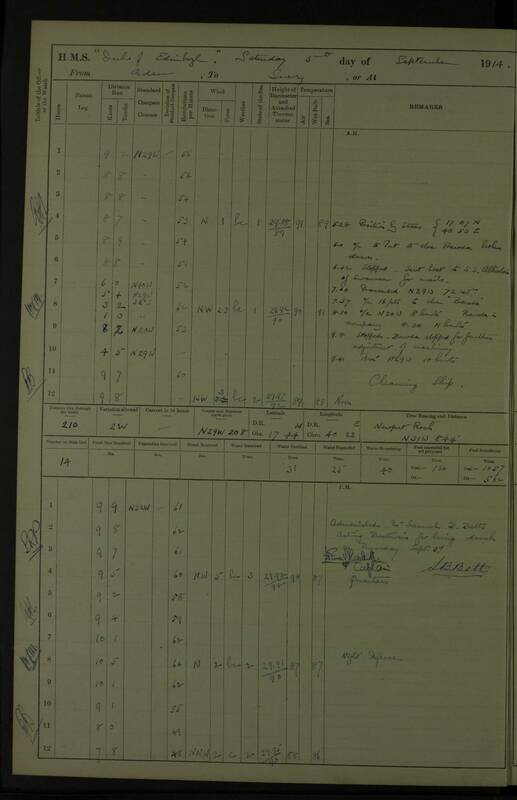 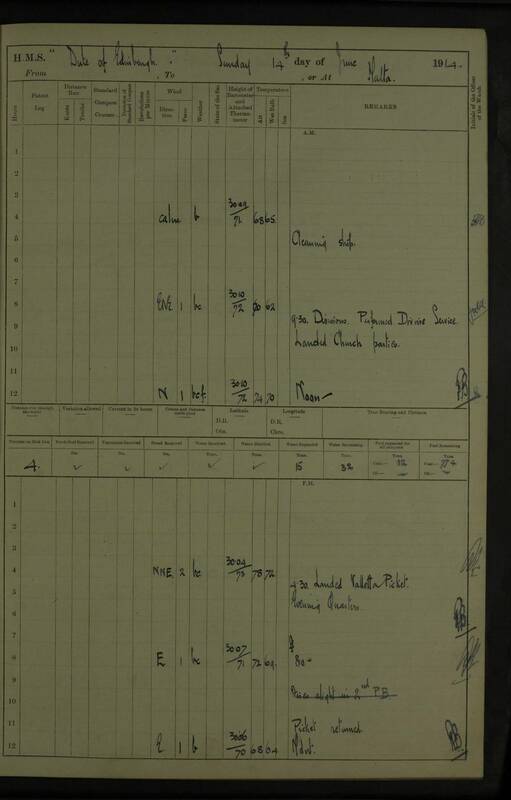 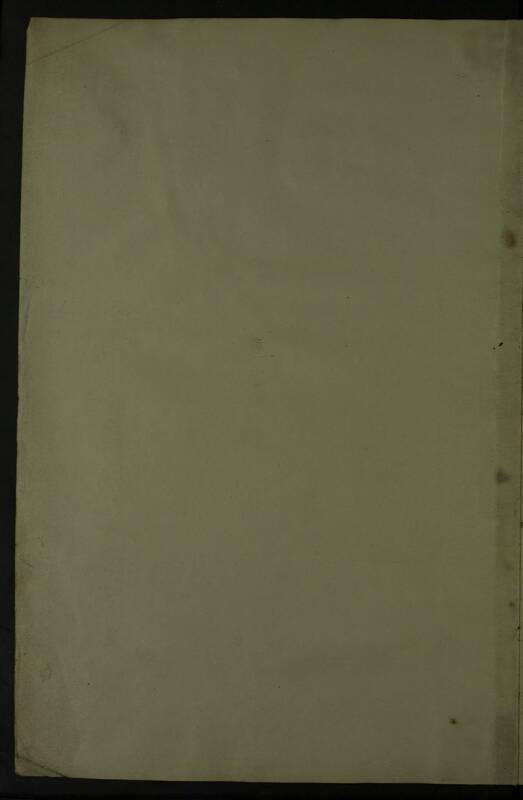 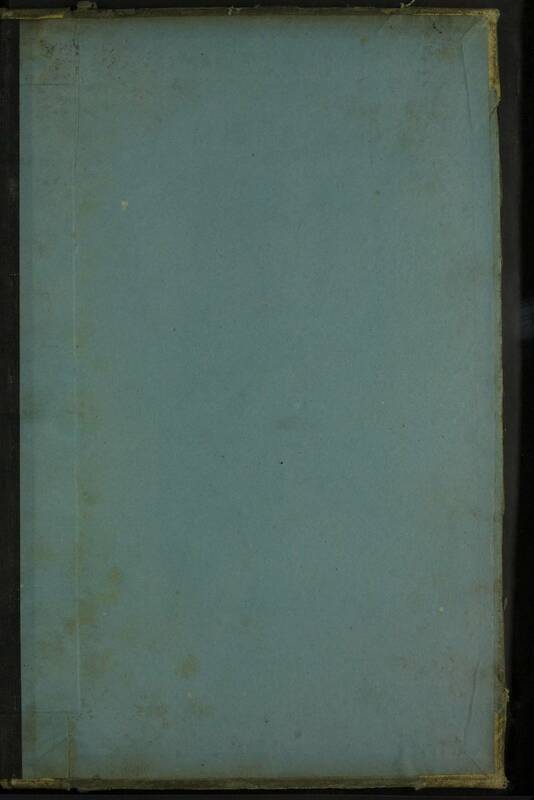 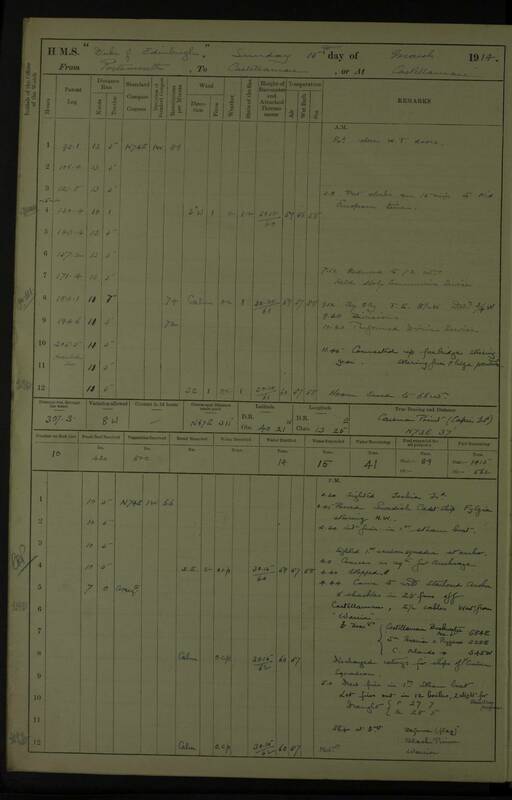 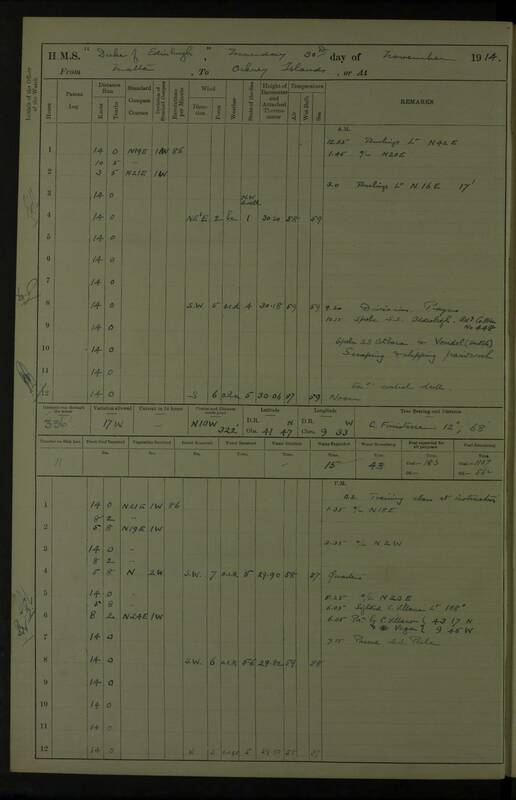 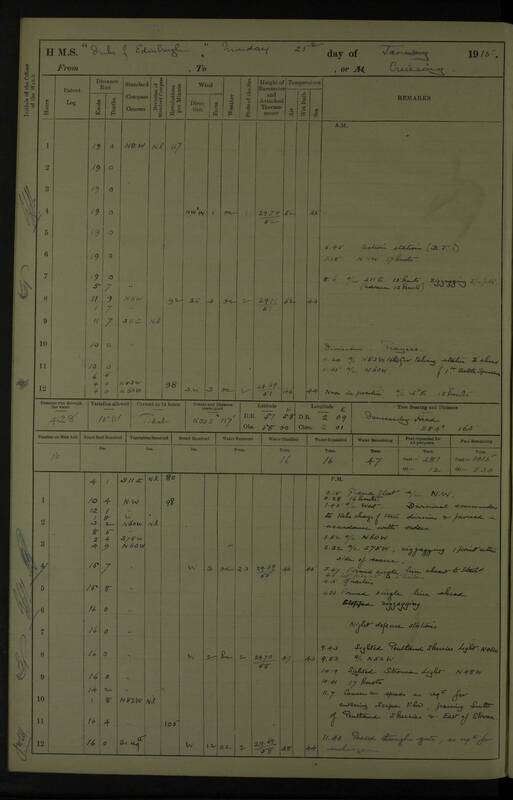 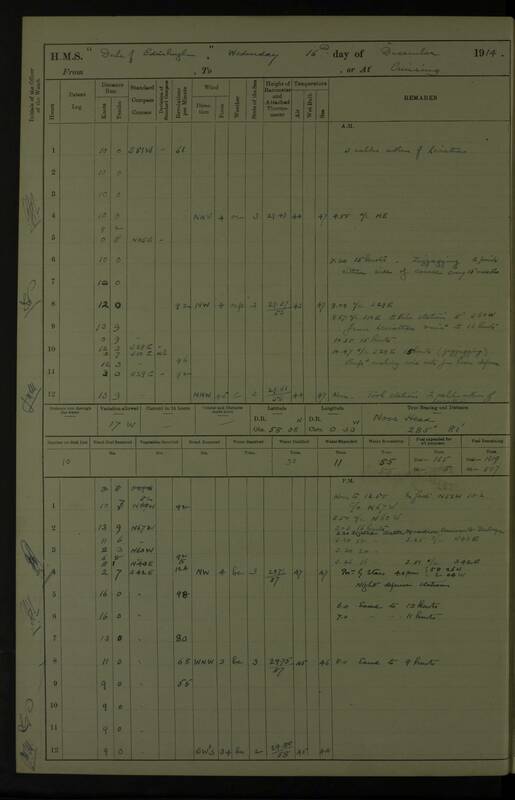 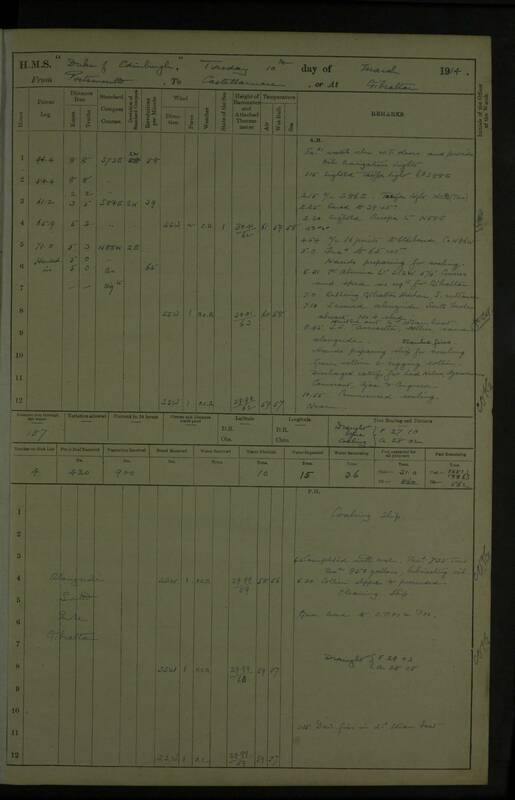 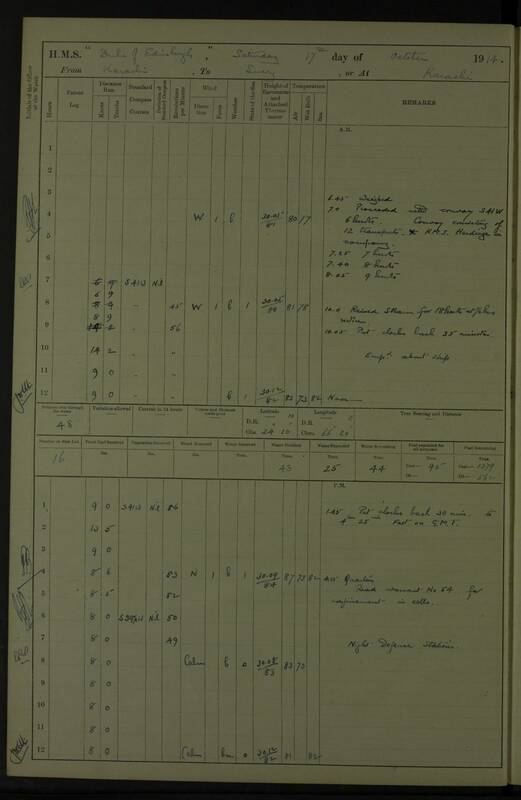 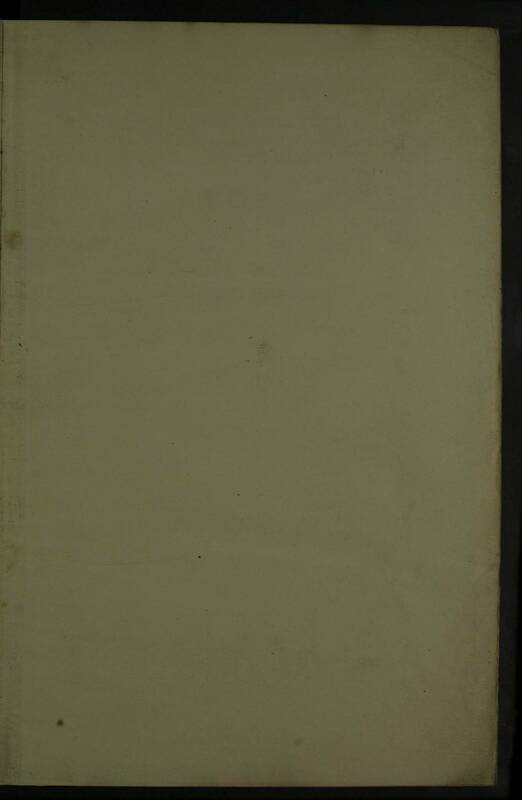 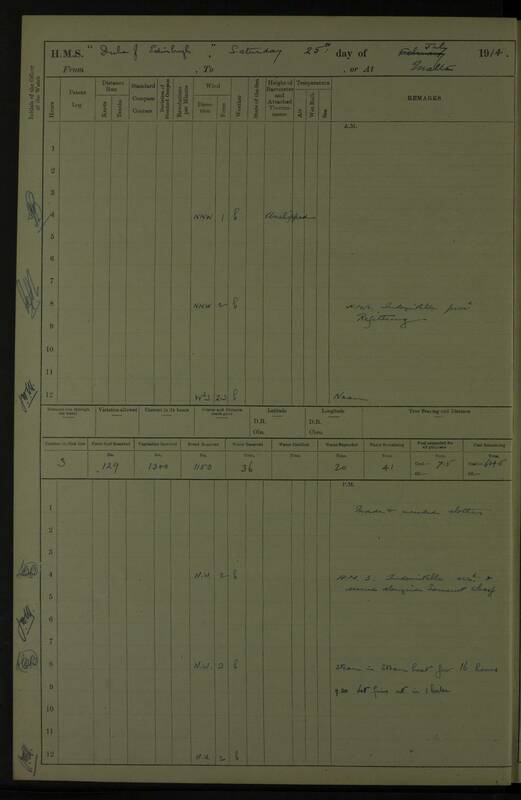 am: Discharged to SUTLEJ: 1 E.R.A., 1 Chief Stoker, 8 stokers, 3 Stoker POs, 1 Private, R.M.L.I. 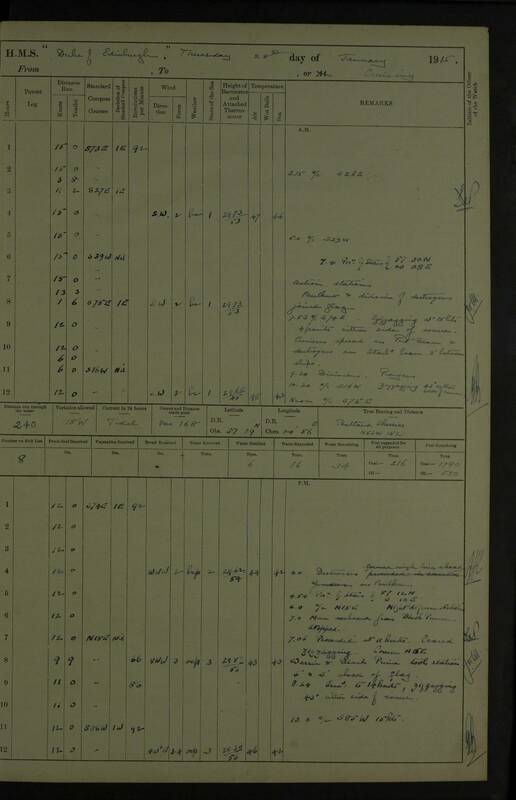 am: Joined from SUTLEJ: 2 E.R.A.s, 1 Chief Stoker, 2 Stoker P.O.s, 9 Stokers,1 leading Stoker, 10 boys, 2 Privates, R.M.L.I. 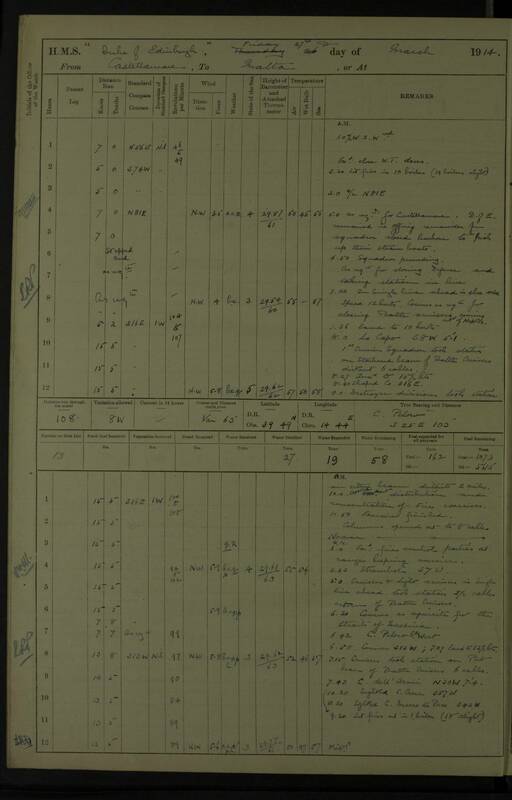 pm: 1 rating rejoined from R.N.H. 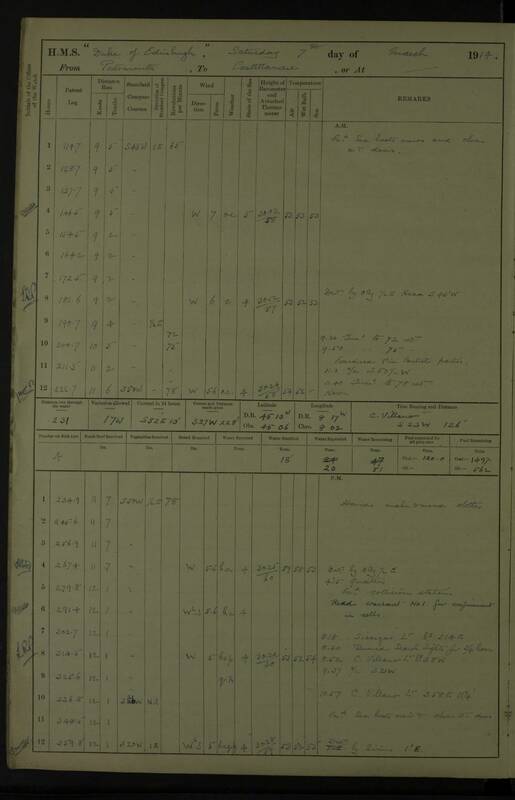 am: Discharged 1 C.E.R.A. 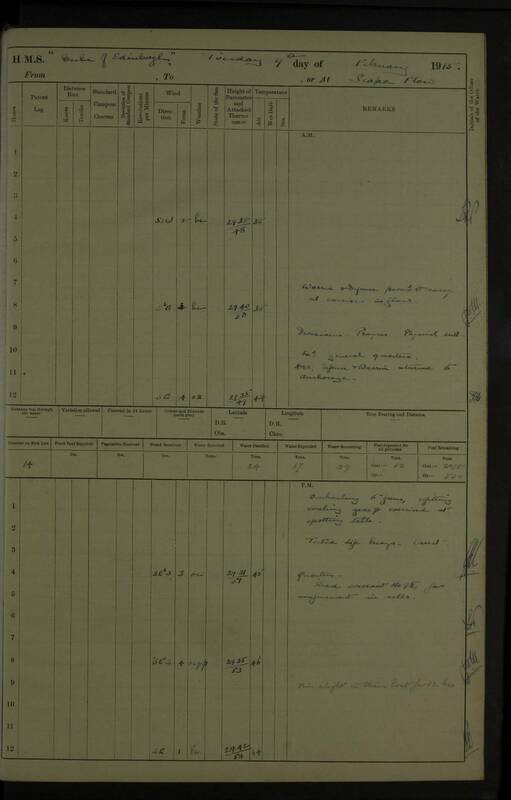 to R.N.H. 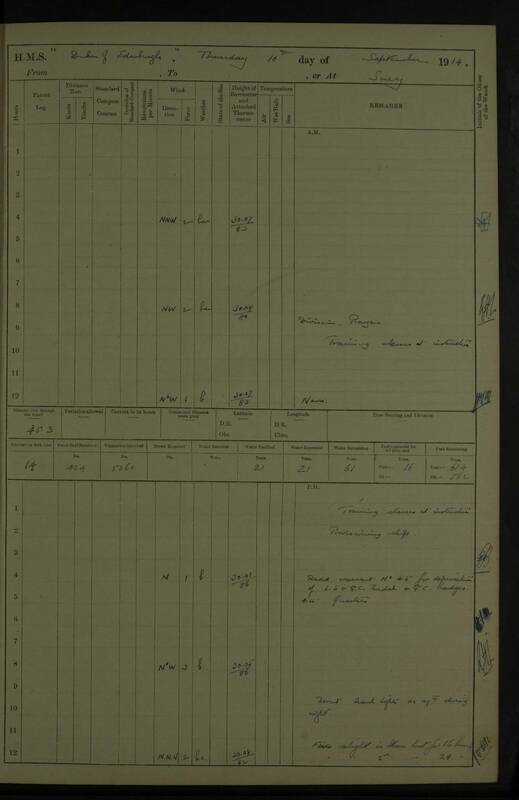 am: Preparing for war and assisting to rig Boom Defence. 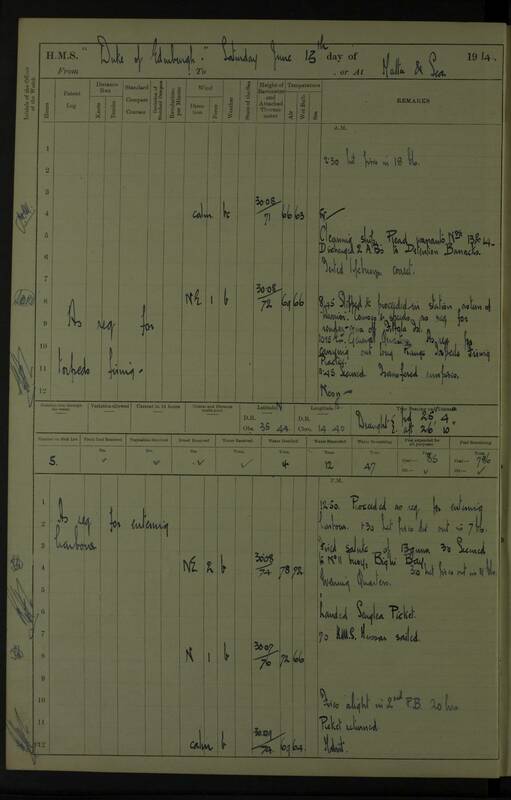 12.17 pm: Anchored at Makalla; Lieutenant Herbert Dowding, R.M., and interpreter landed to obtain news. 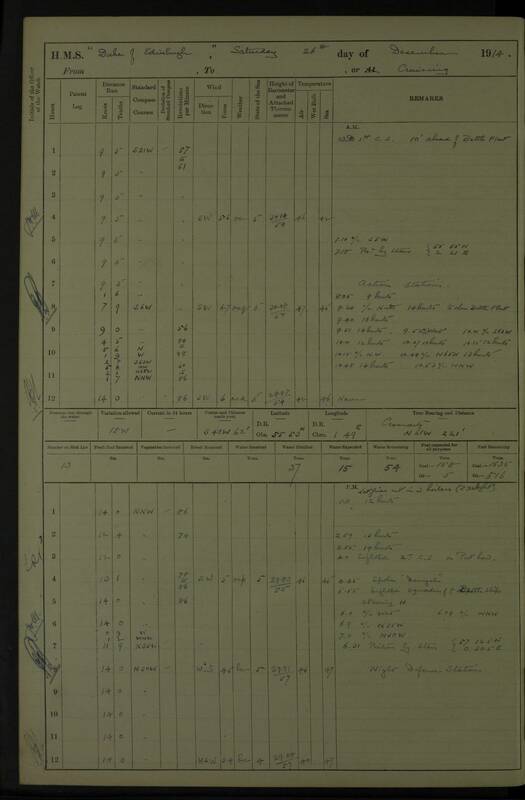 Note: This is probably Al Mukalla. 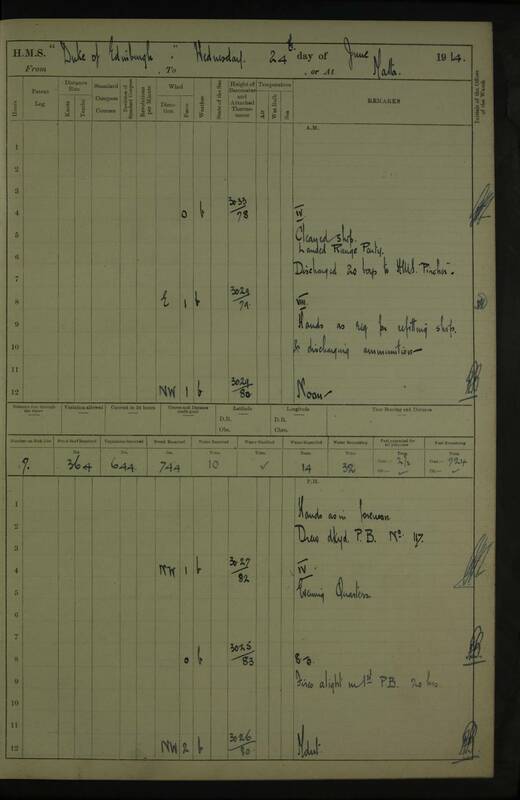 7.20 am: Closed SWIFTSURE; Took up position at rear of convoy. 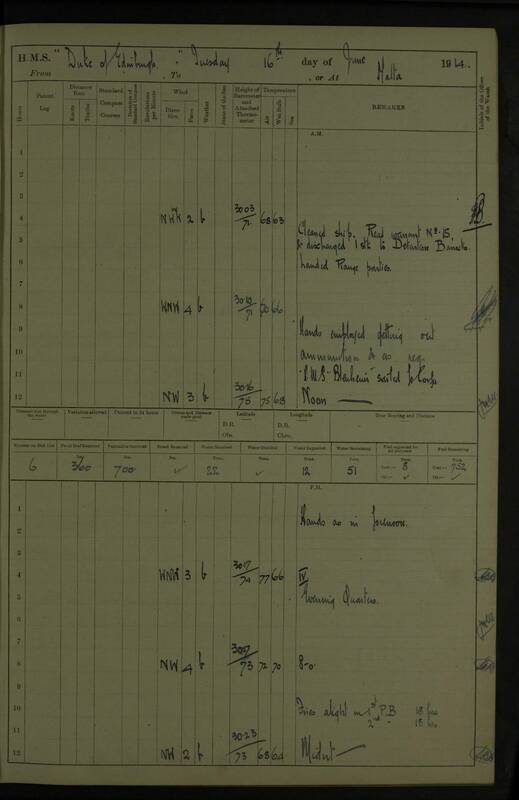 11.00 am: BLACK PRINCE took up position ahead of convoy. 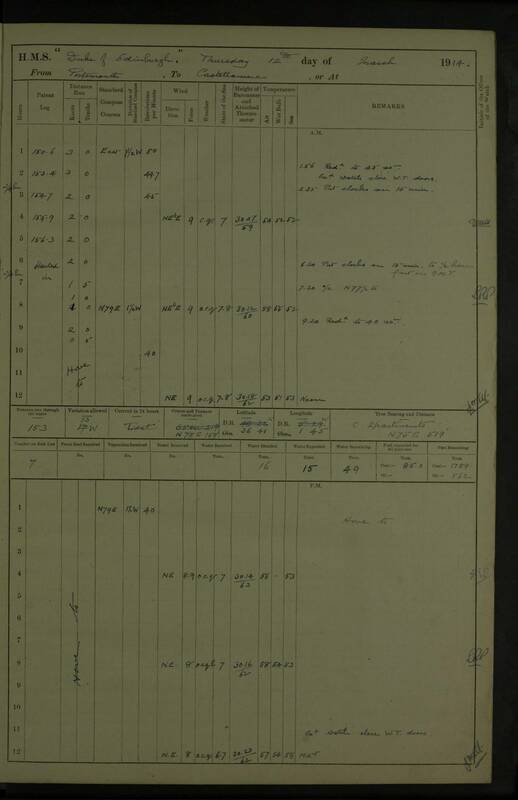 En route Aden to Suez. 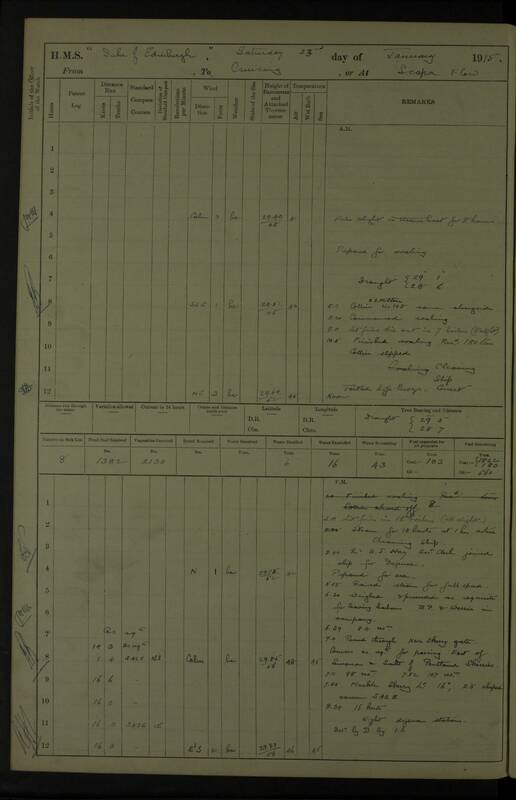 5.27 am: Closing NURANI (transport No 1); 6.59 am: sent cutter and supplied her with 3,000lbs of potatoes. 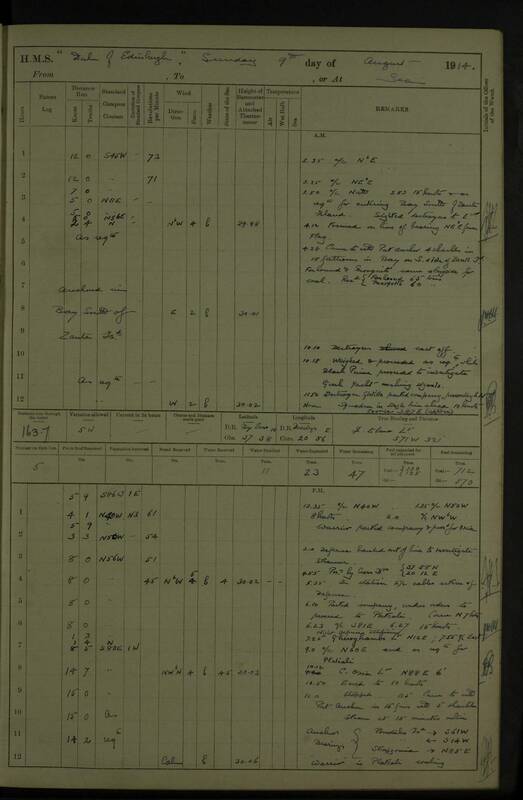 6.00 am: Closed BARODA broken down. 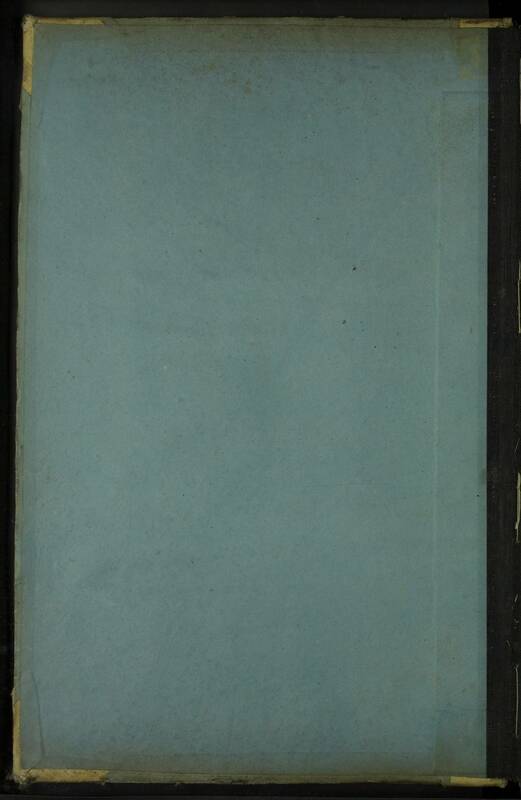 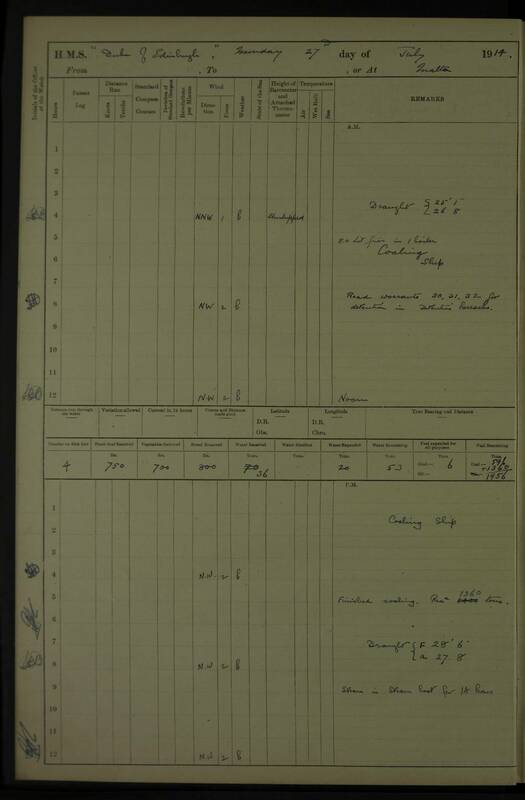 6.42 an: Sent boat to S.S. ALLISTER of Swansea for mails. 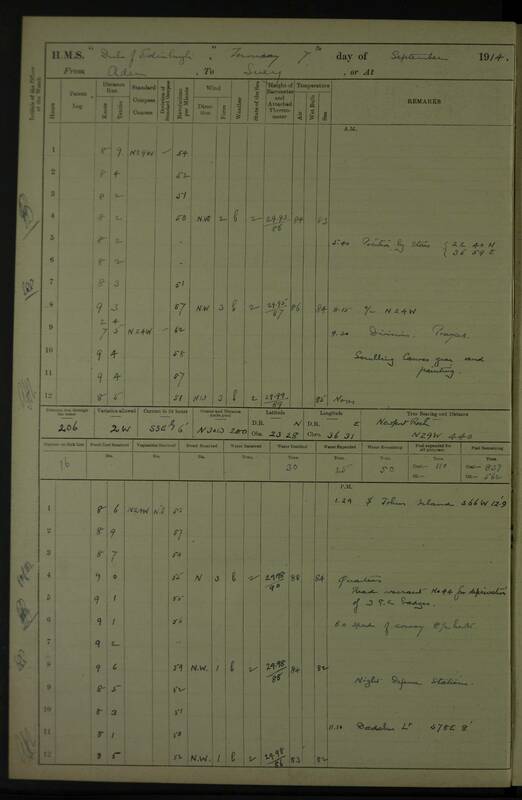 9.18 am: Proceeded BARODA stopped for further adjustment of machinery. 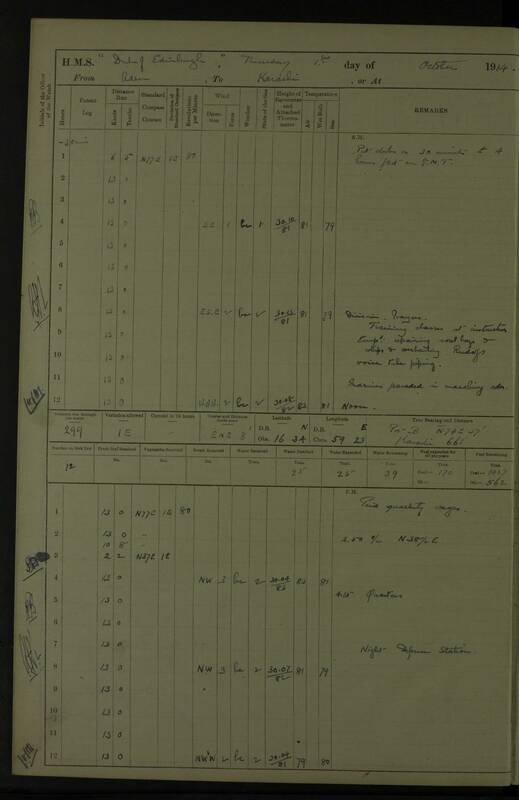 Note: Longitude is incorrectly shown as 4º 53’E, which is in western Africa. 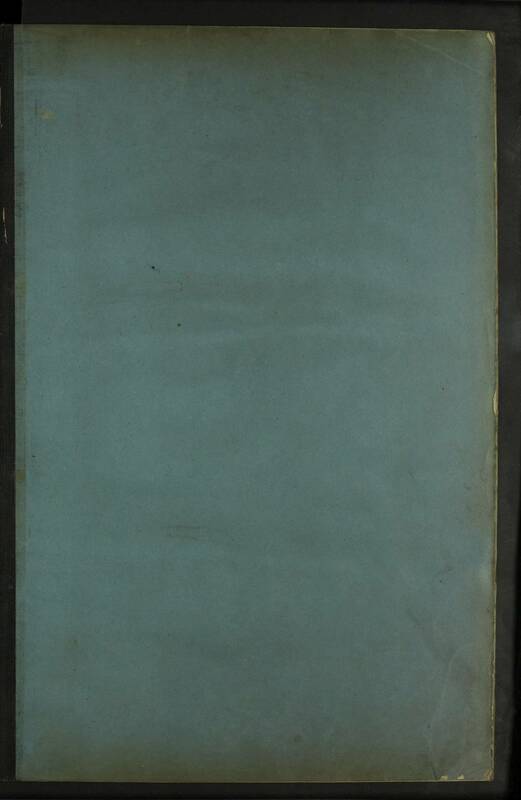 45.9ºE is an estimate. 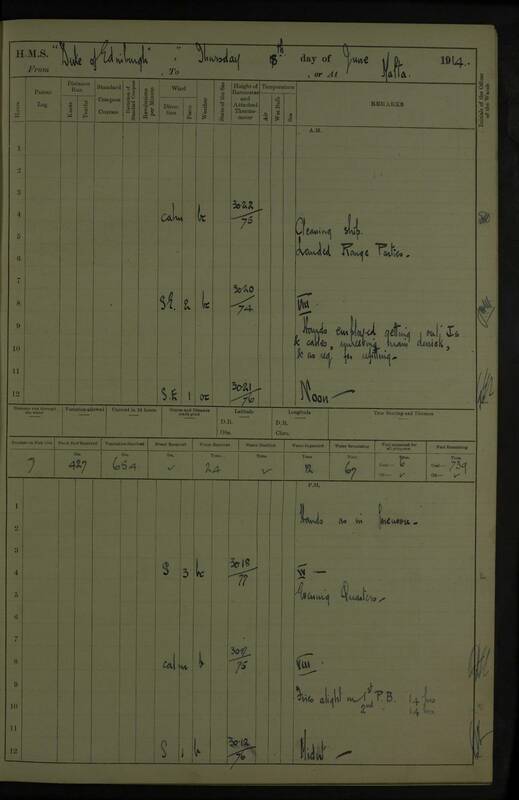 pm: Occasional firing from ship to cover troops as necessary. 4.10 pm: DUKE OF EDINBURGH shifted billet to off entrance Sheikh Syed lagoon. 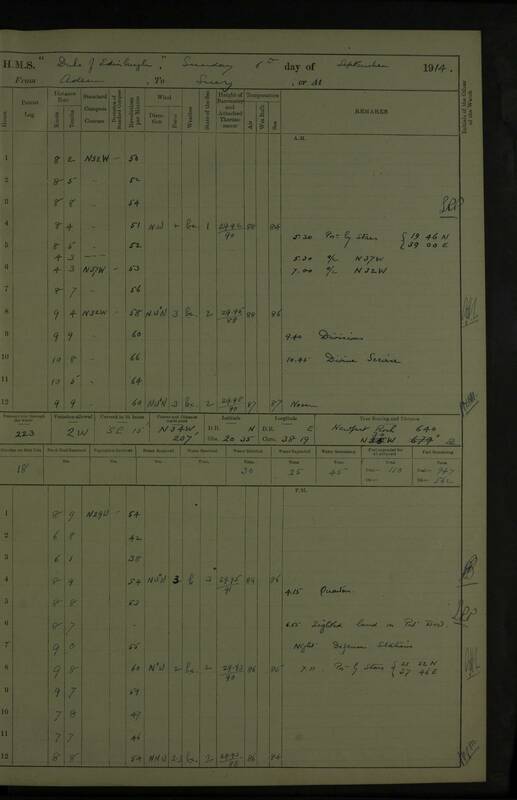 Anchored in 7 fathoms to cover line of enemy's retreat across lagoon mouth. 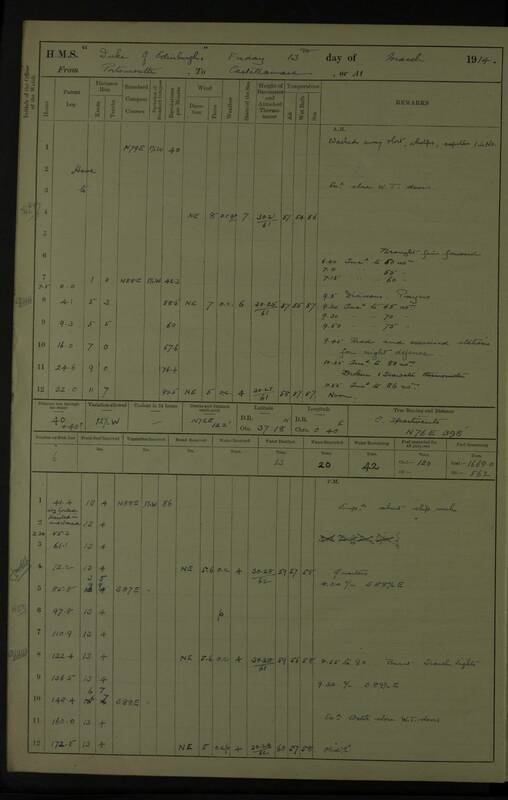 2.30 pm: Off Ismailia, changed pilots; at Ismailia: H.M. Torpedo Boats 043, 064. 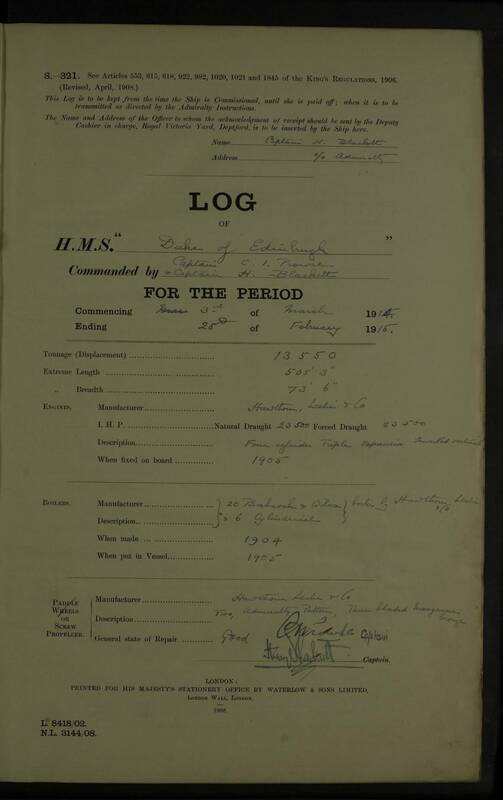 No position in log. 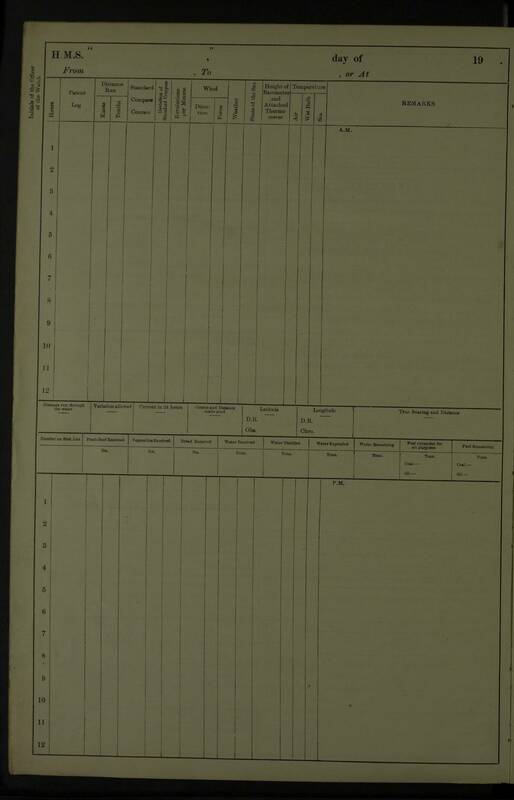 Position above is very approximate and is based on courses and speeds on 30 November and 1 December. 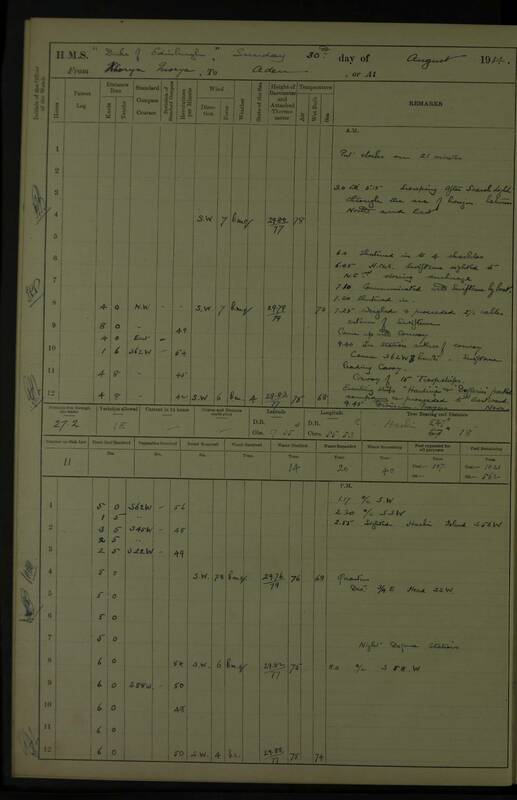 pm: Washed overboard from 1 cutter, compass boats liquid Patt 20, 1 in No. 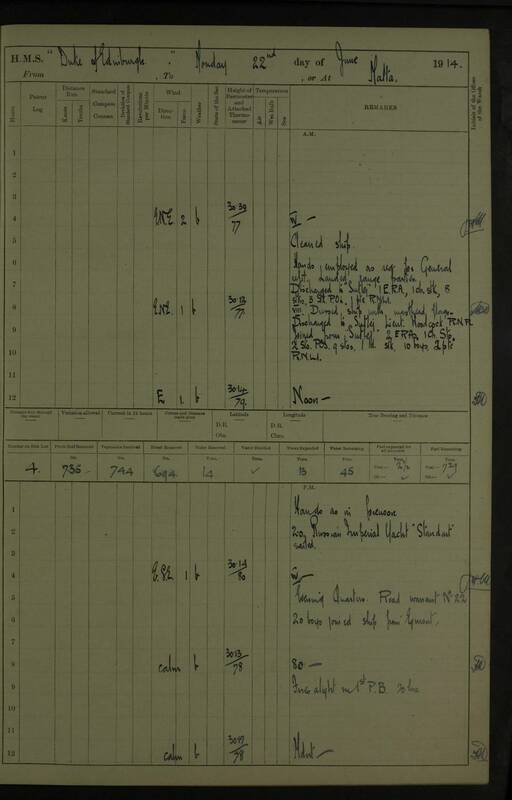 3.00 pm: zigzagging 3 points either side of course. 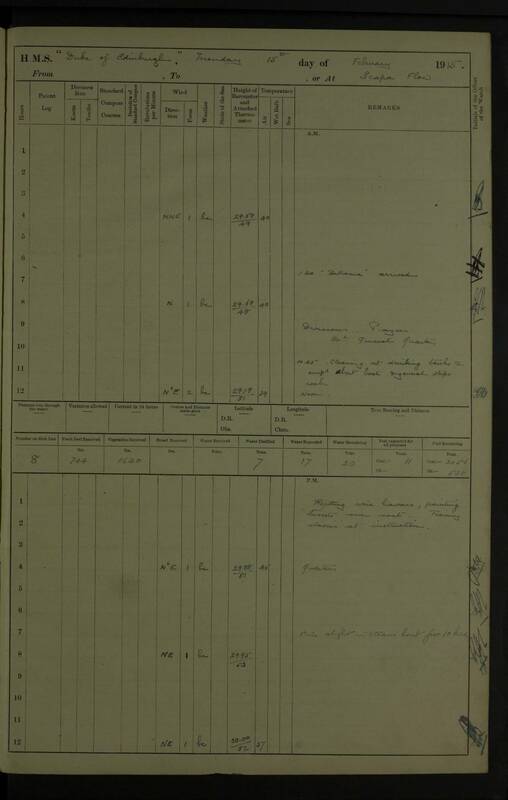 pm: DREADNOUGHT proceeded to enter dock. 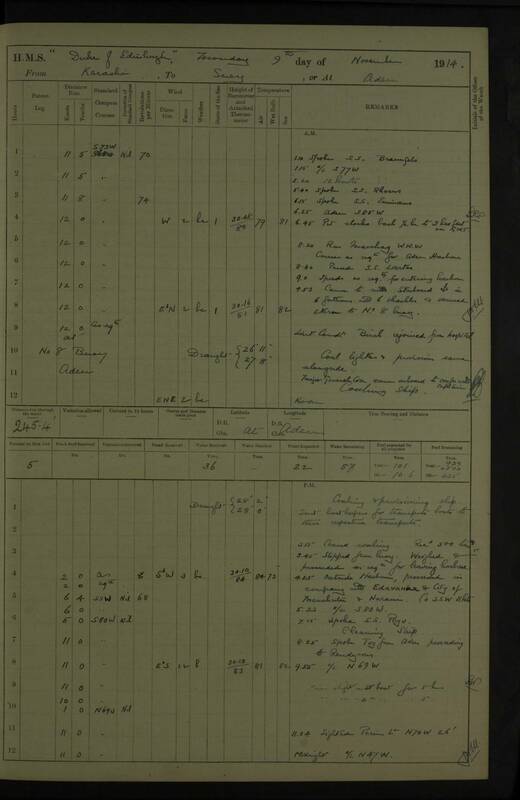 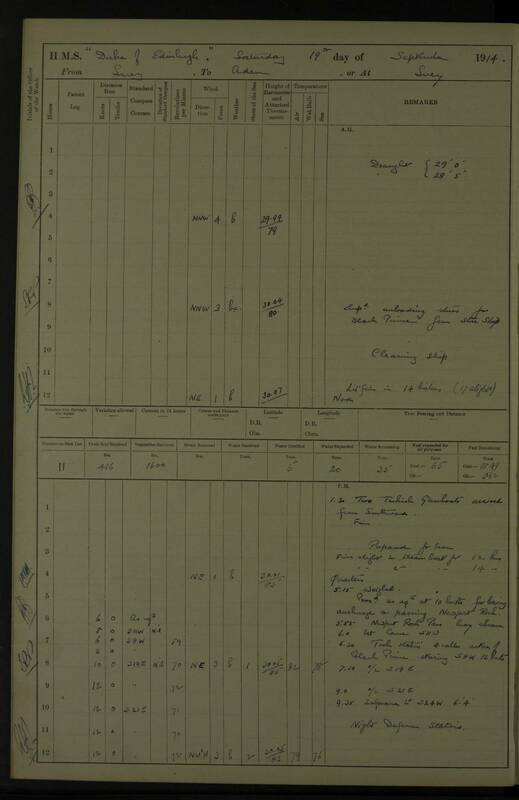 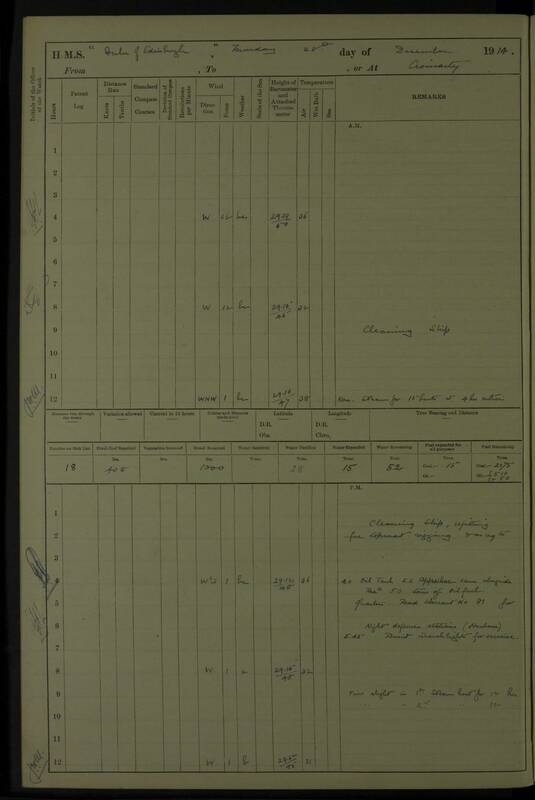 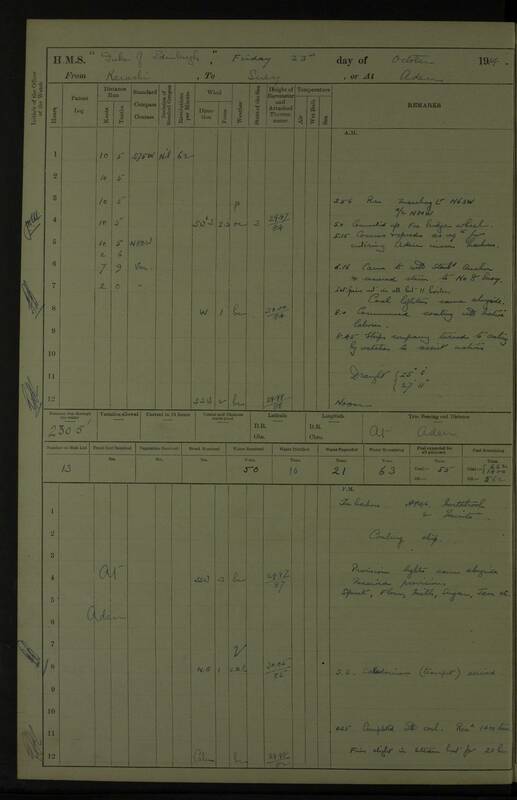 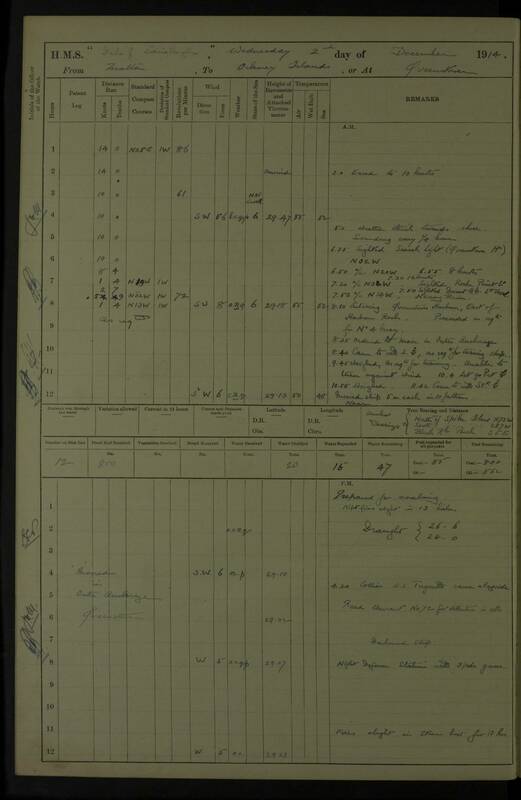 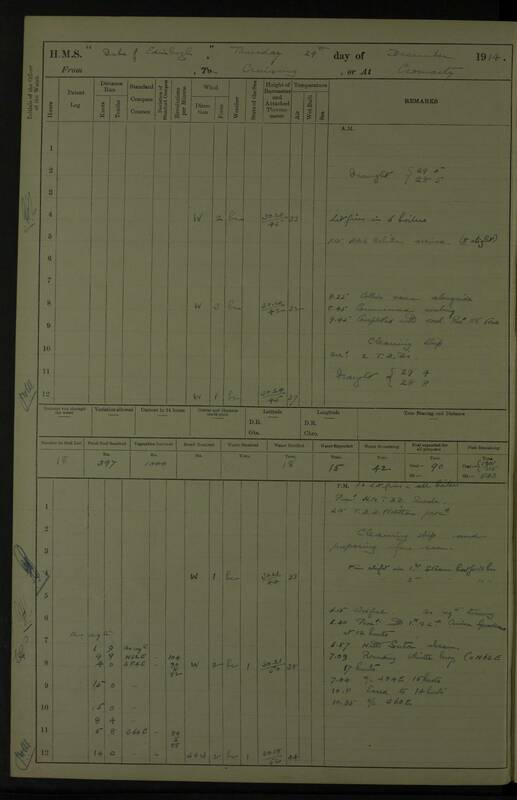 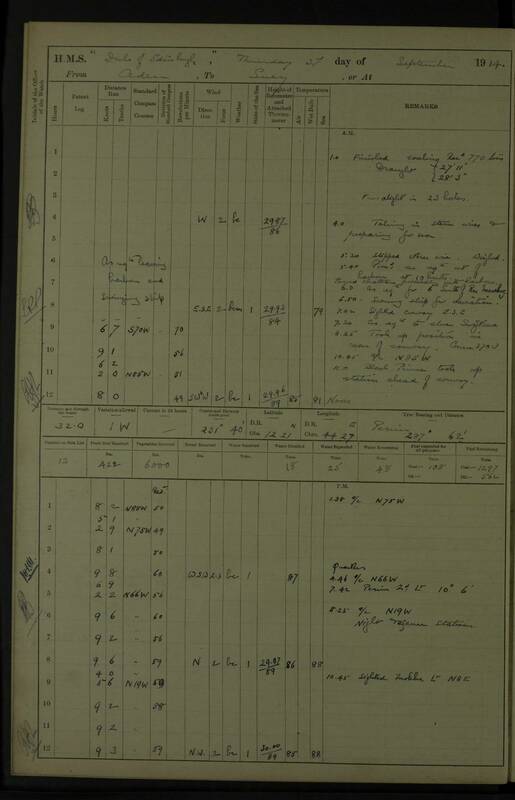 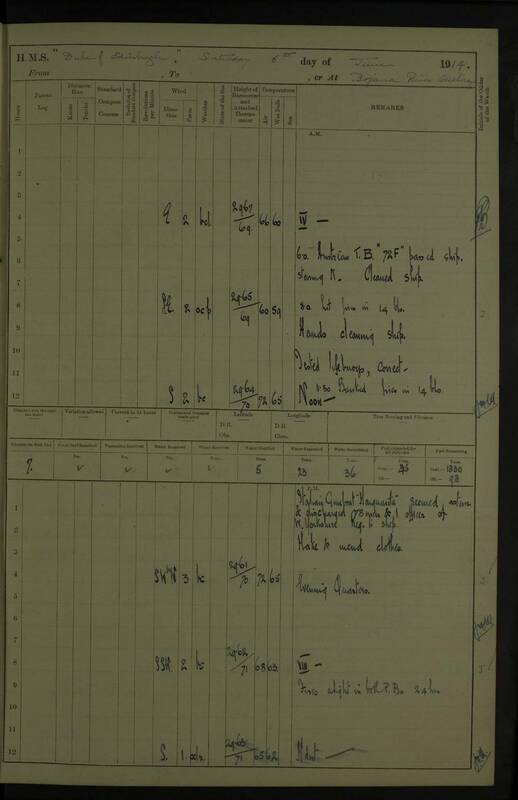 This is identical to the scan for 17 January 1915 above. 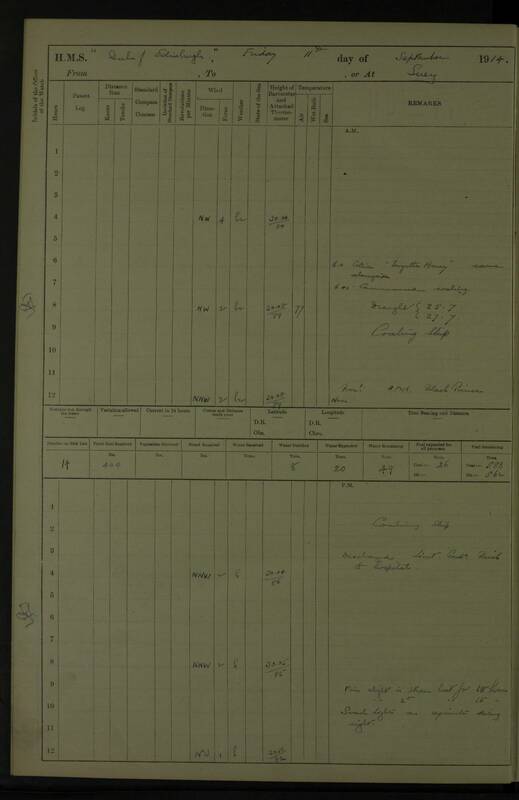 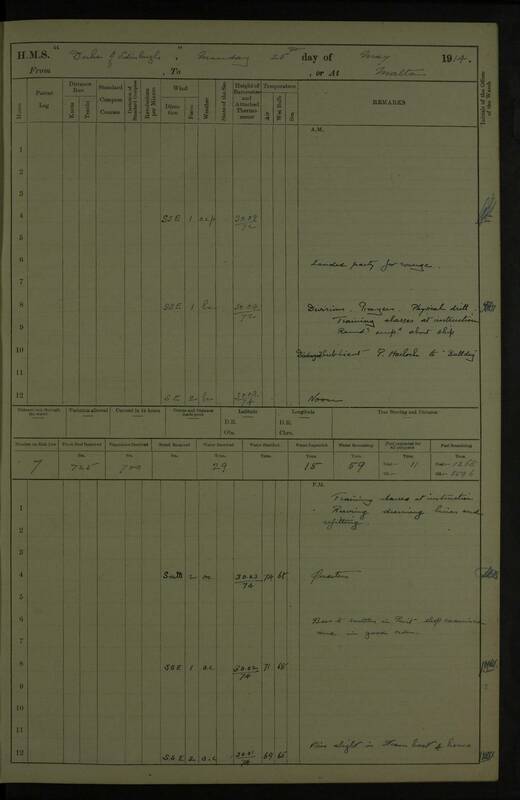 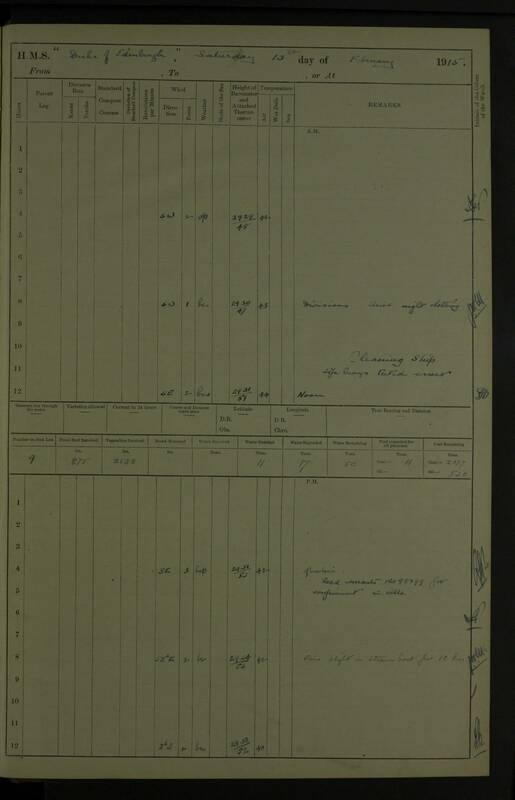 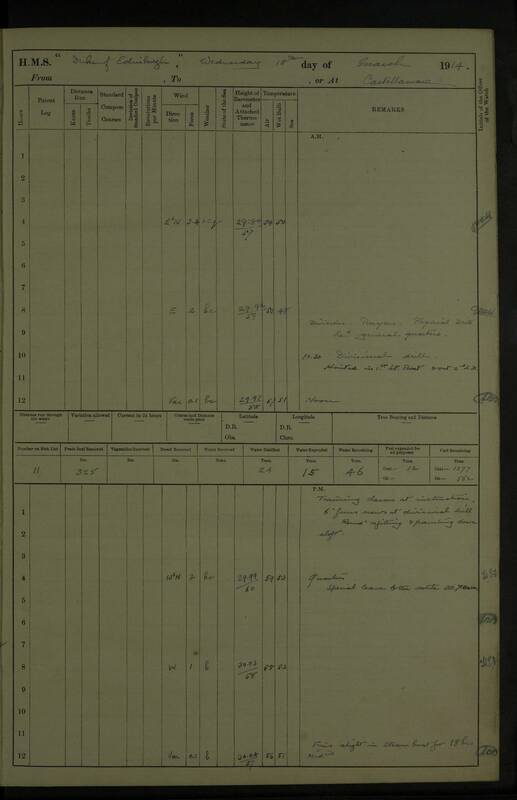 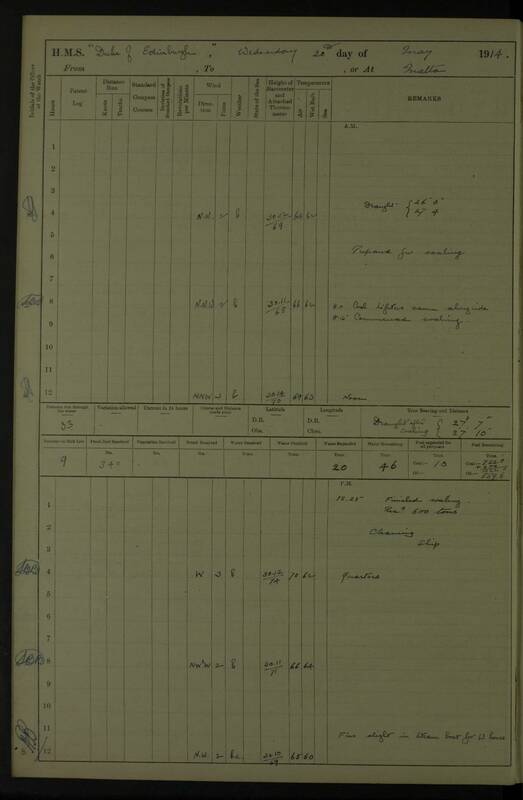 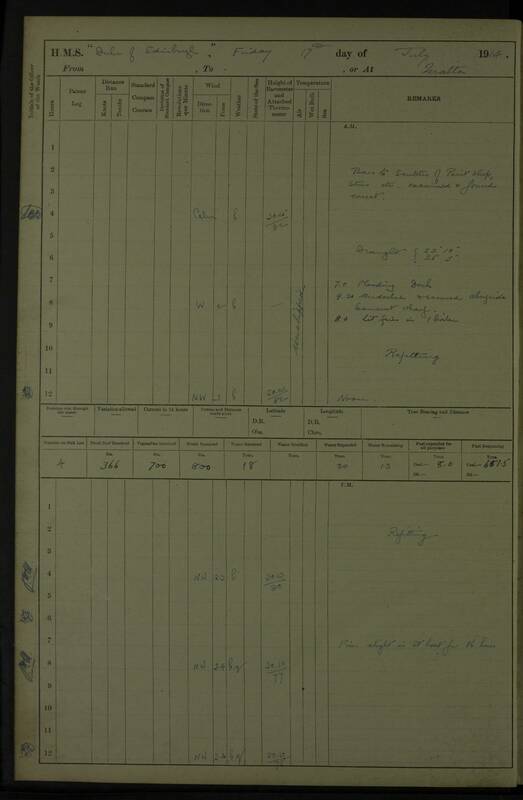 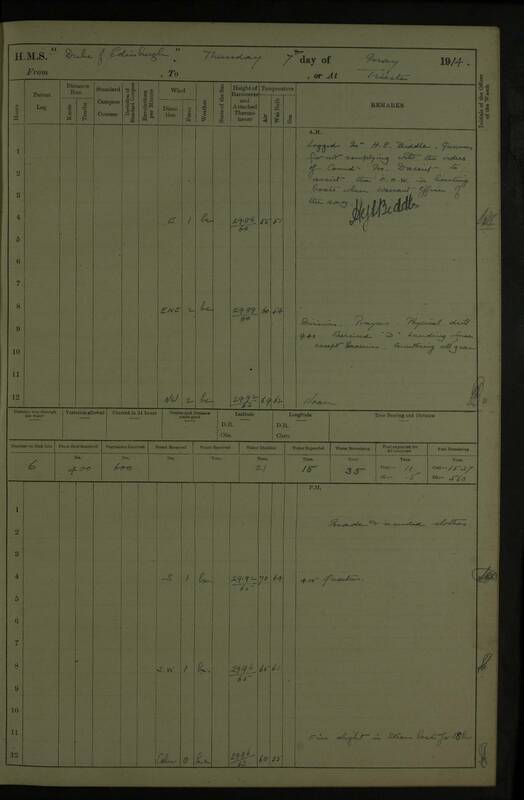 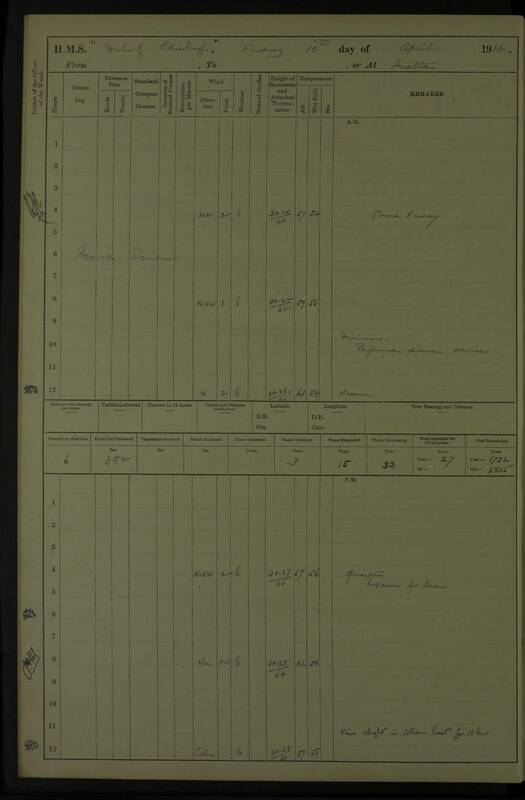 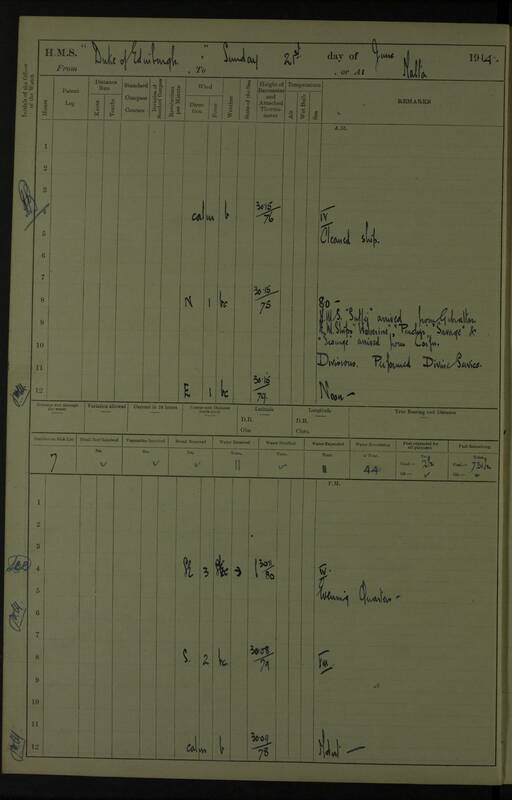 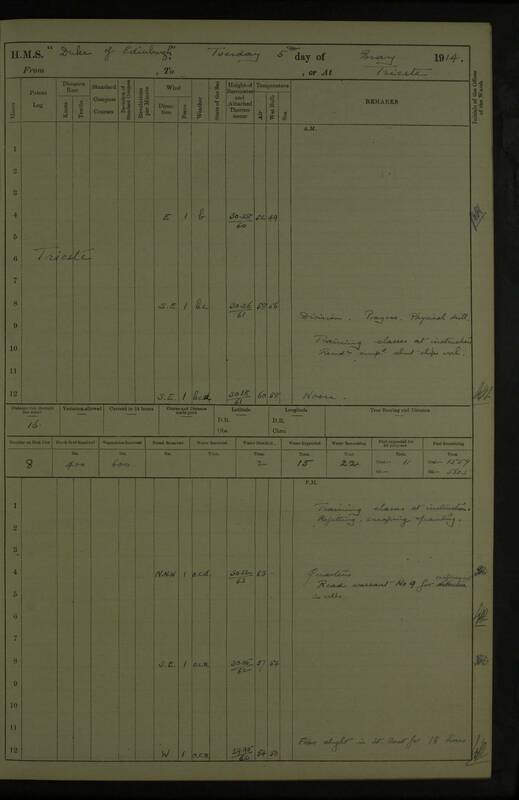 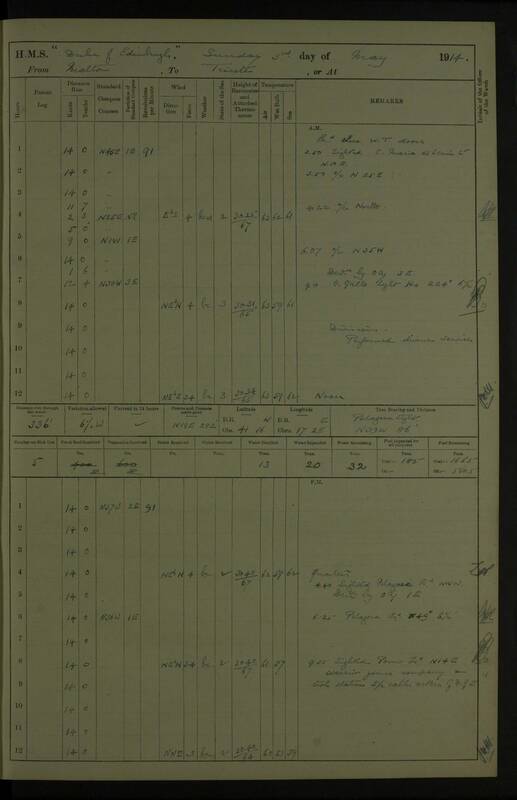 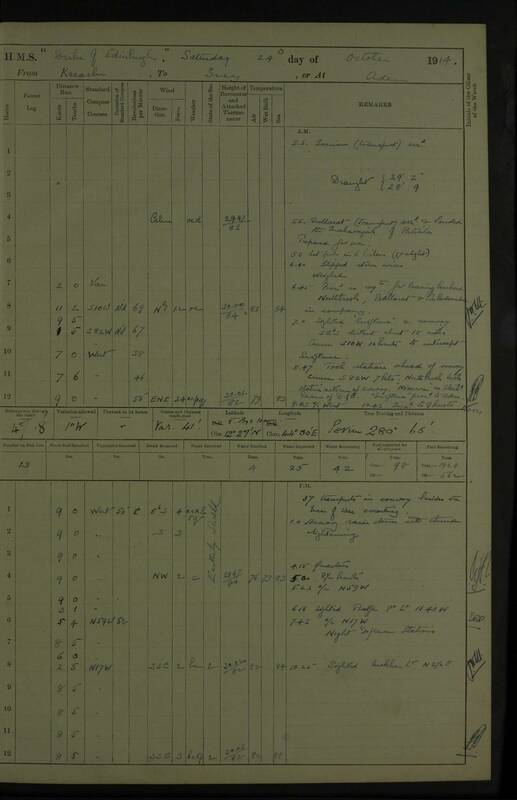 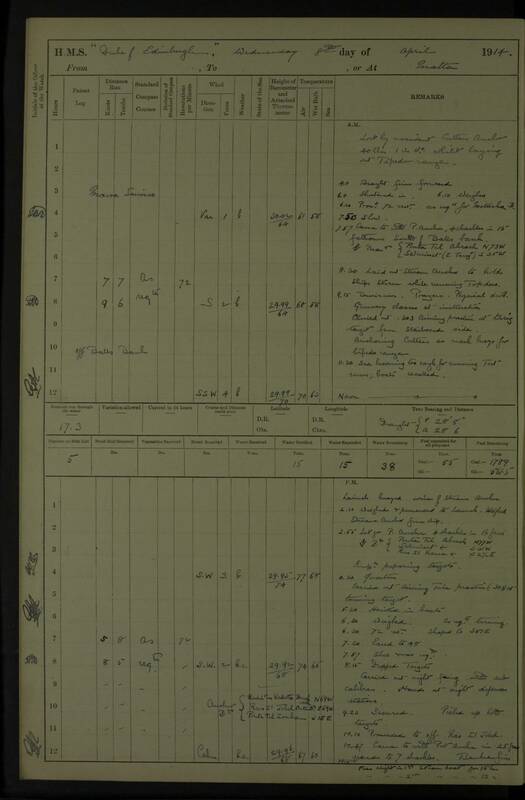 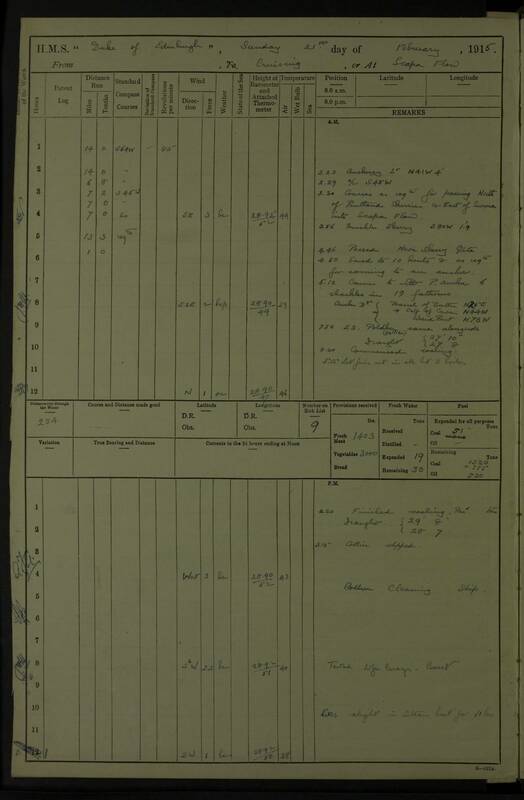 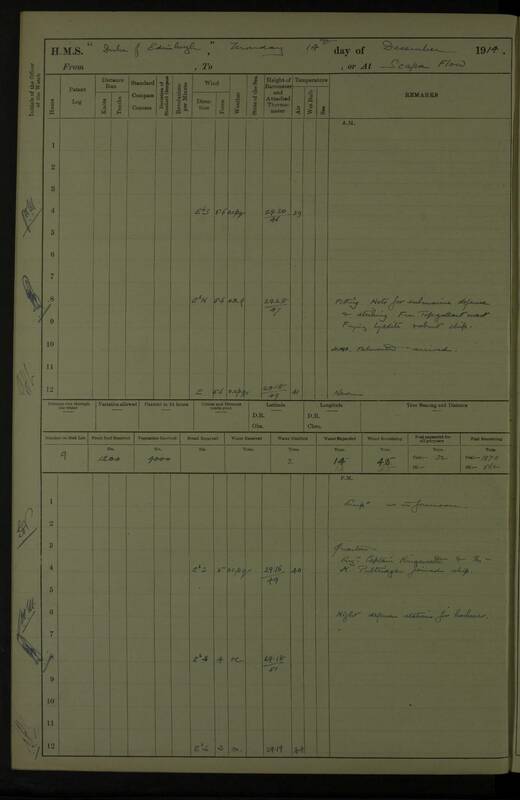 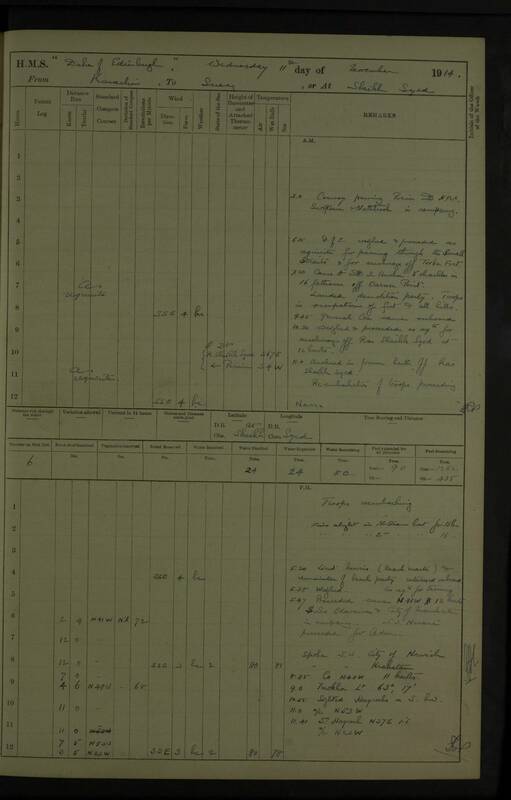 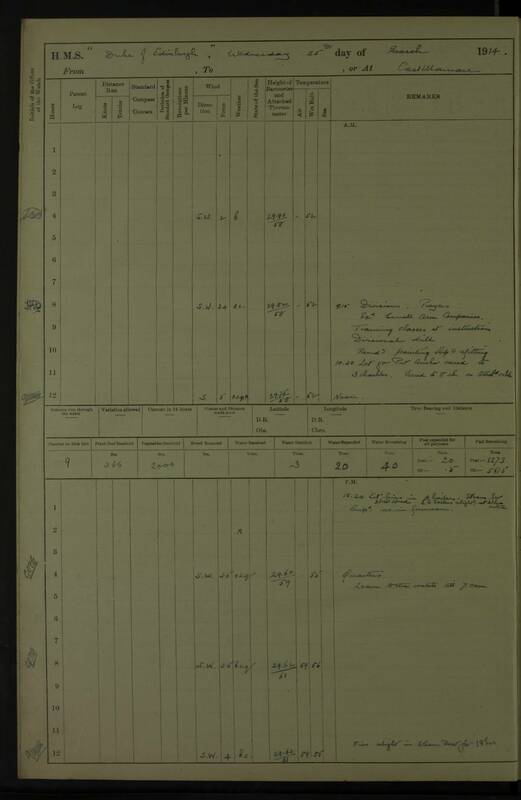 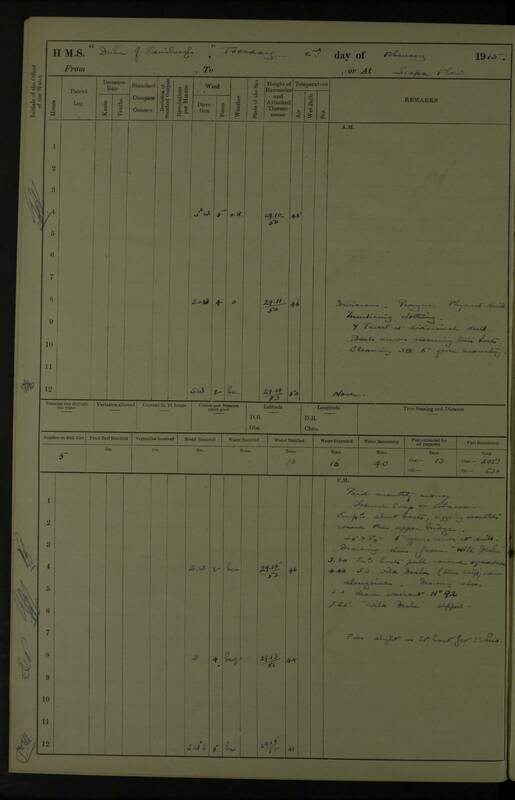 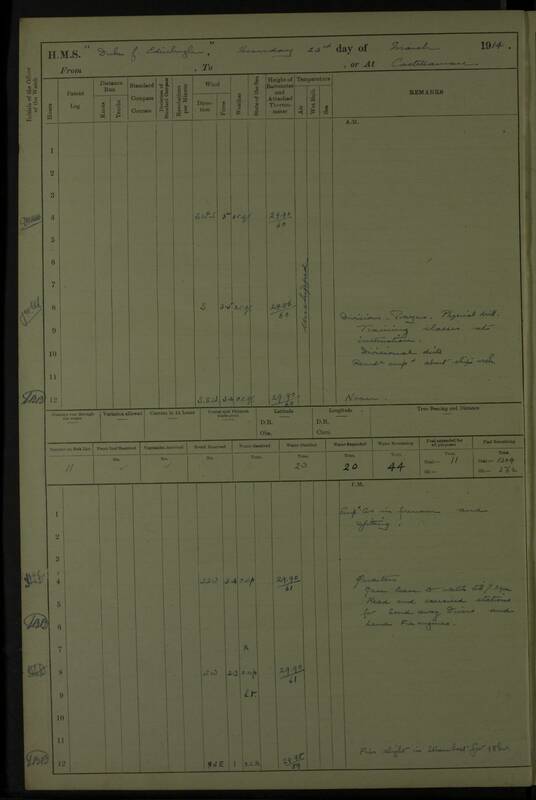 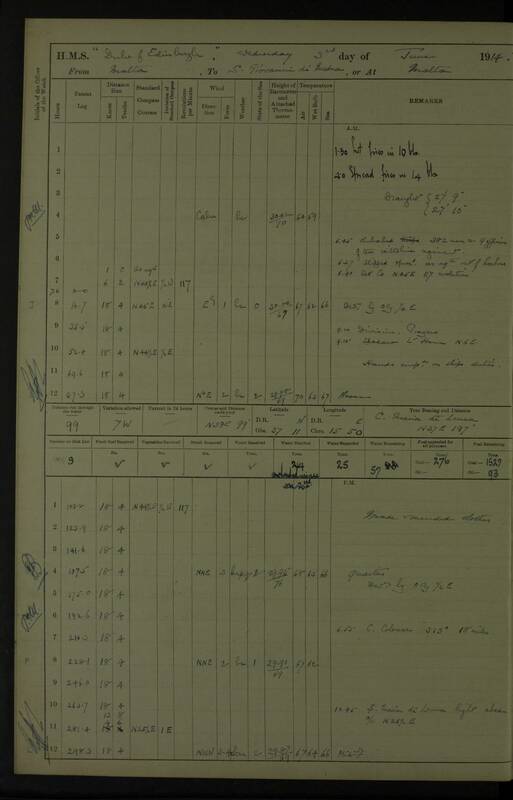 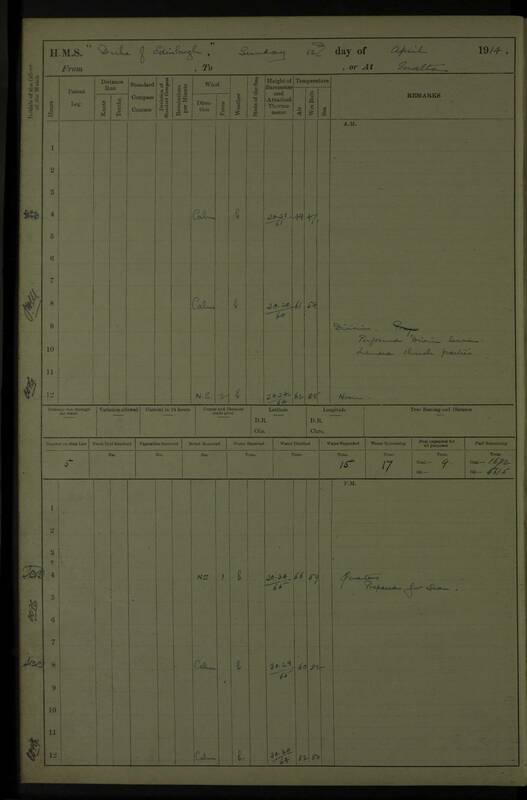 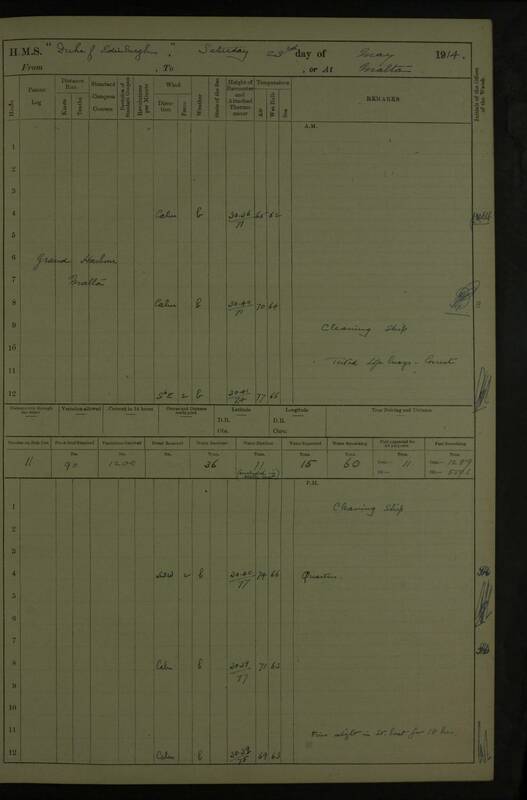 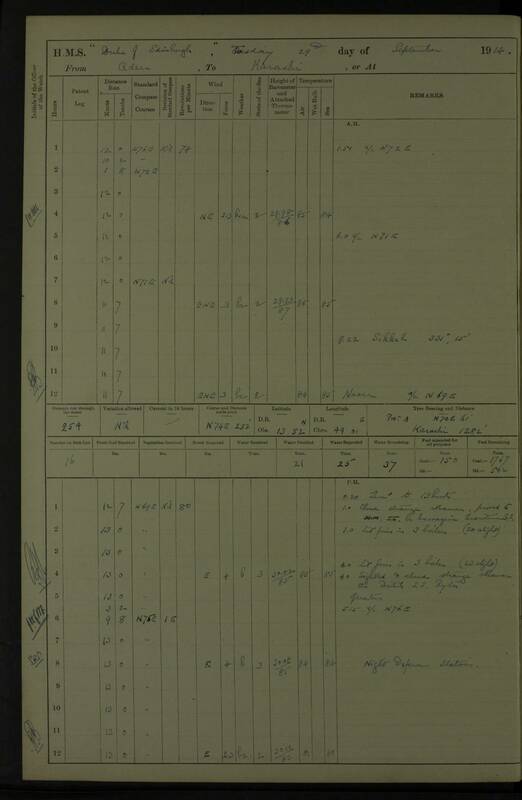 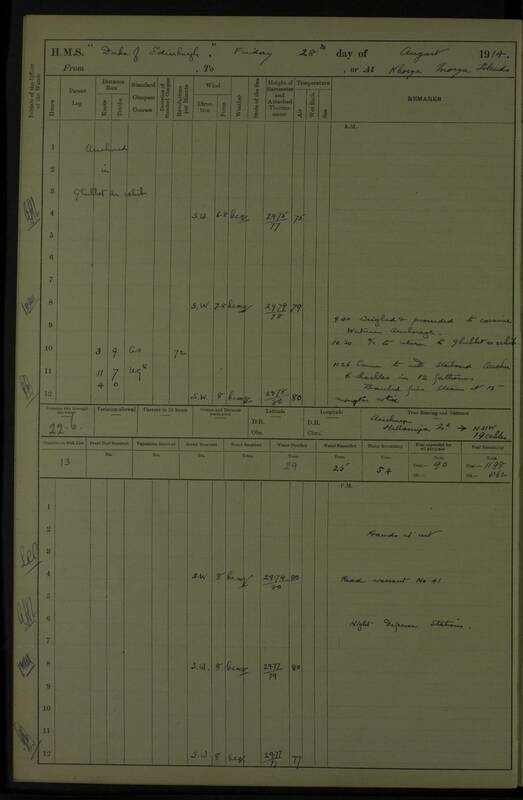 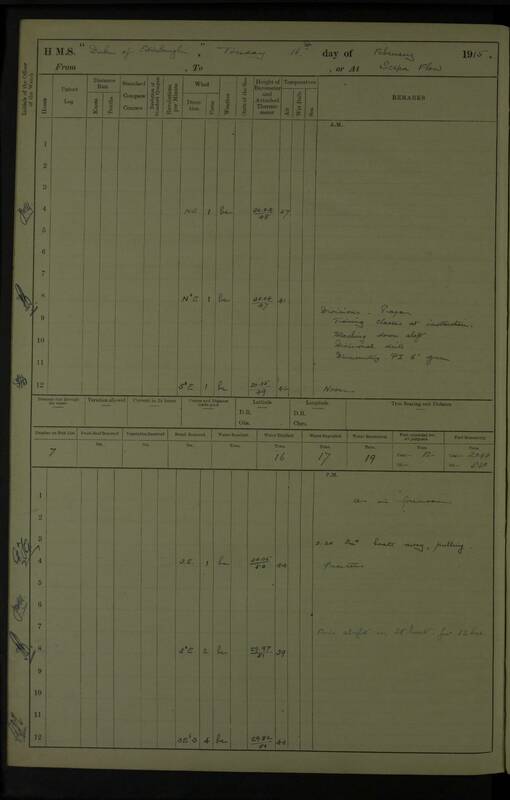 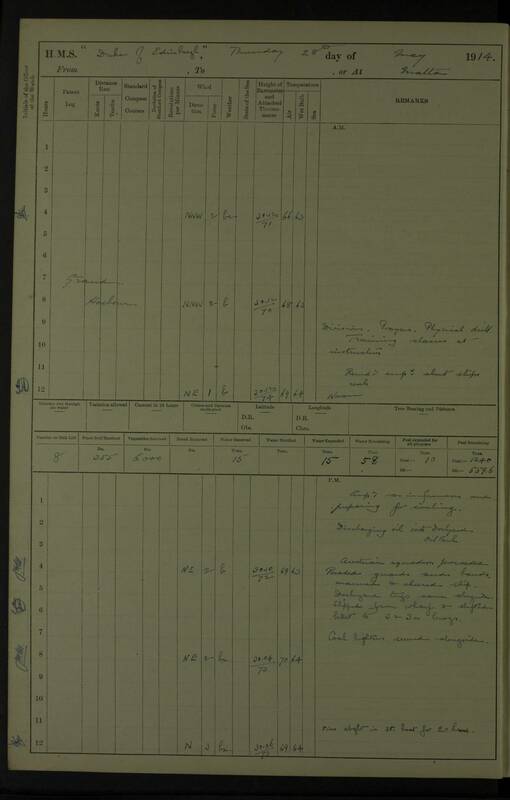 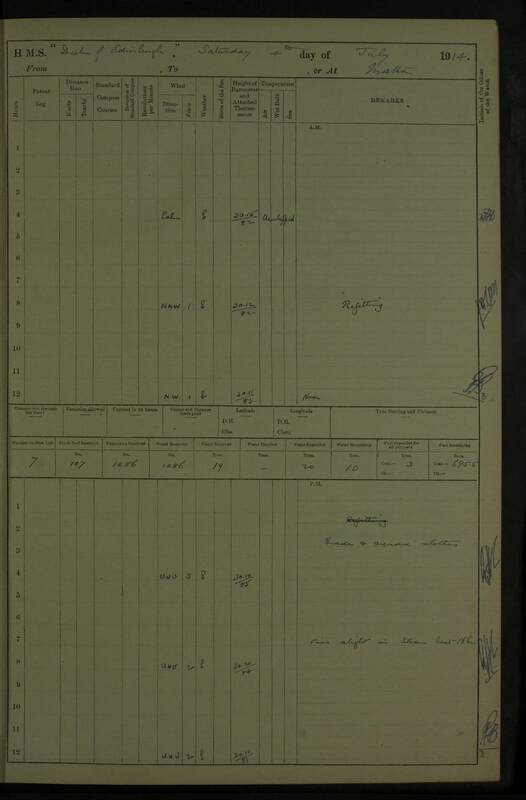 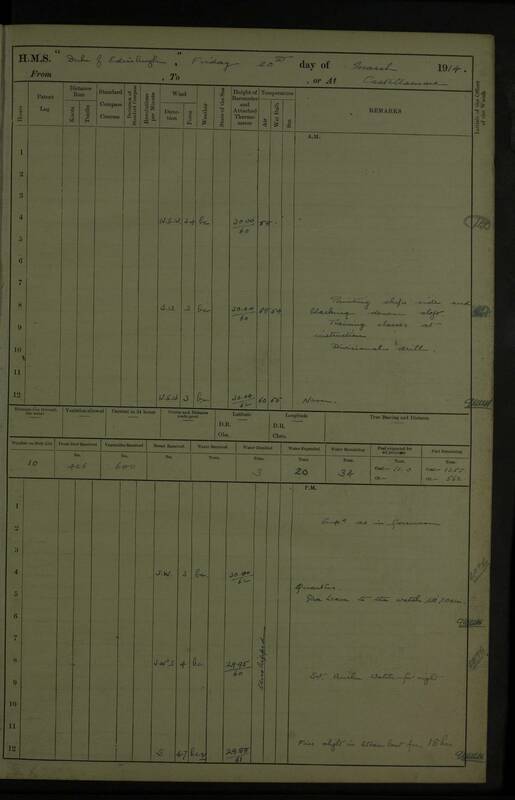 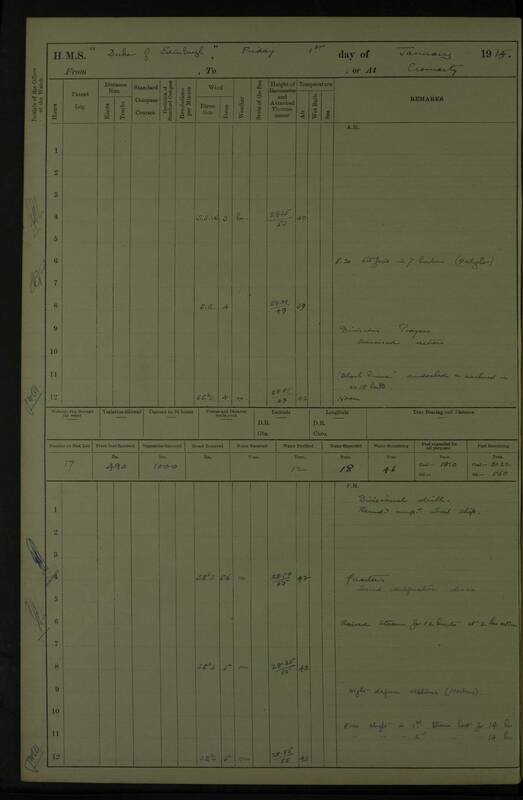 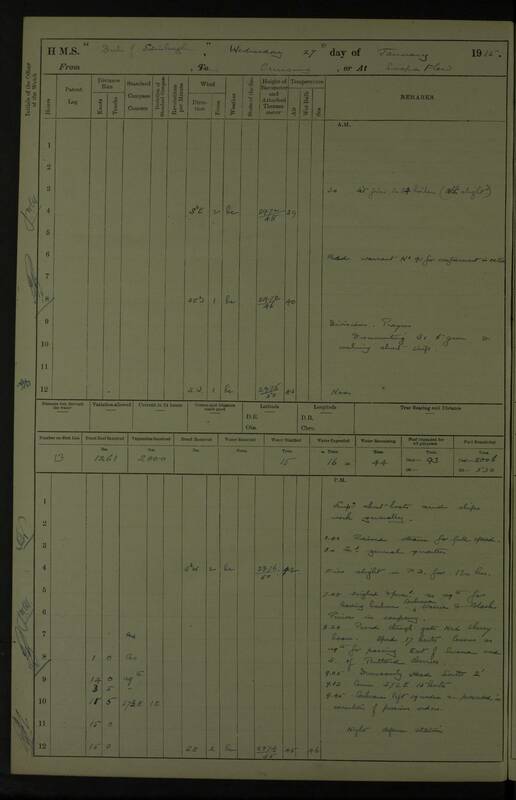 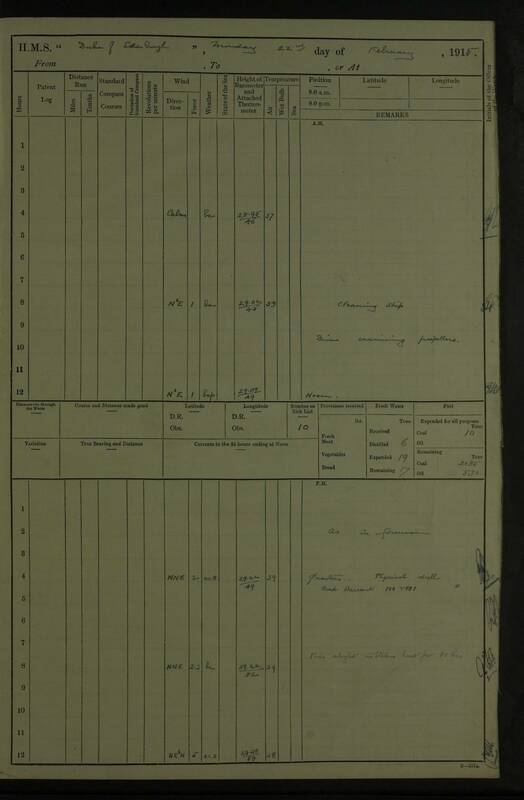 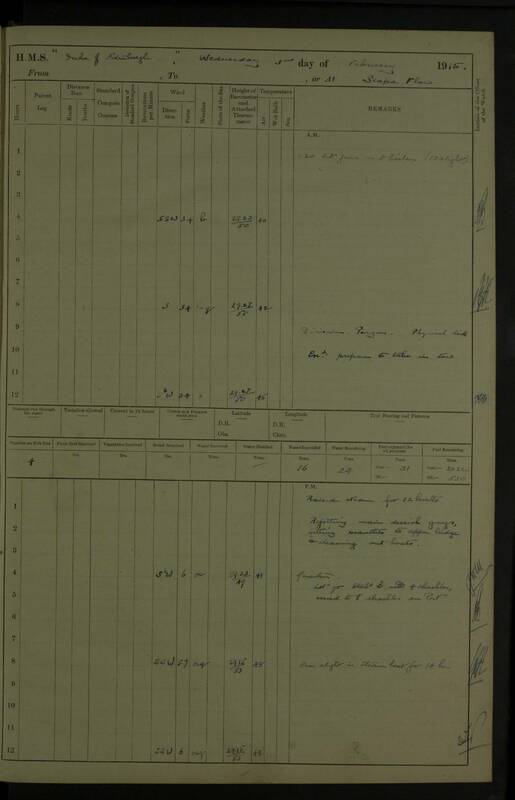 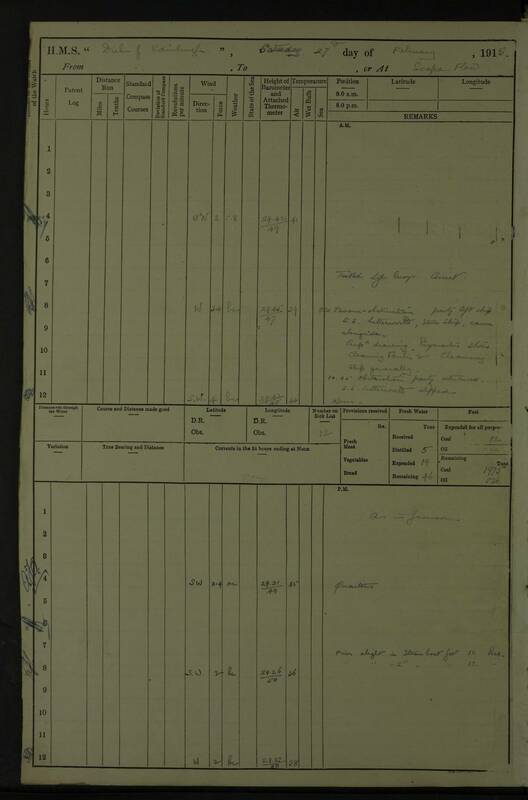 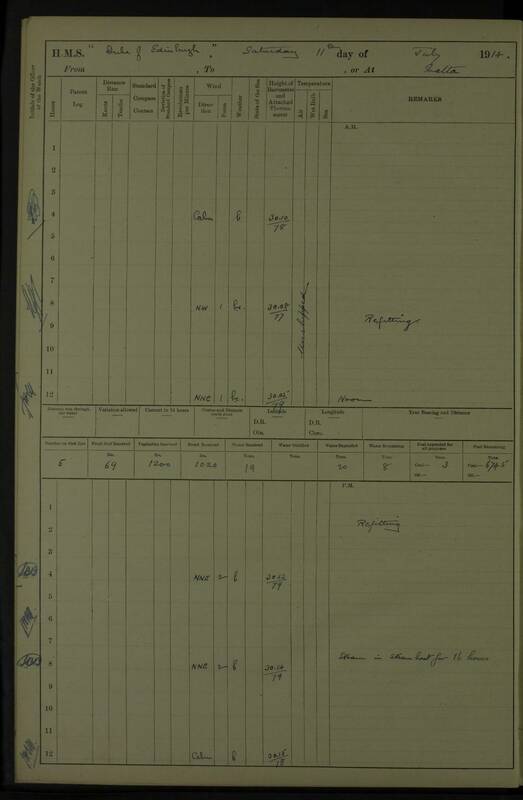 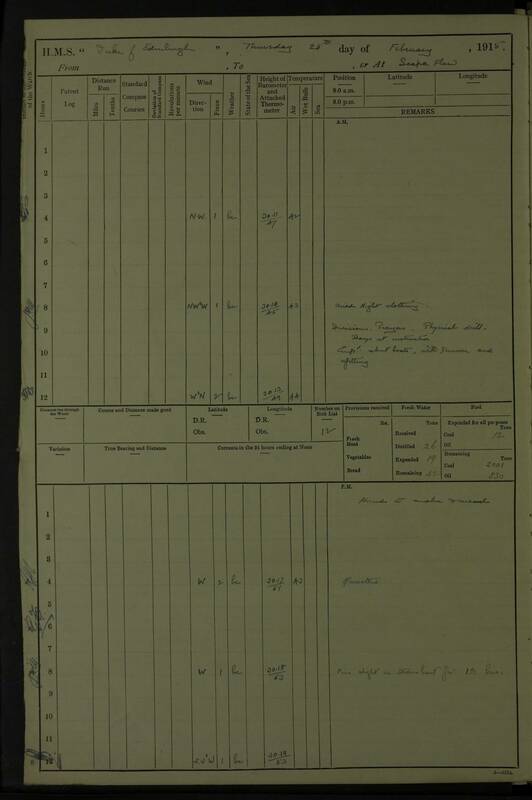 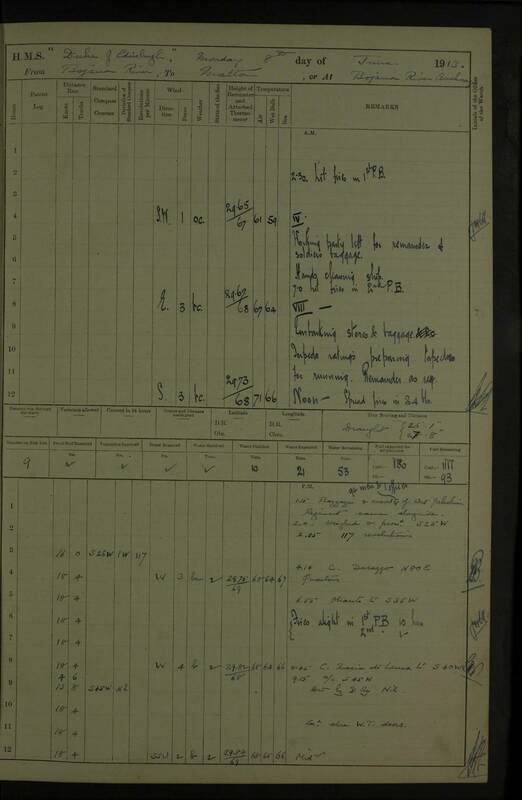 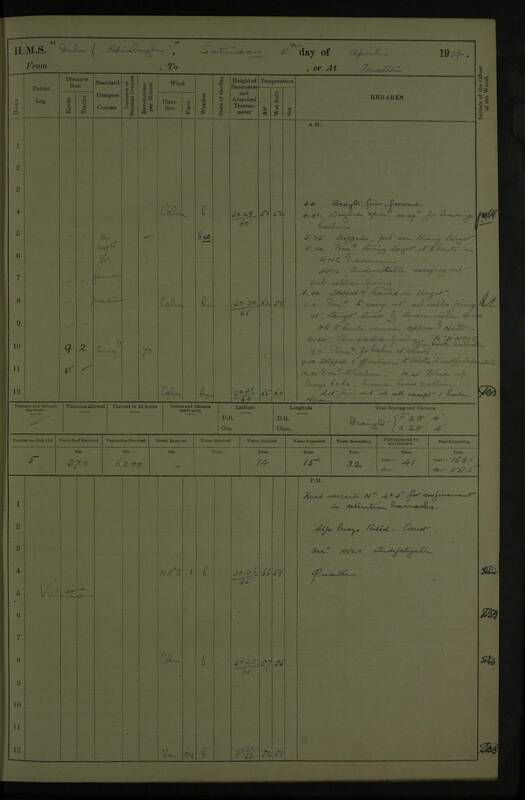 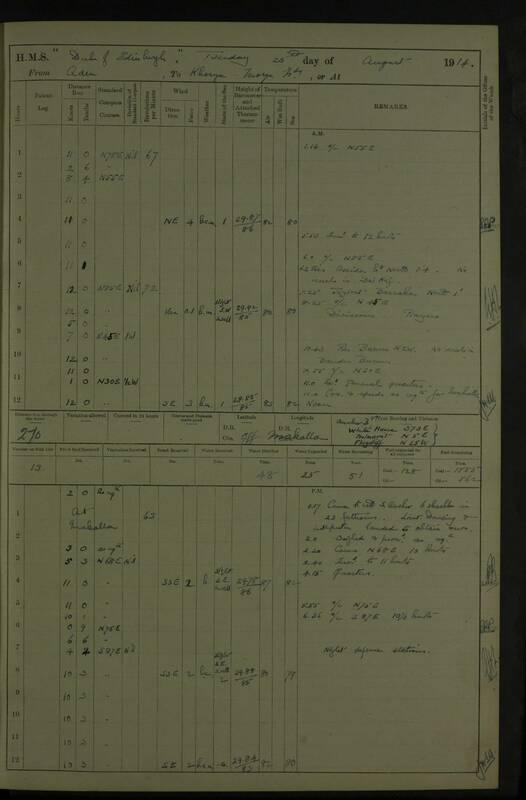 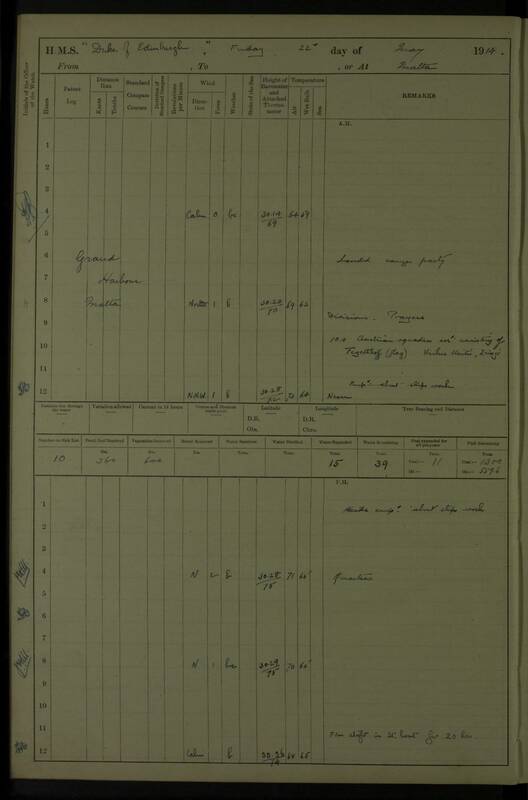 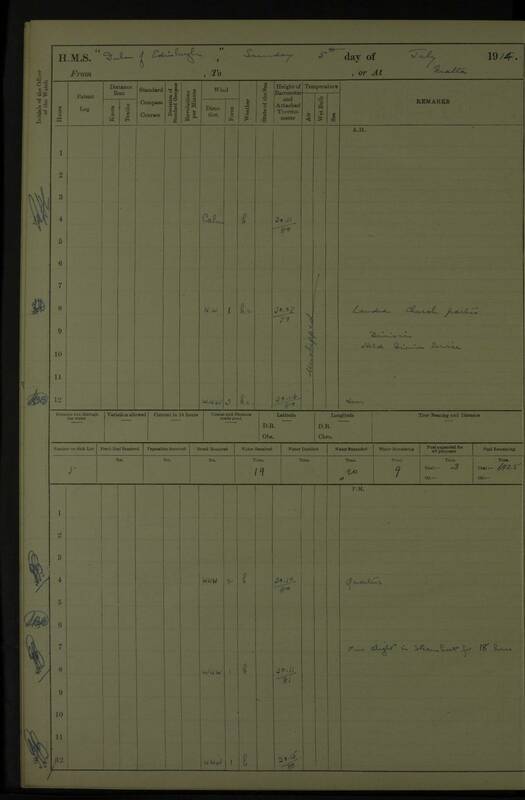 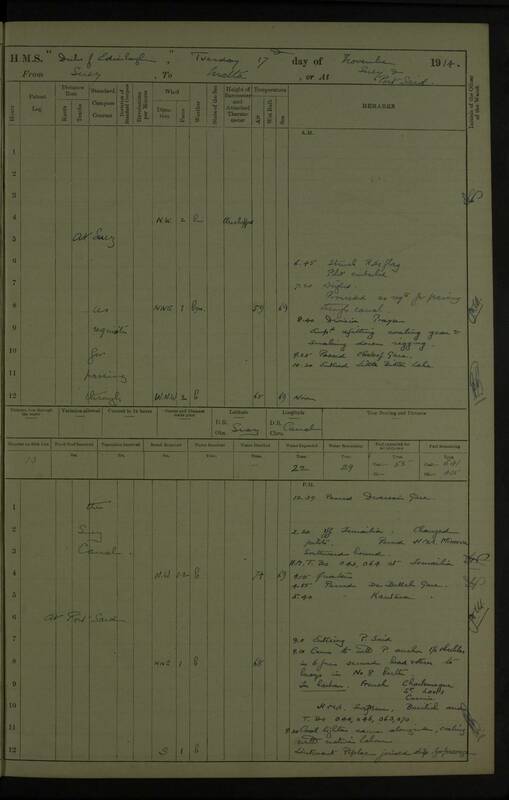 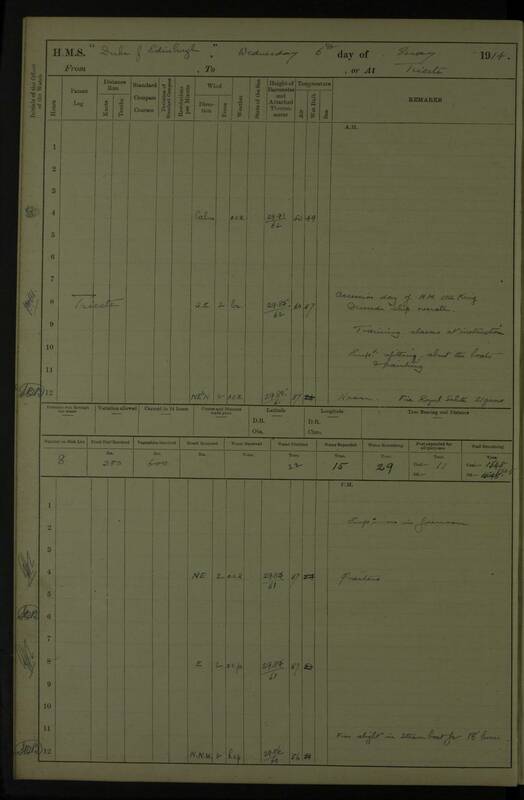 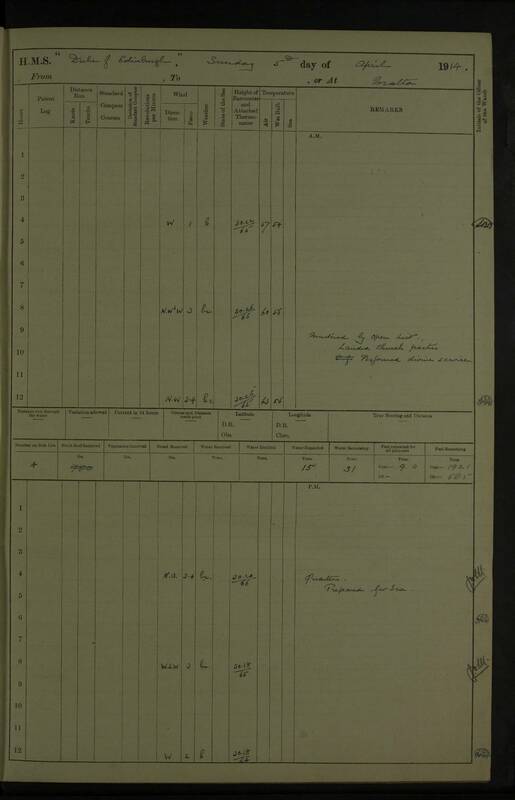 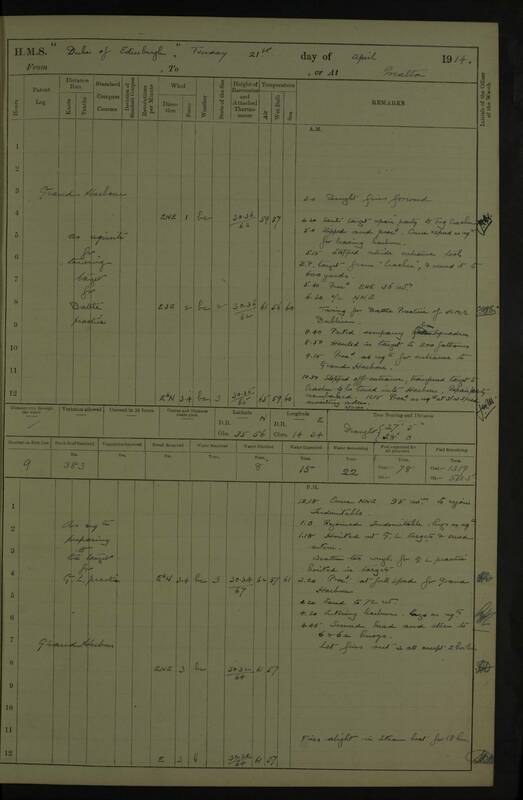 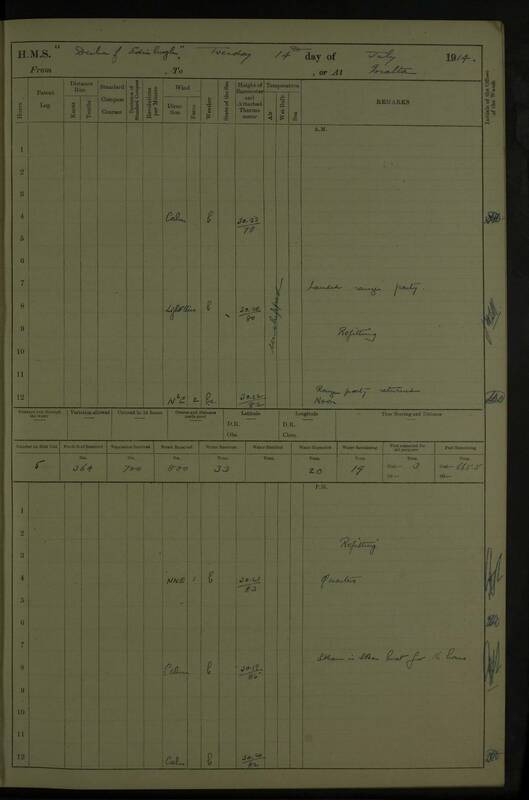 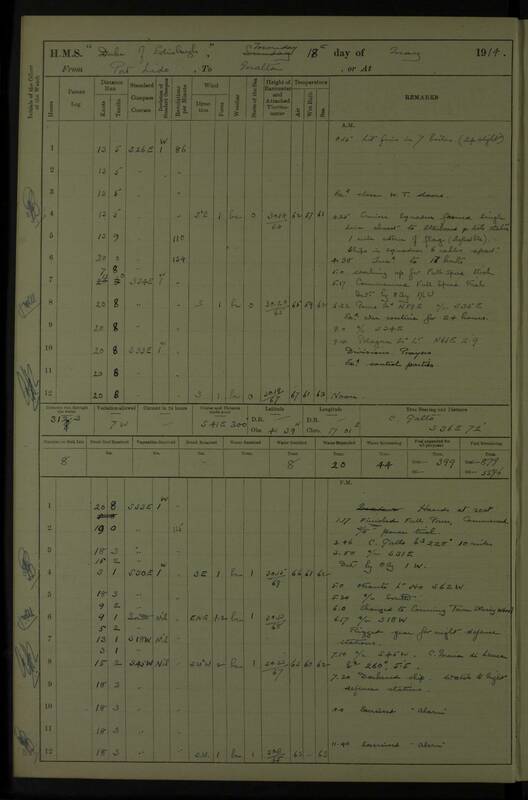 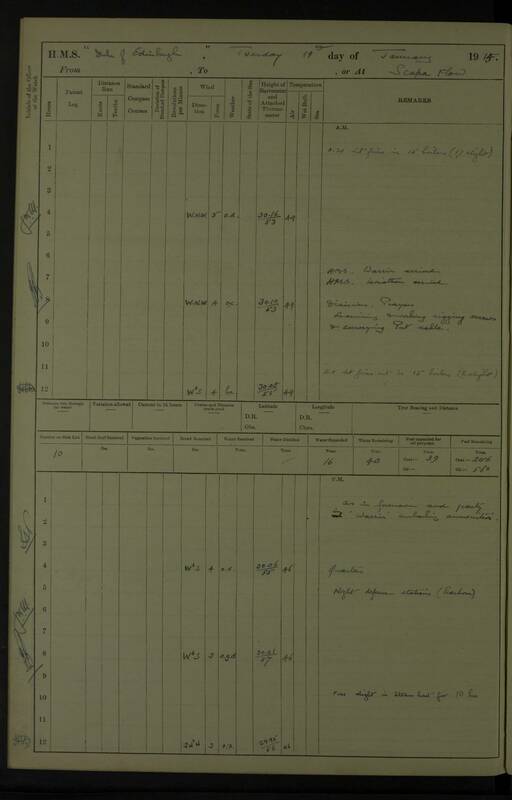 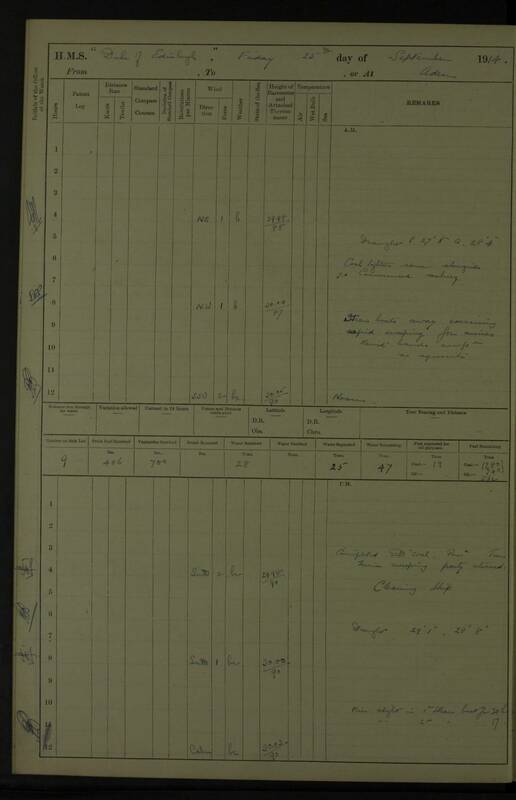 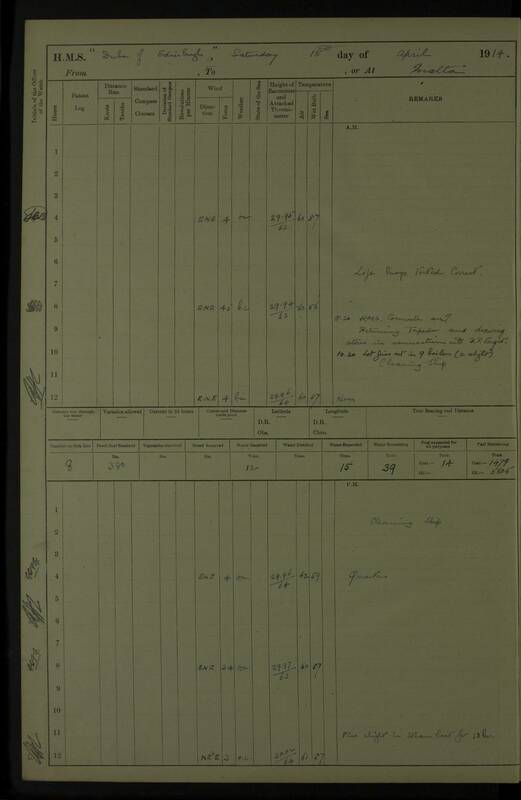 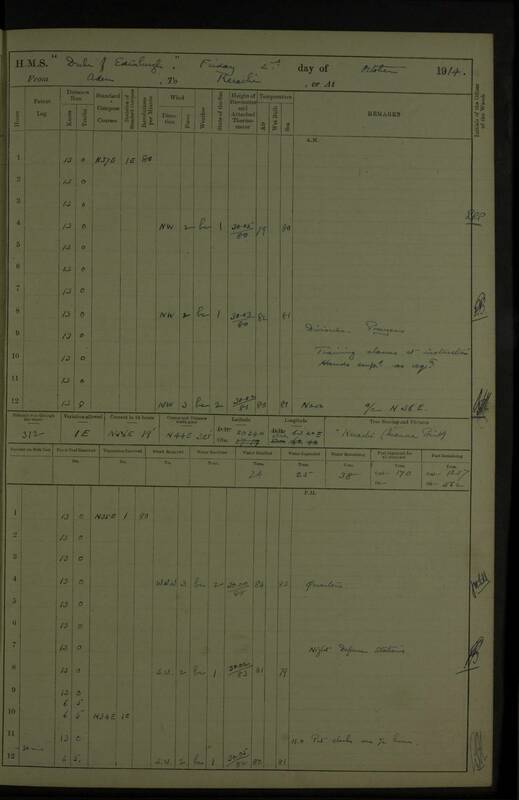 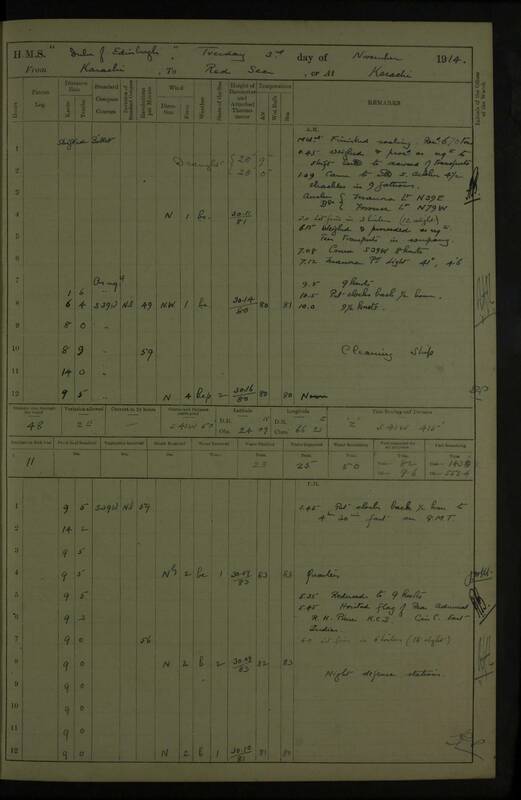 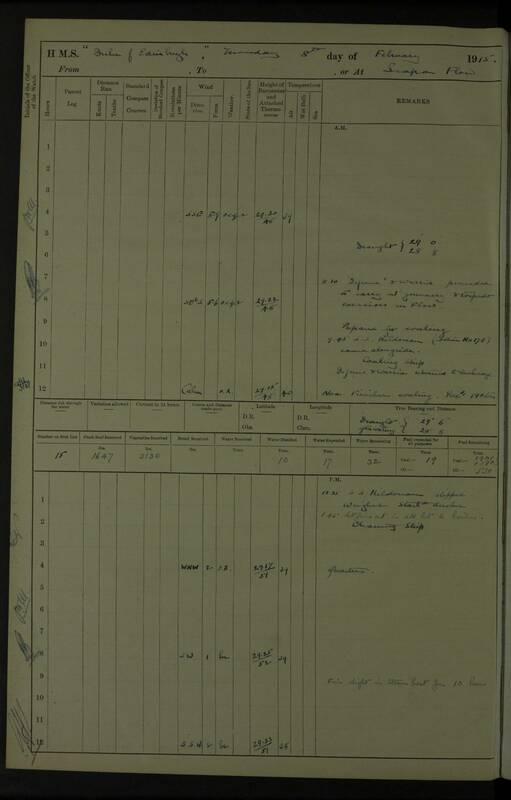 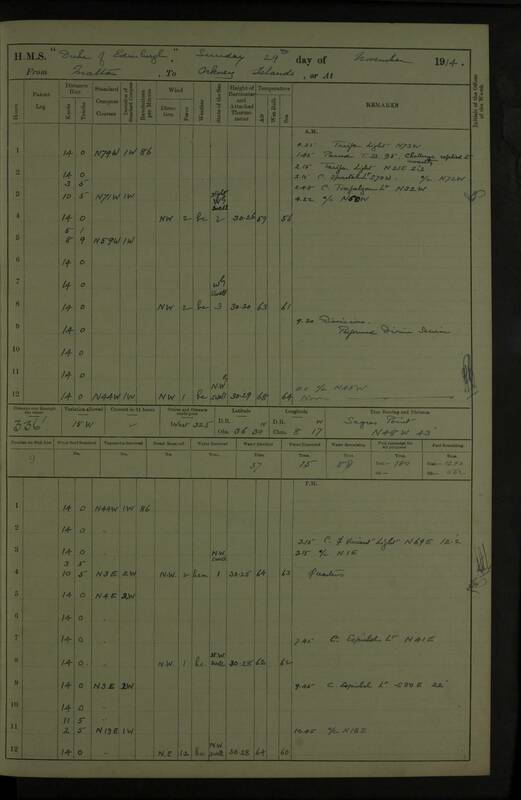 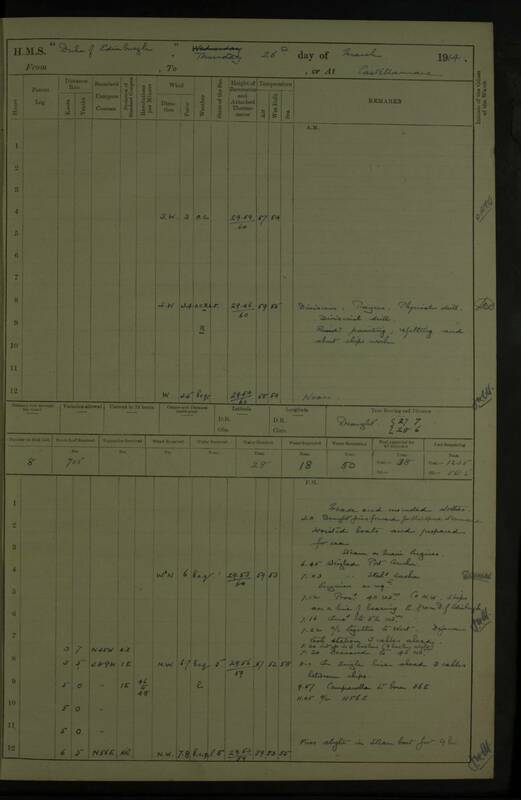 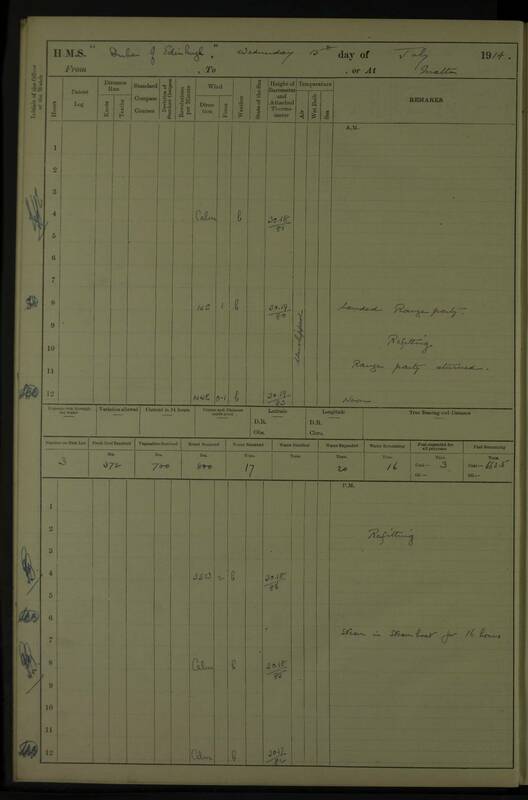 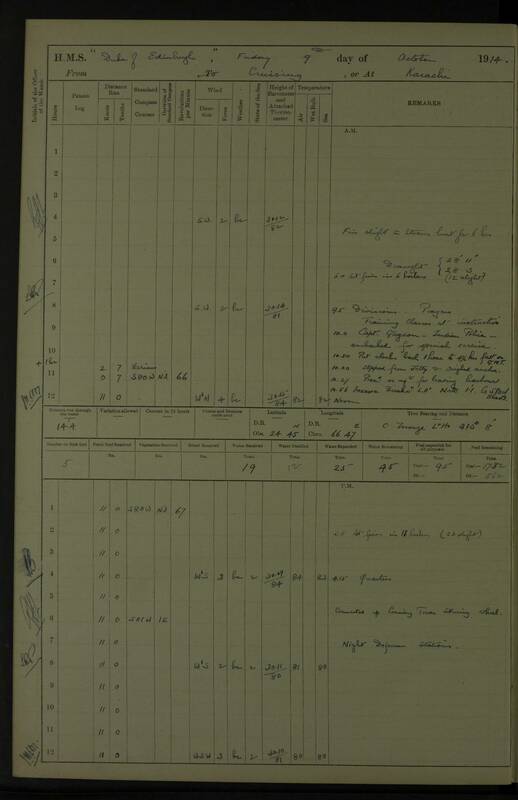 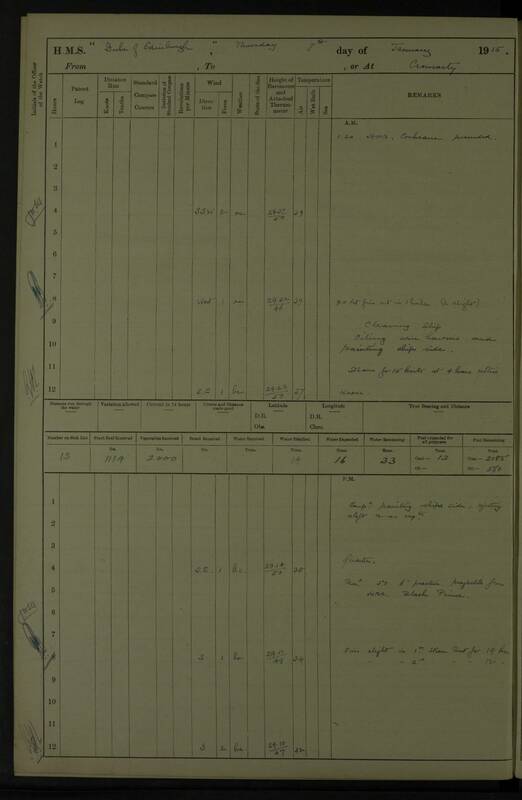 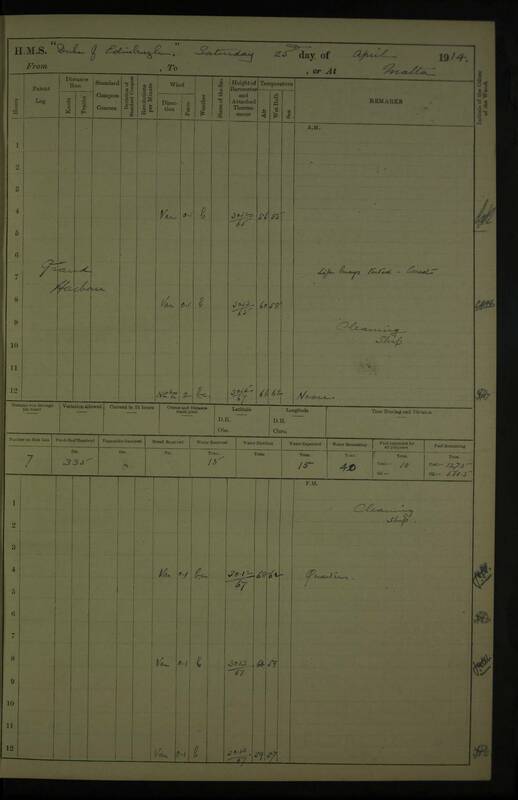 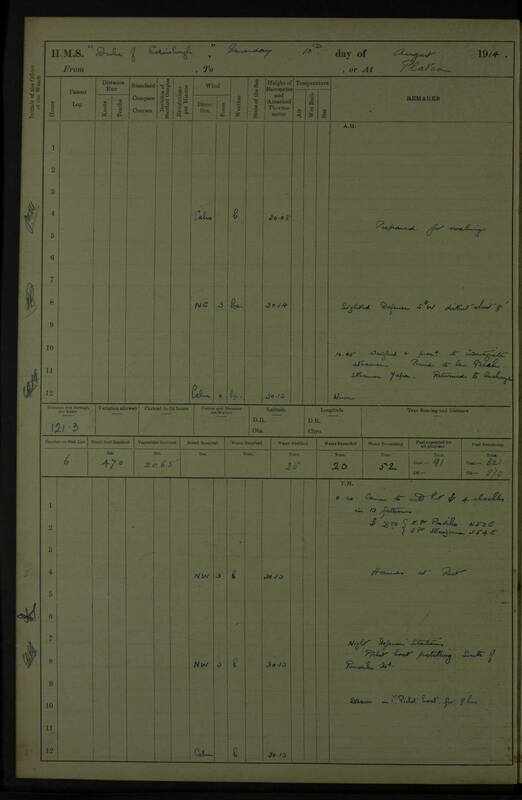 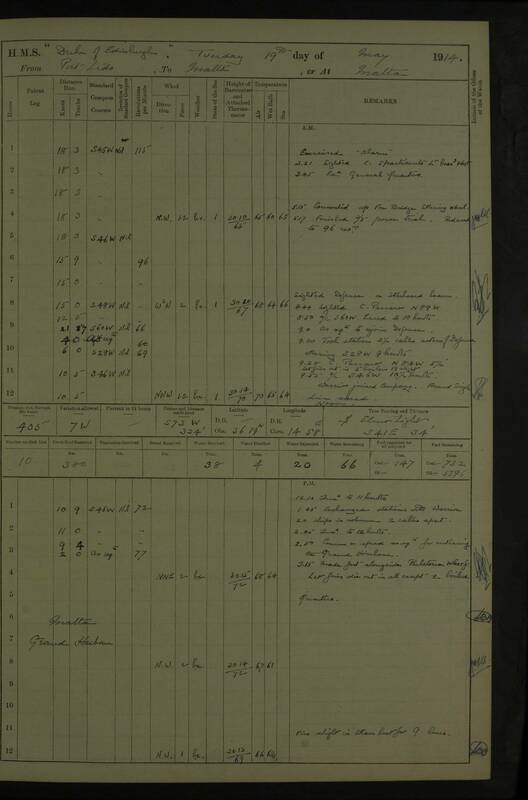 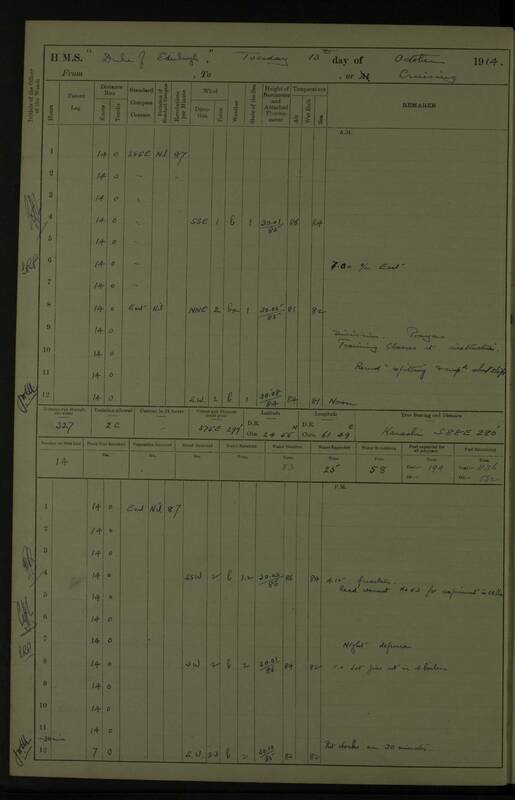 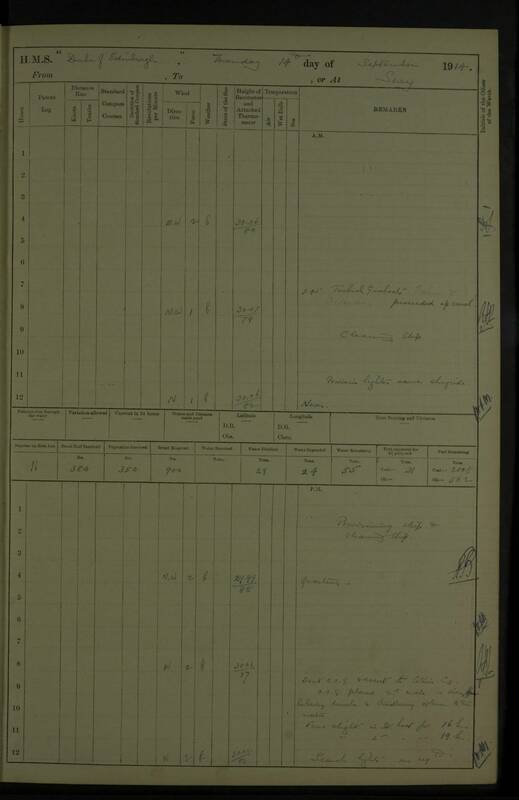 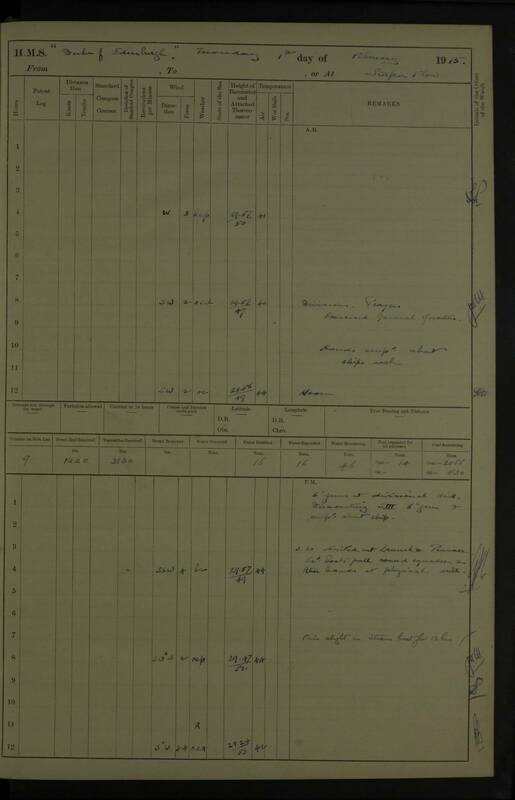 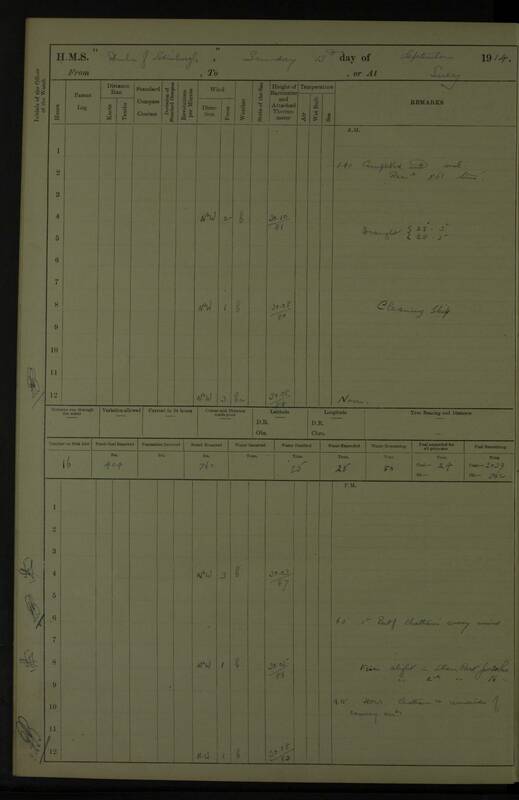 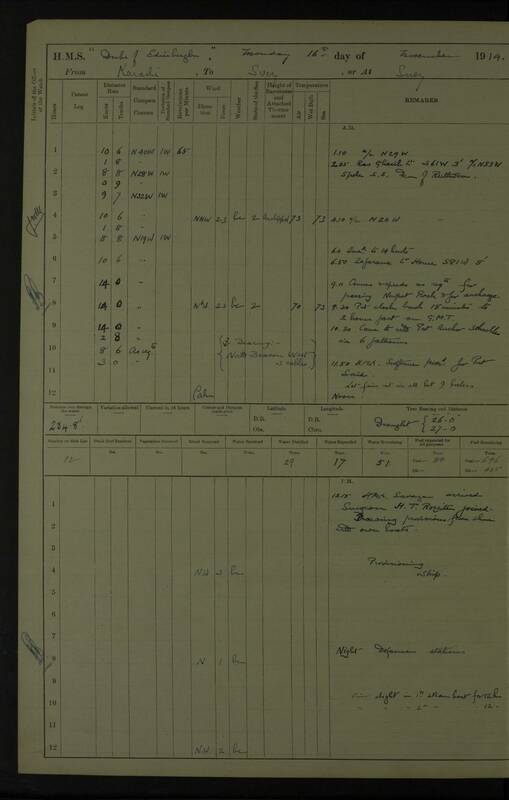 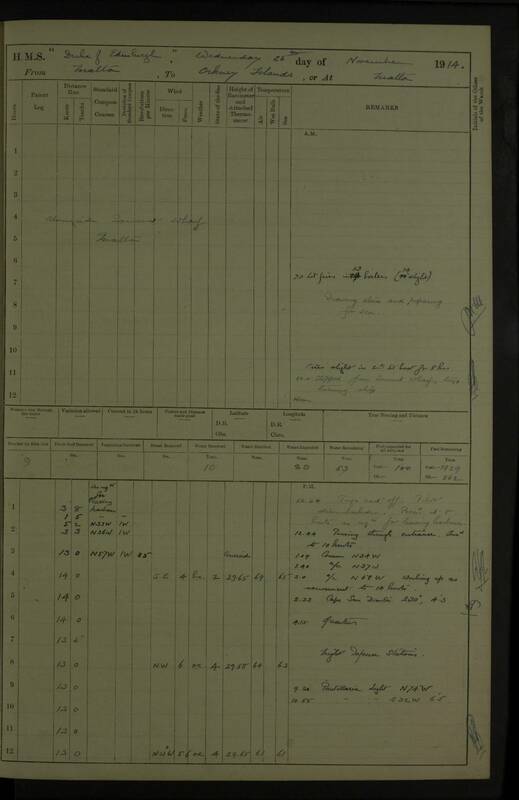 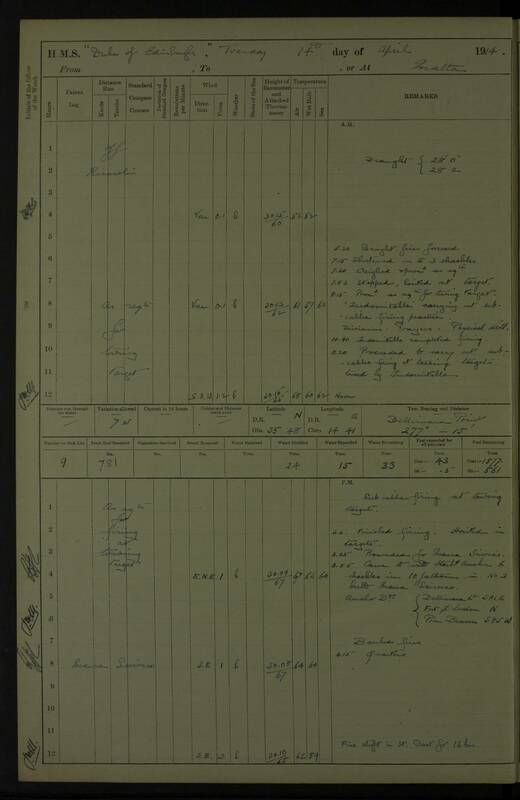 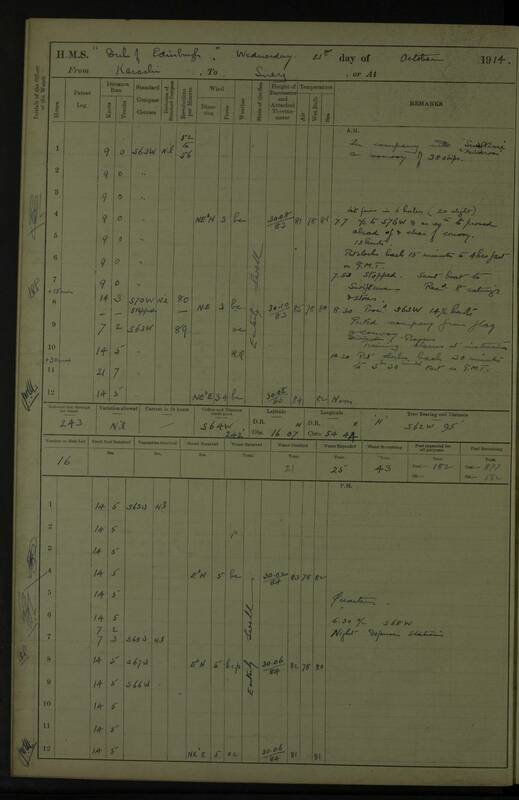 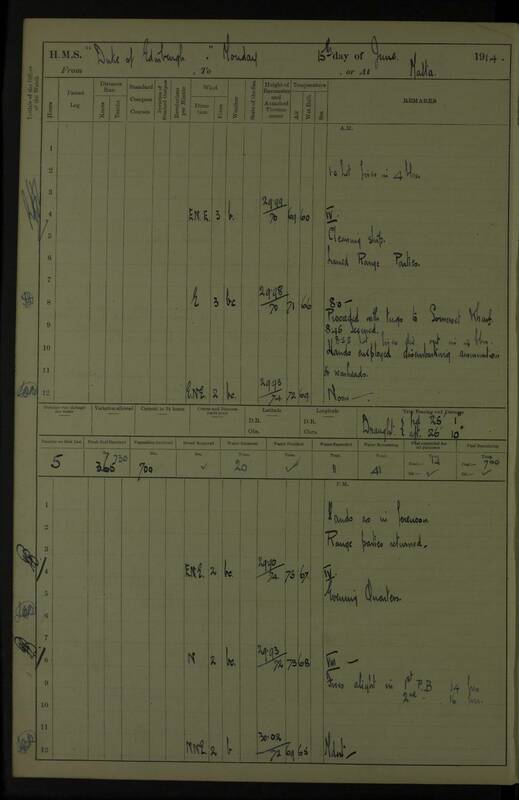 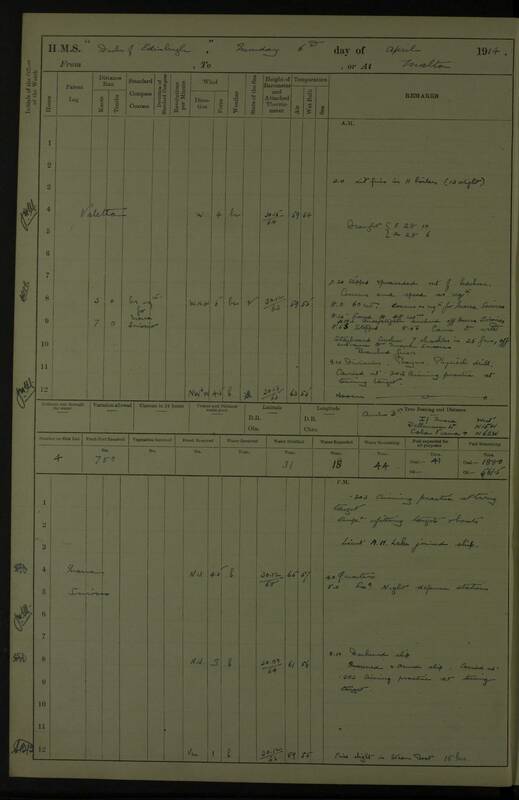 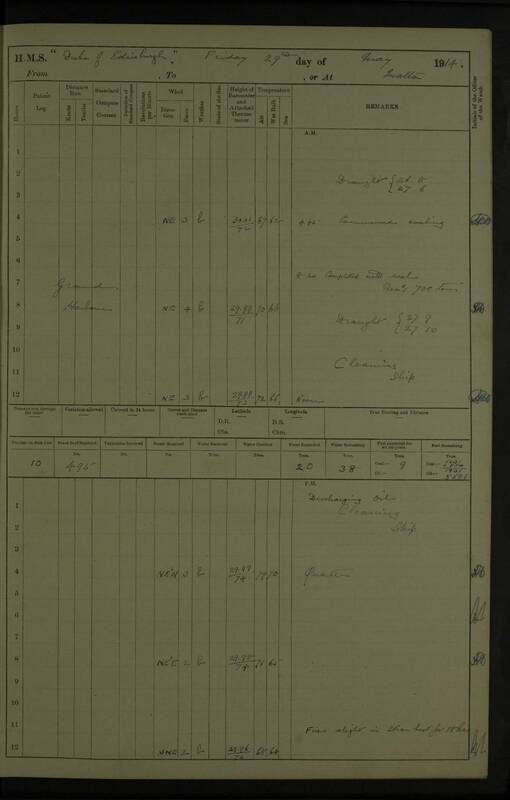 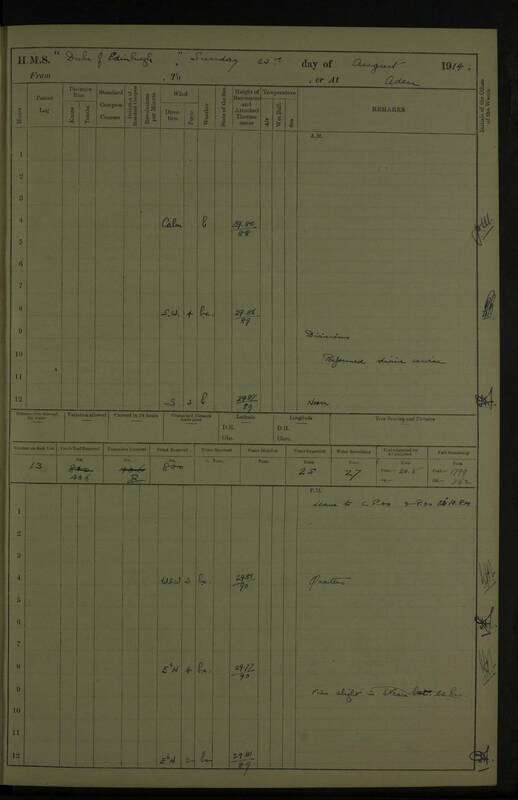 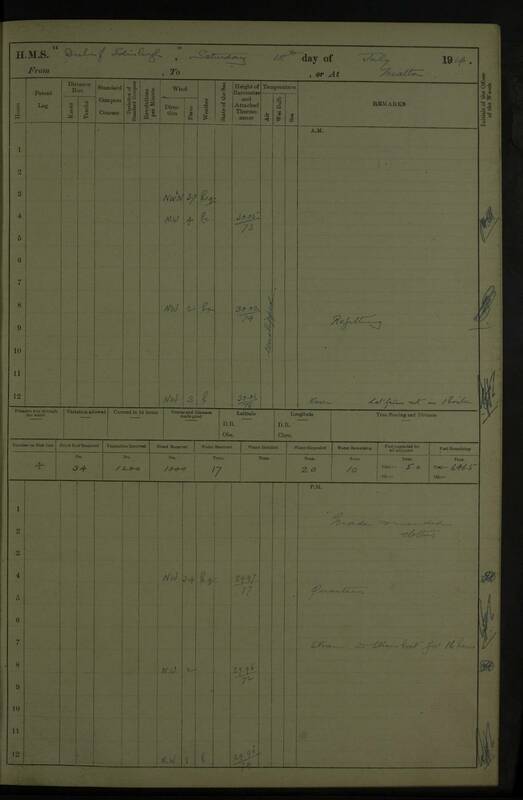 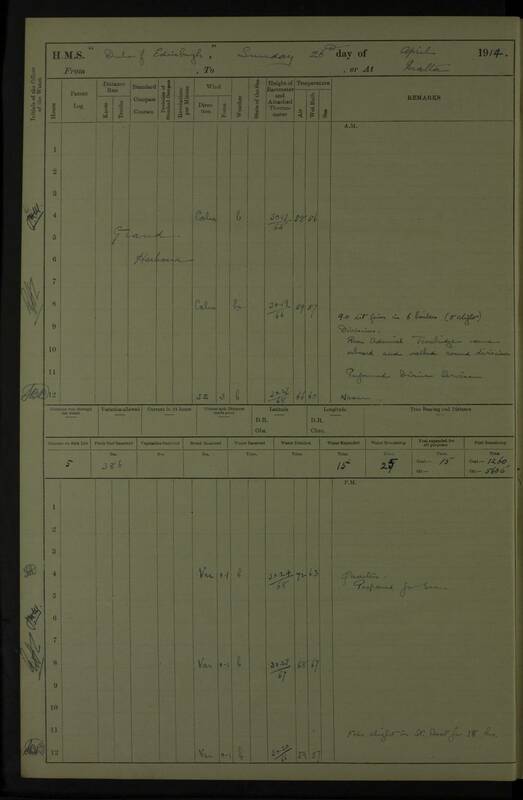 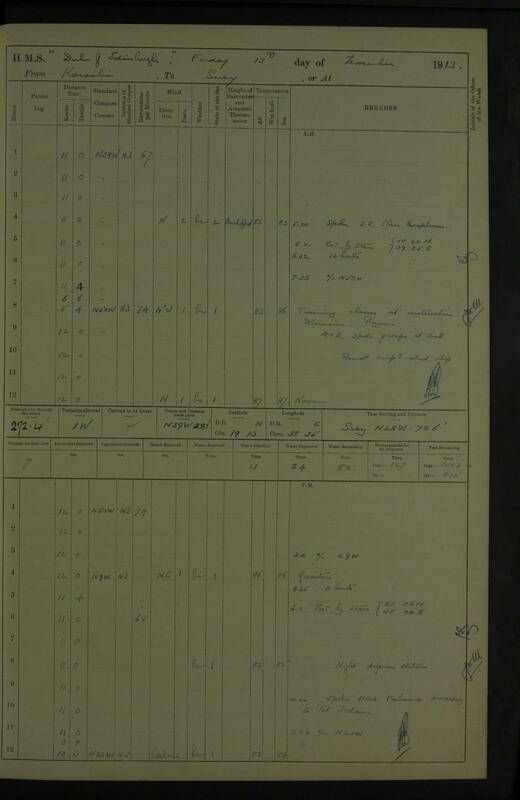 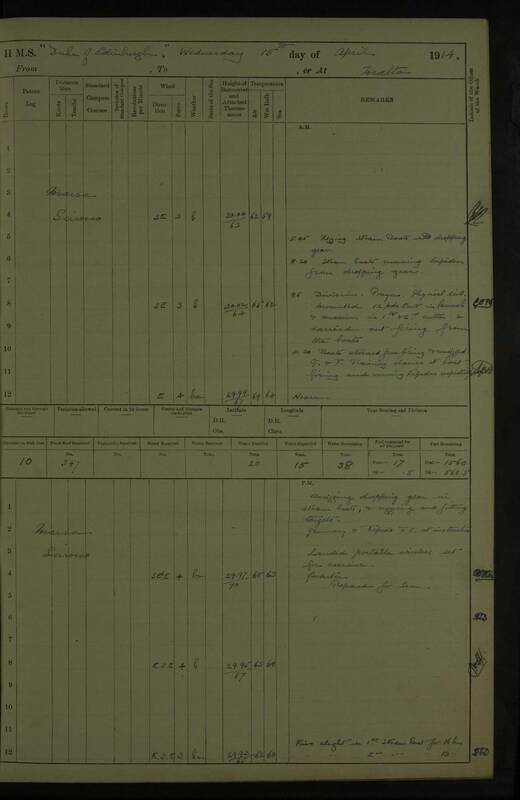 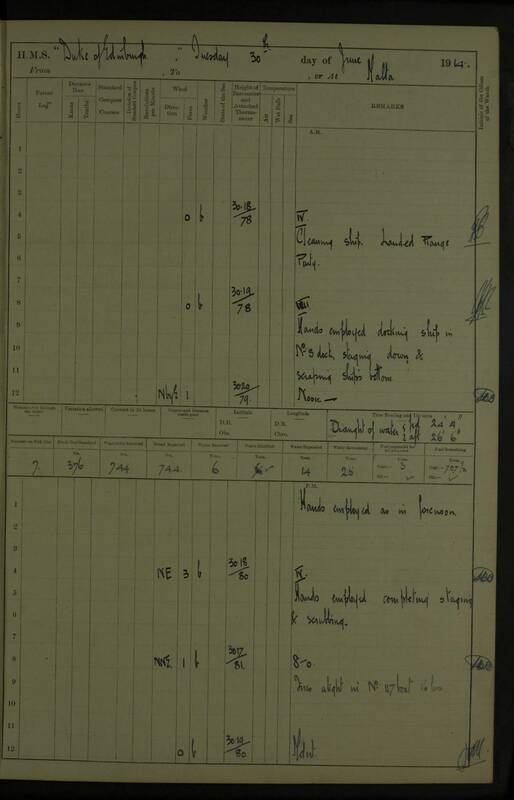 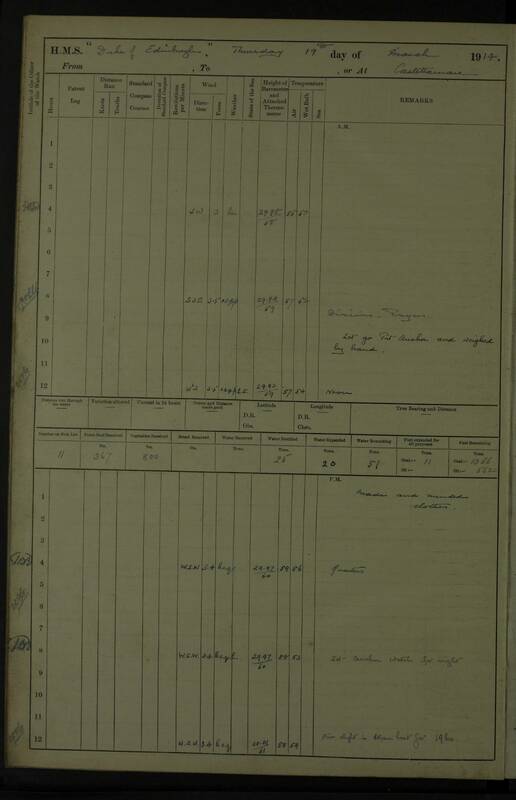 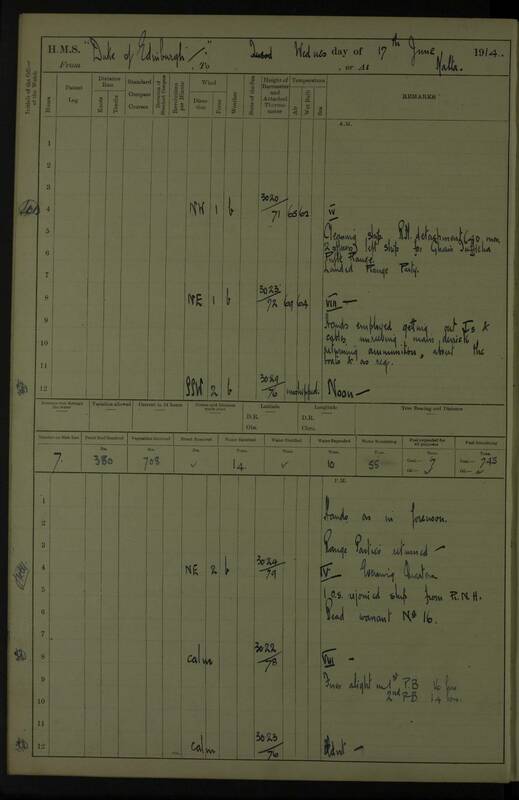 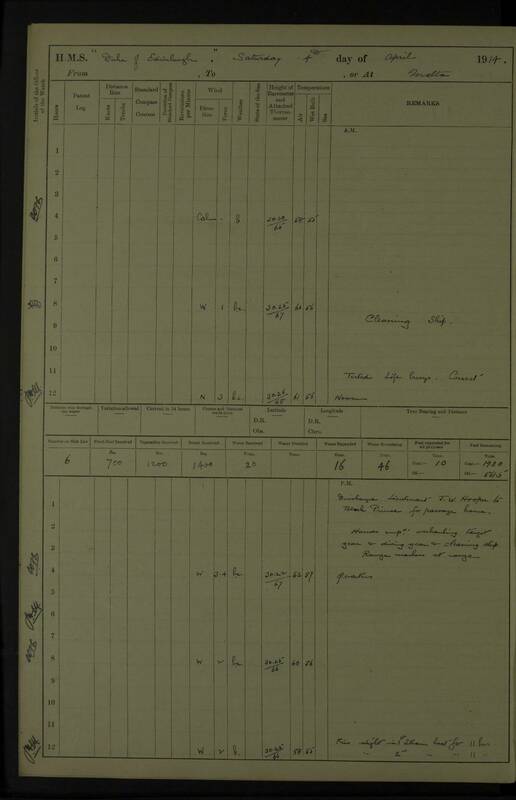 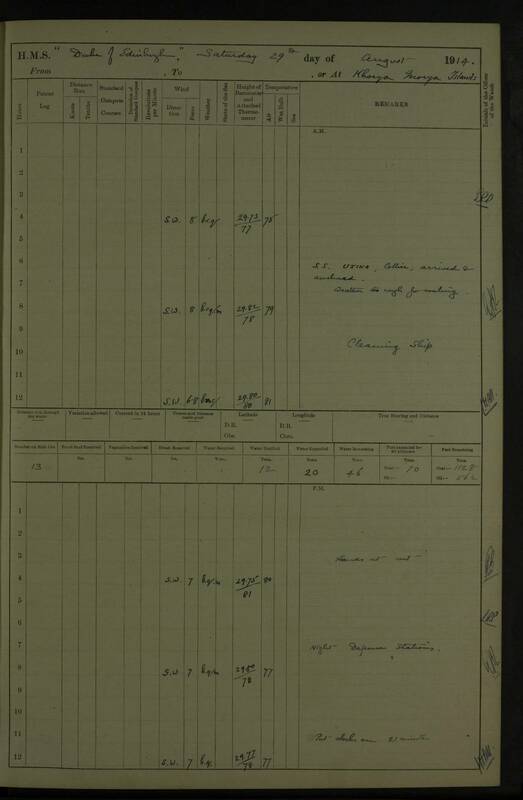 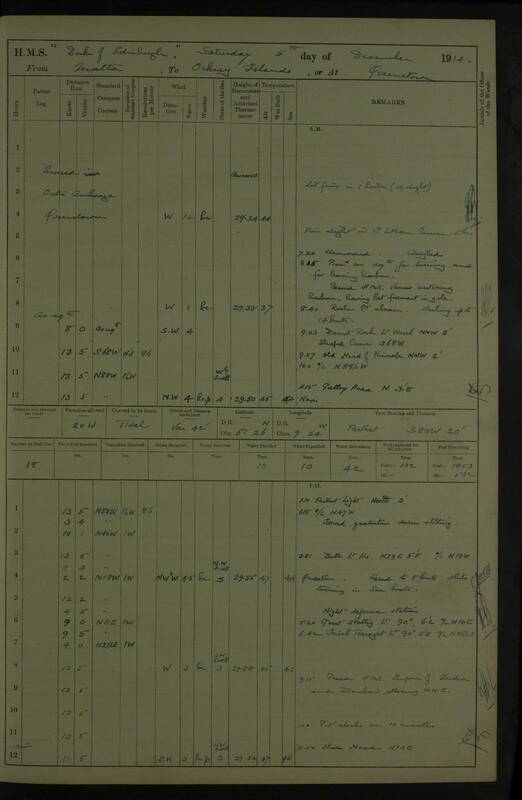 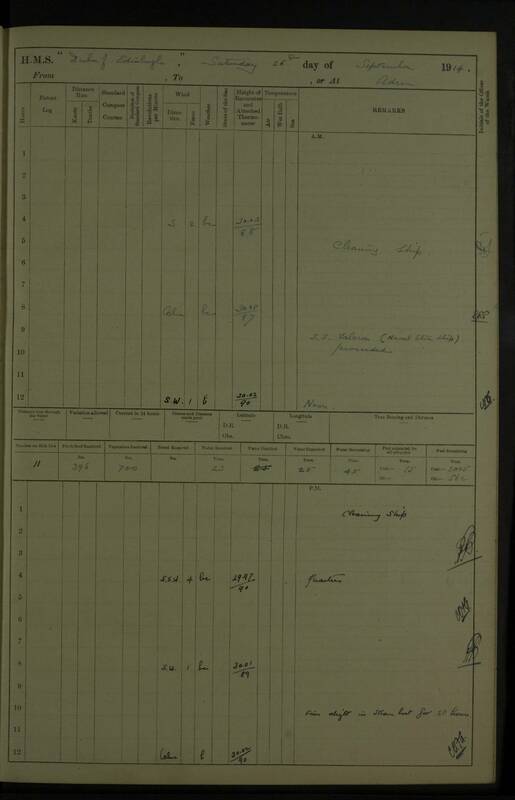 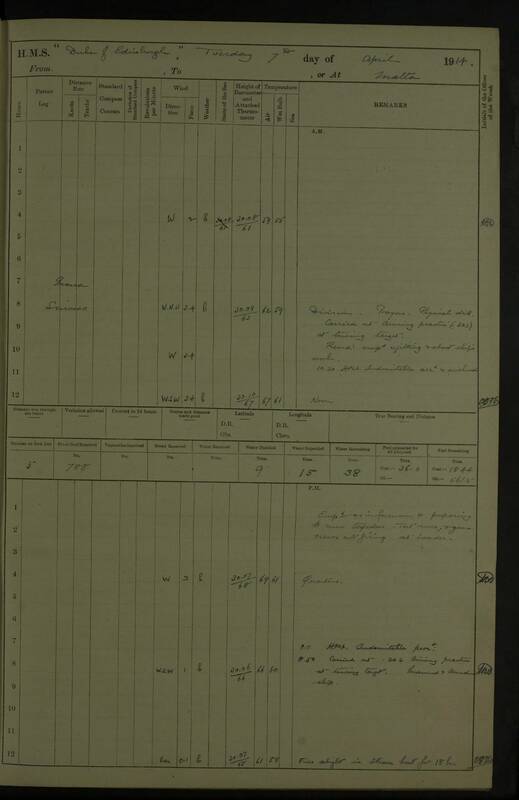 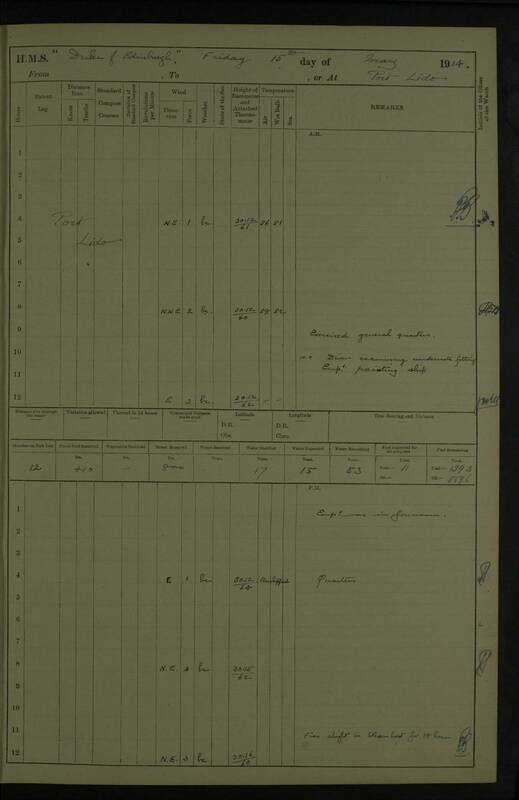 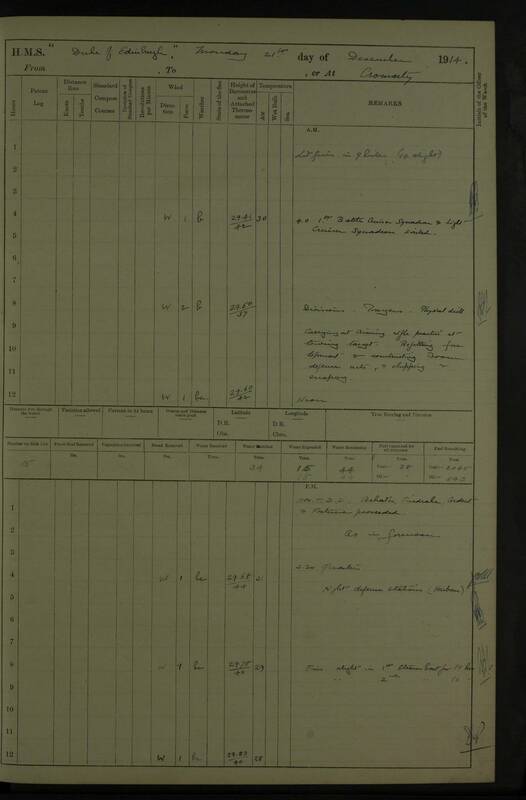 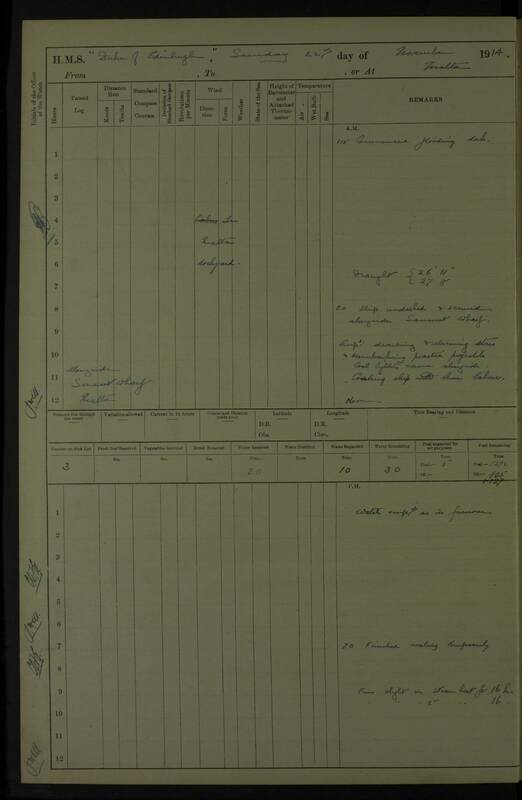 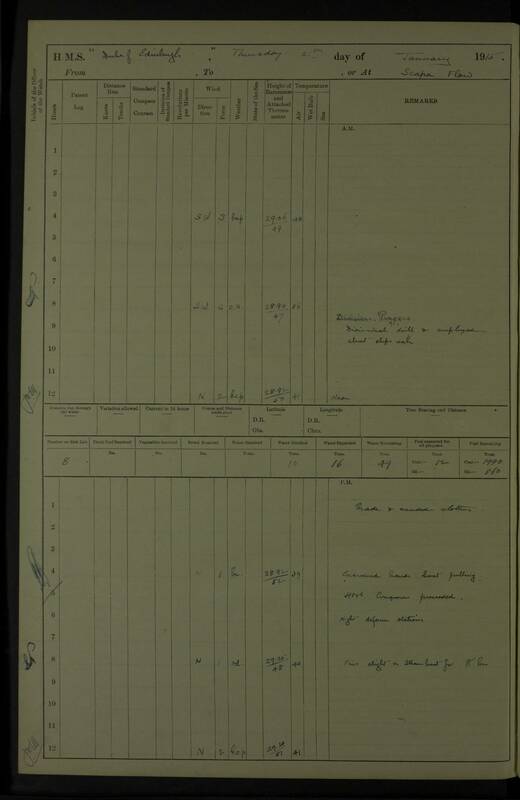 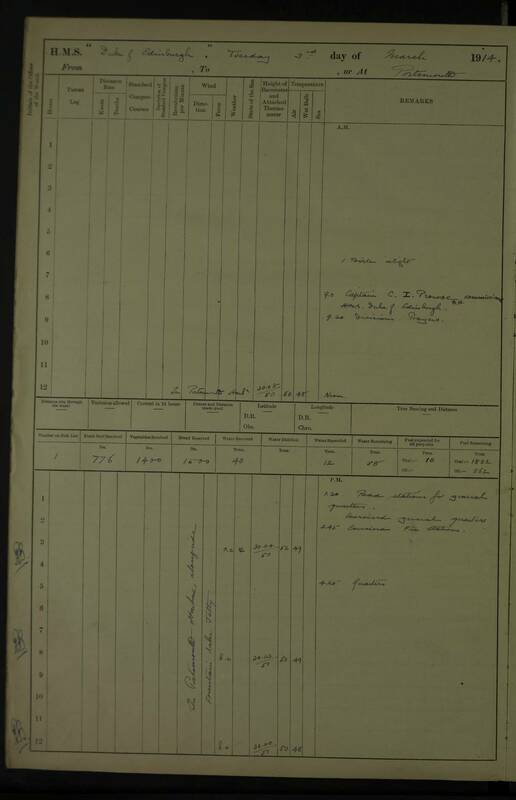 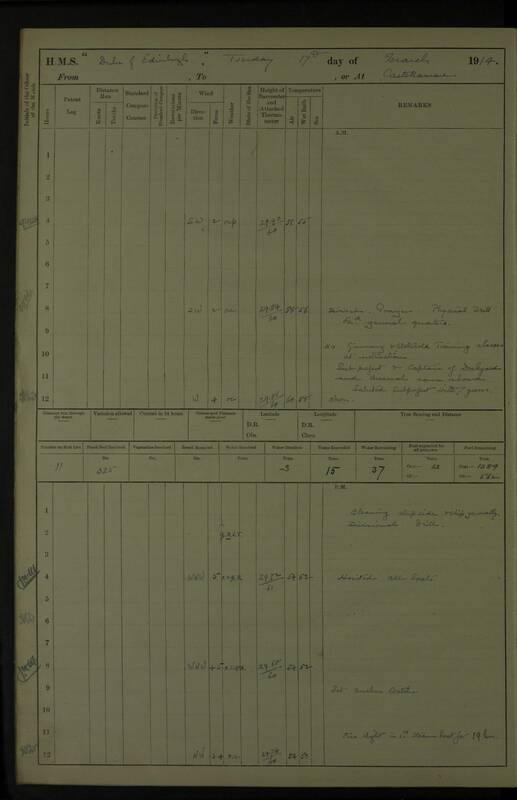 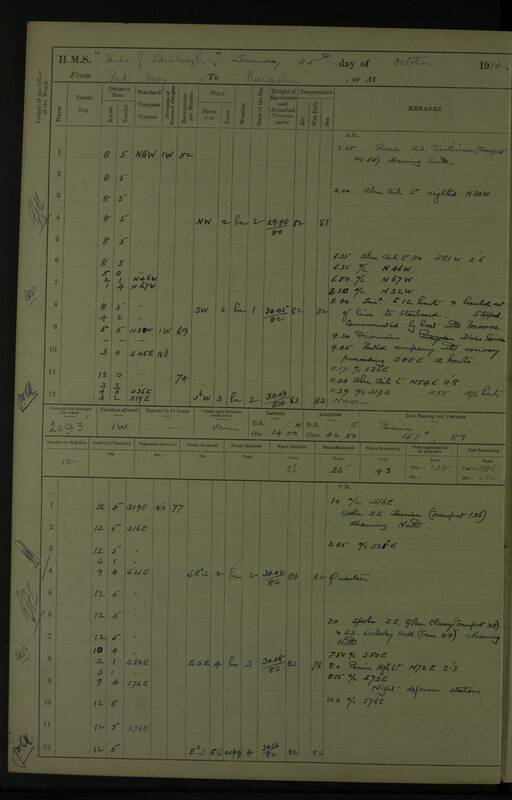 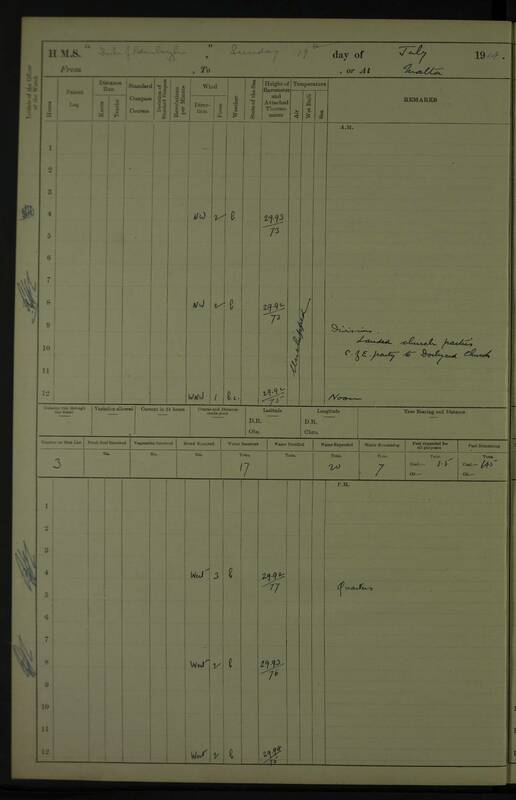 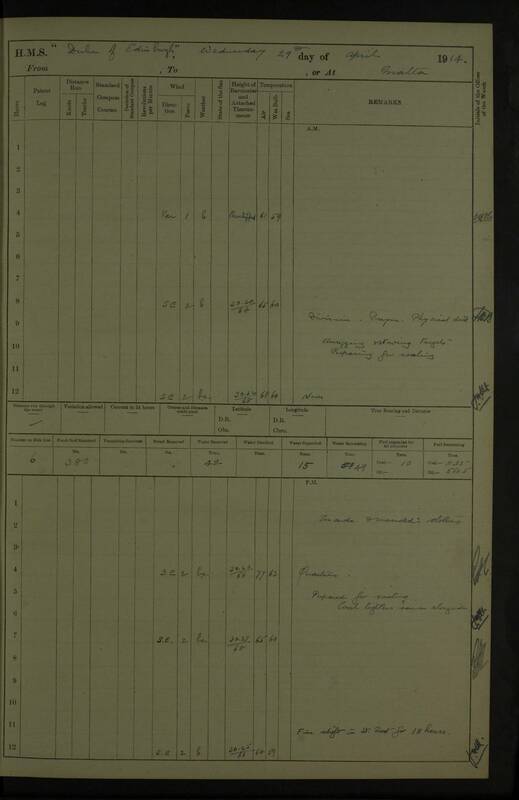 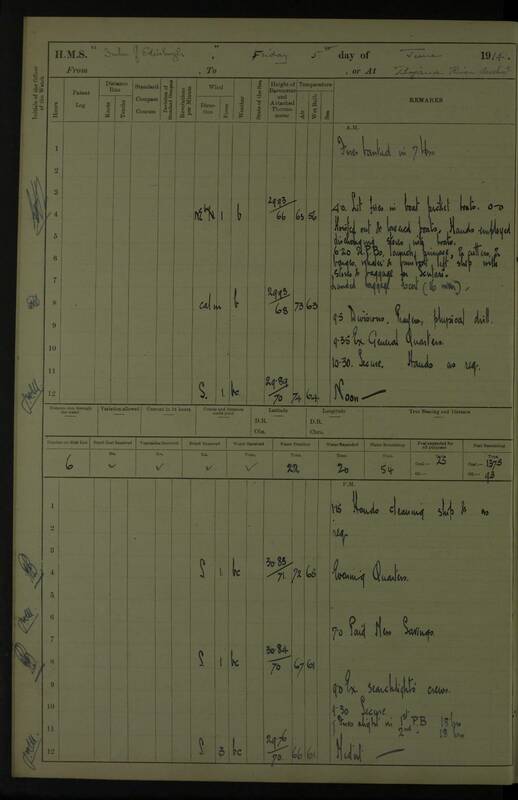 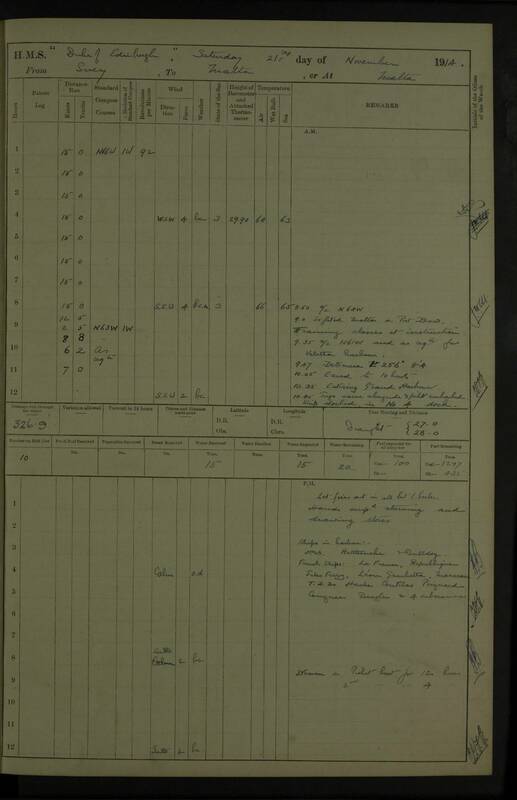 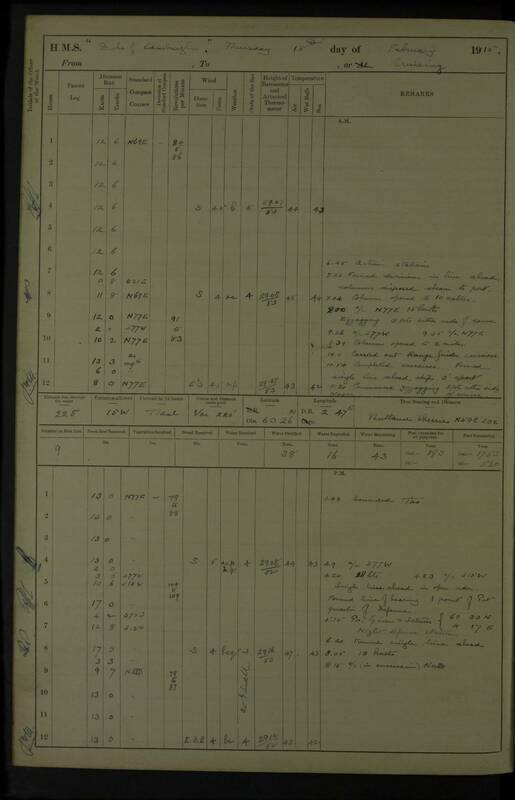 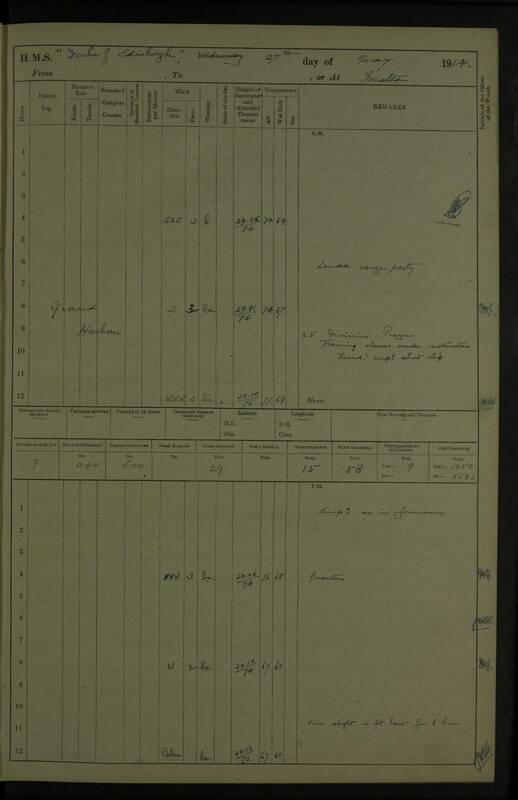 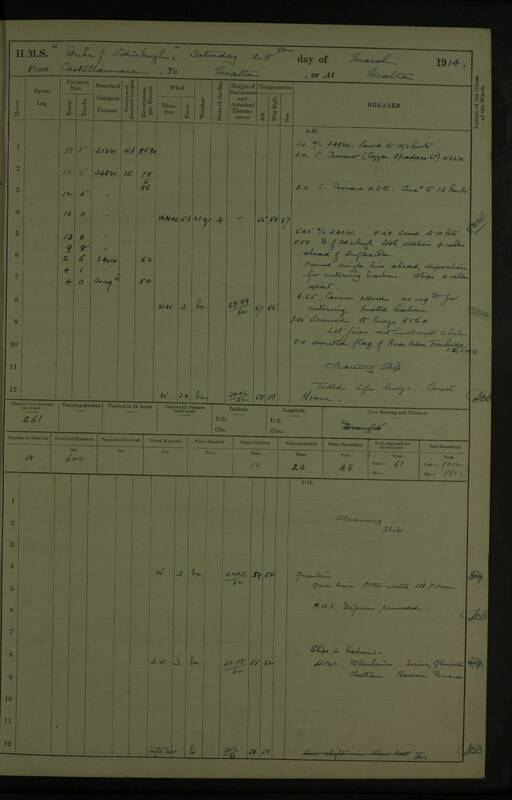 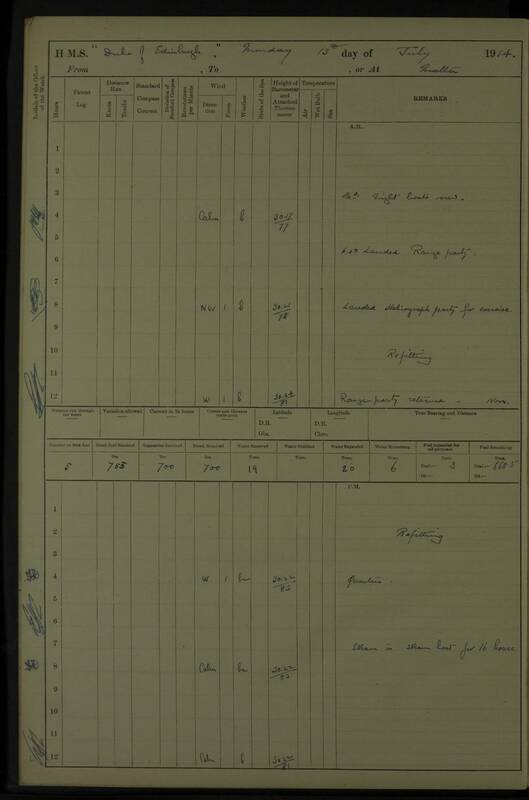 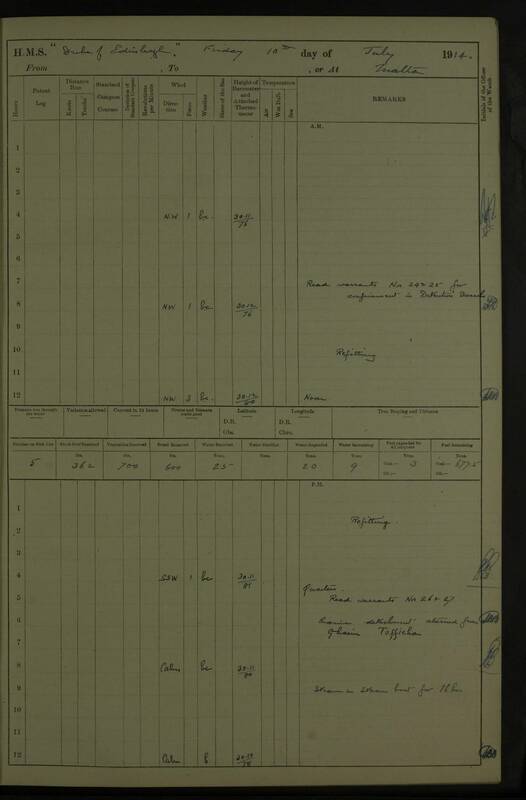 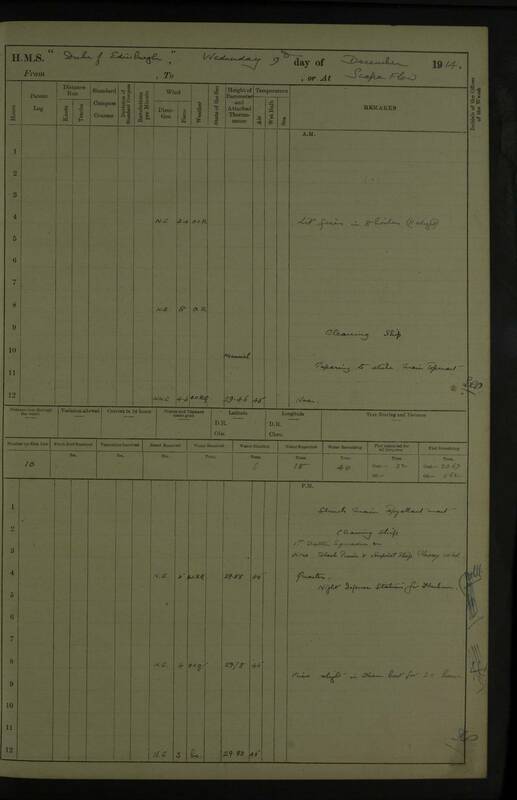 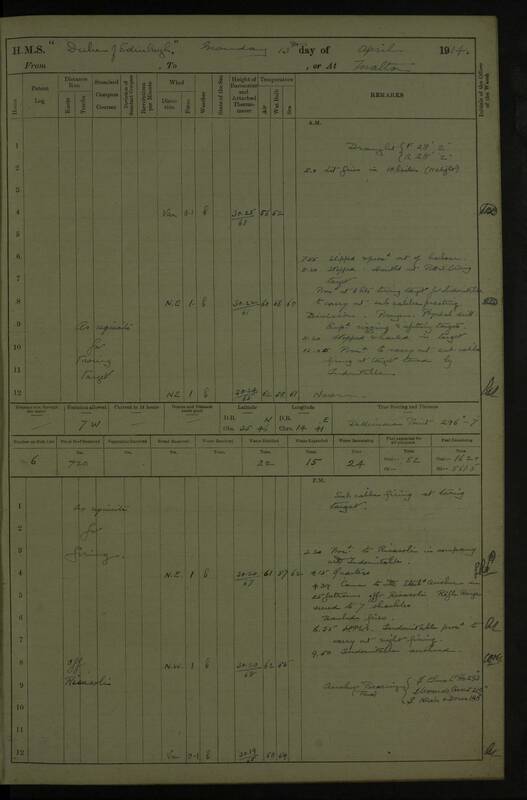 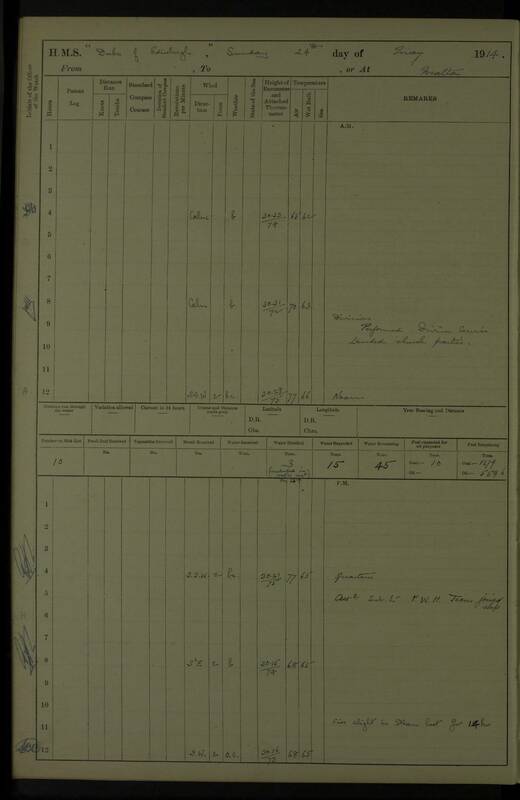 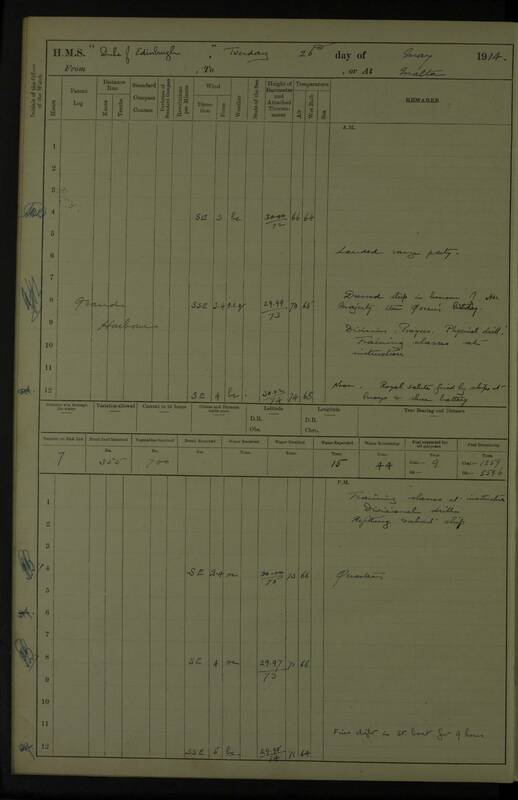 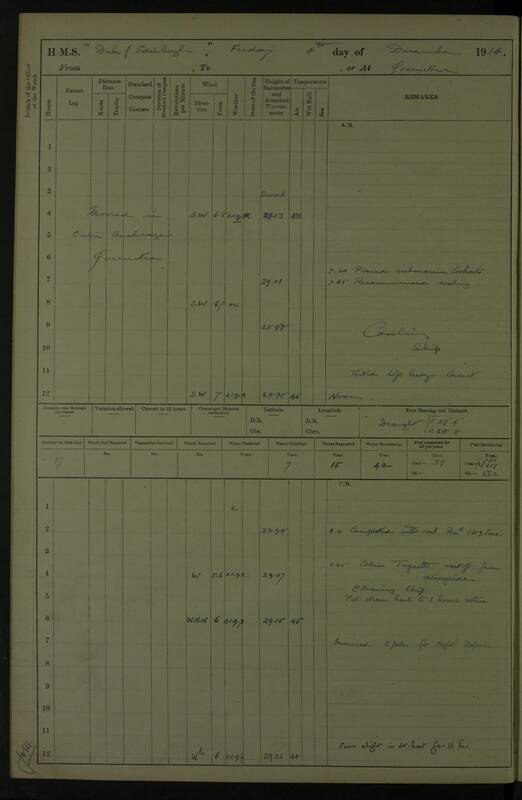 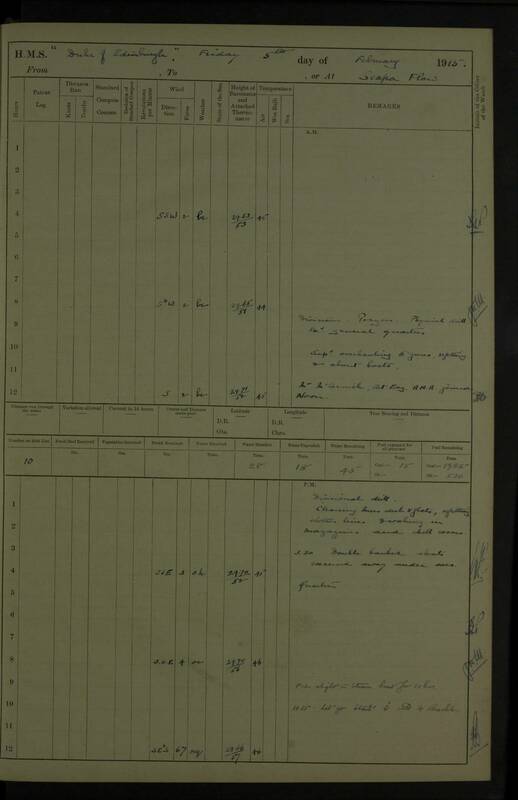 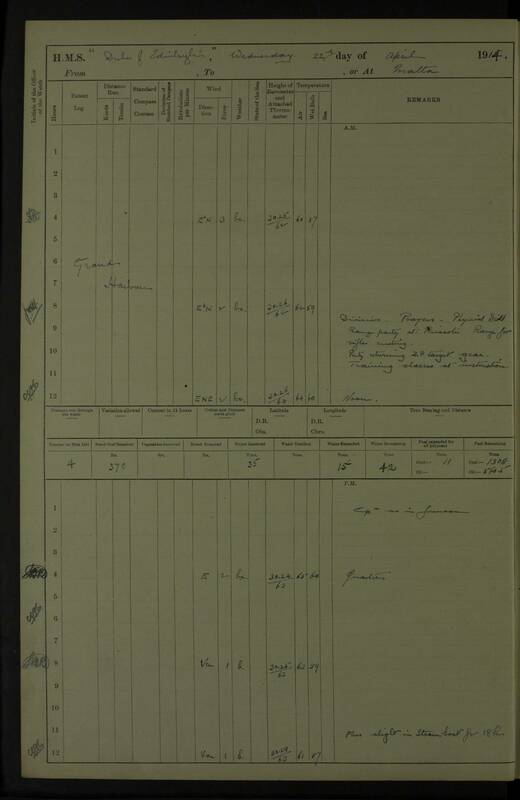 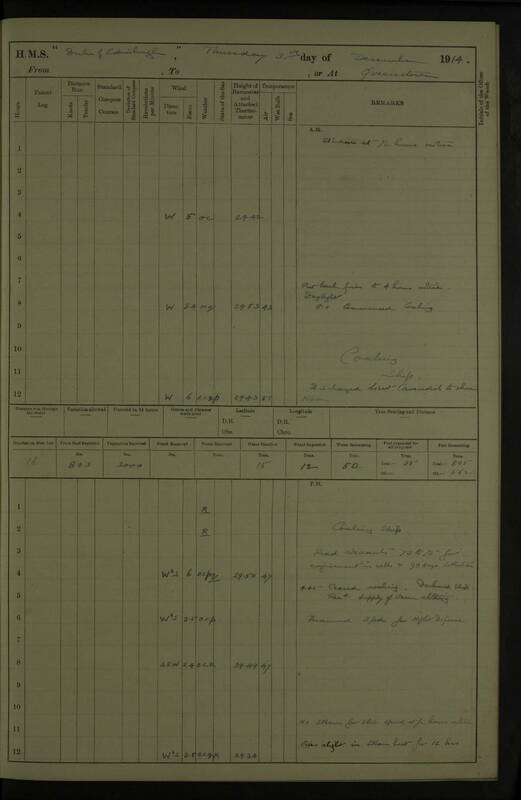 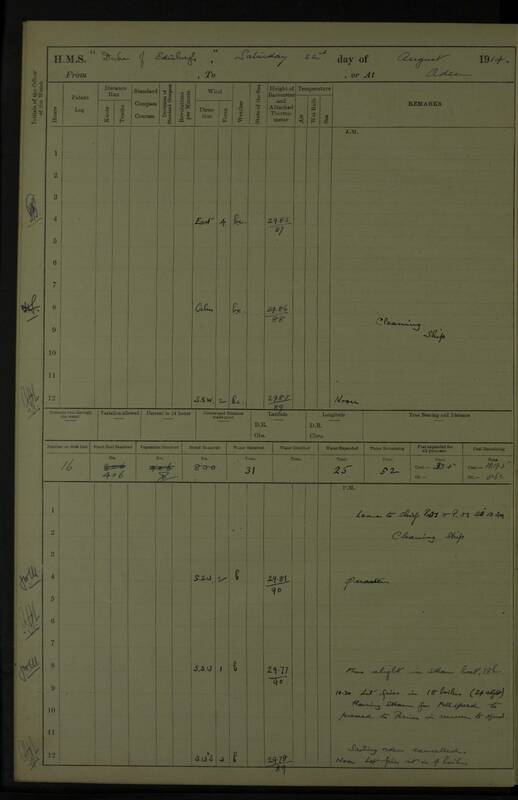 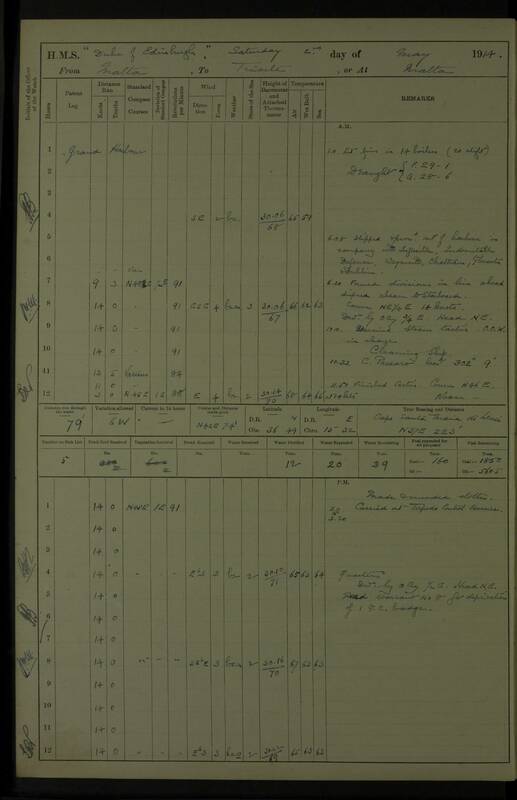 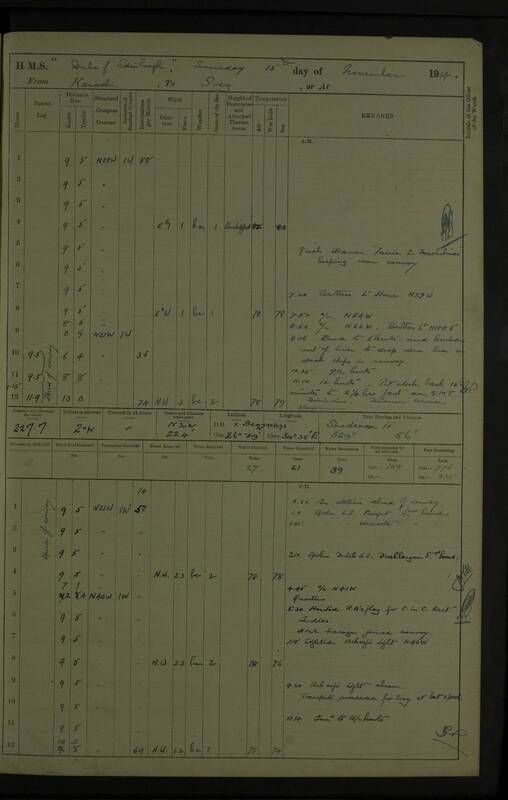 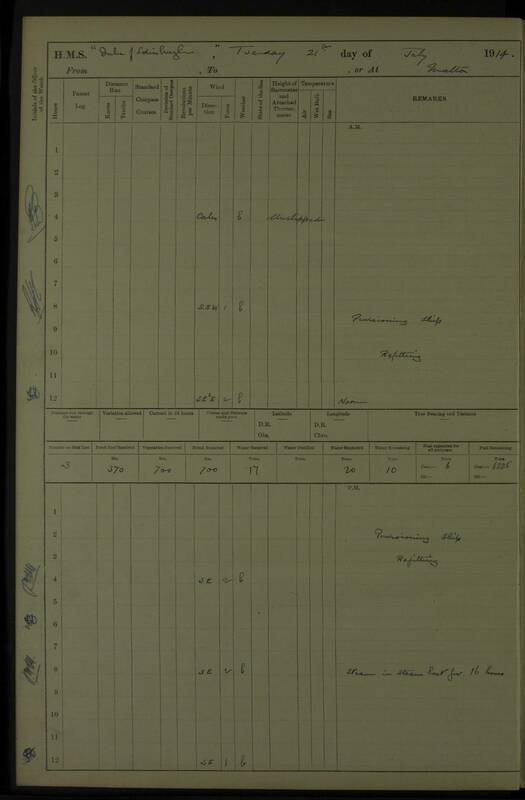 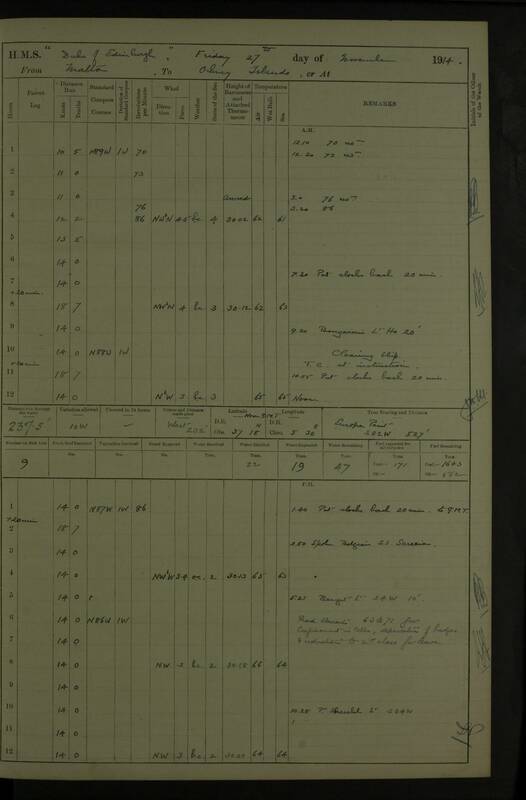 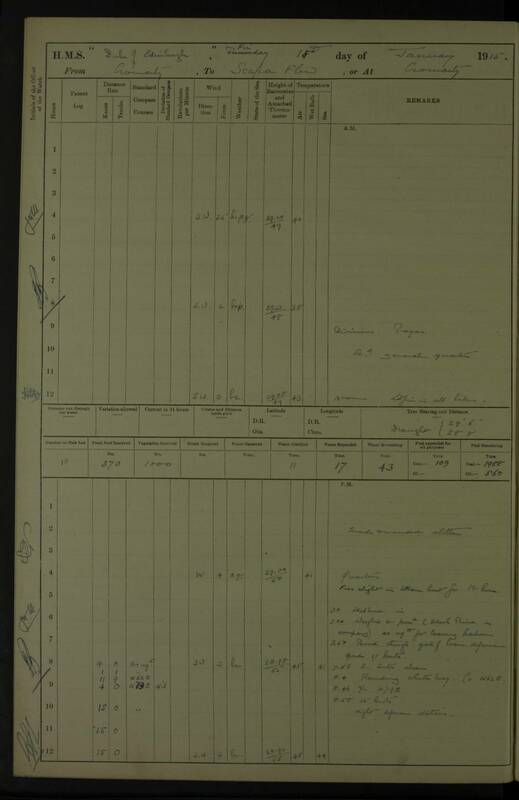 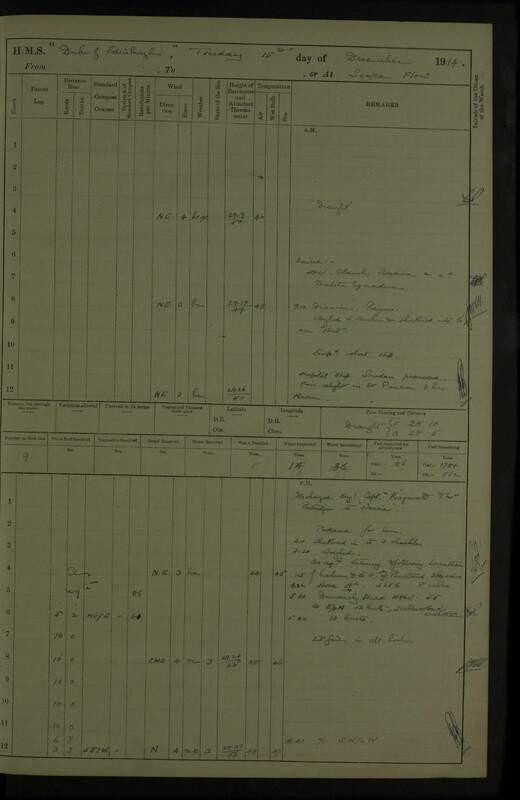 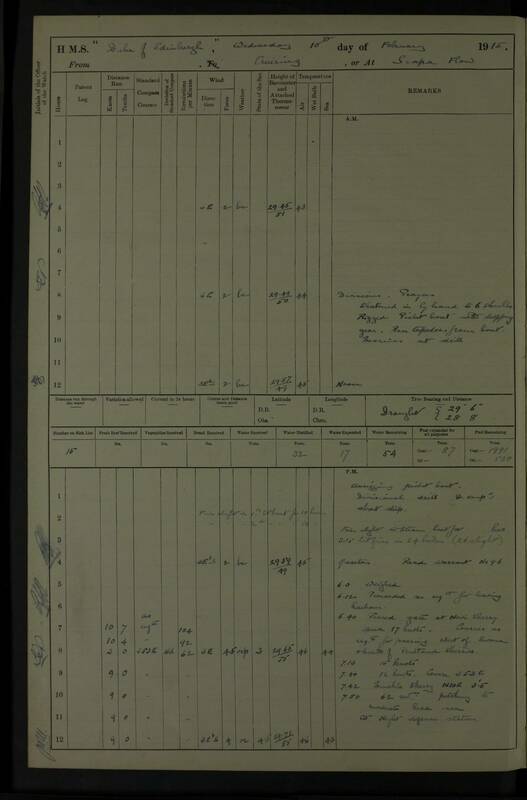 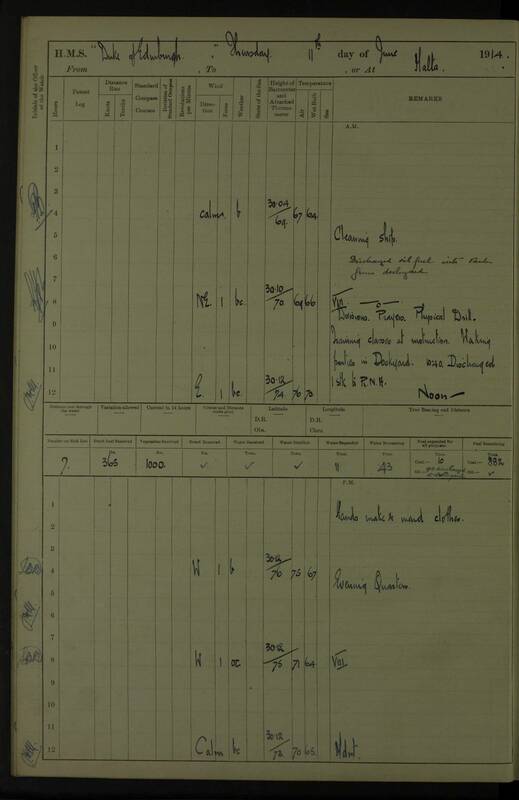 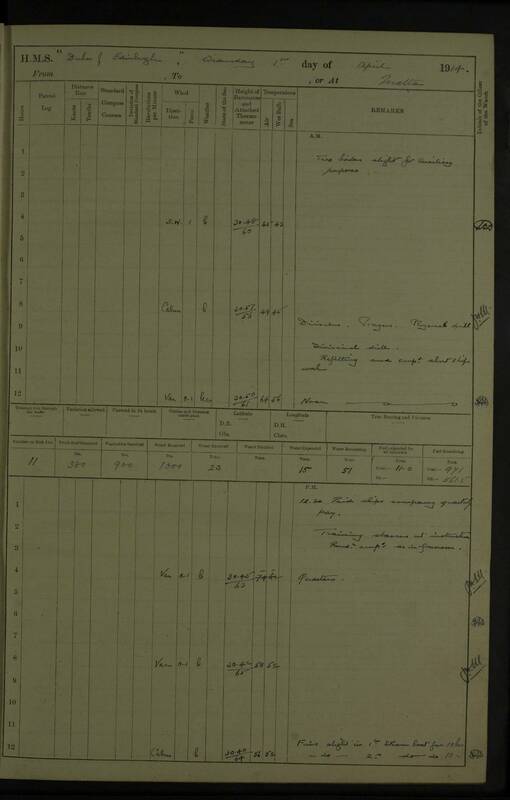 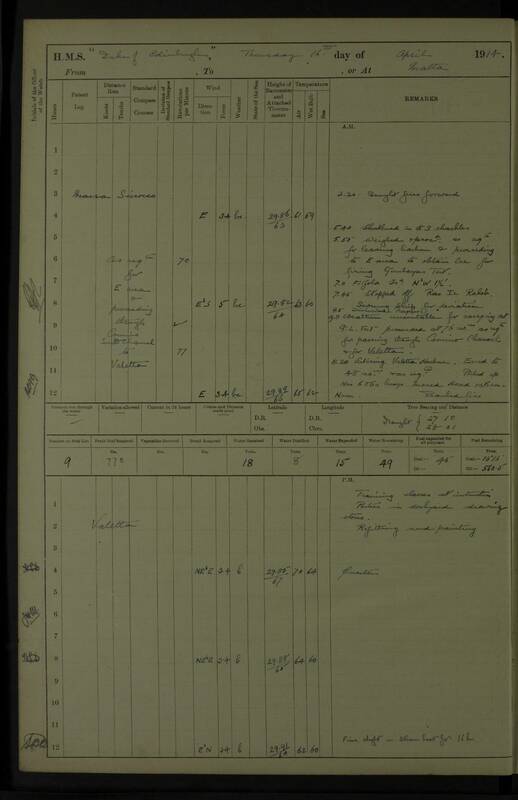 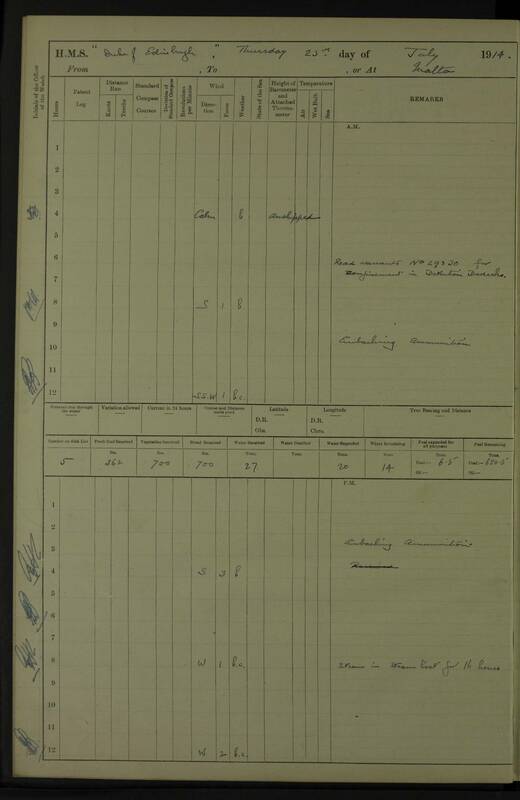 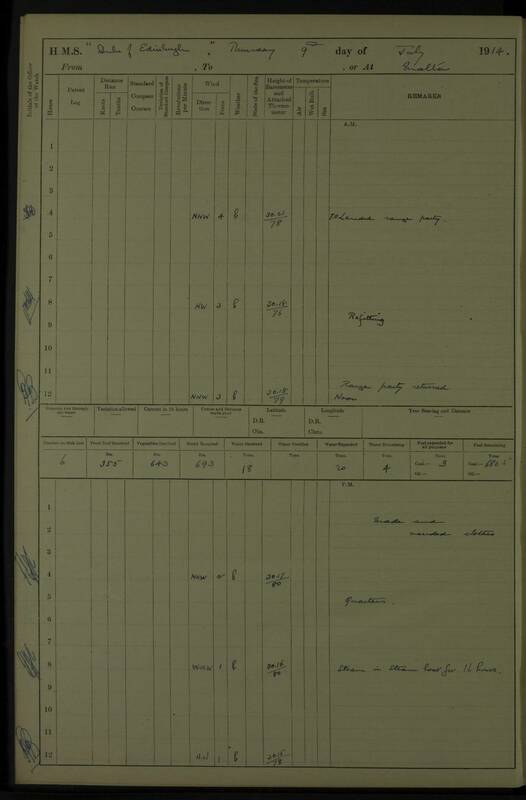 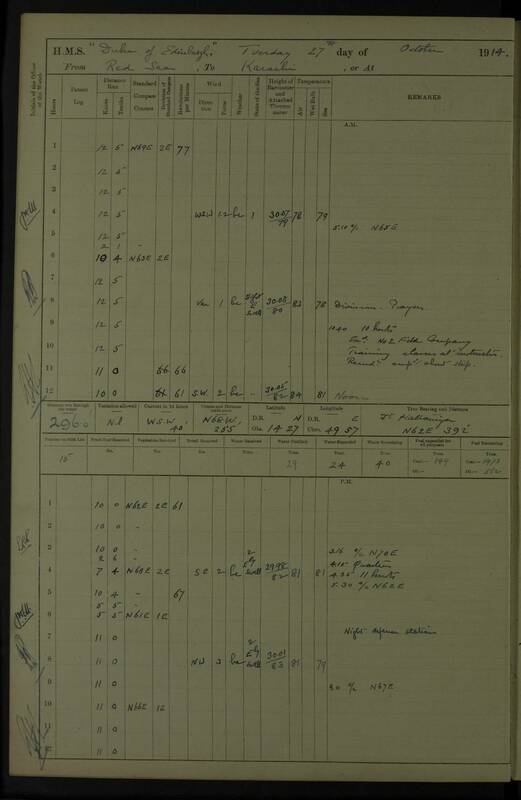 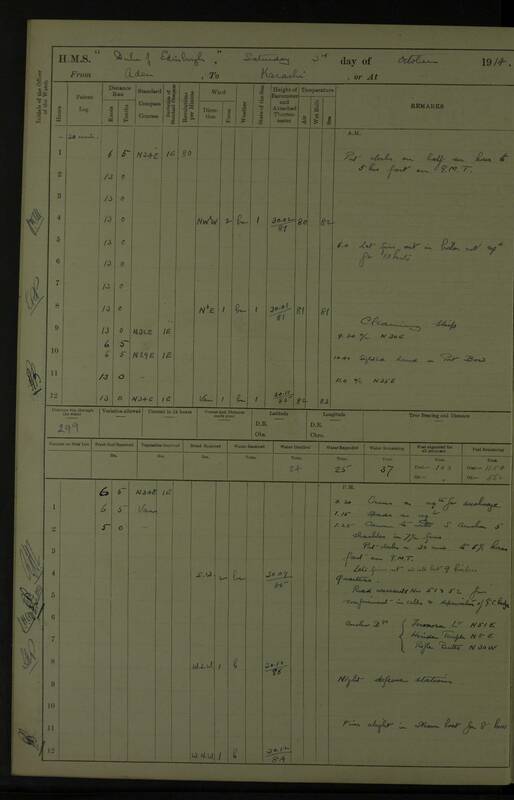 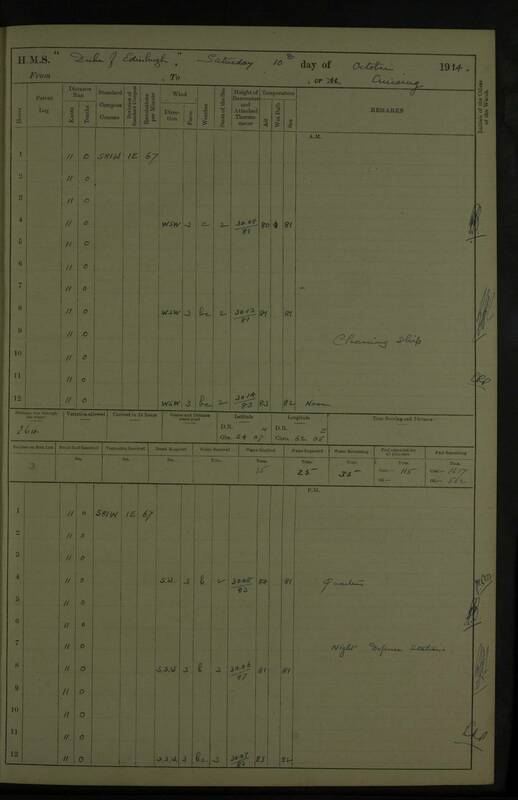 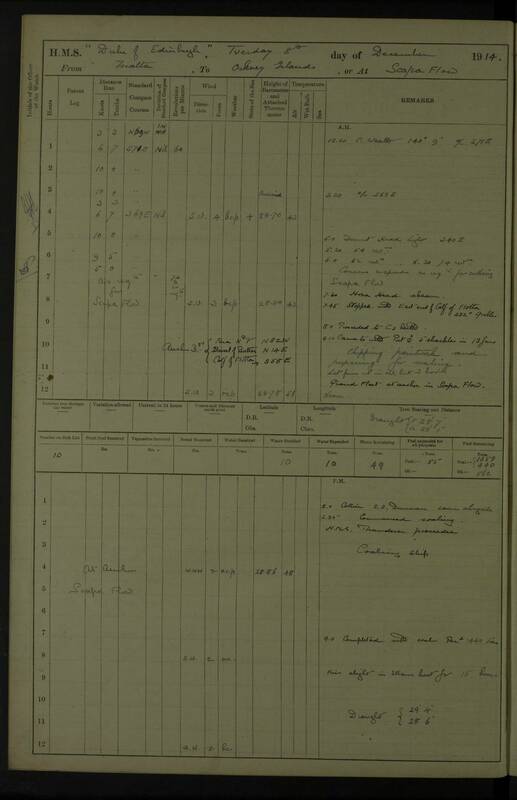 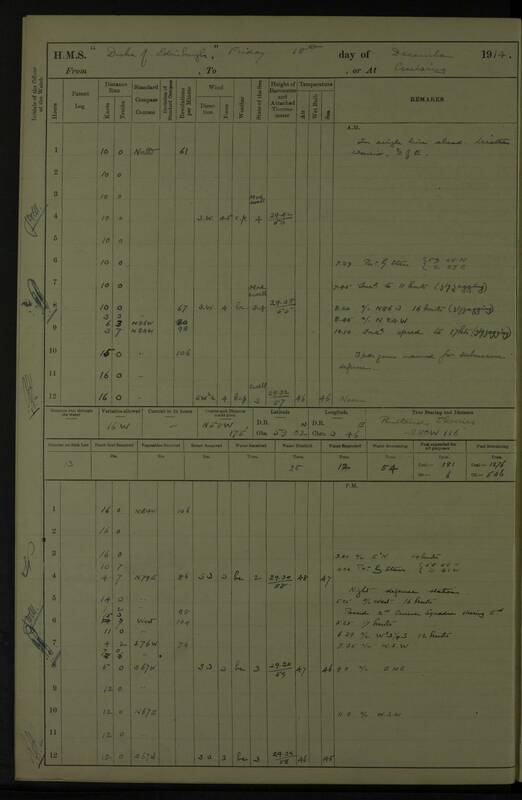 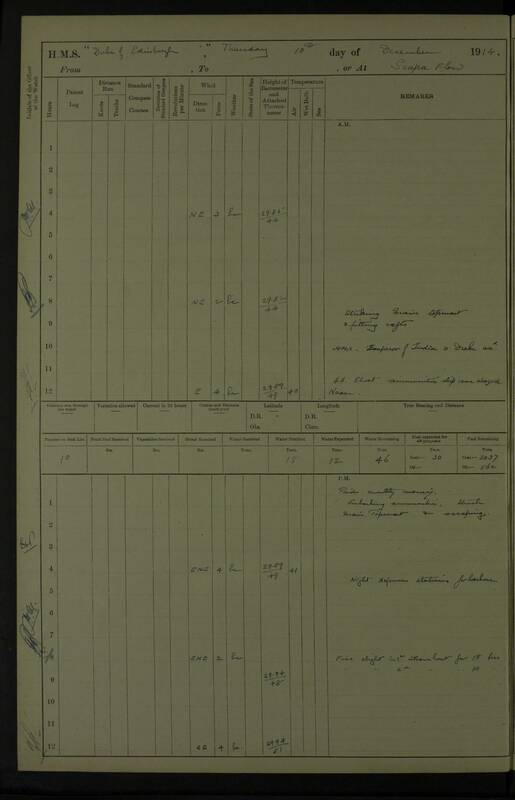 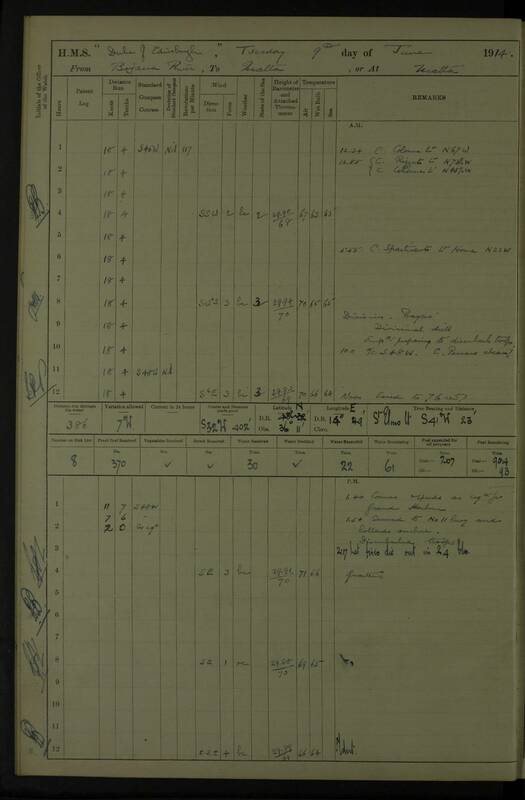 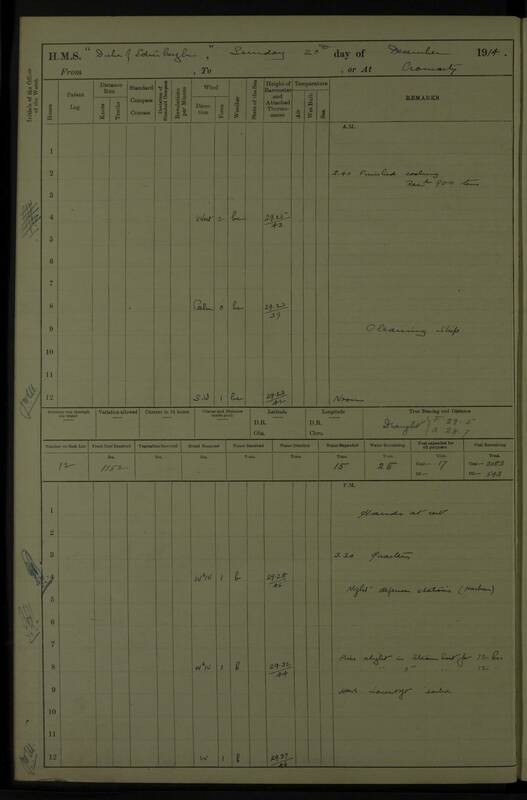 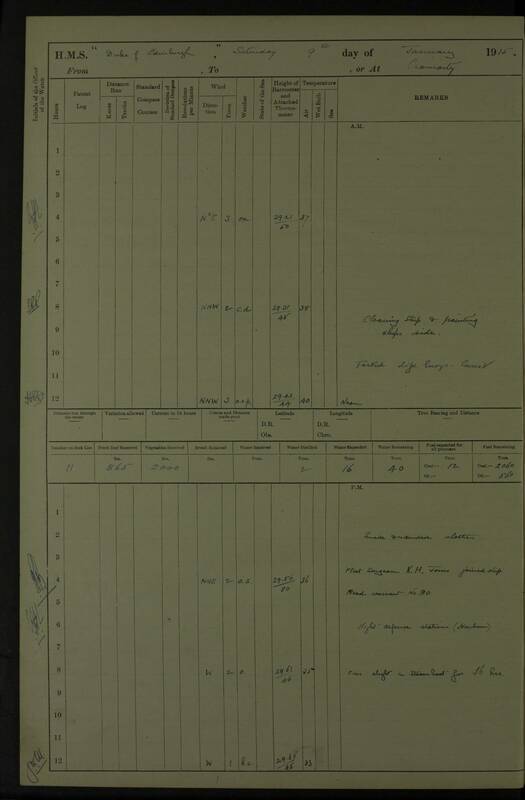 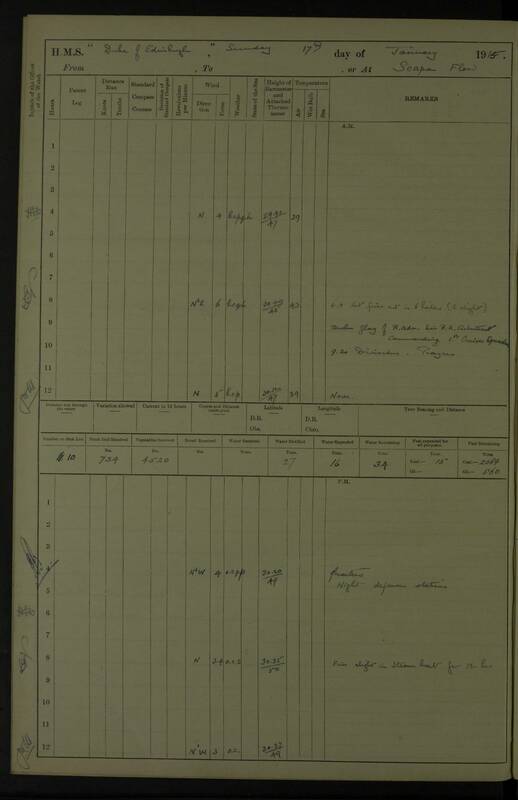 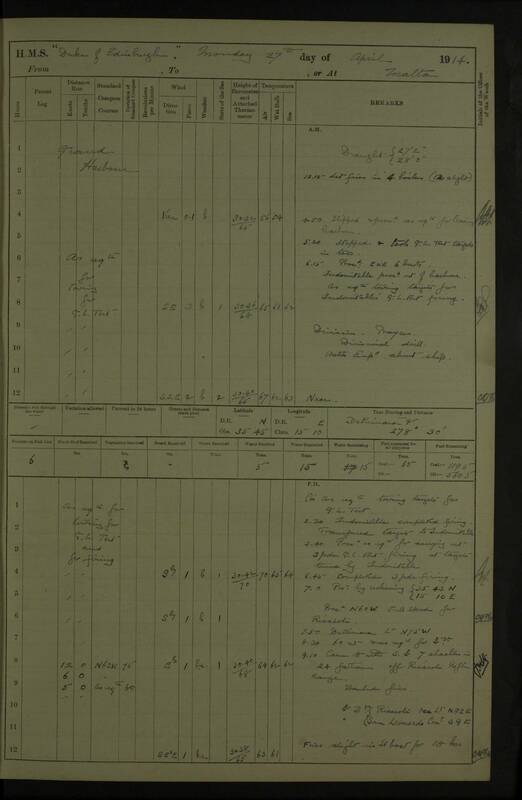 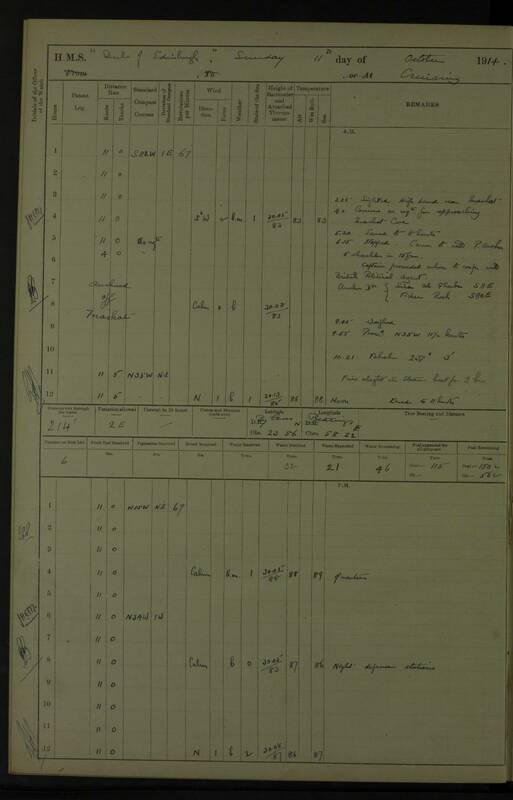 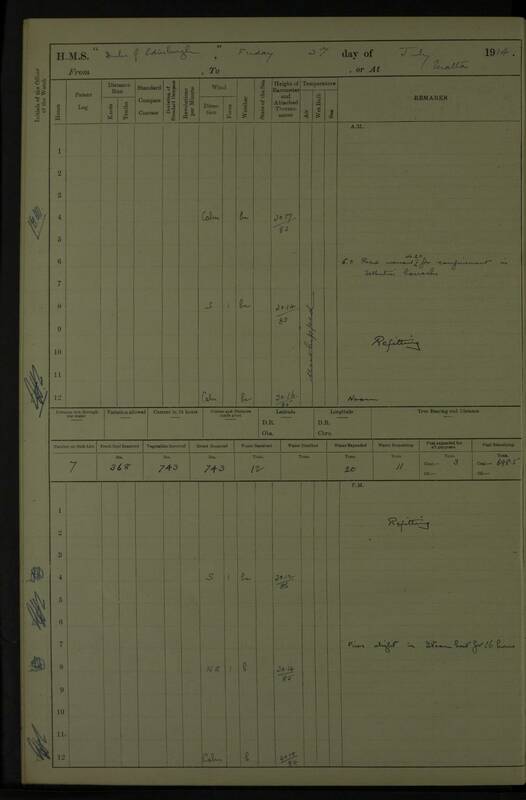 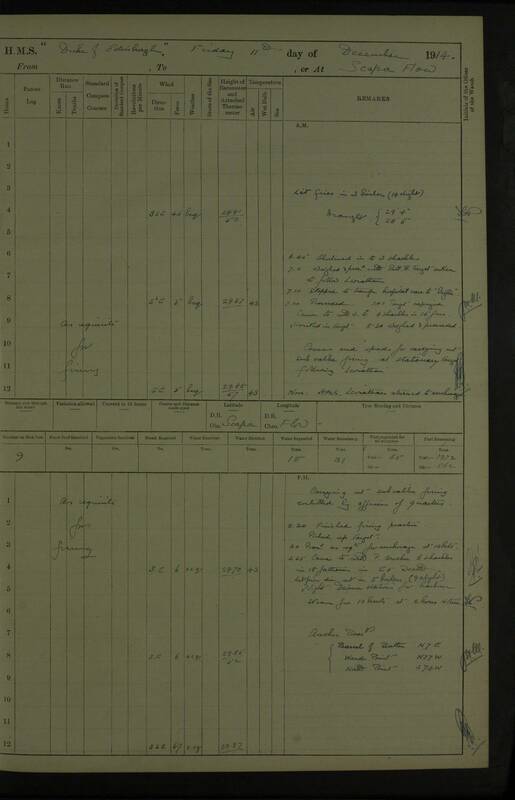 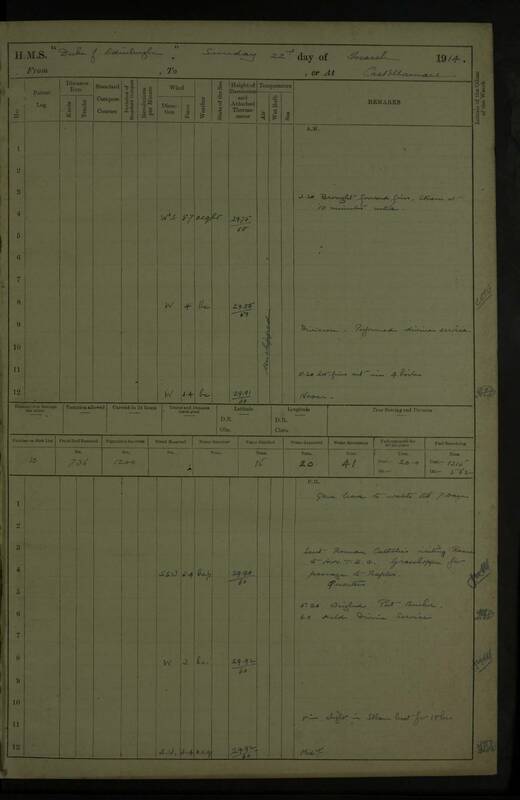 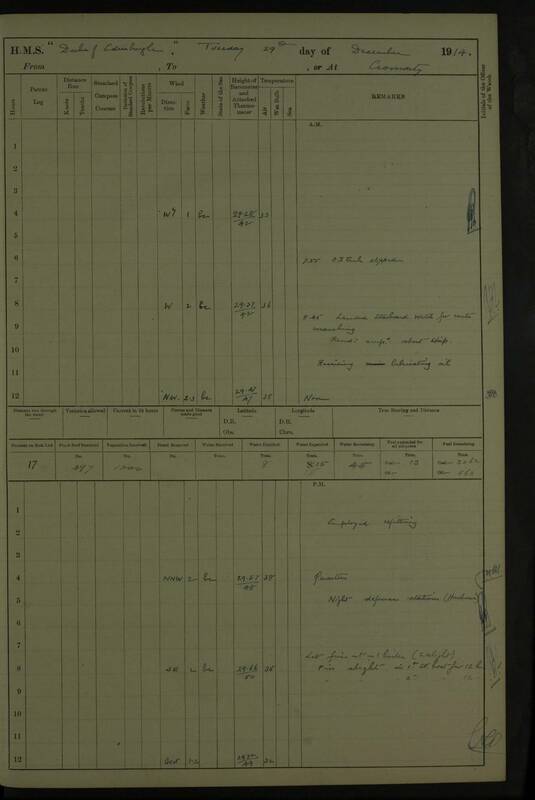 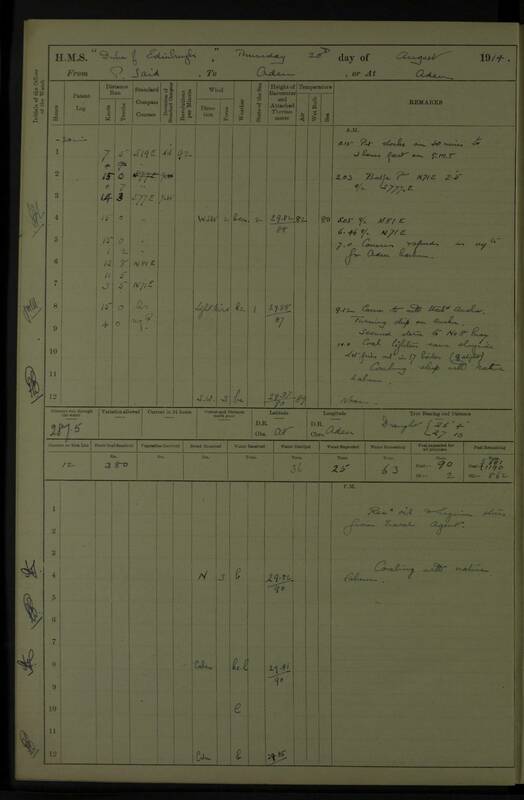 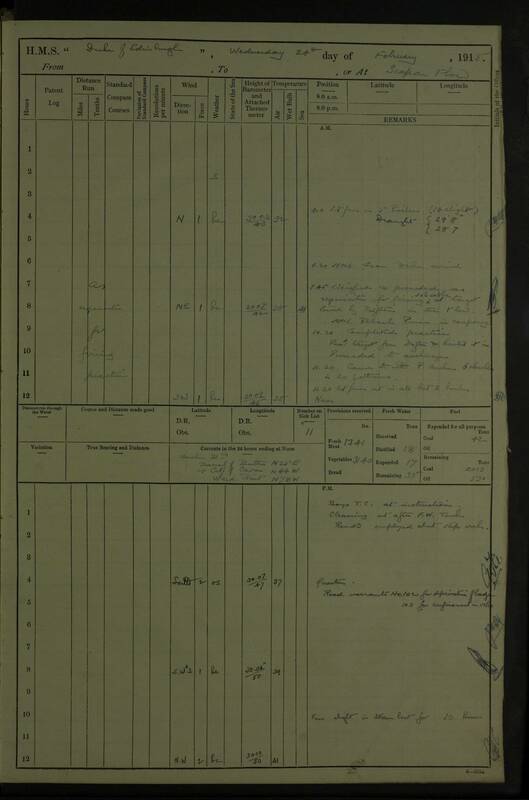 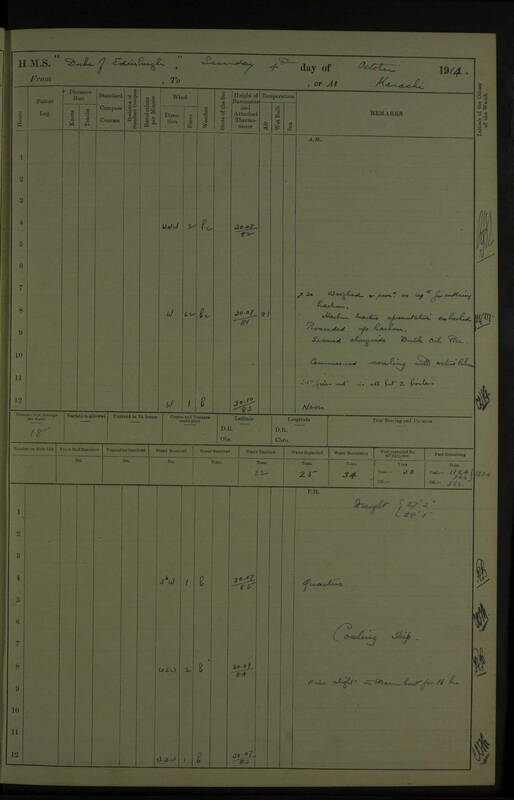 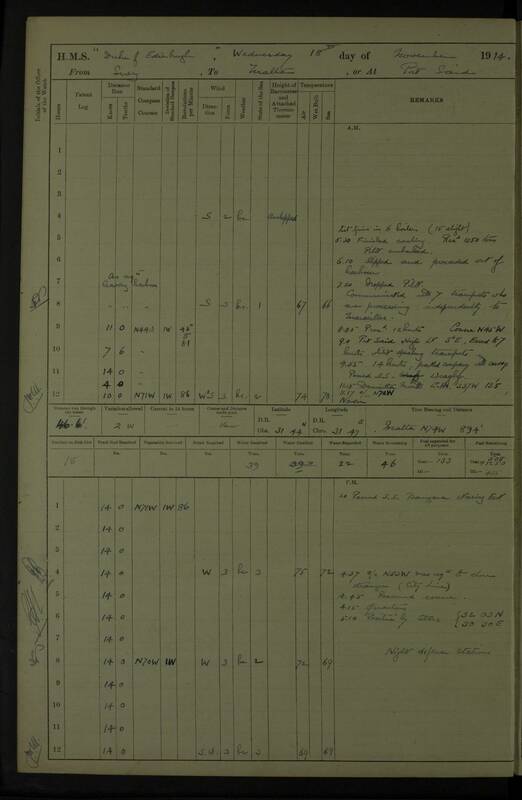 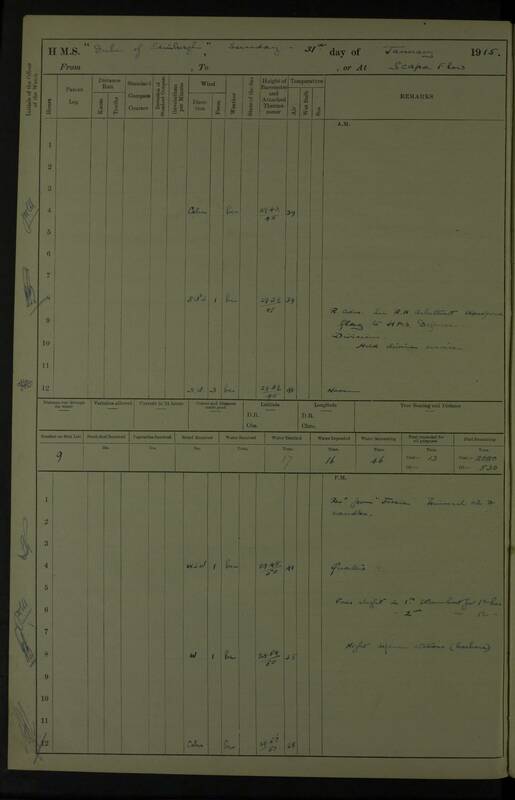 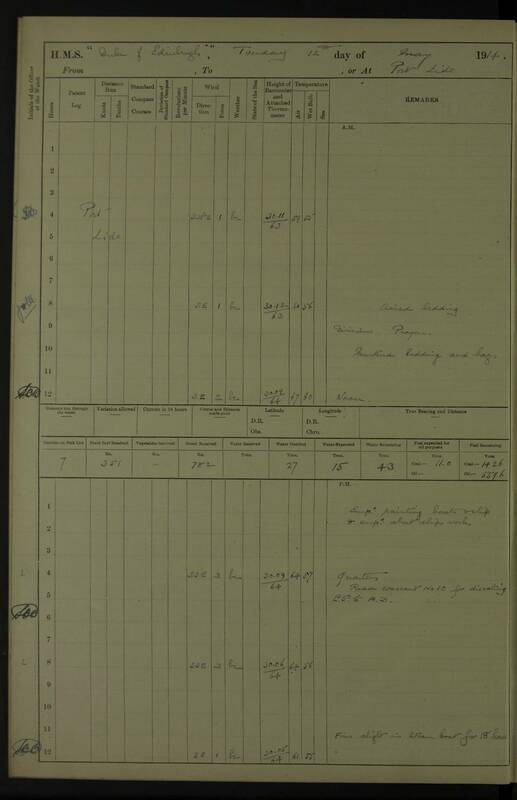 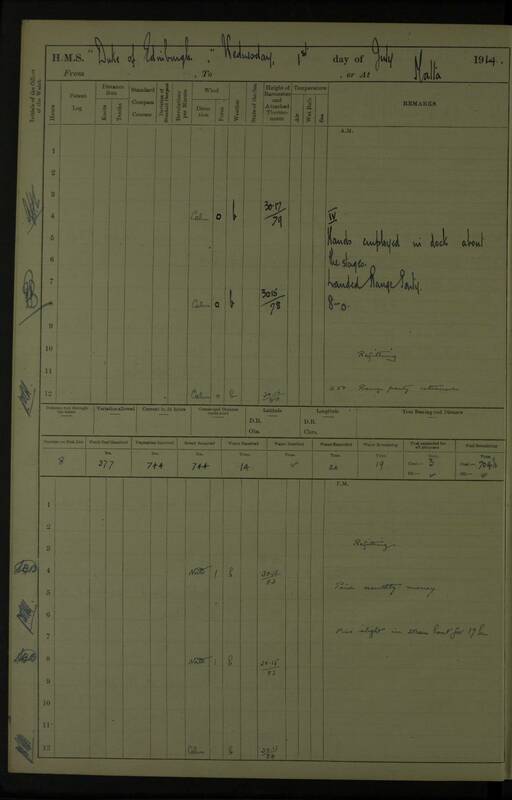 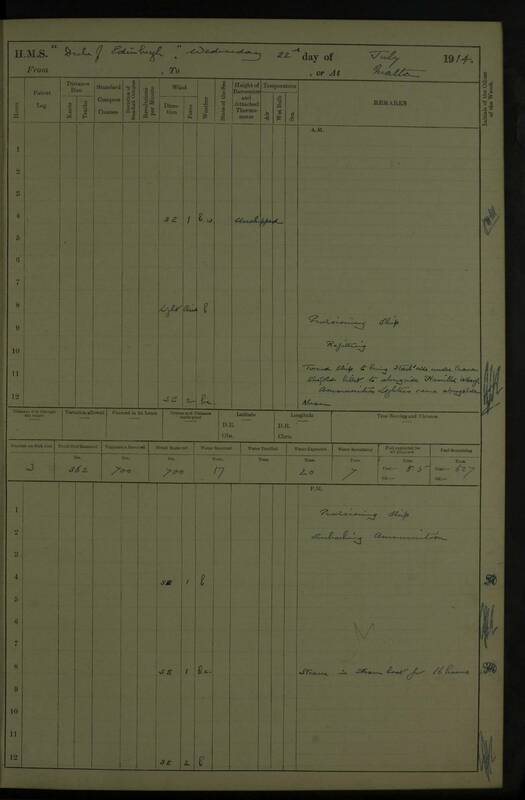 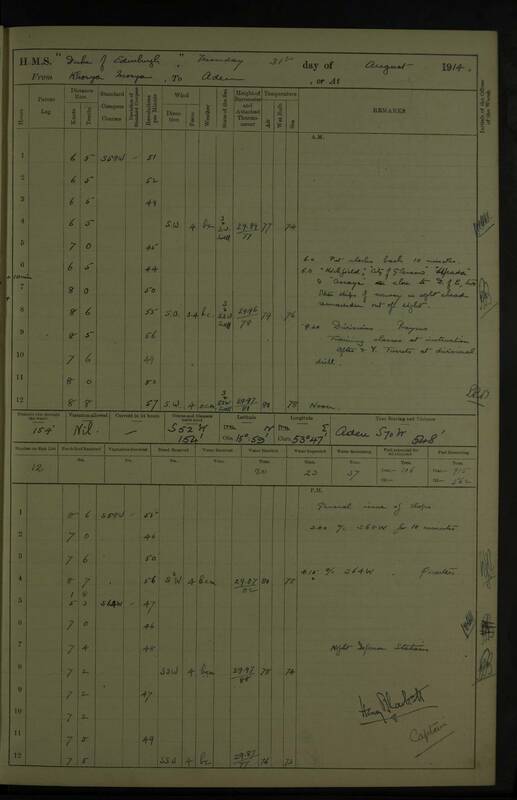 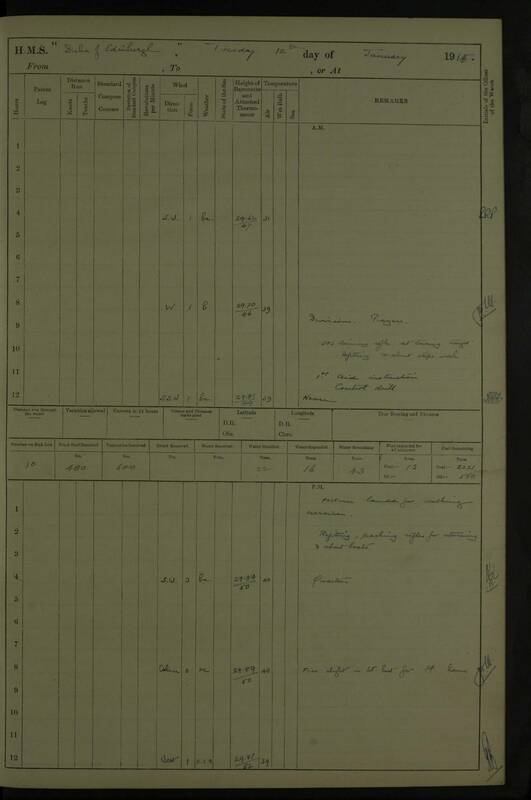 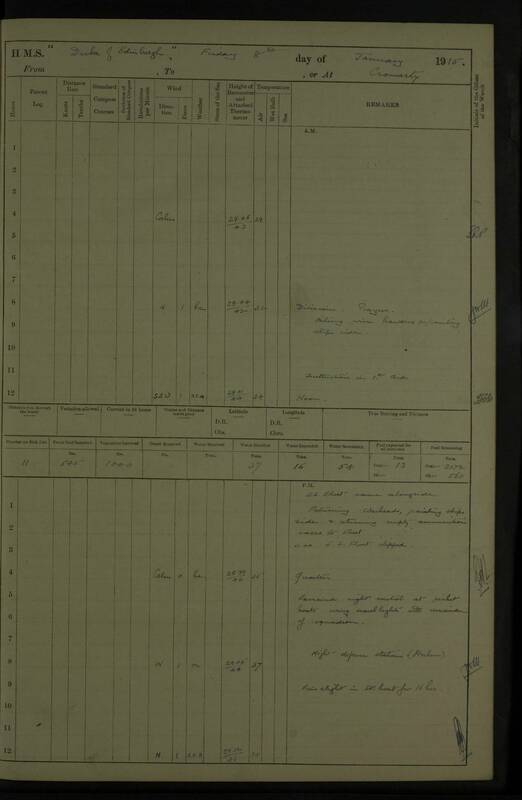 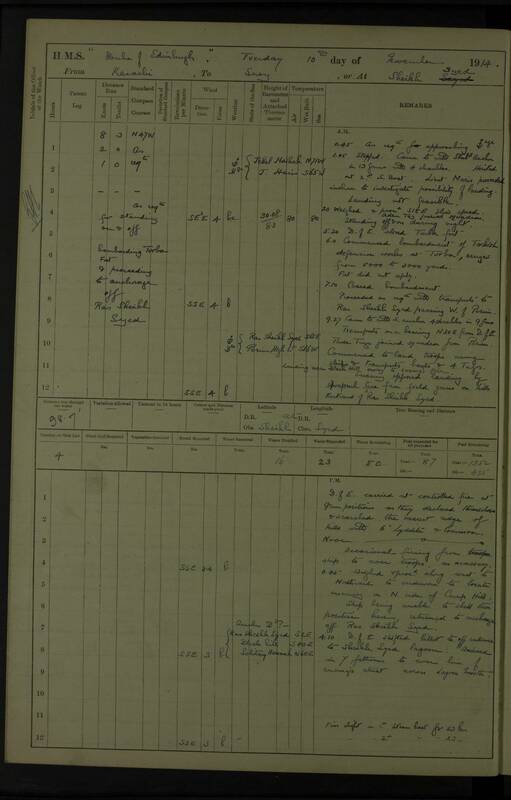 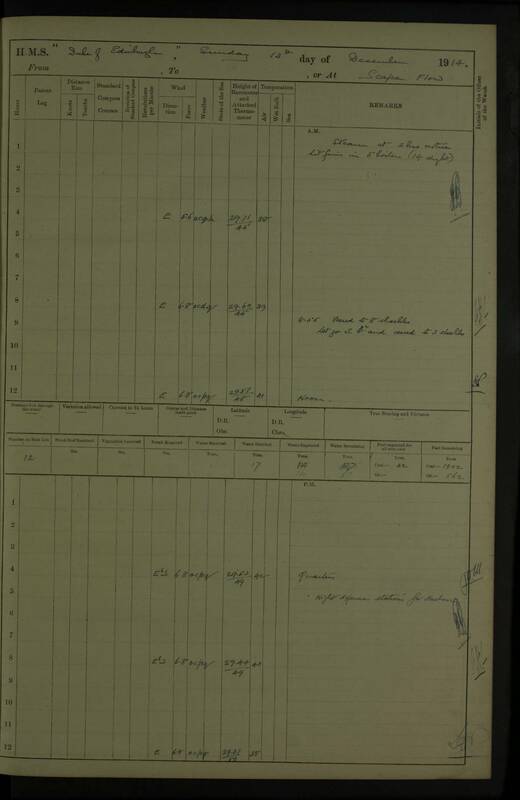 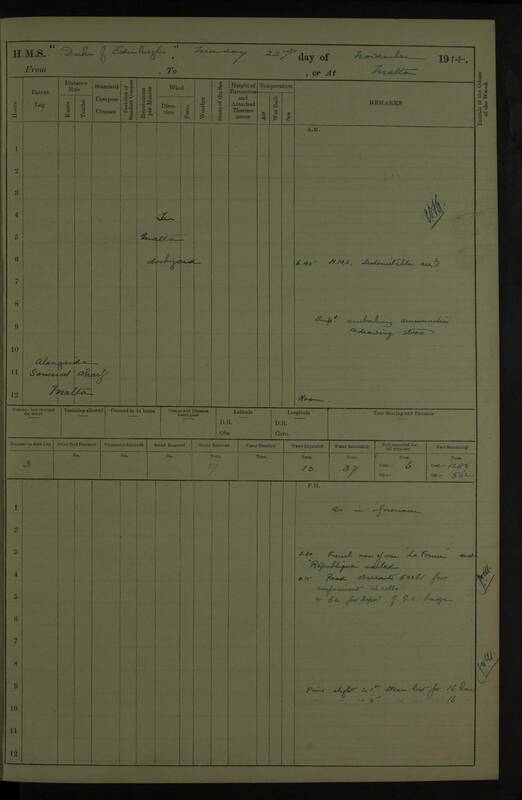 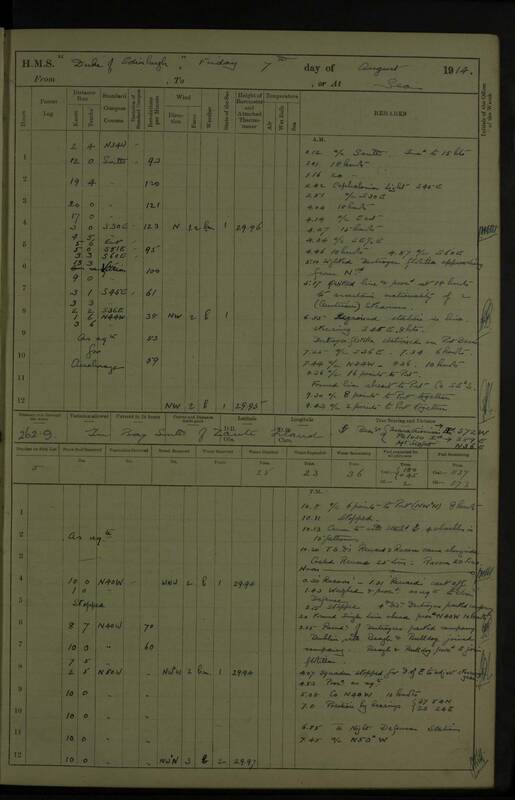 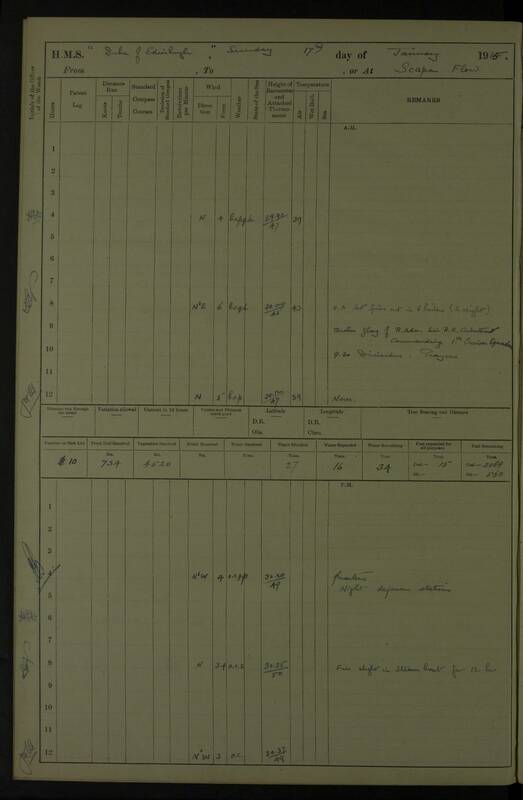 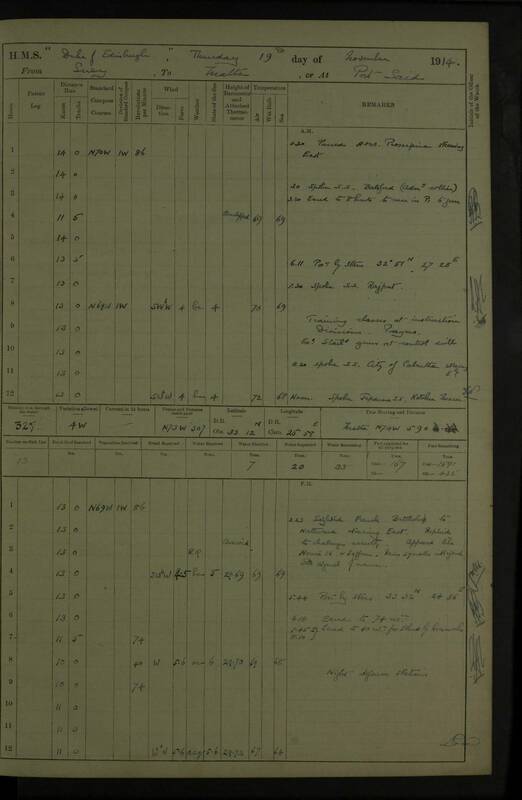 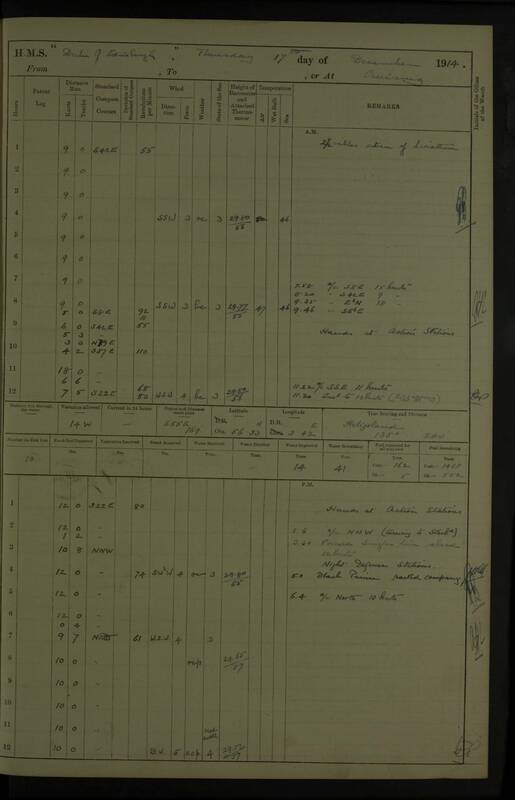 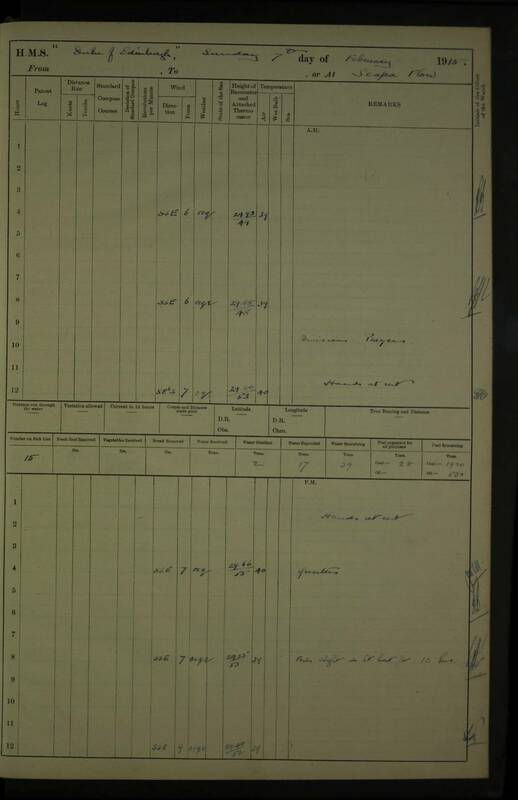 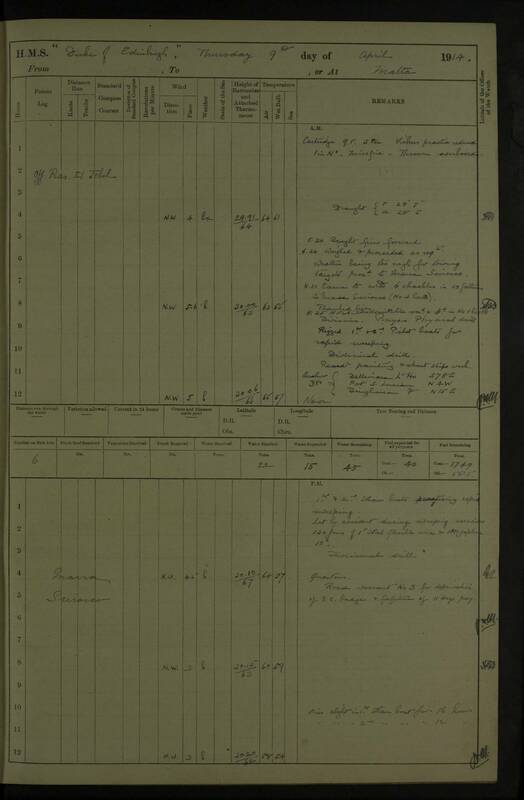 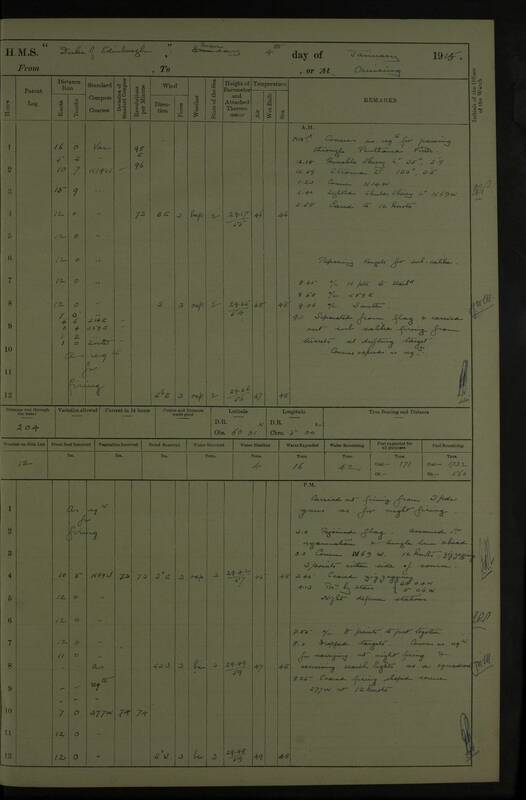 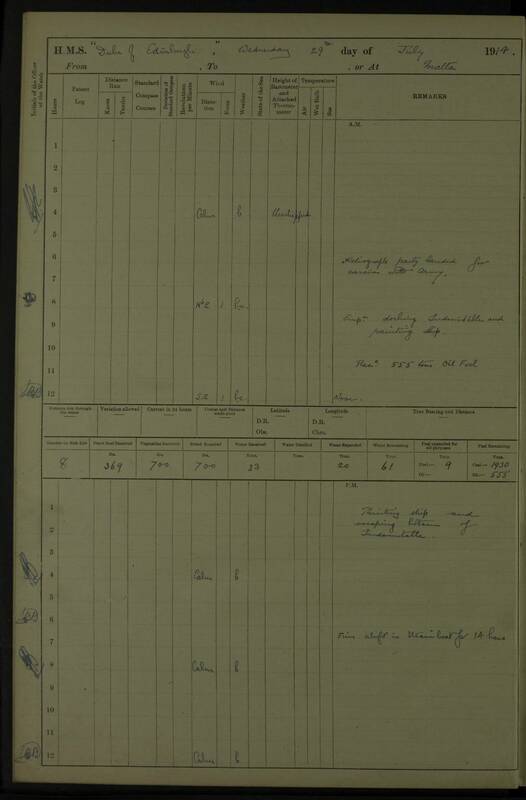 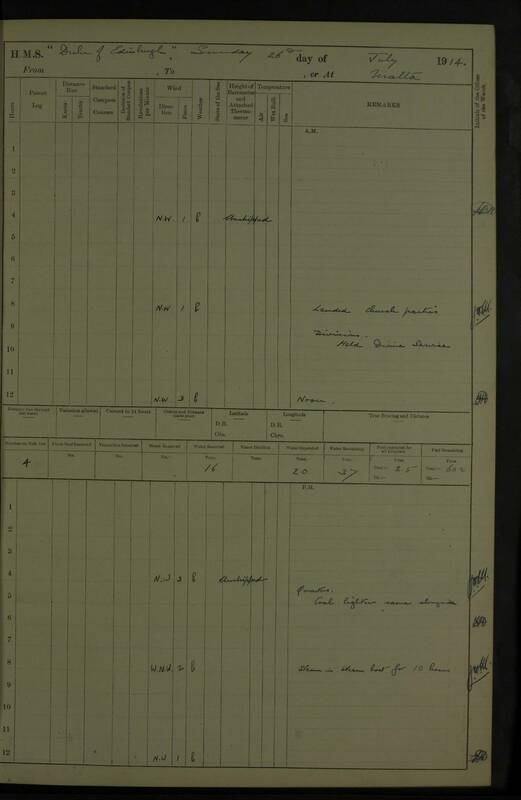 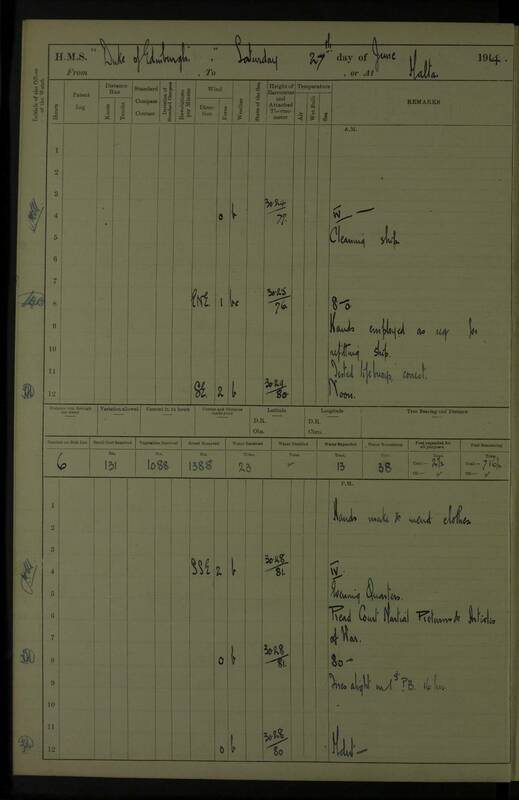 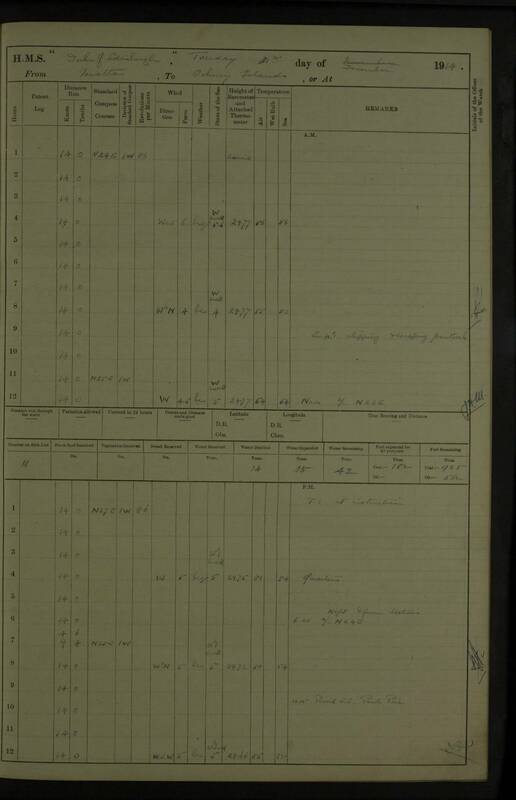 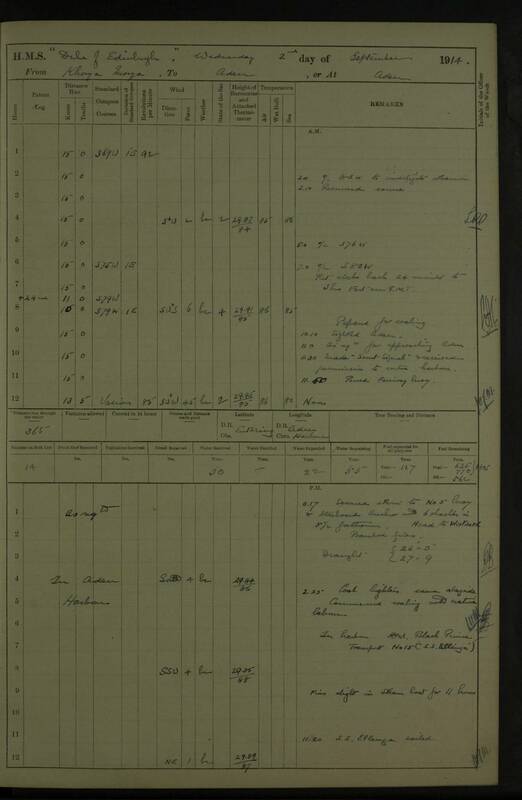 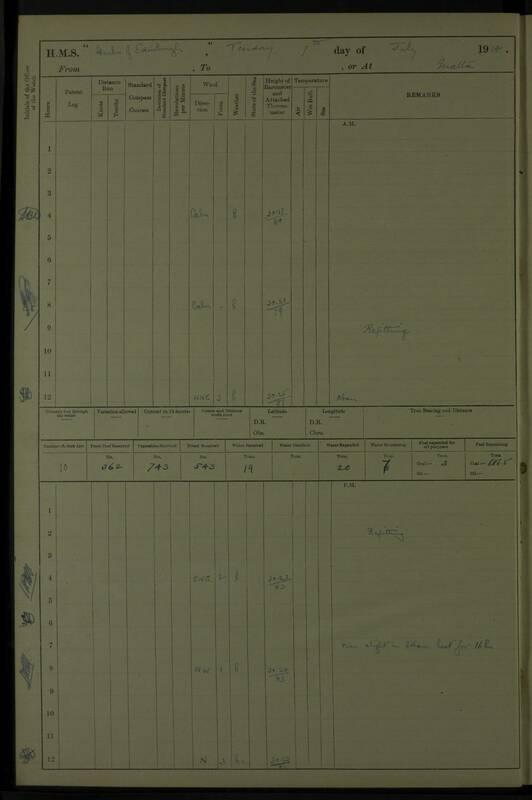 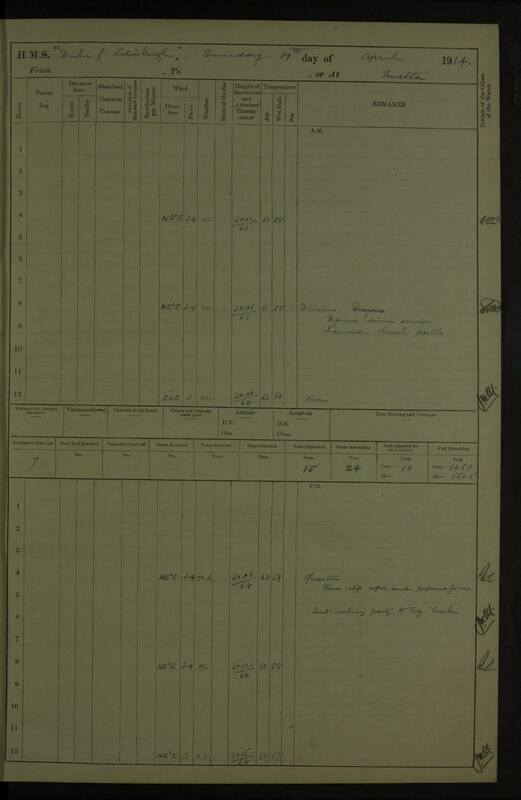 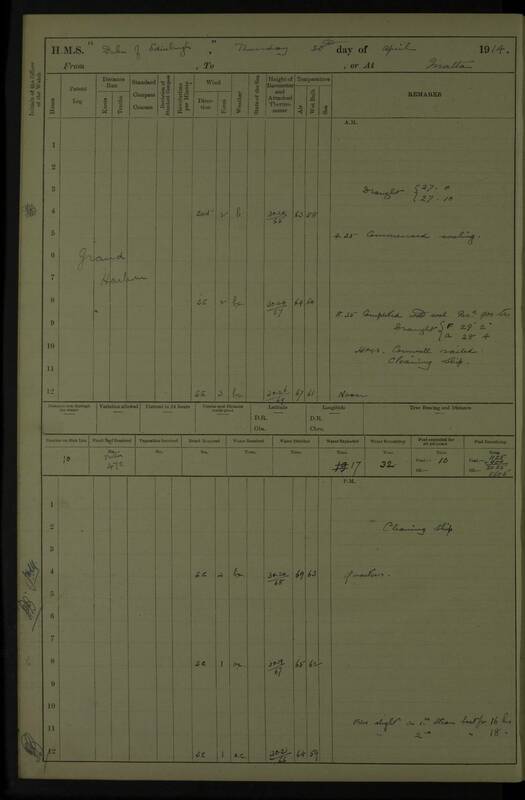 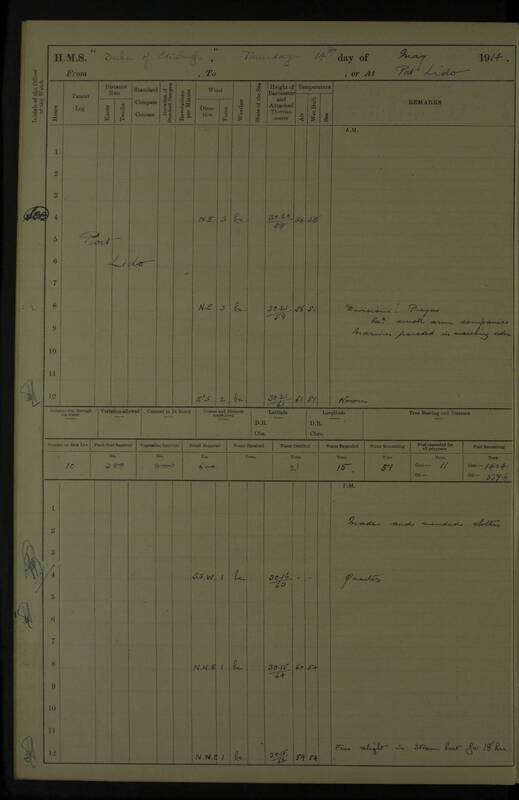 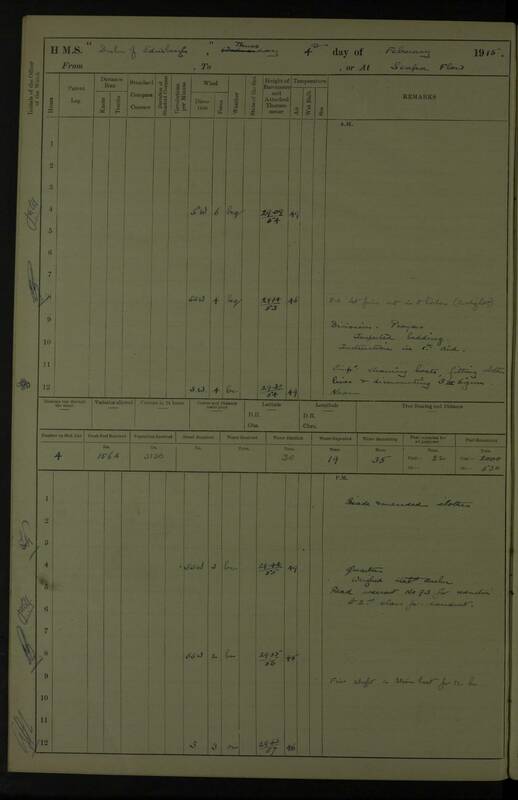 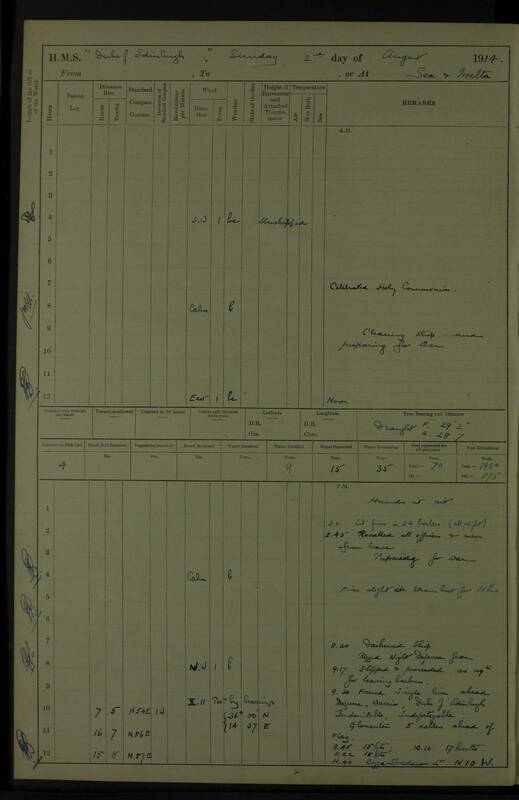 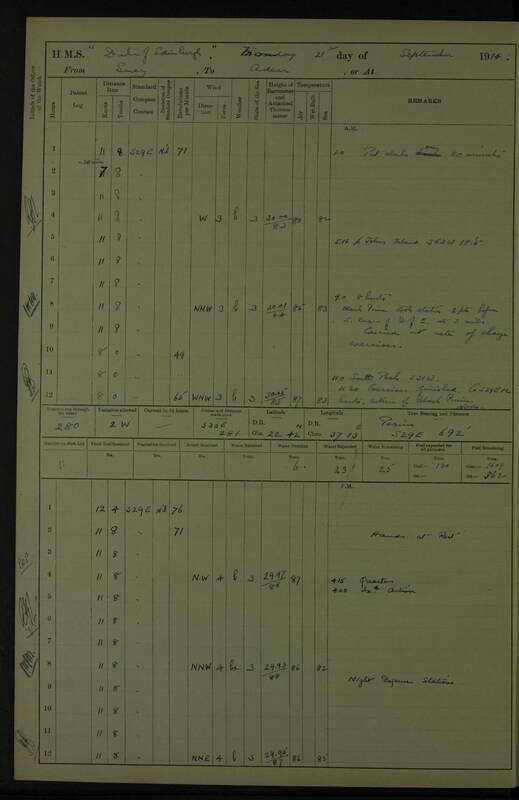 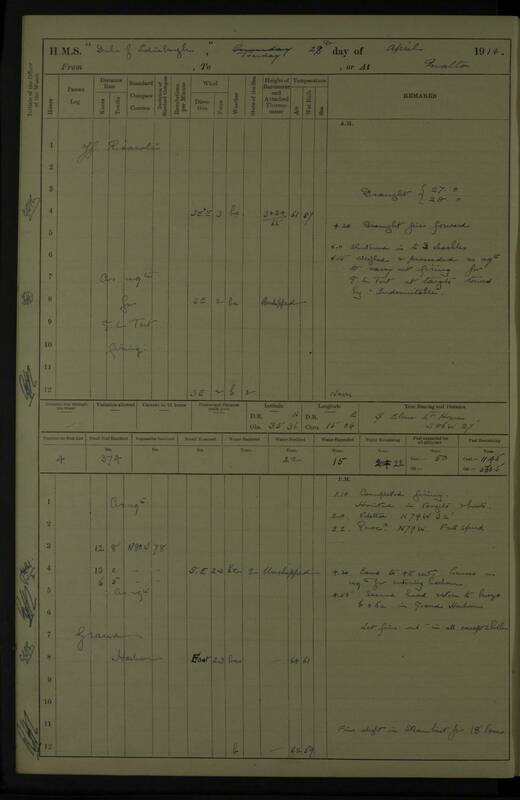 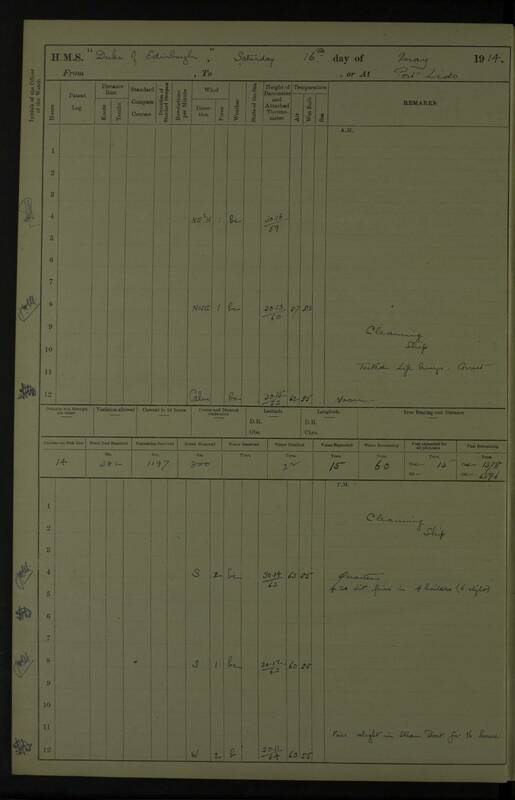 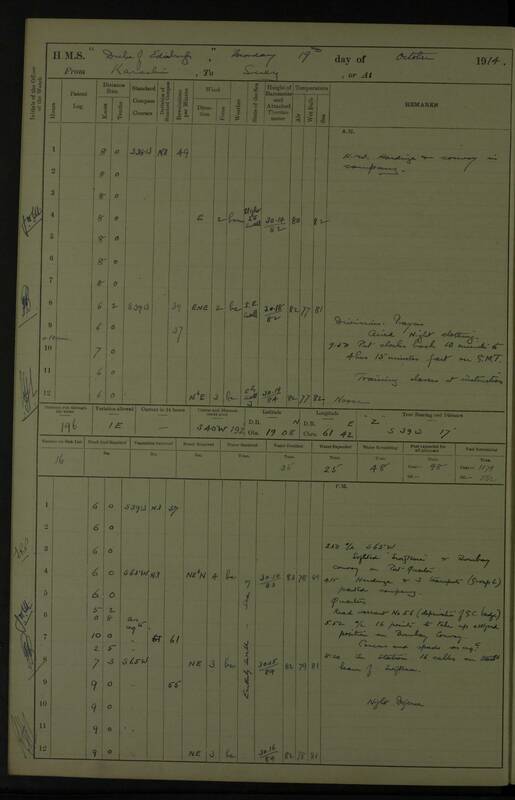 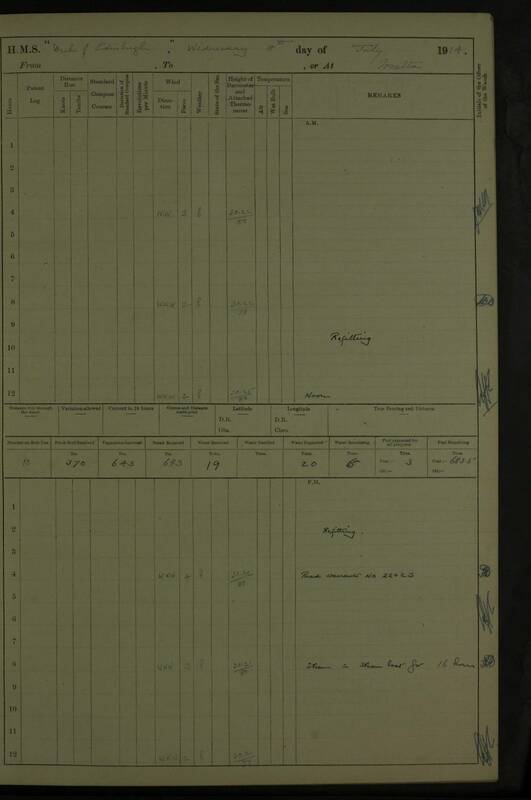 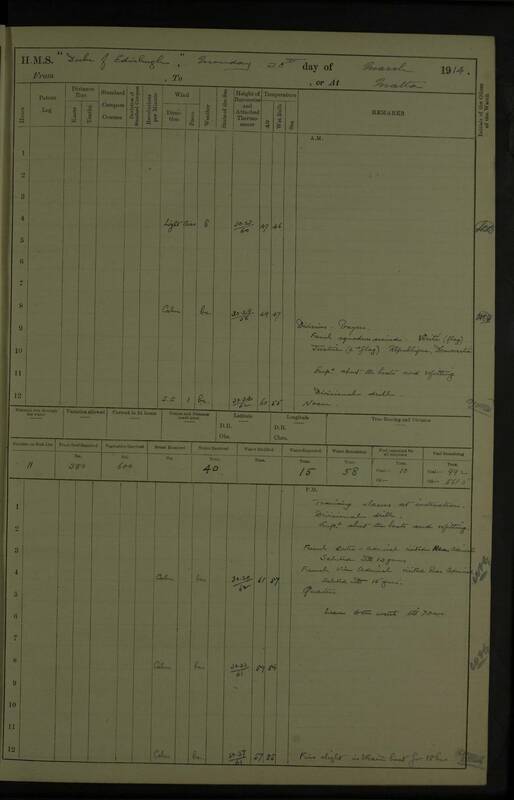 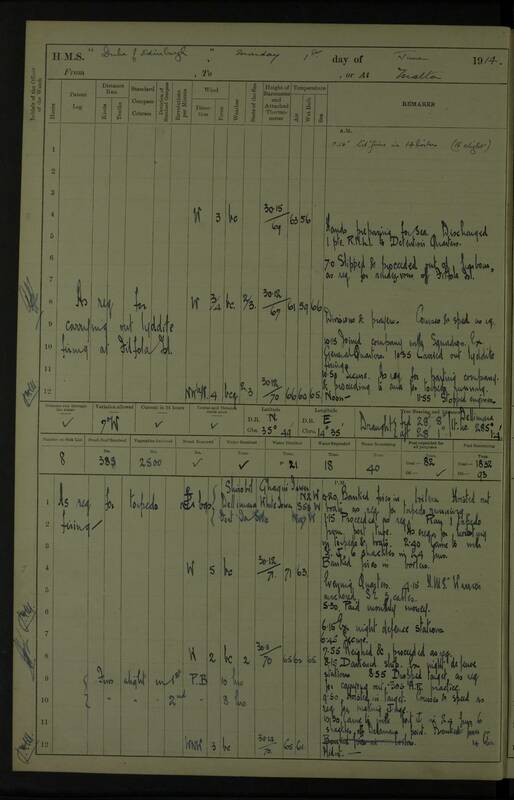 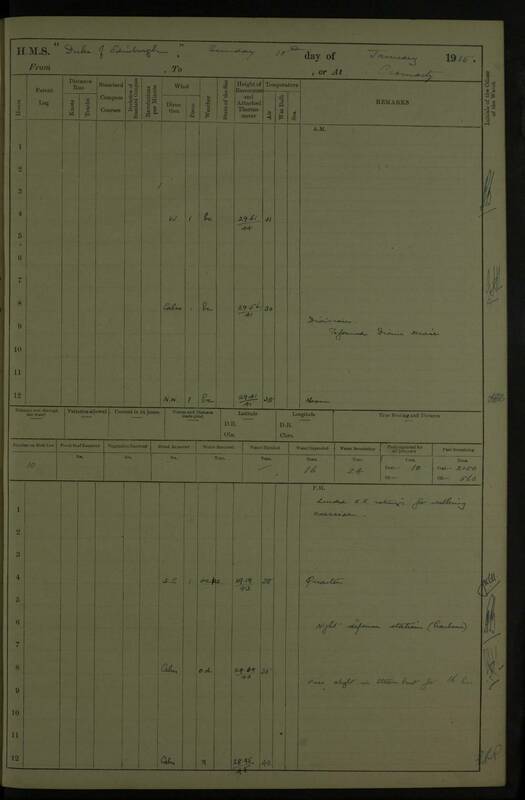 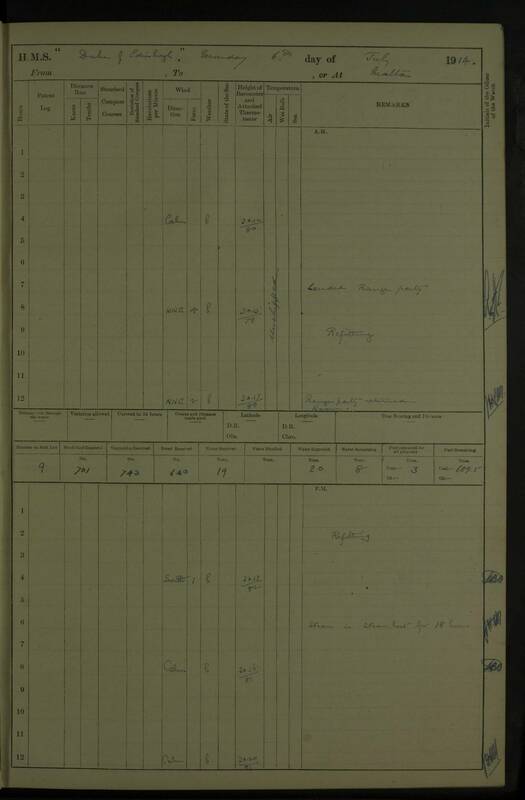 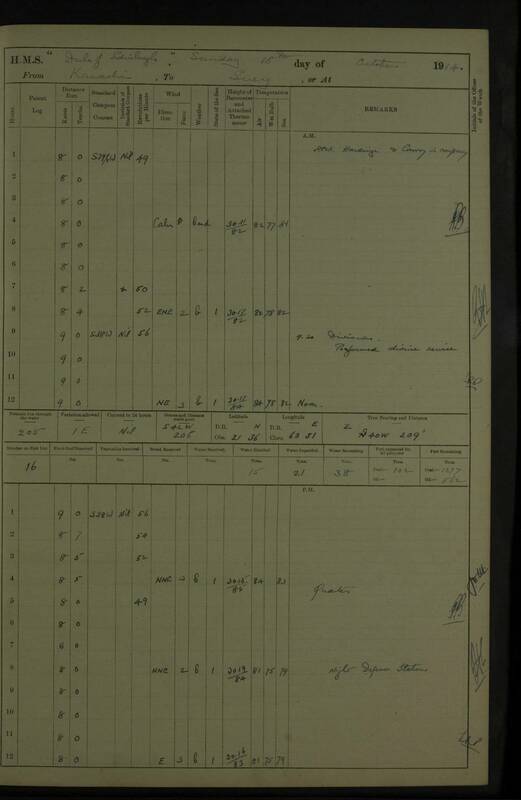 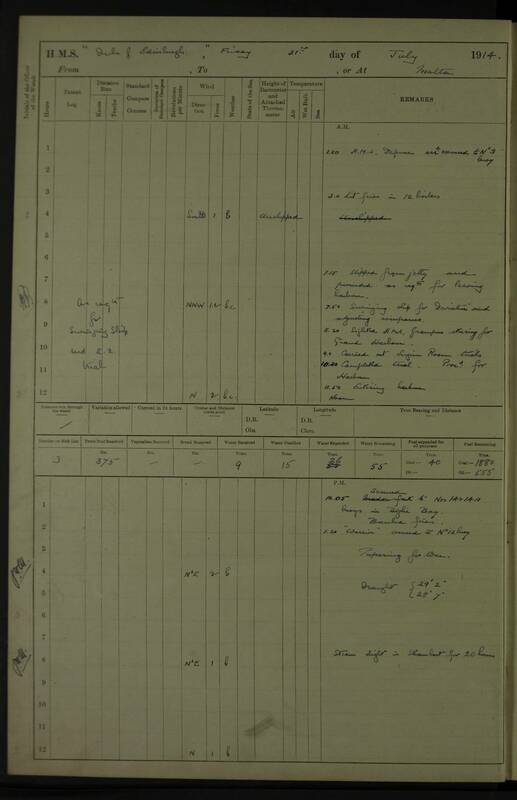 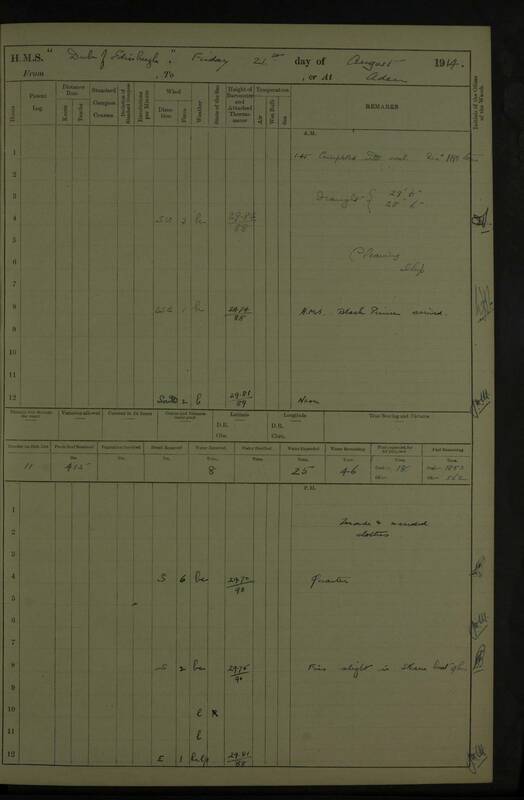 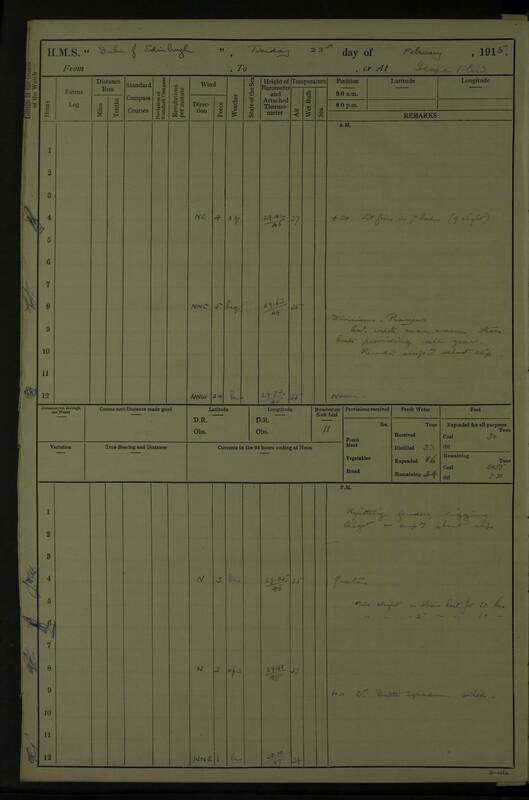 This is identical to the scan for 18 January 1915 above. 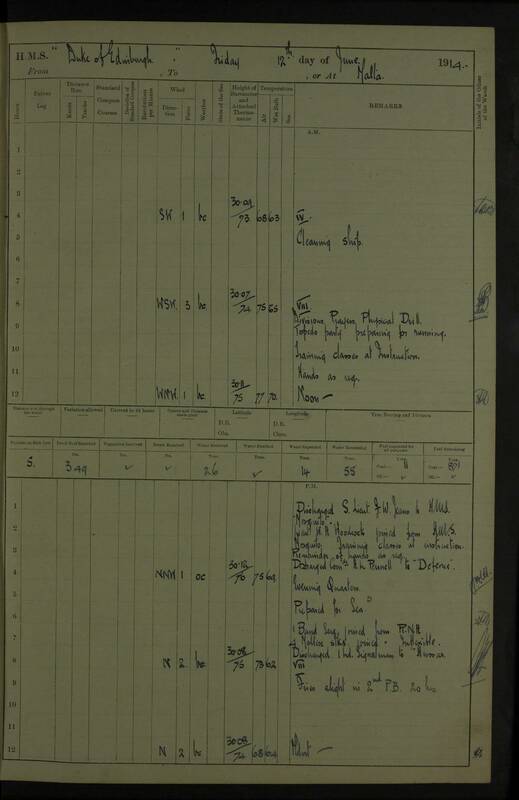 8.10 am: DEFENCE and WARRIOR proceeded to carry out gunnery and torpedo exercises in Flow. 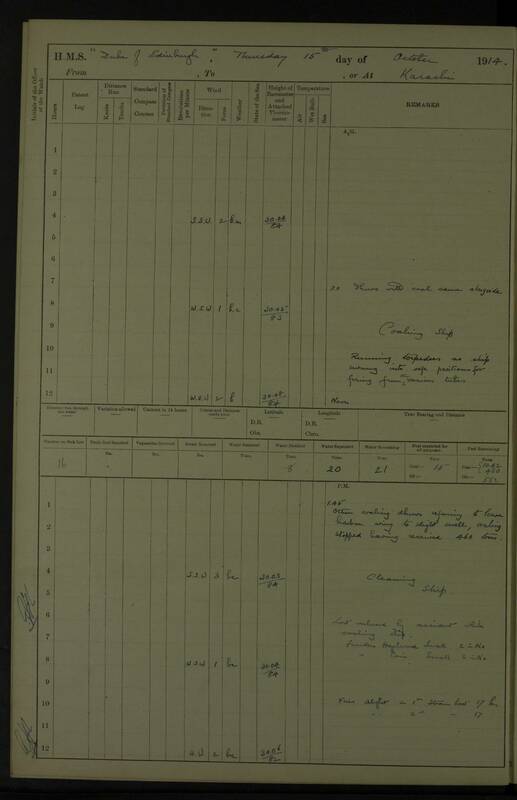 7:40 am: Collier KILDONAN came alongside; 8:50 am: Commenced coaling. 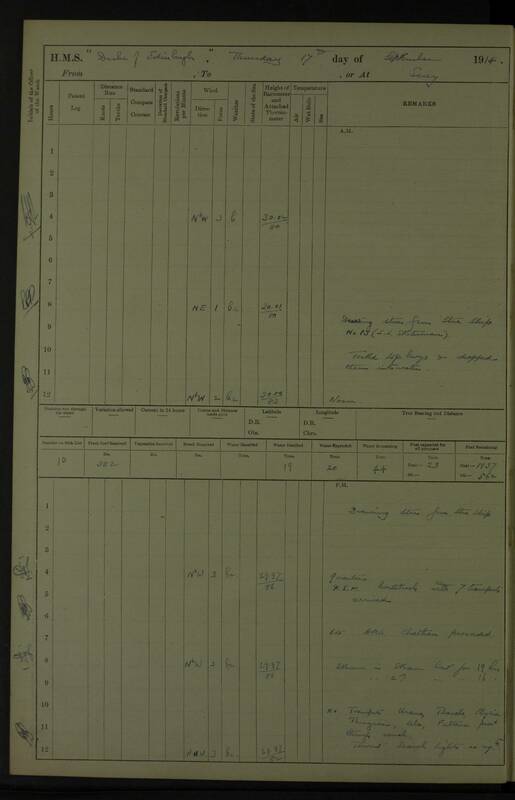 9:15 am: Finished coaling; Collier slipped.